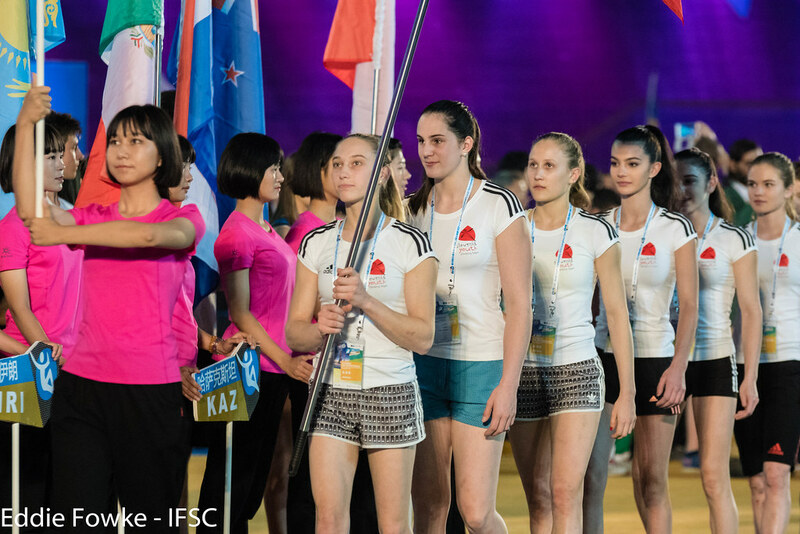 National Teams from four continents earned medals this year, including Croatia and Kazakhstan. 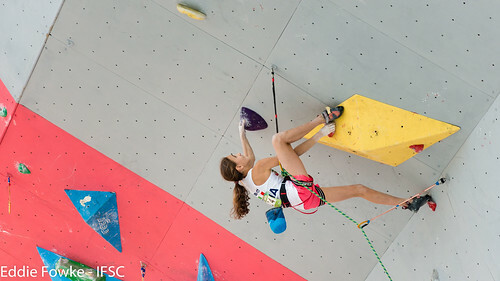 Russia topped the rankings with 13 medals, and the United States won the most Gold. 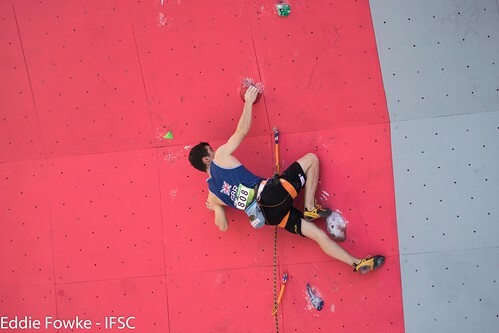 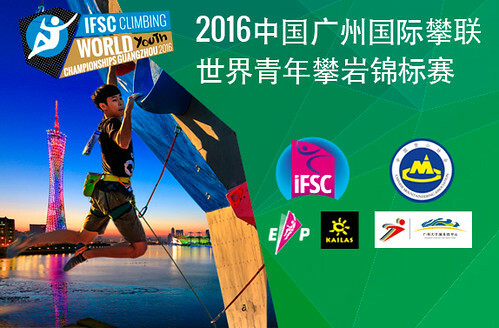 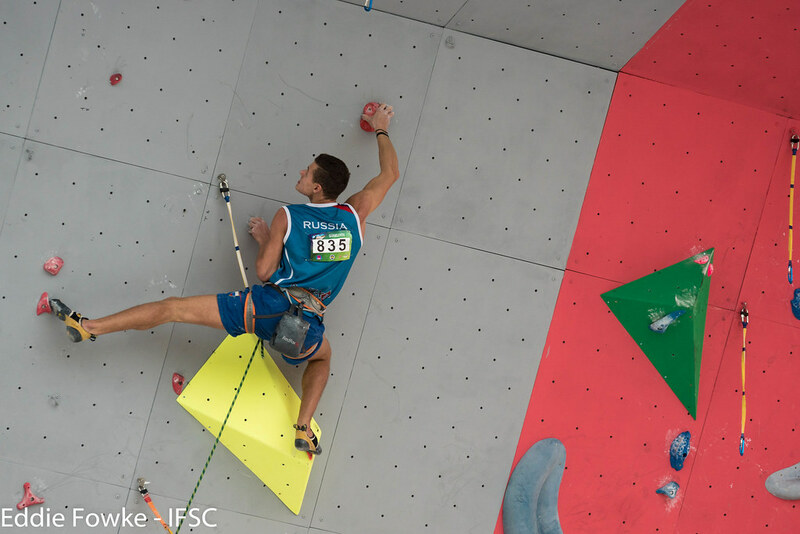 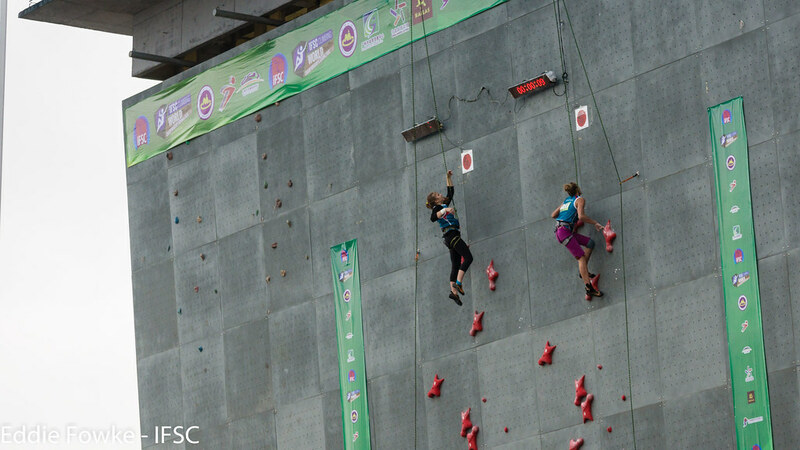 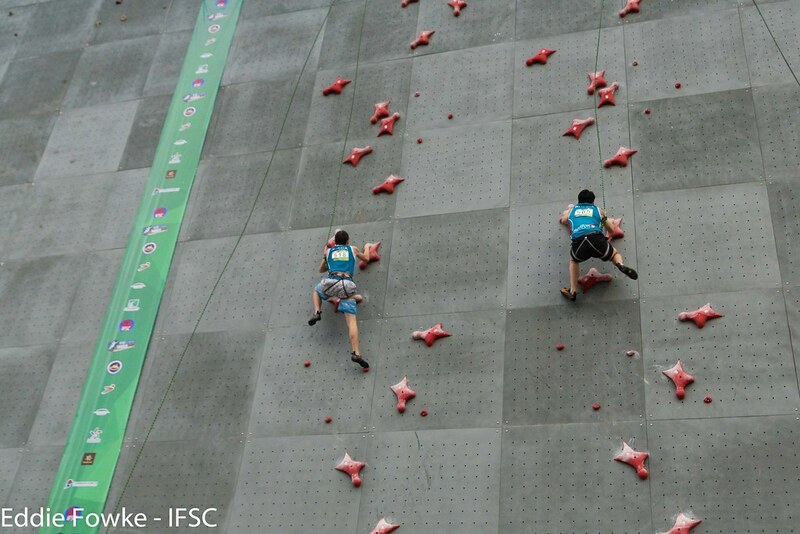 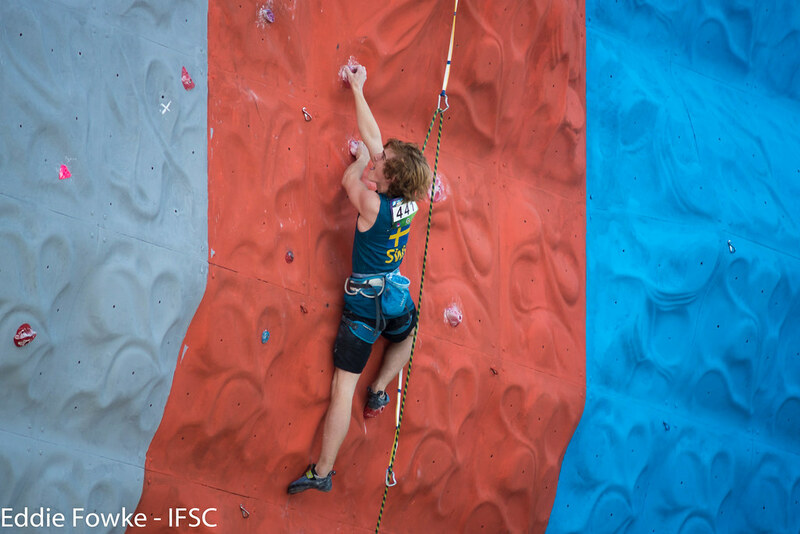 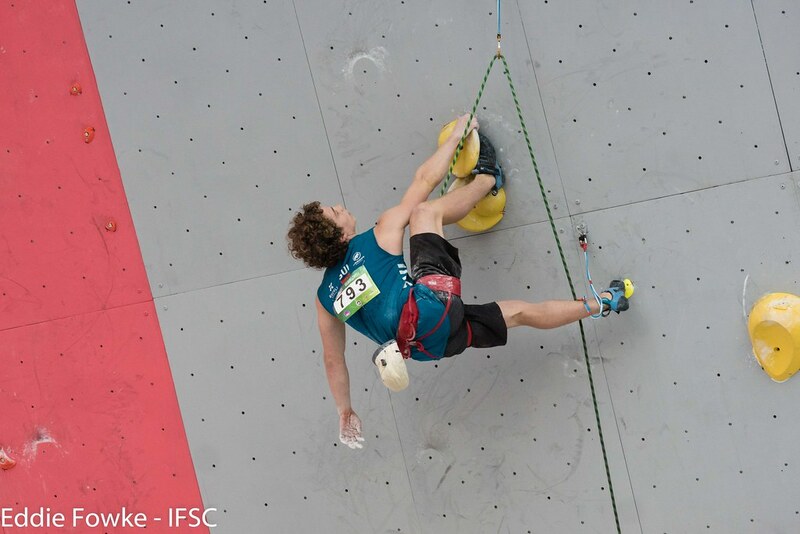 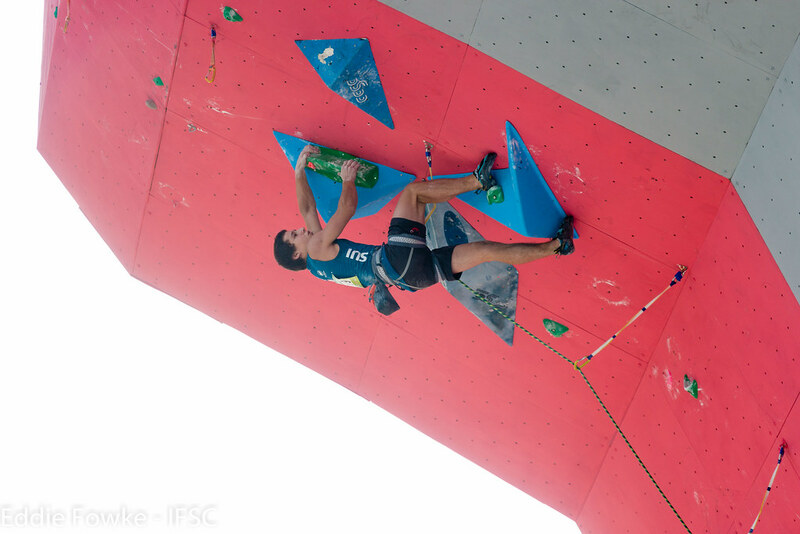 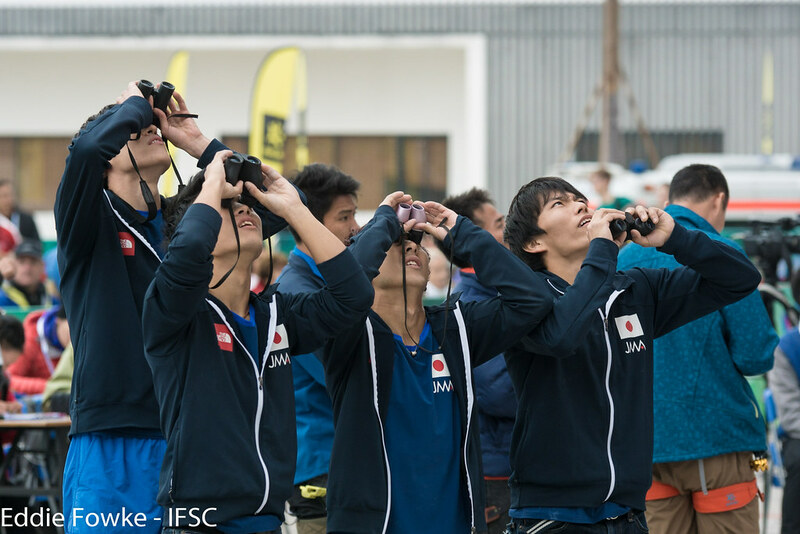 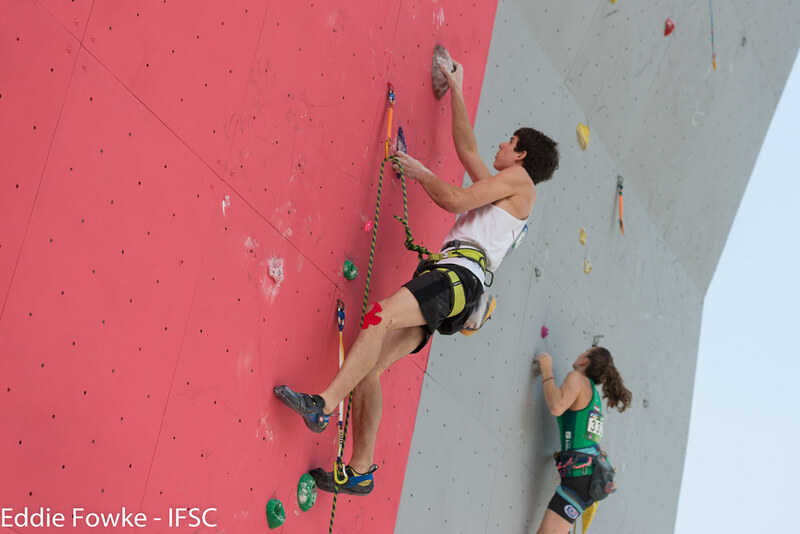 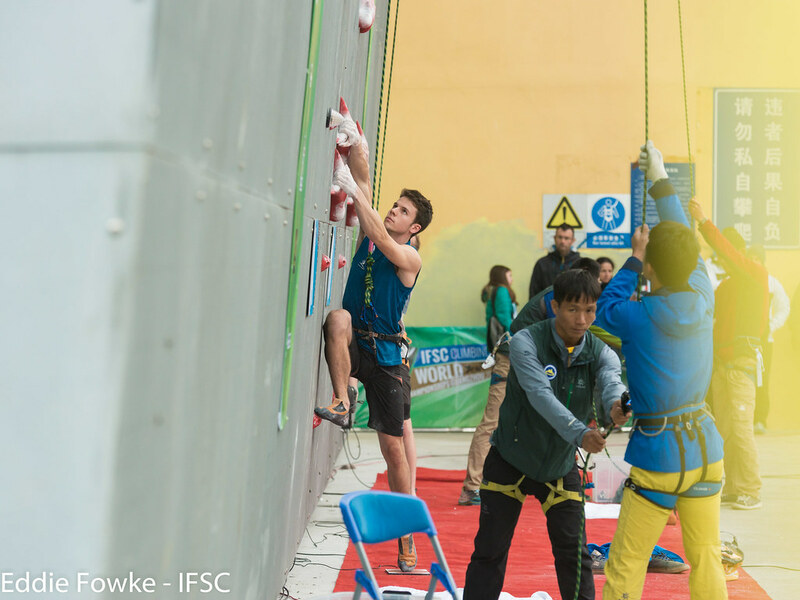 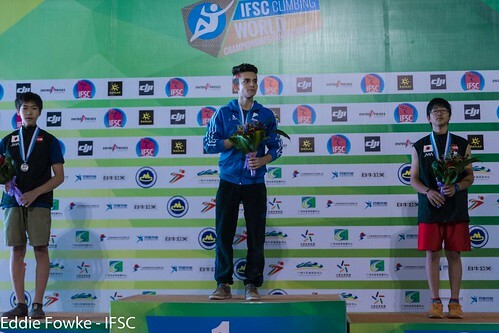 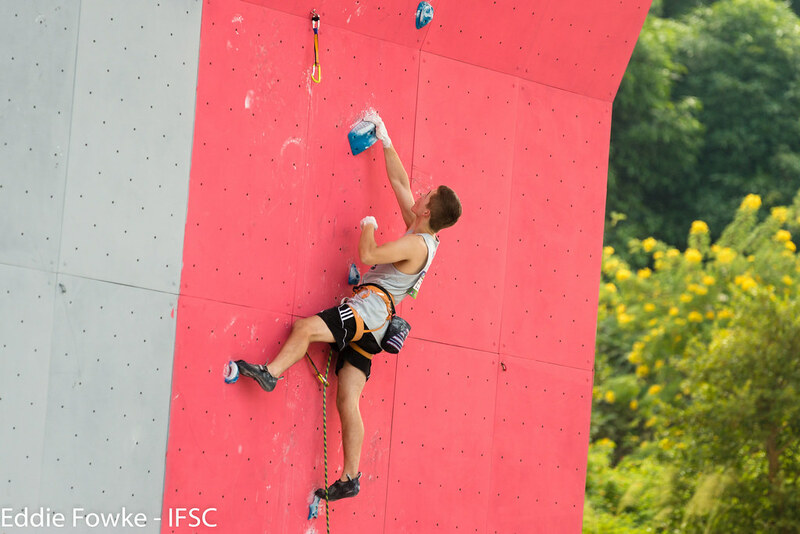 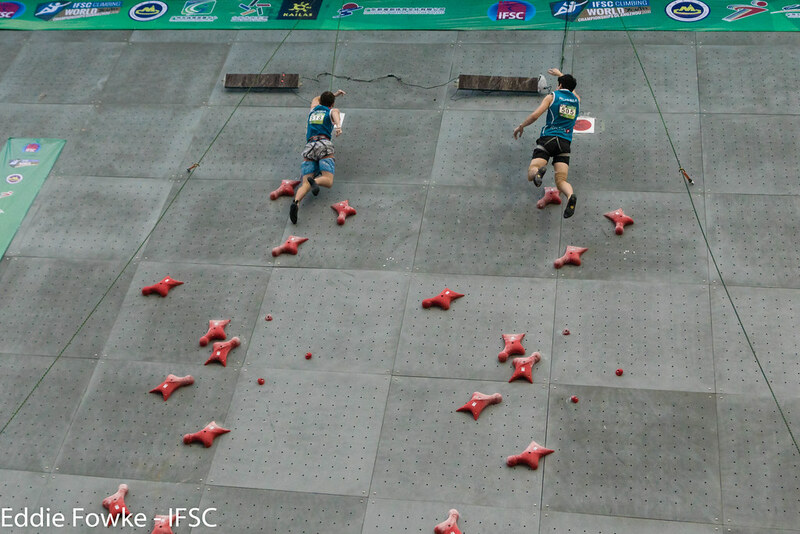 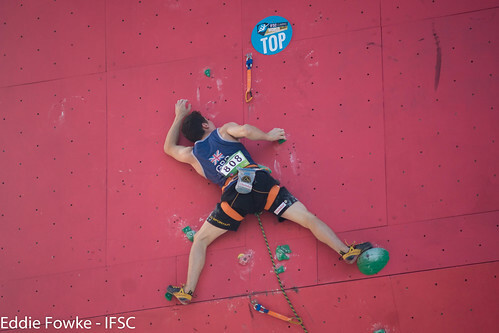 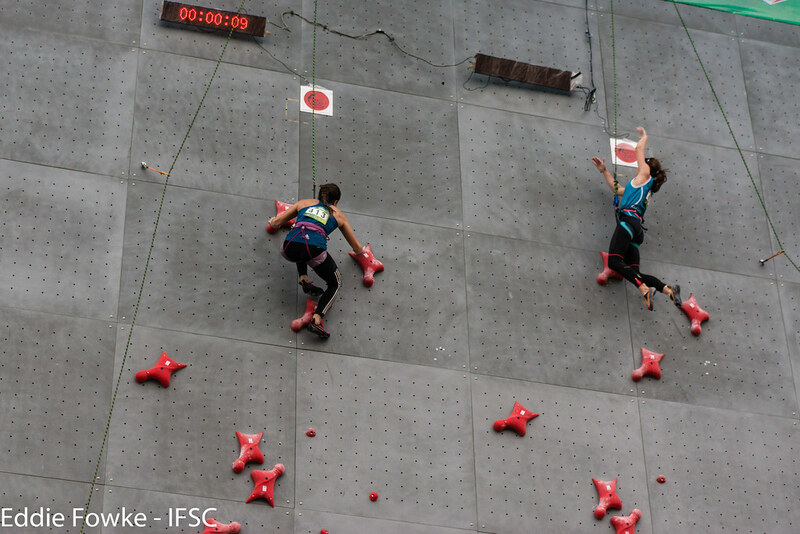 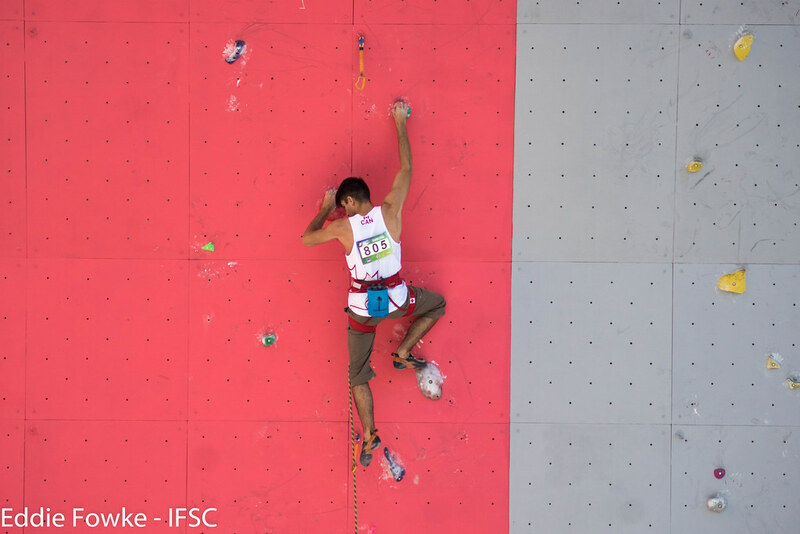 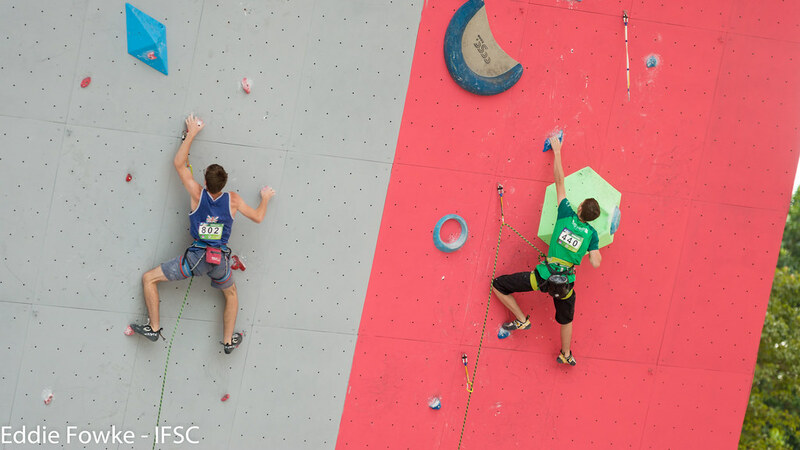 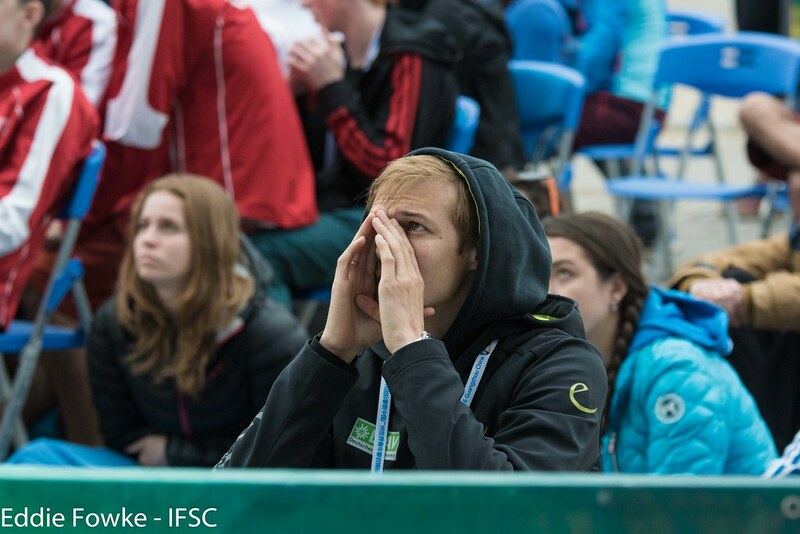 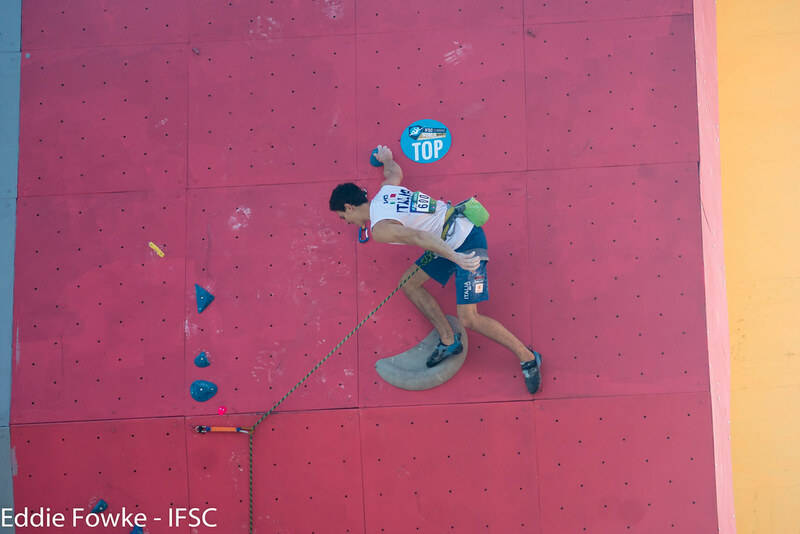 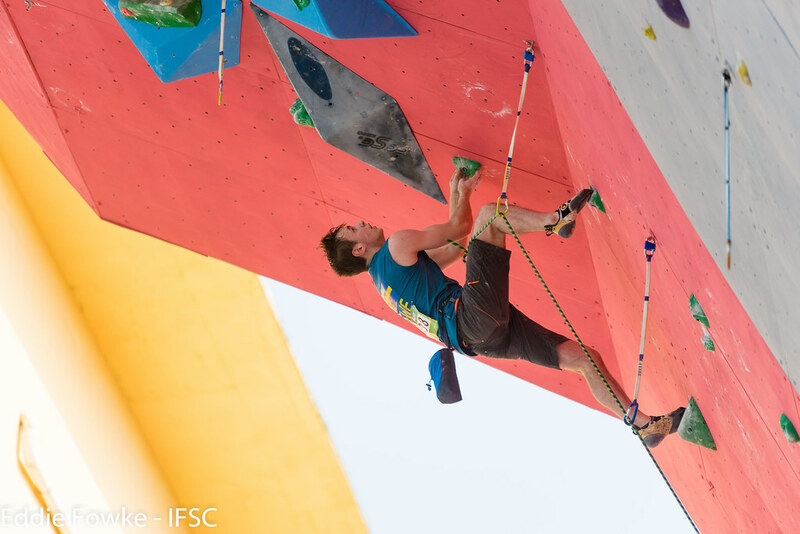 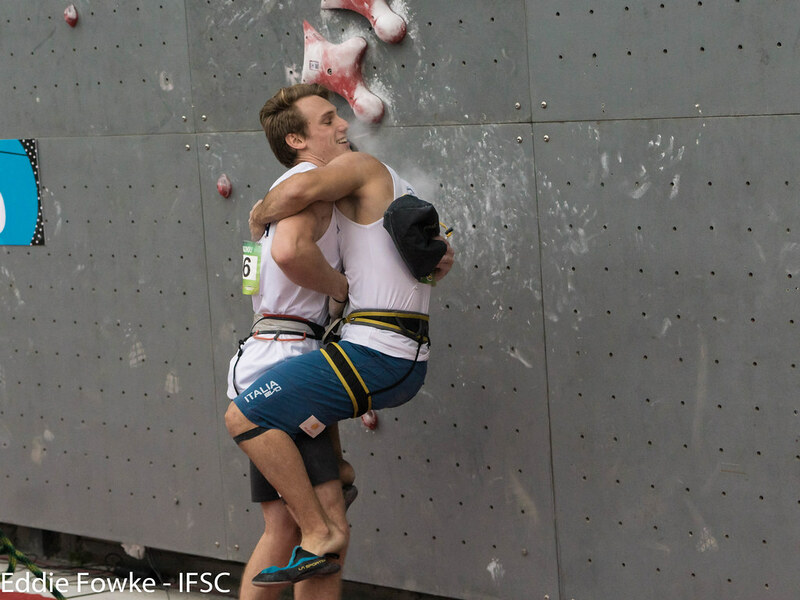 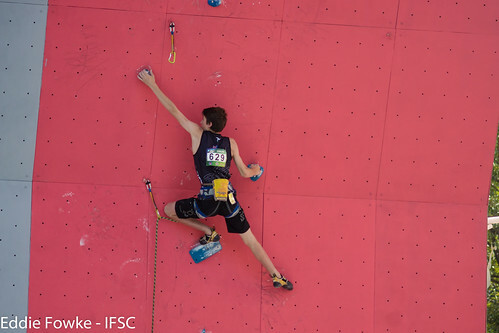 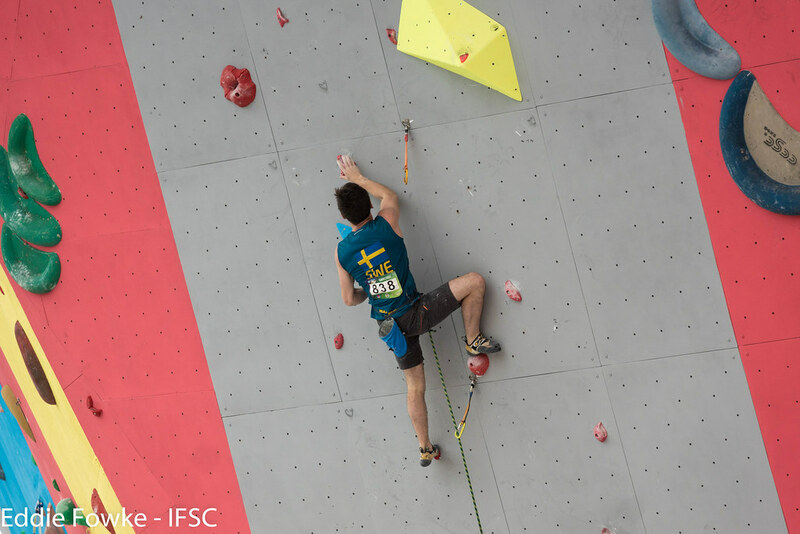 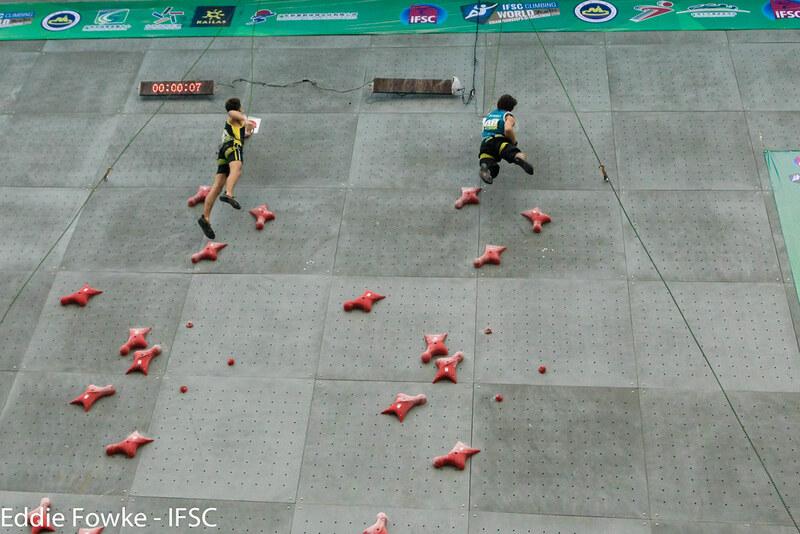 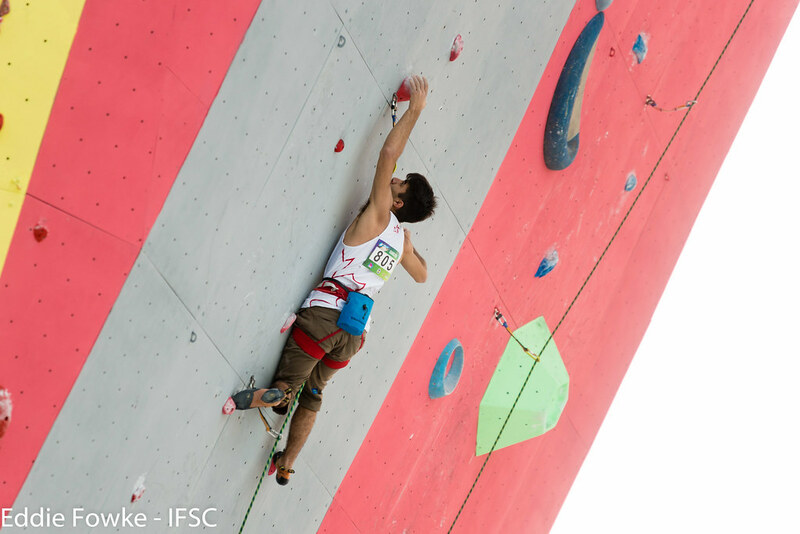 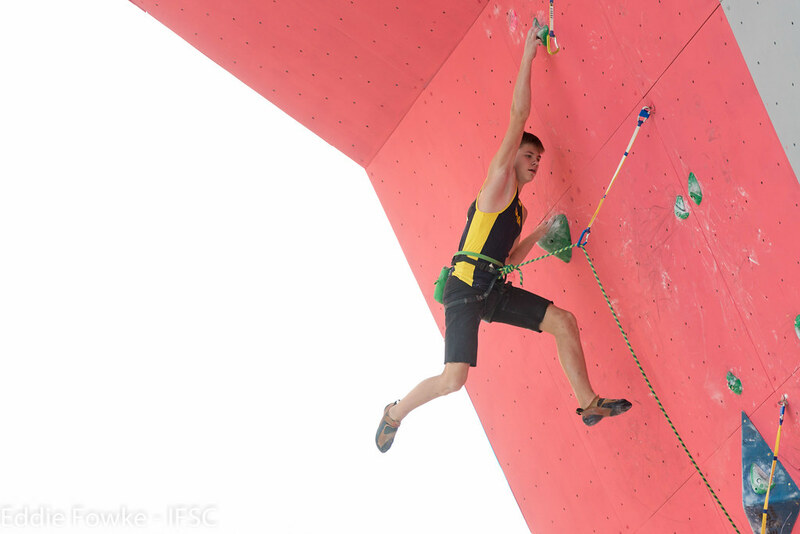 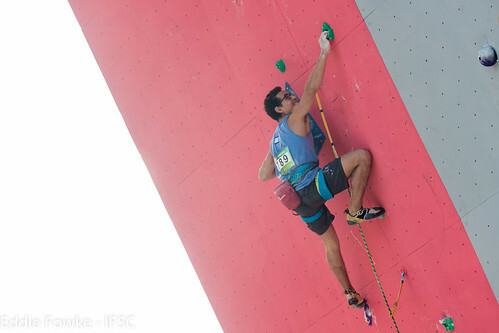 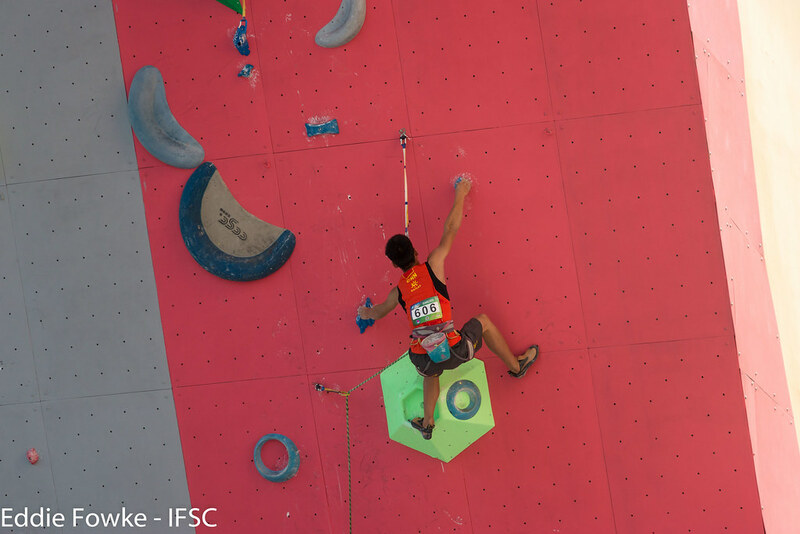 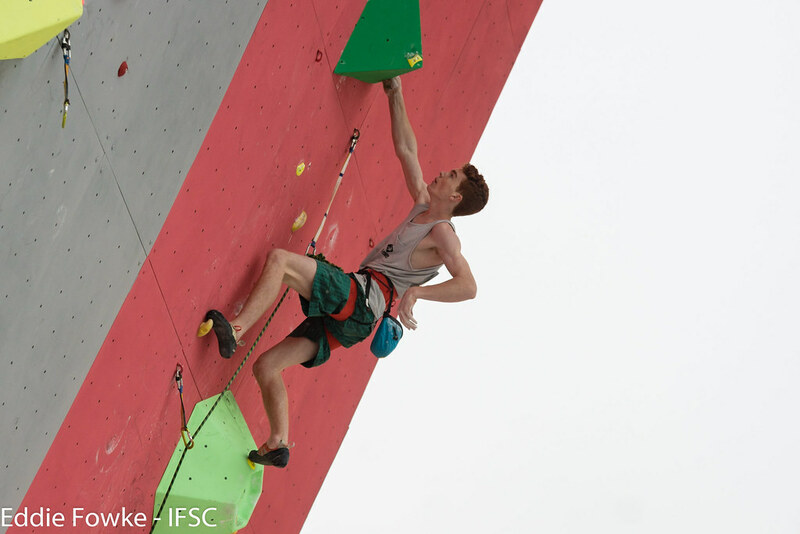 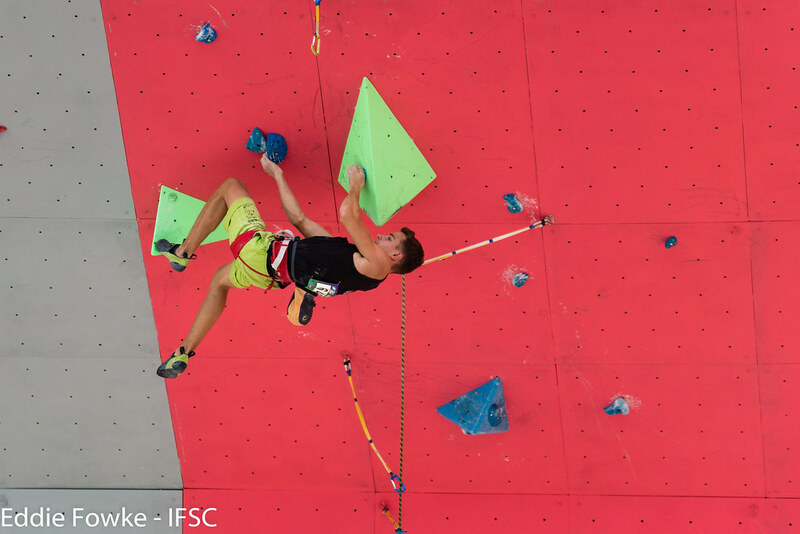 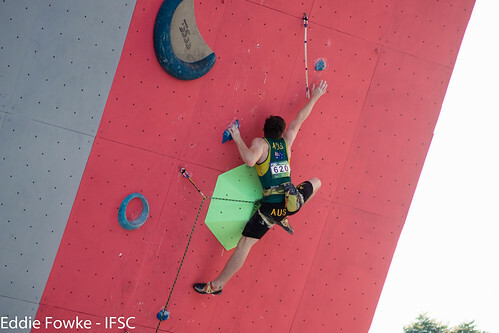 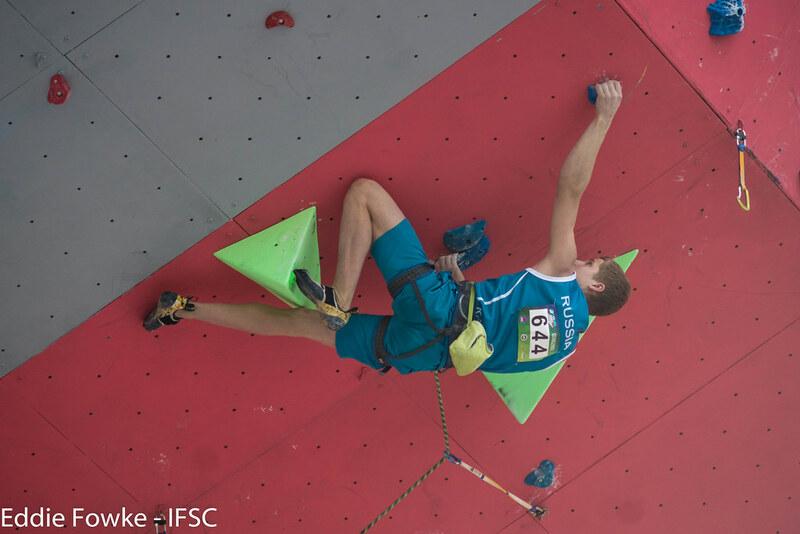 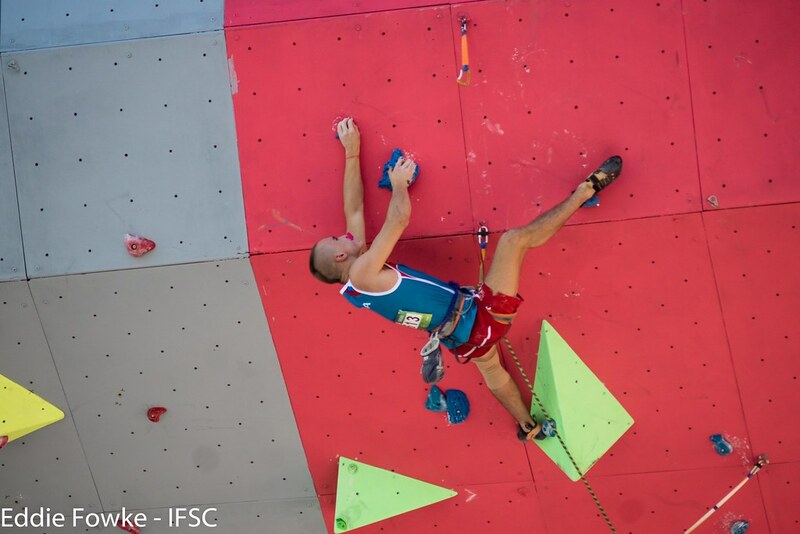 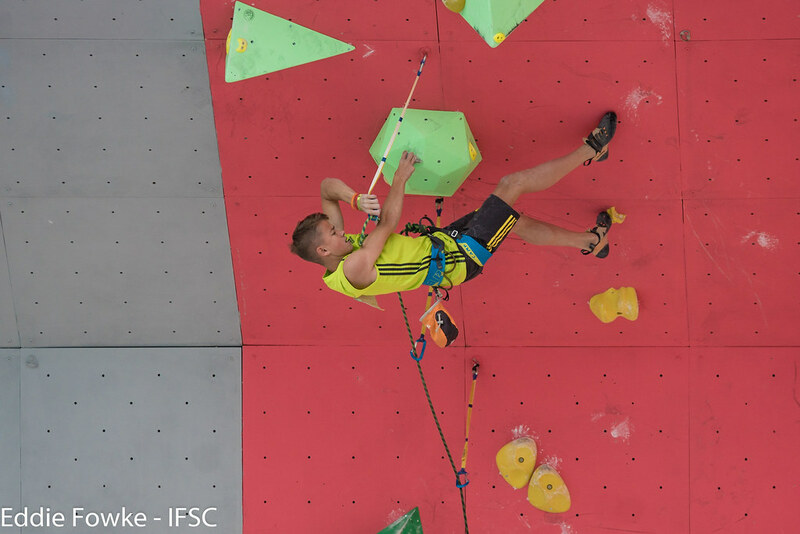 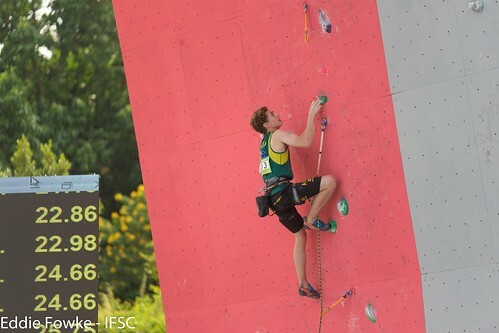 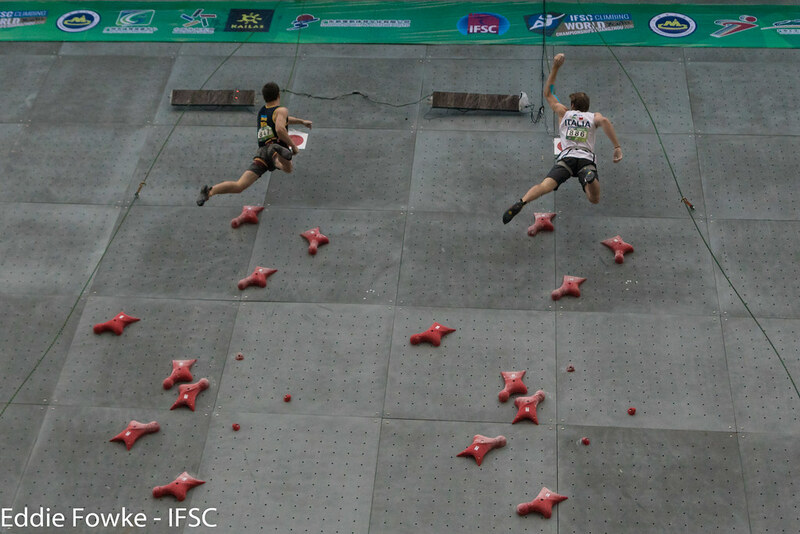 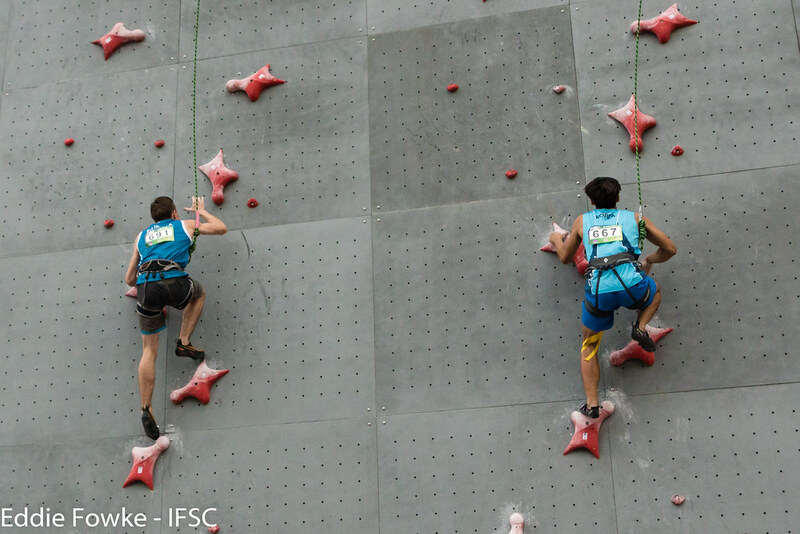 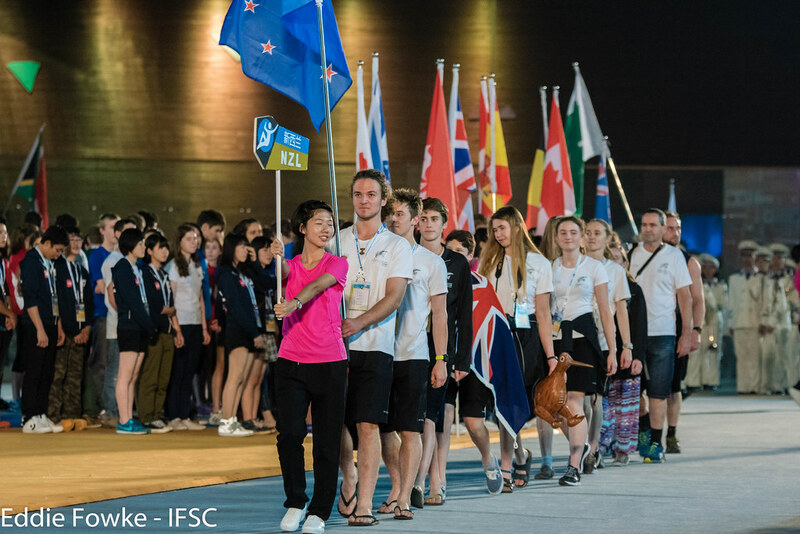 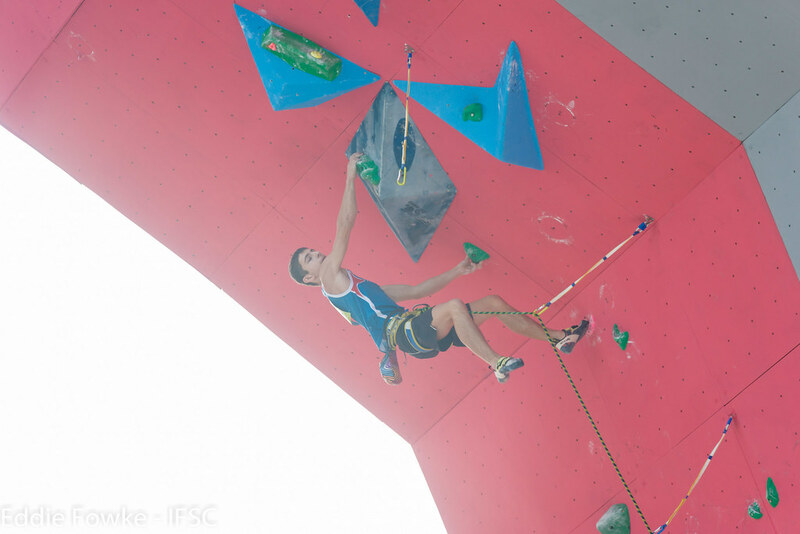 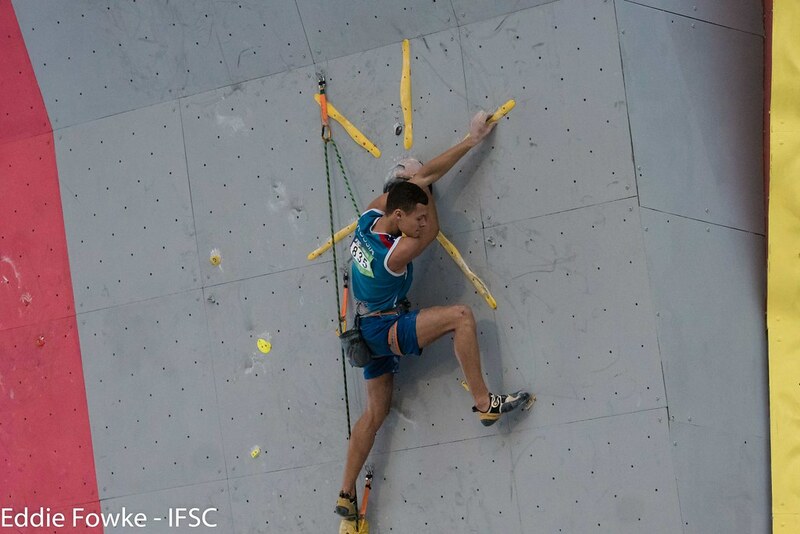 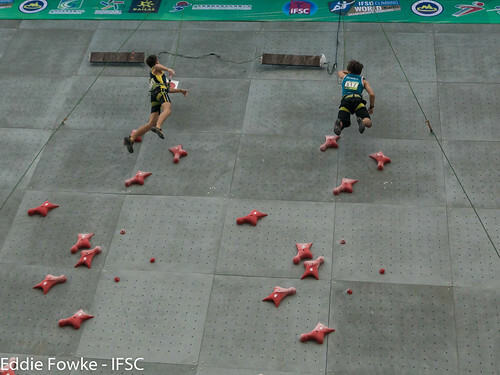 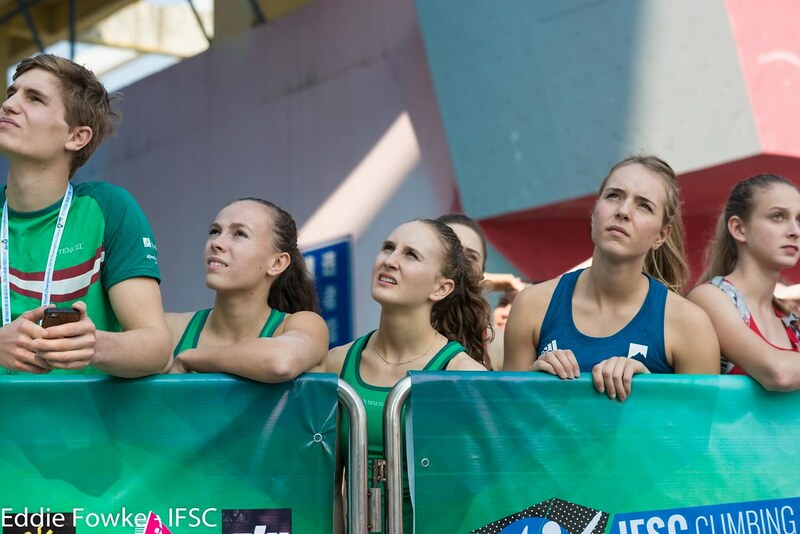 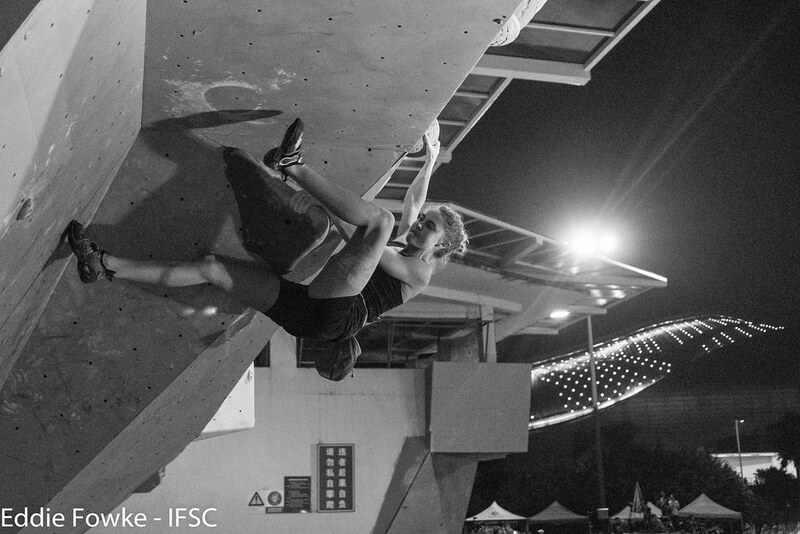 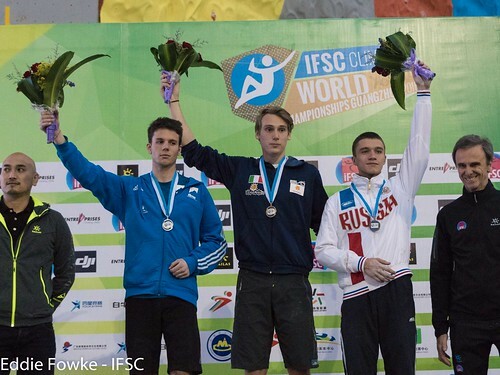 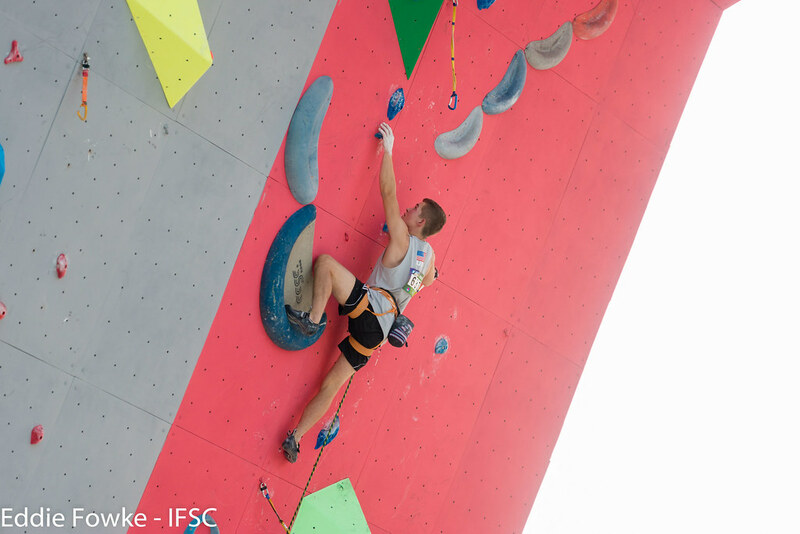 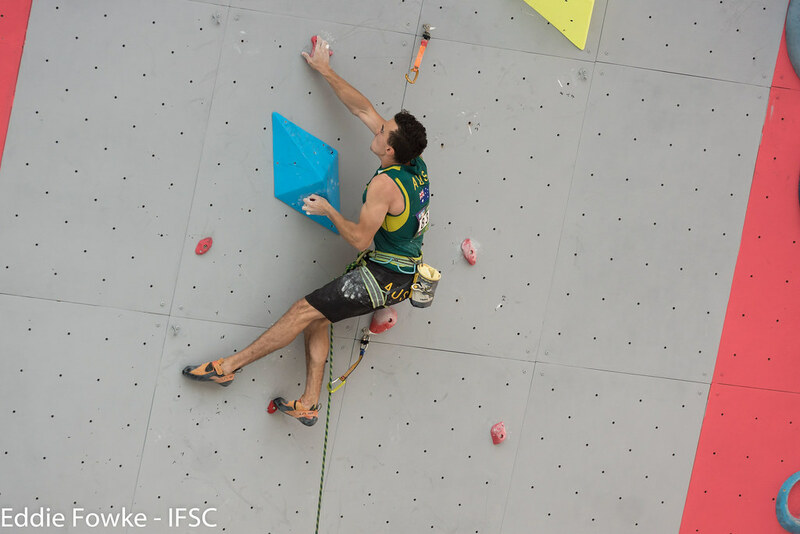 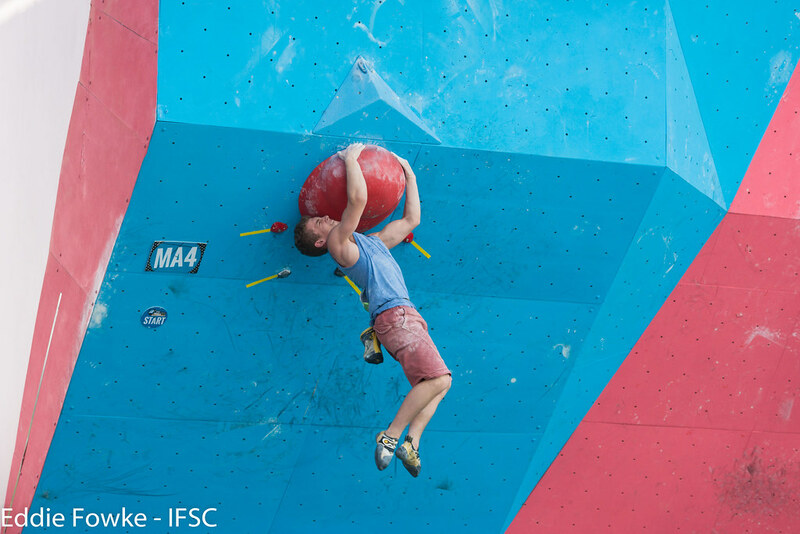 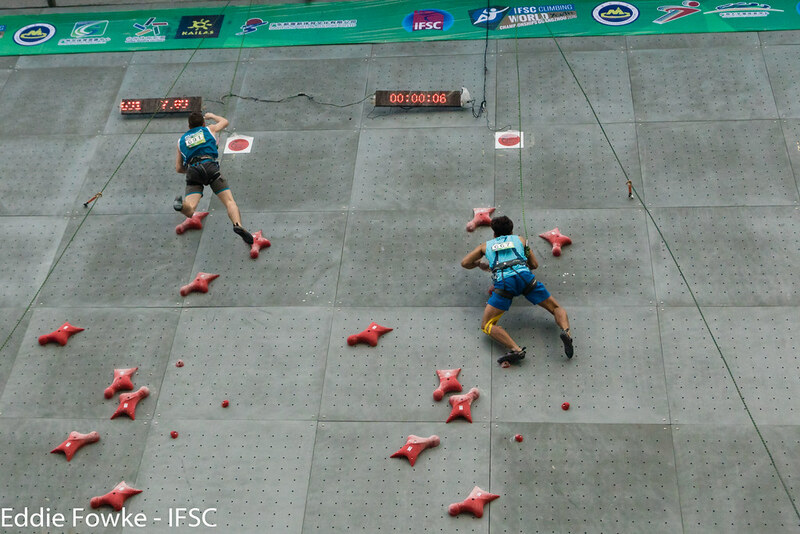 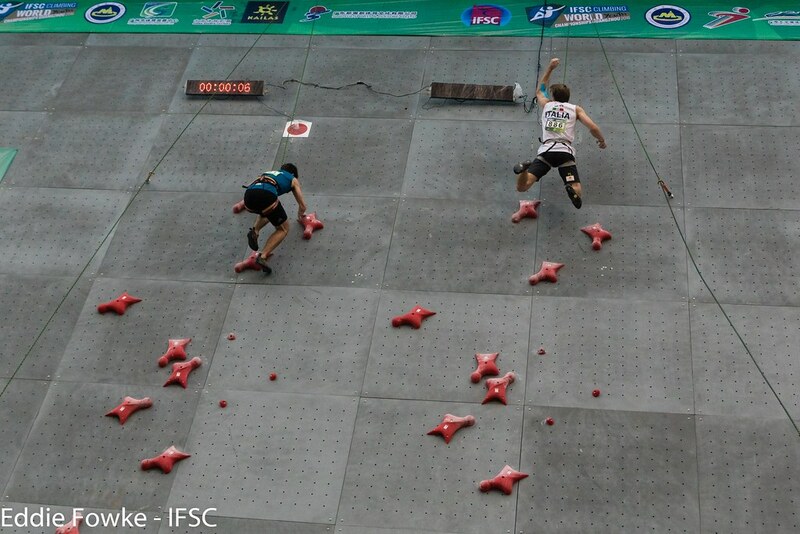 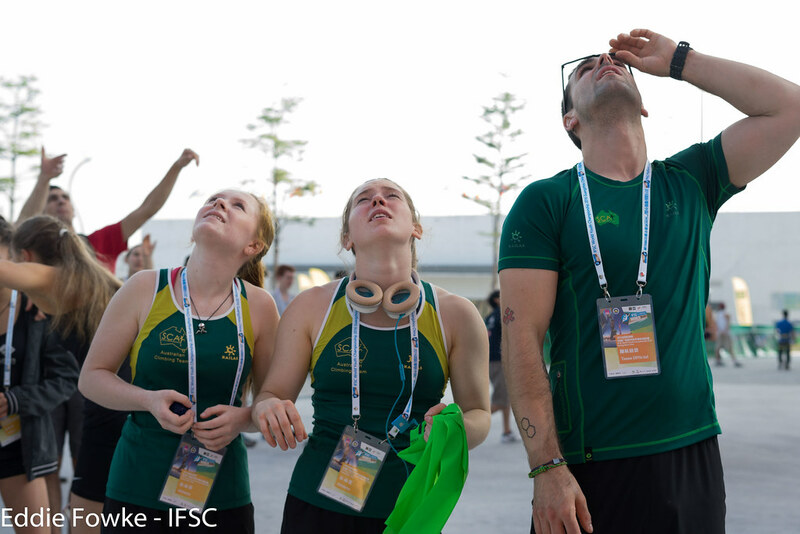 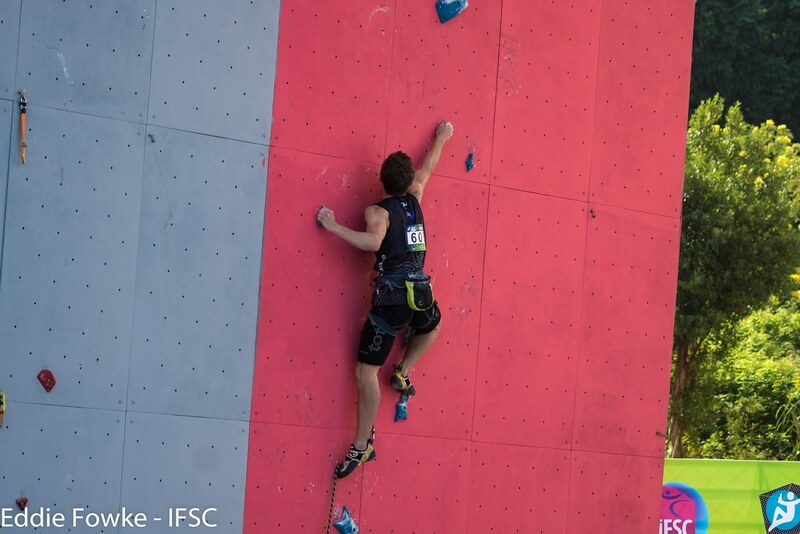 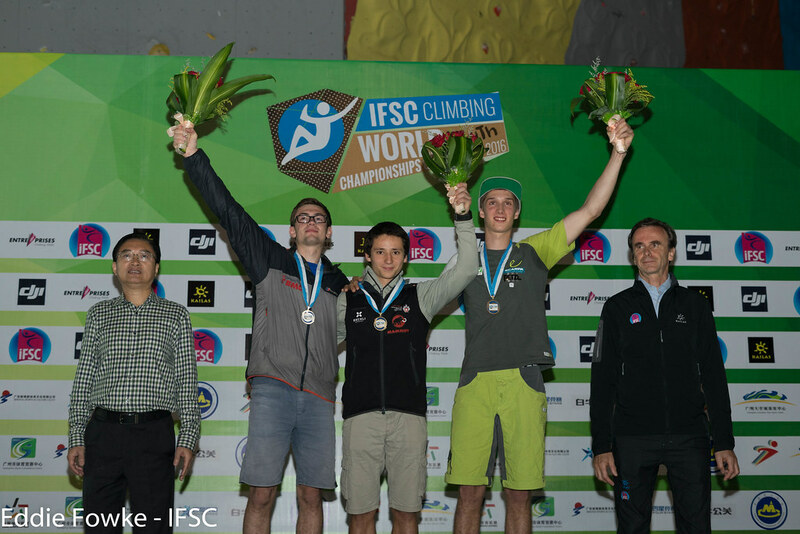 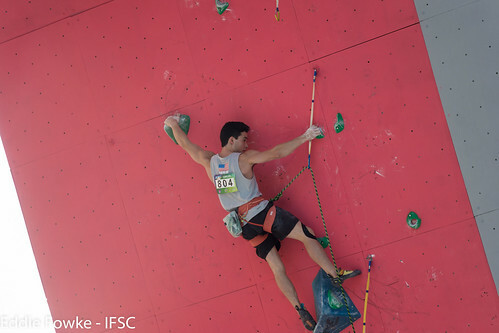 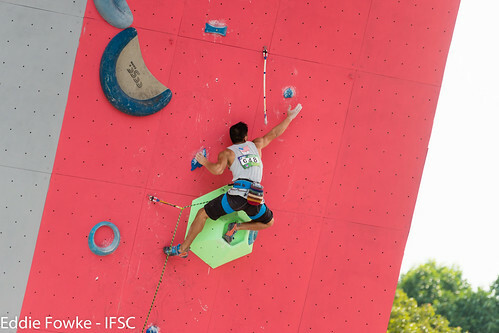 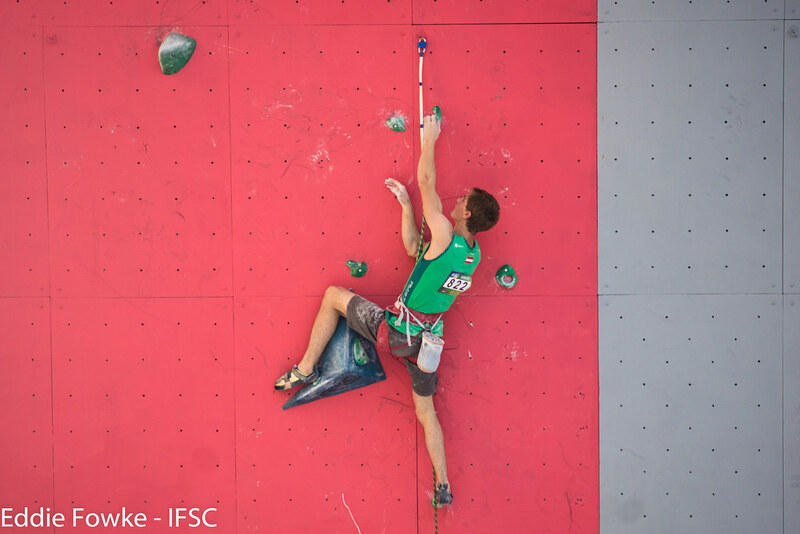 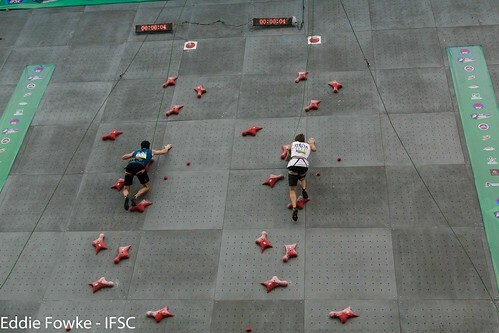 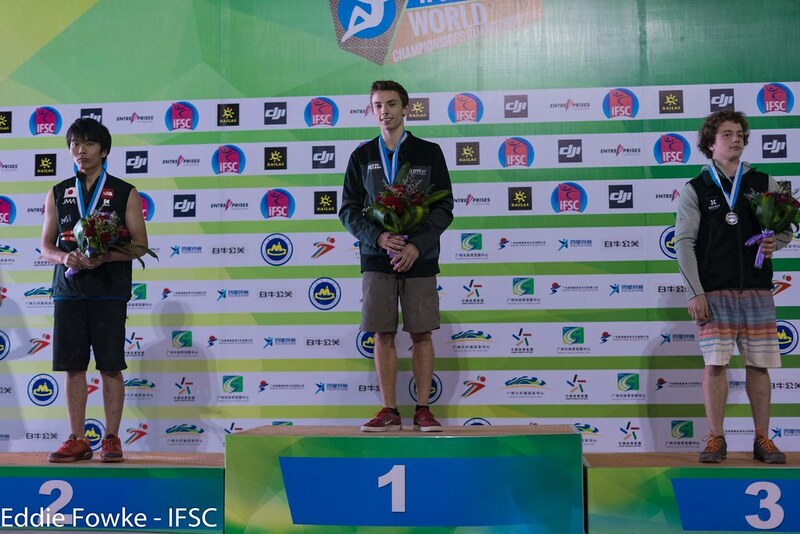 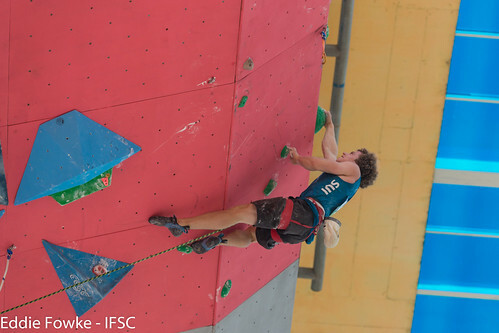 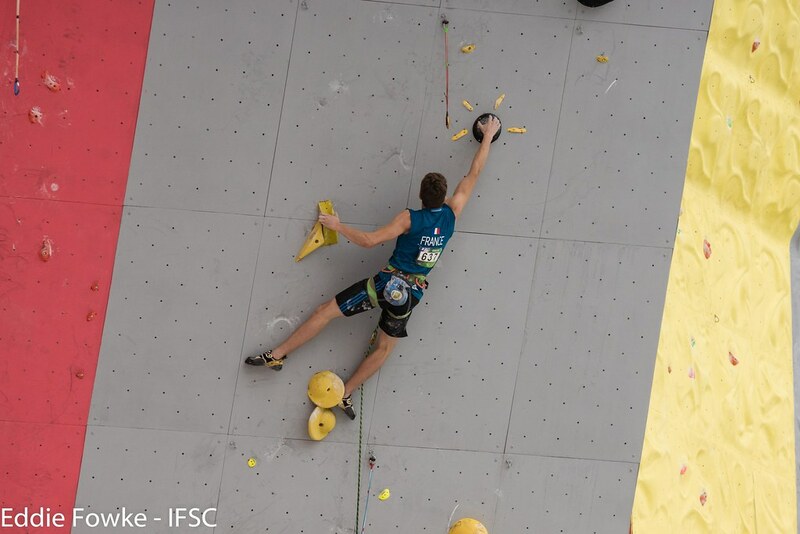 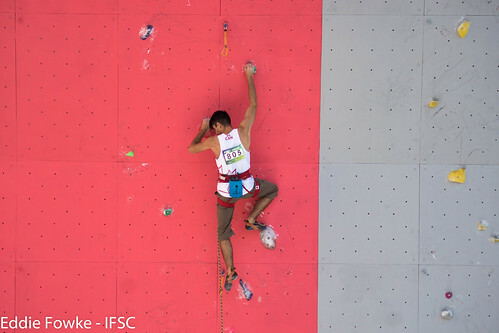 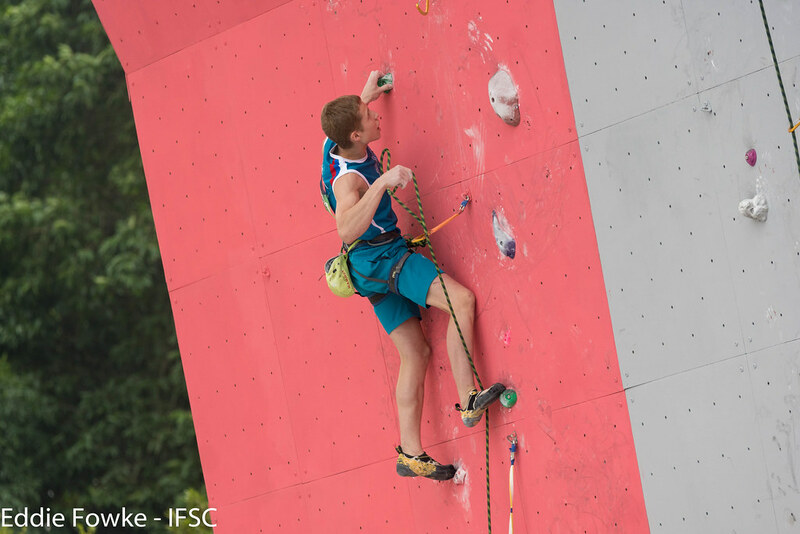 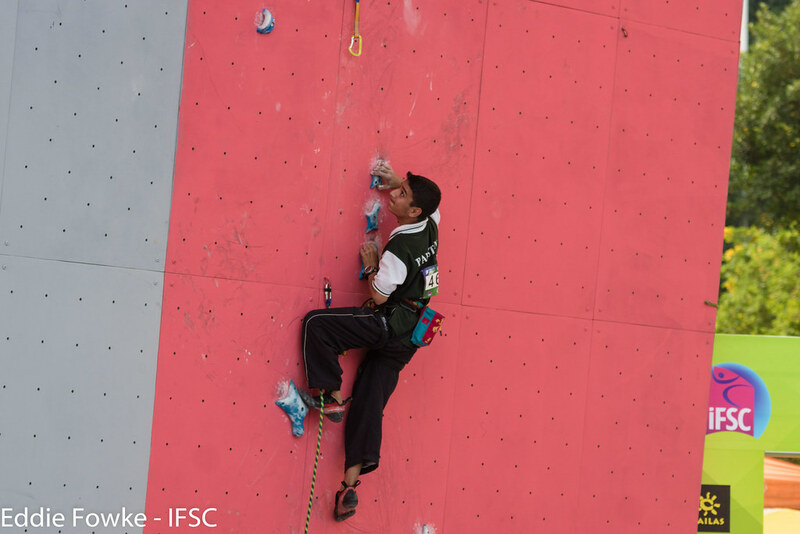 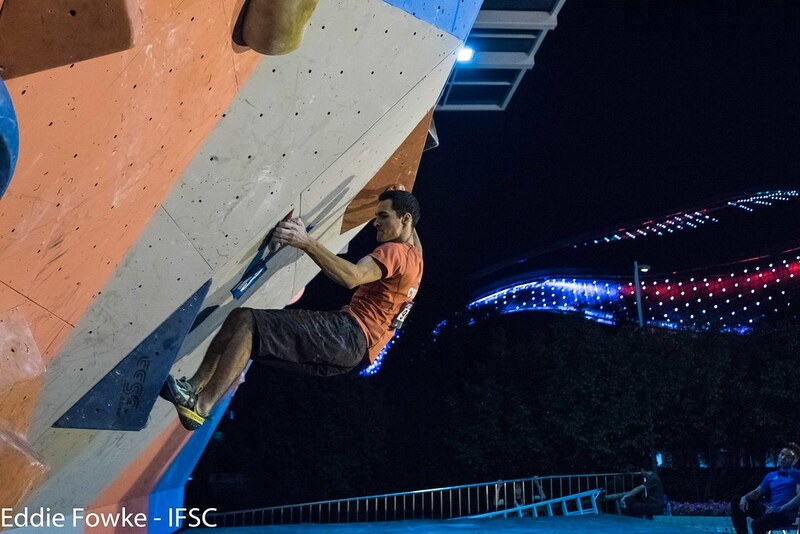 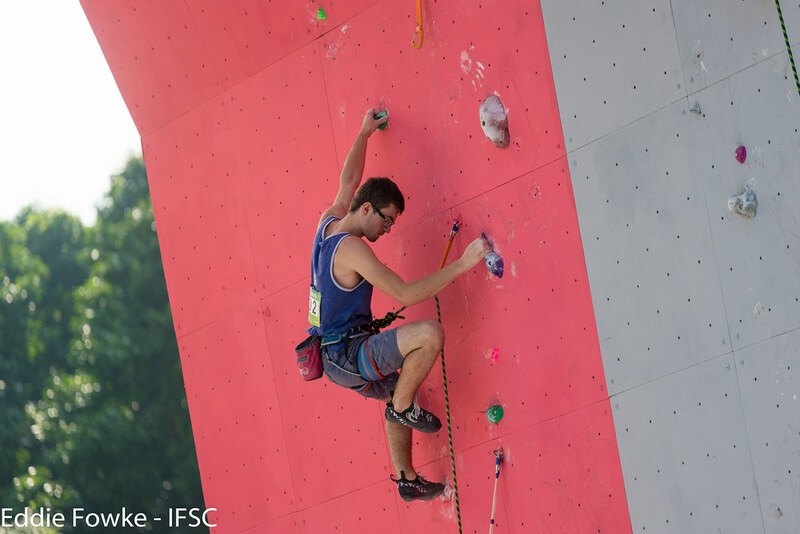 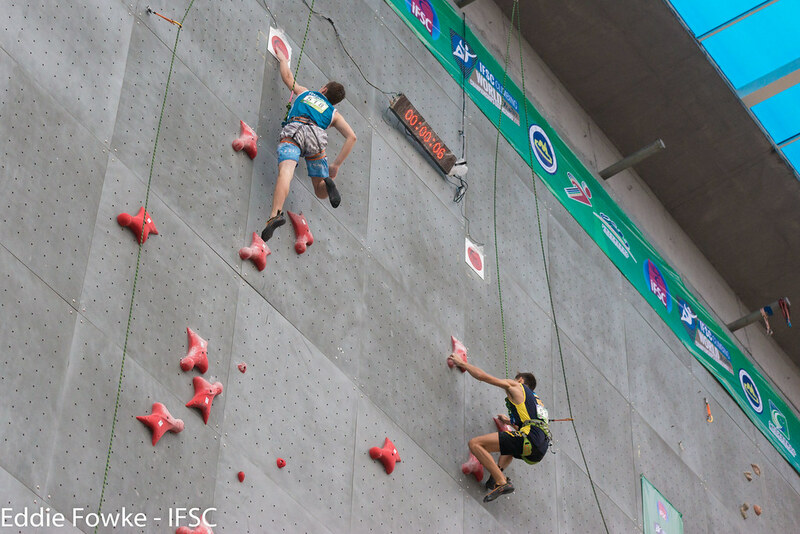 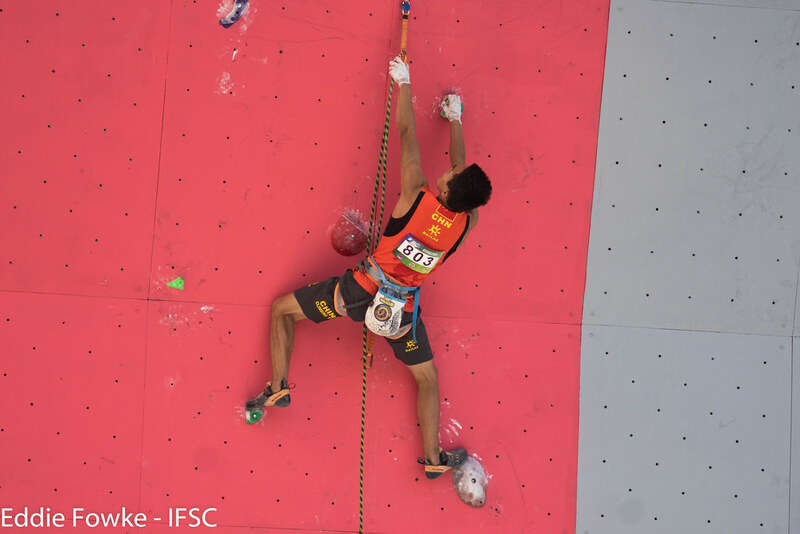 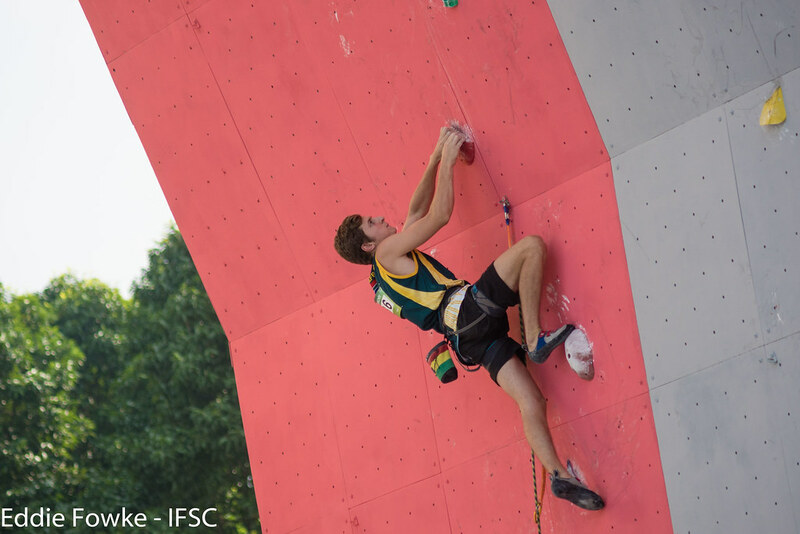 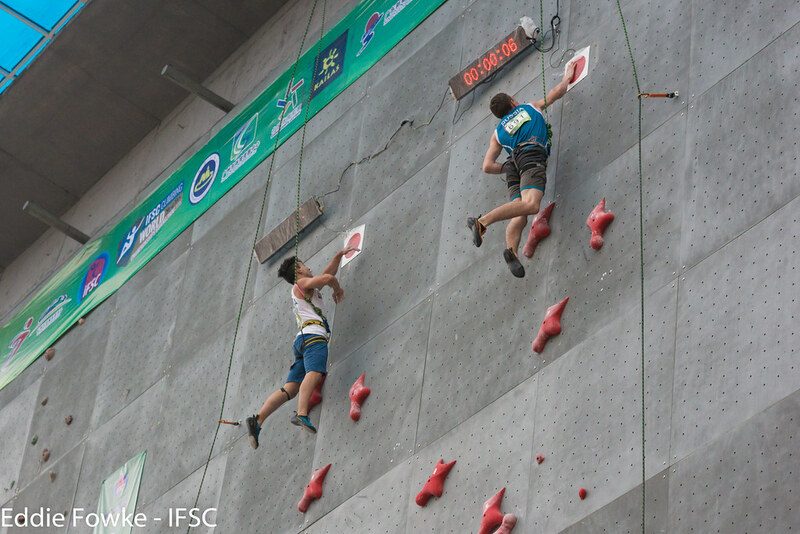 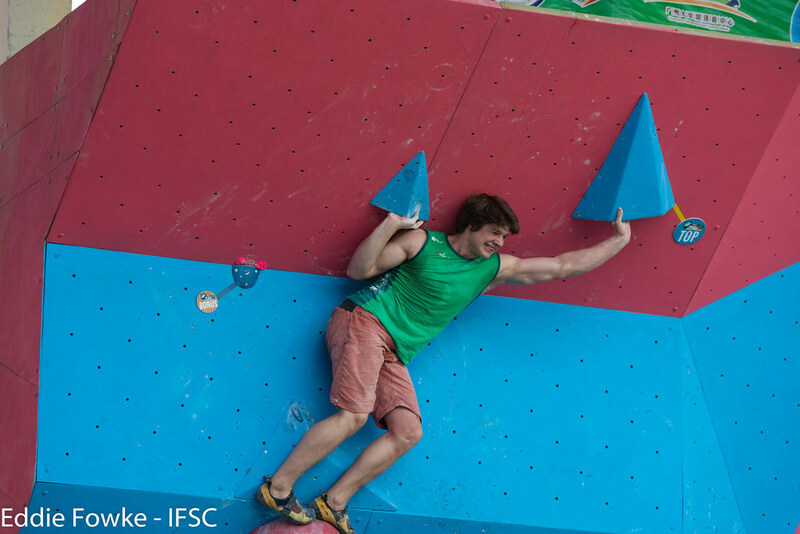 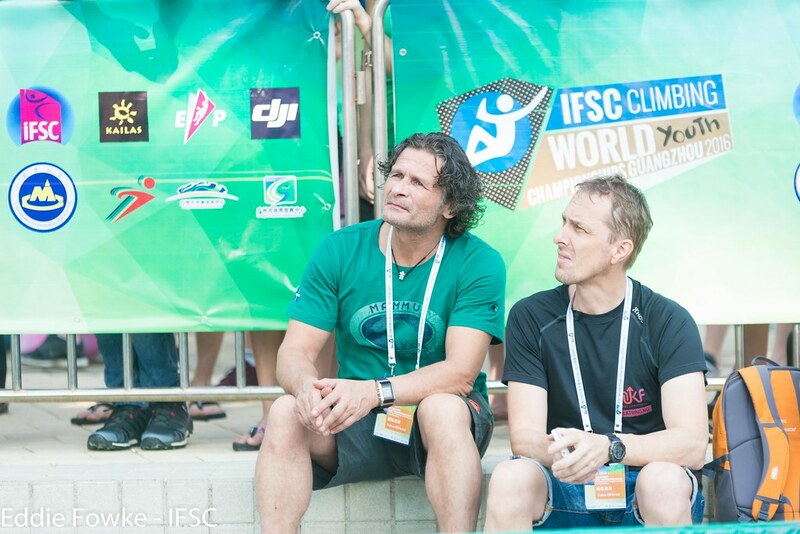 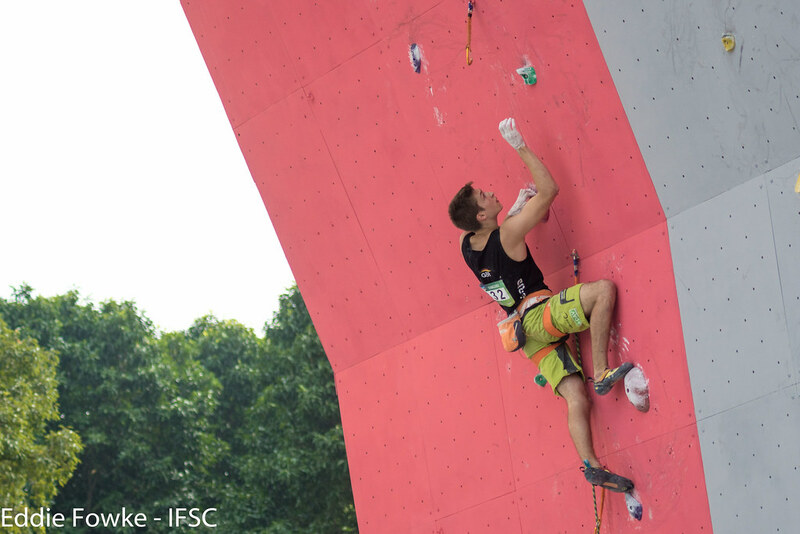 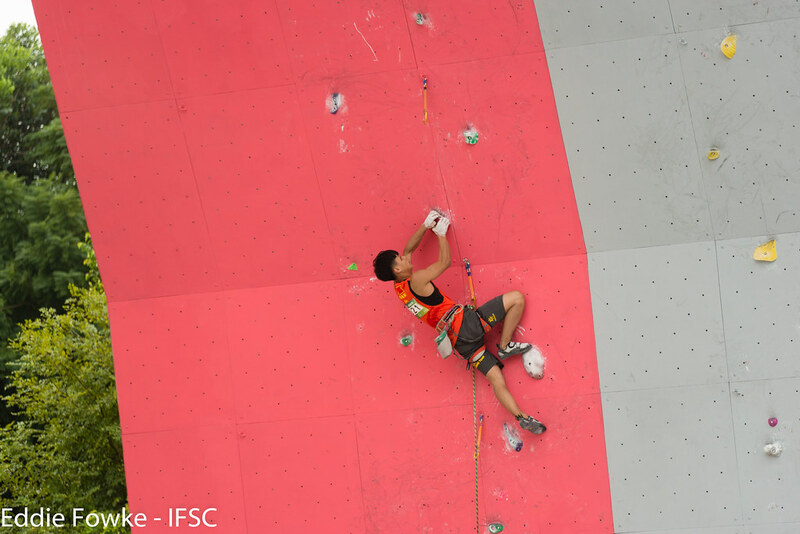 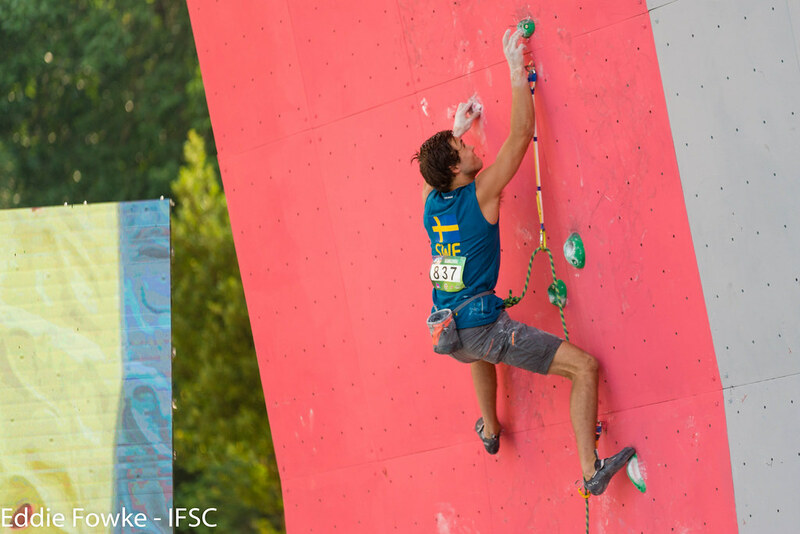 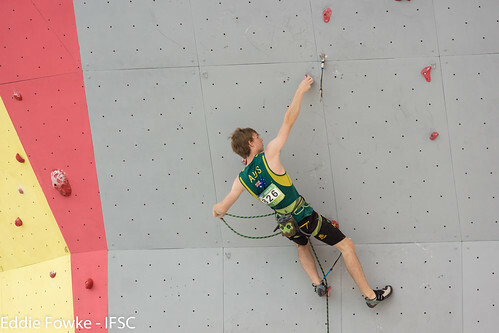 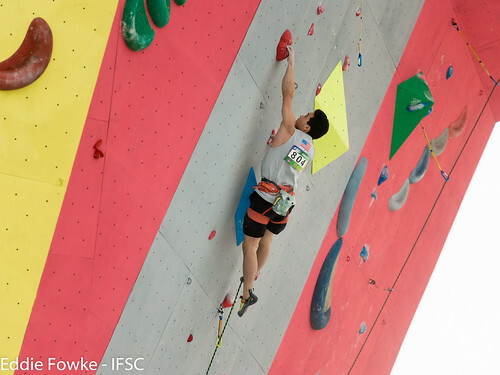 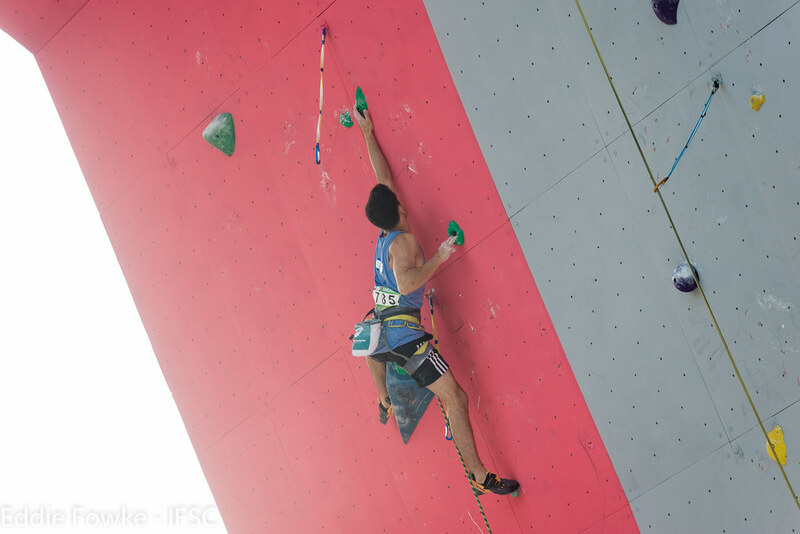 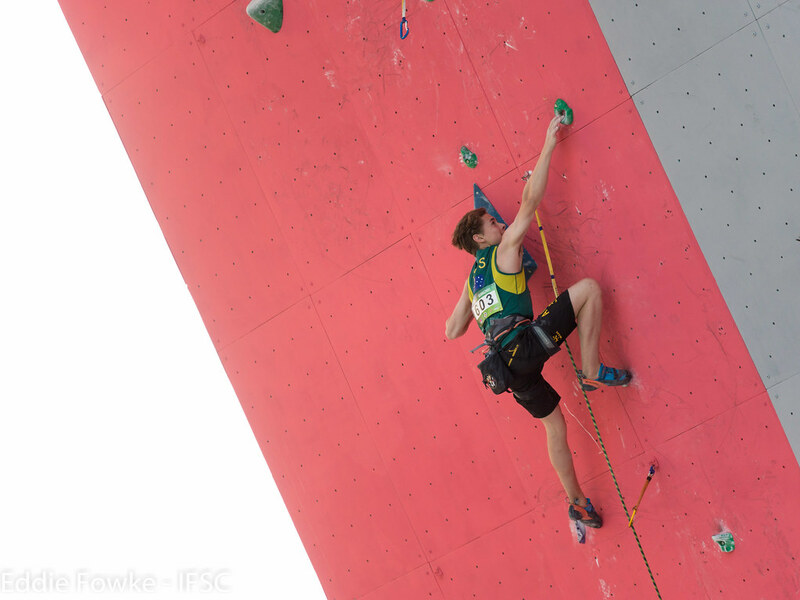 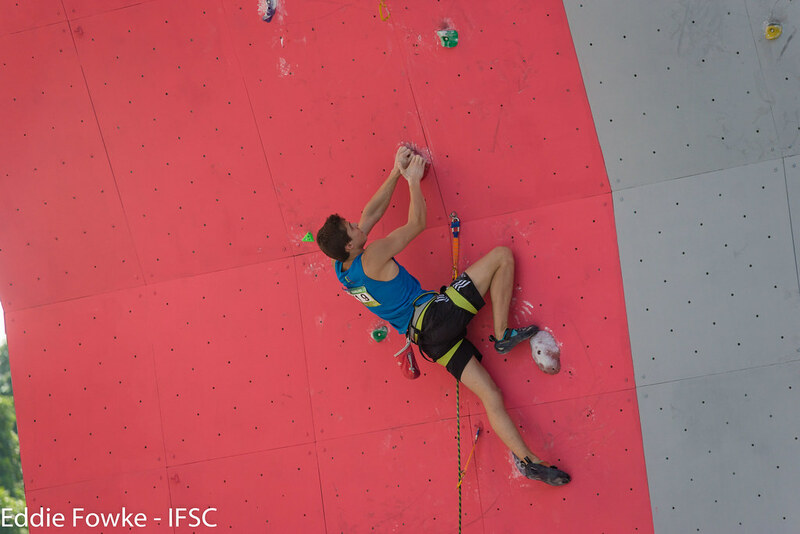 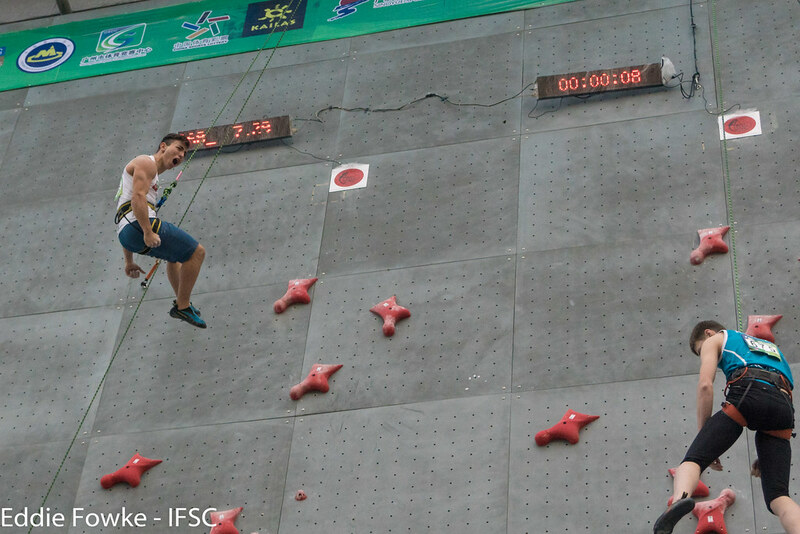 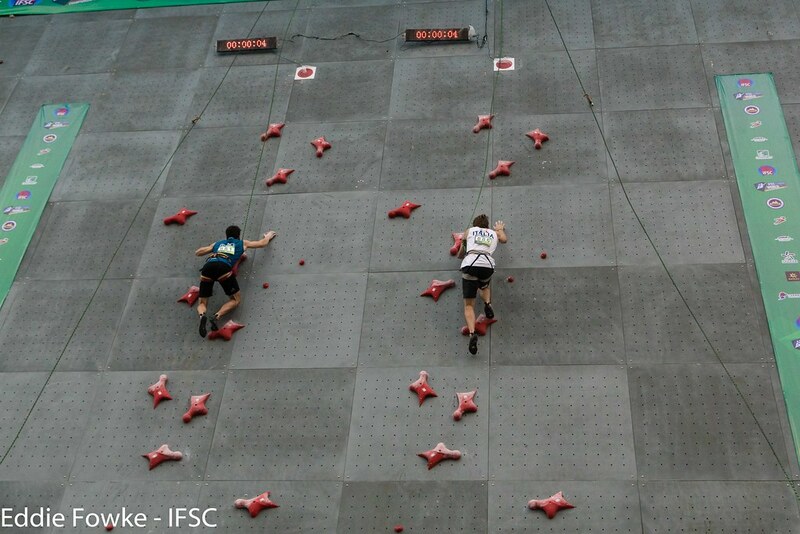 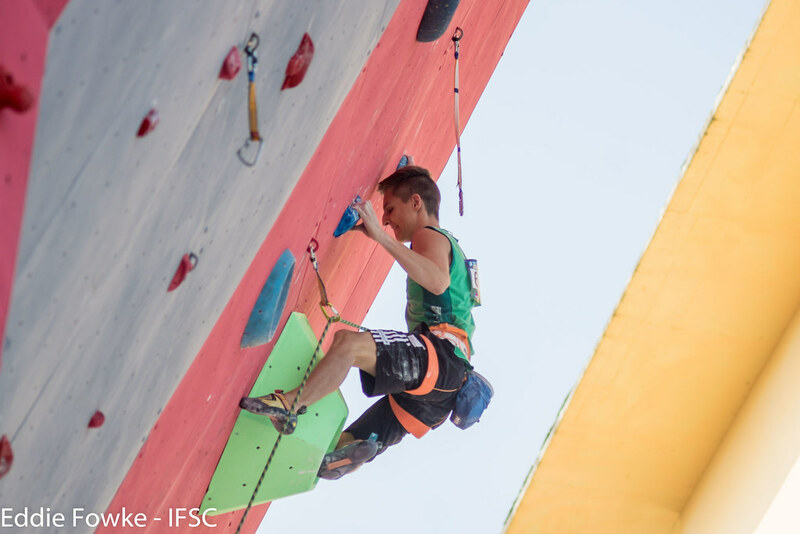 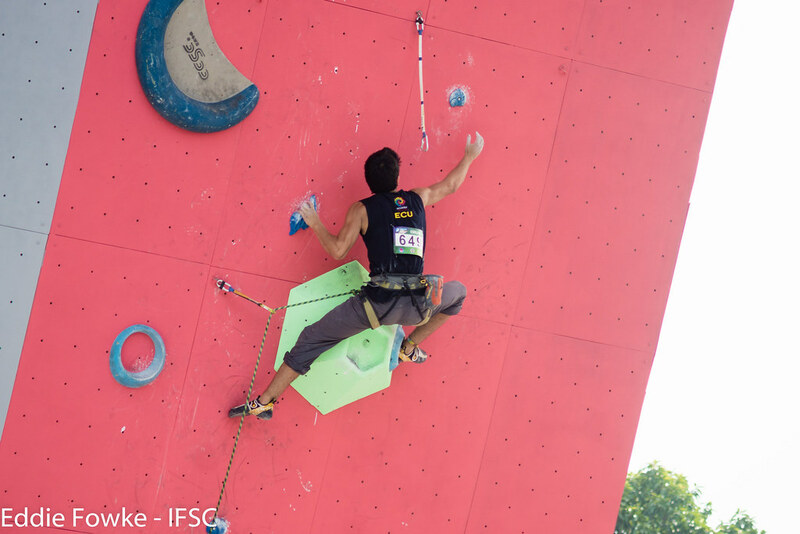 For a complete medal table, please visit the dedicated page for IFSC World Championships. 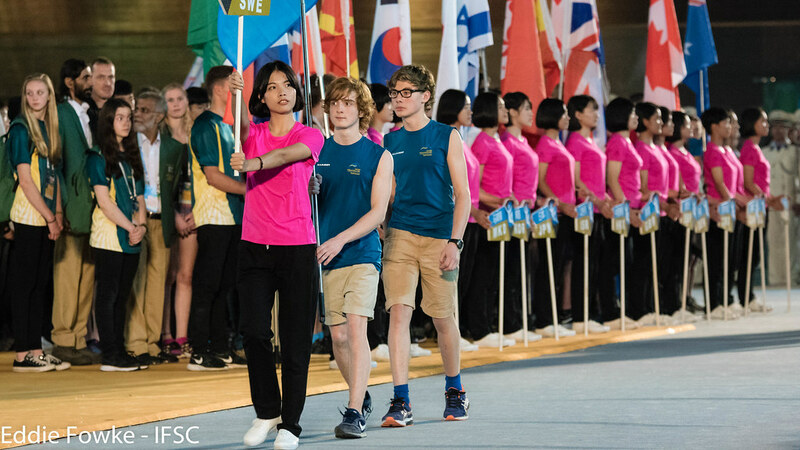 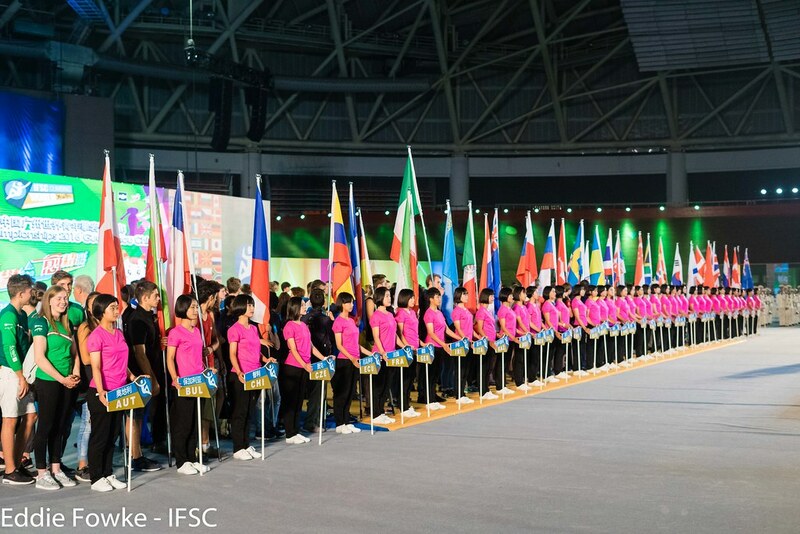 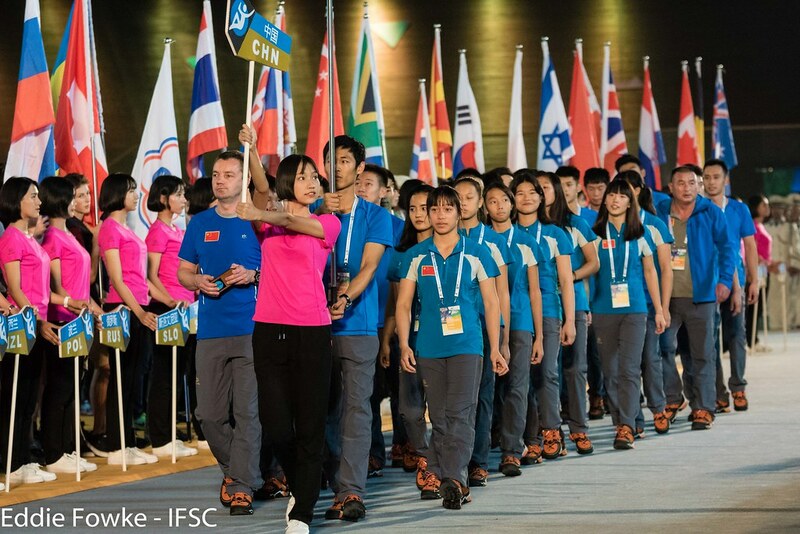 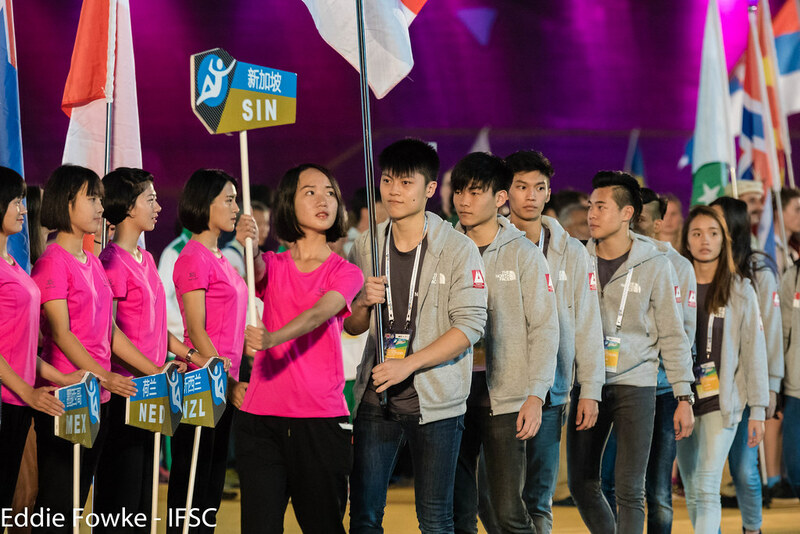 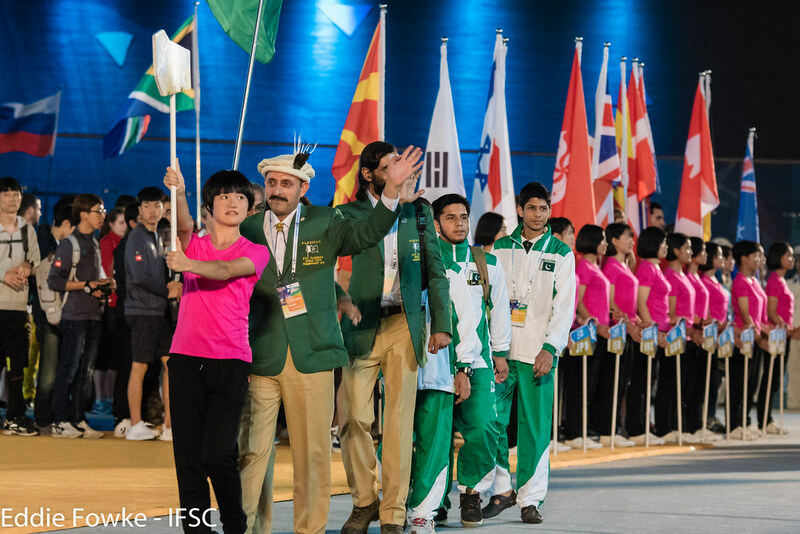 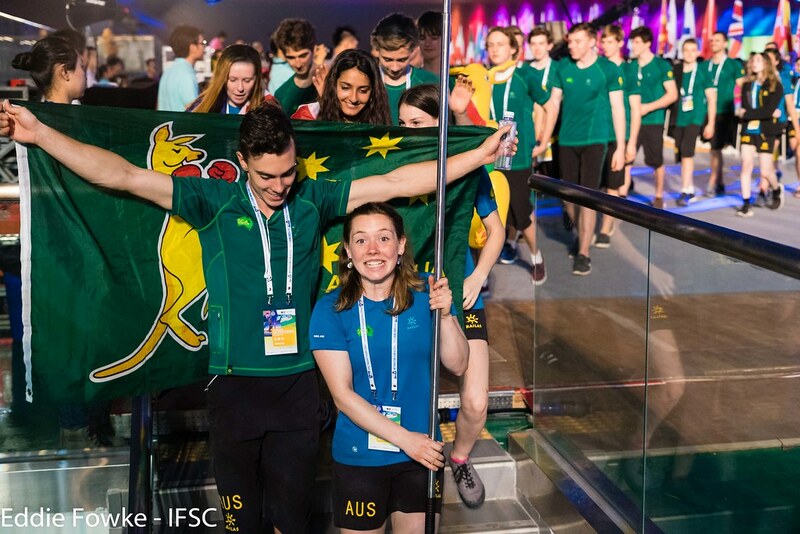 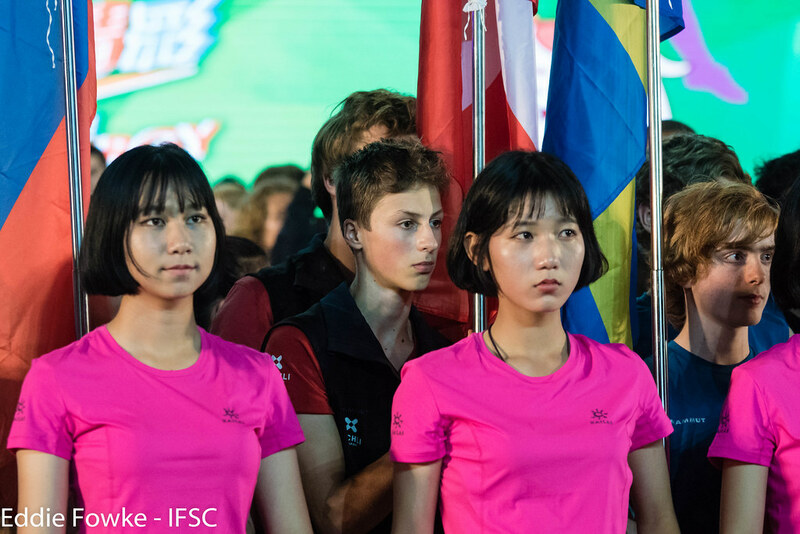 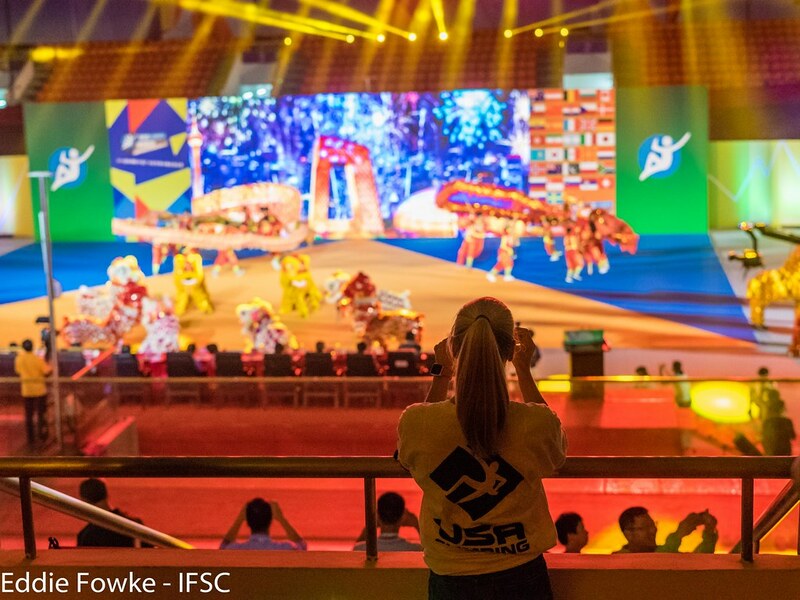 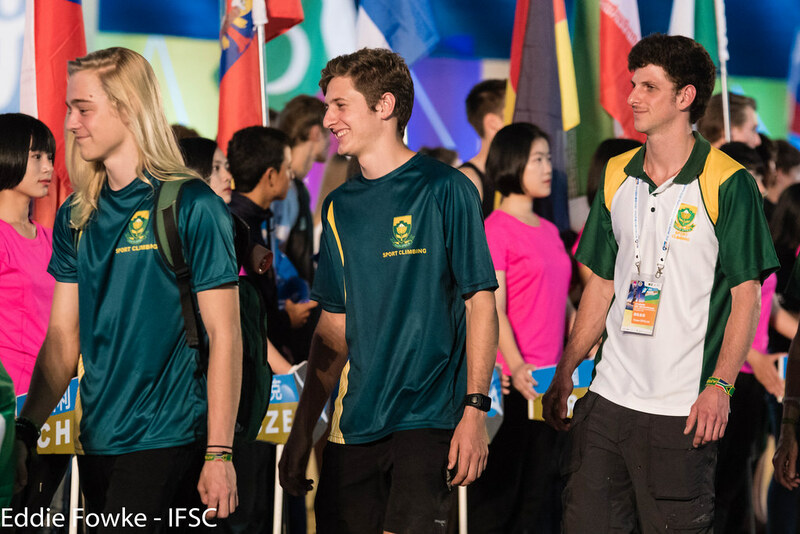 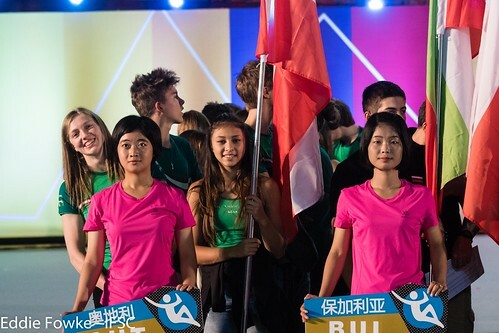 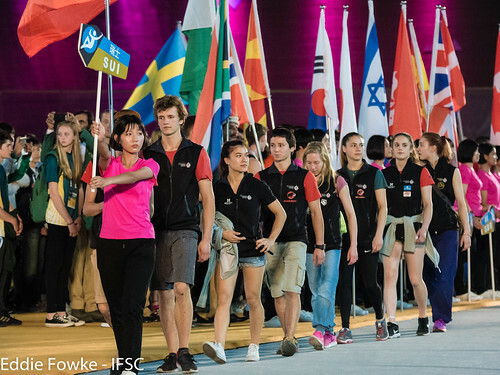 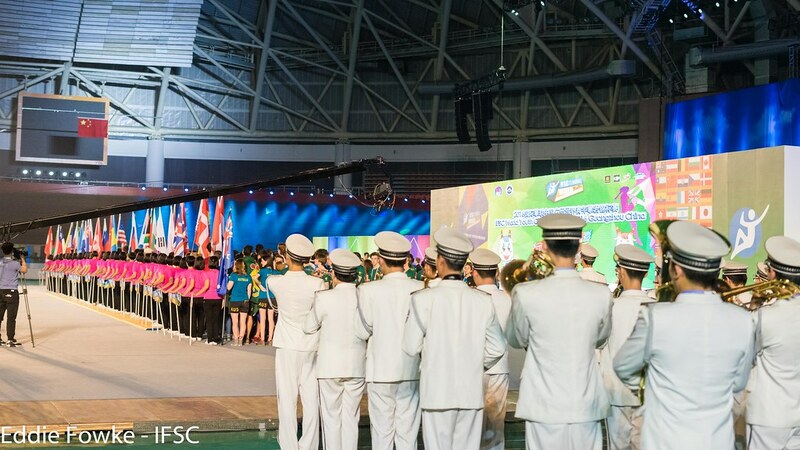 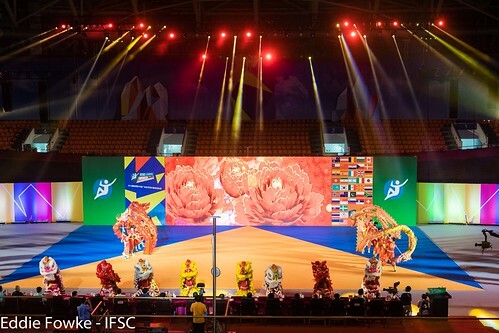 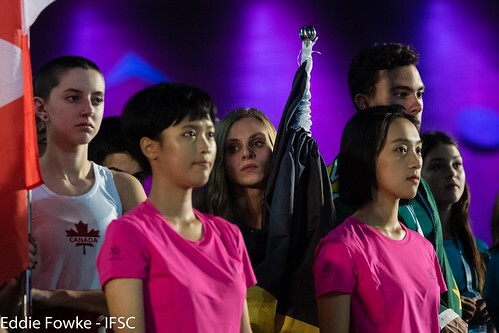 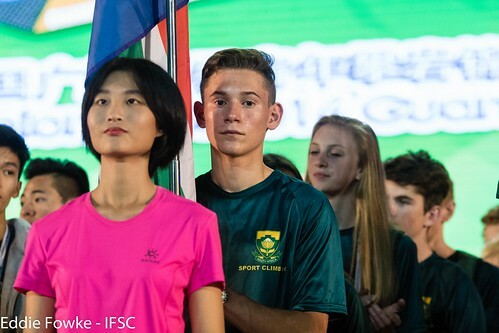 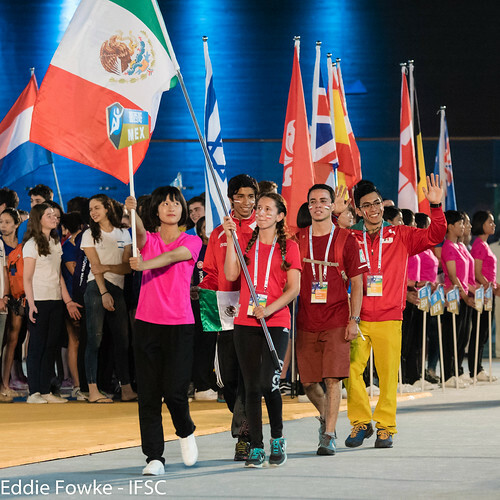 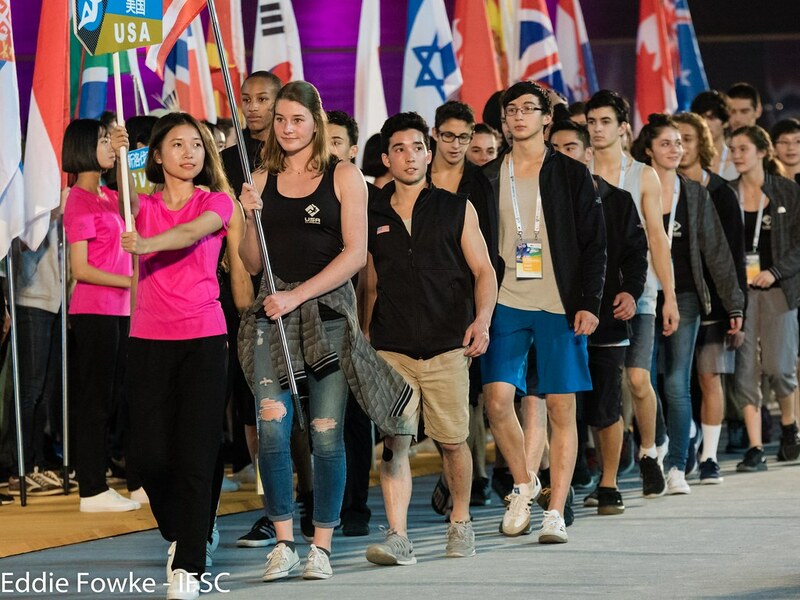 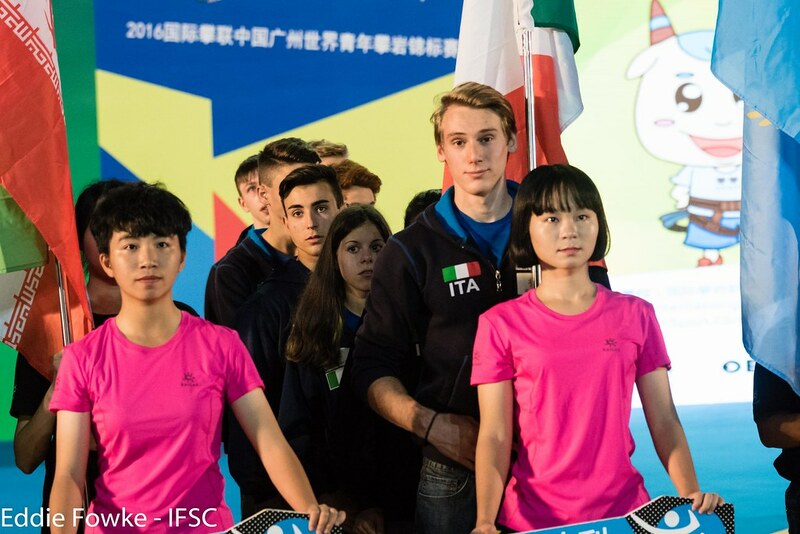 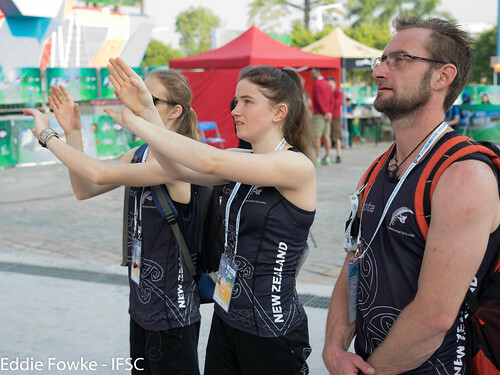 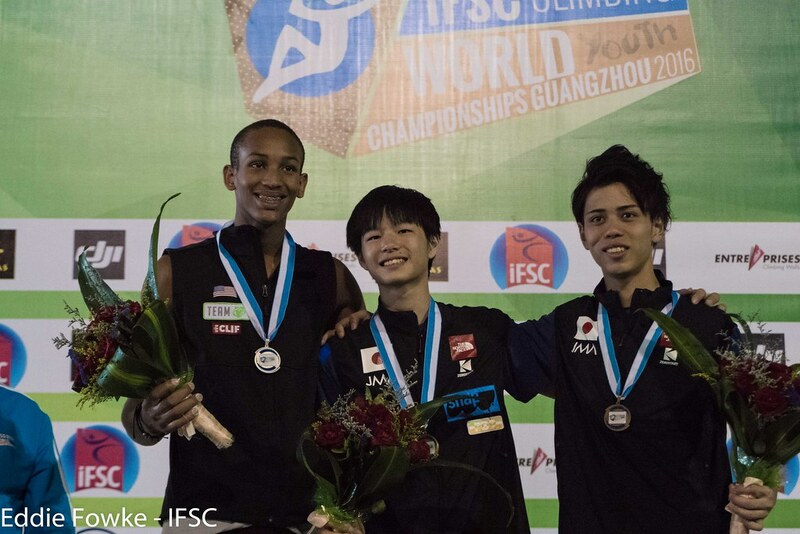 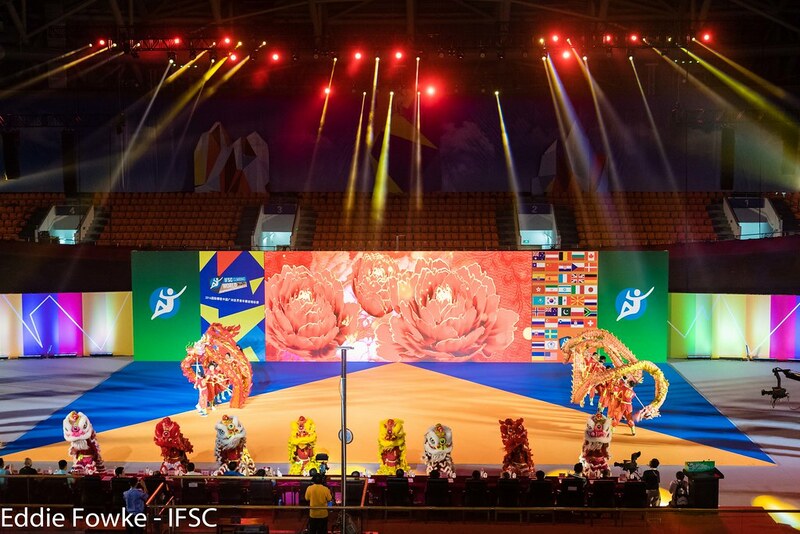 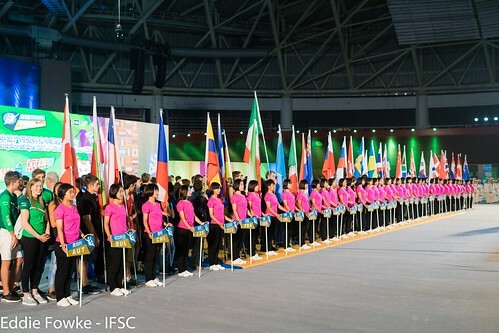 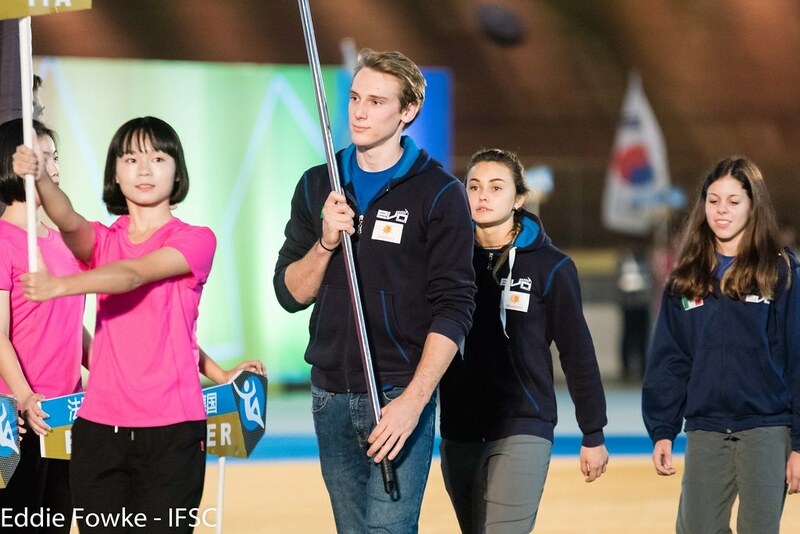 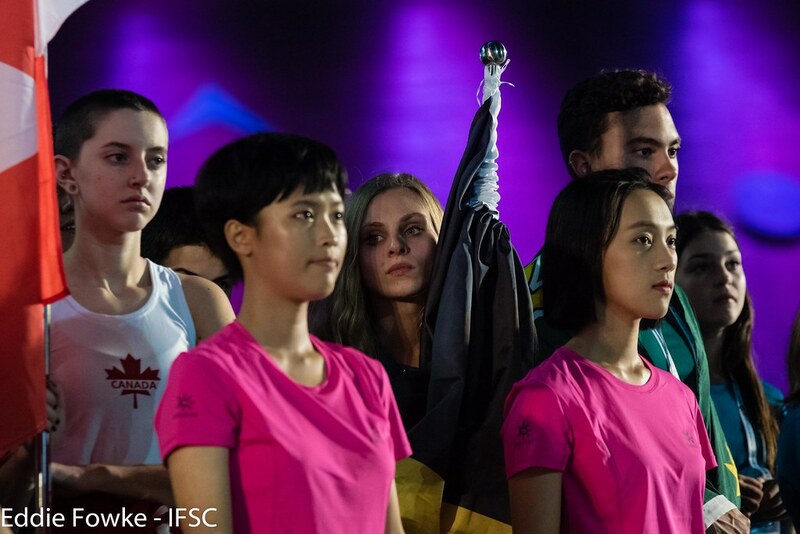 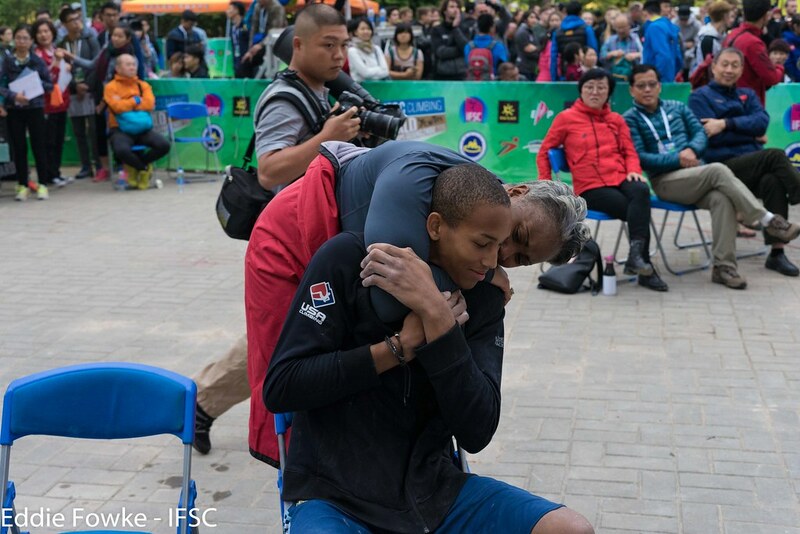 After a beautiful opening ceremony in Guangzhou, hundreds of young Lead athletes stepped into harnesses and slapped chalk on their hands to battle for the world youth title! 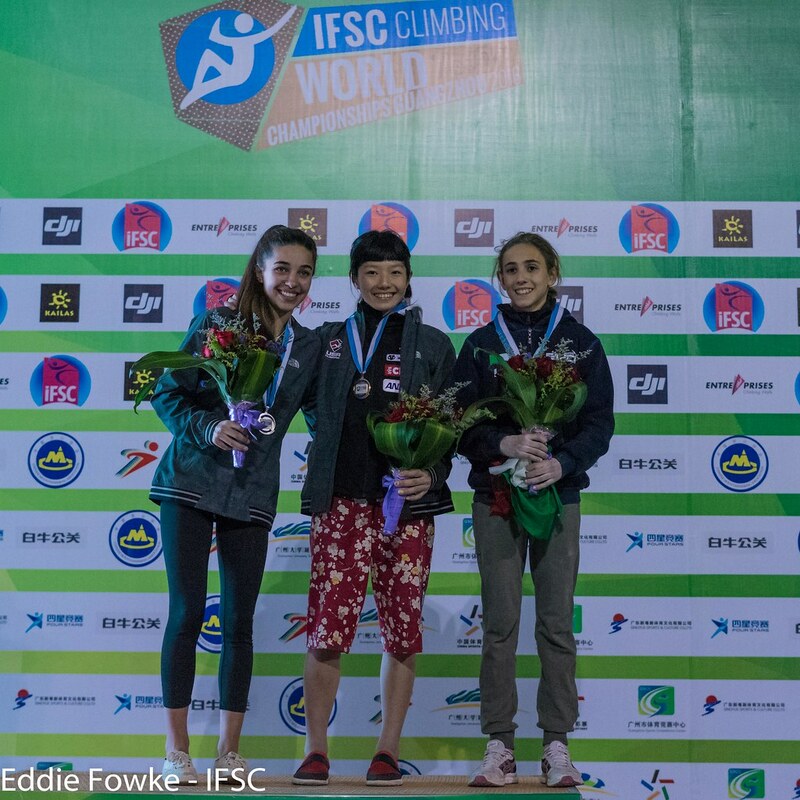 For the Females, three athletes consistently finished atop their category over three days of climbing. 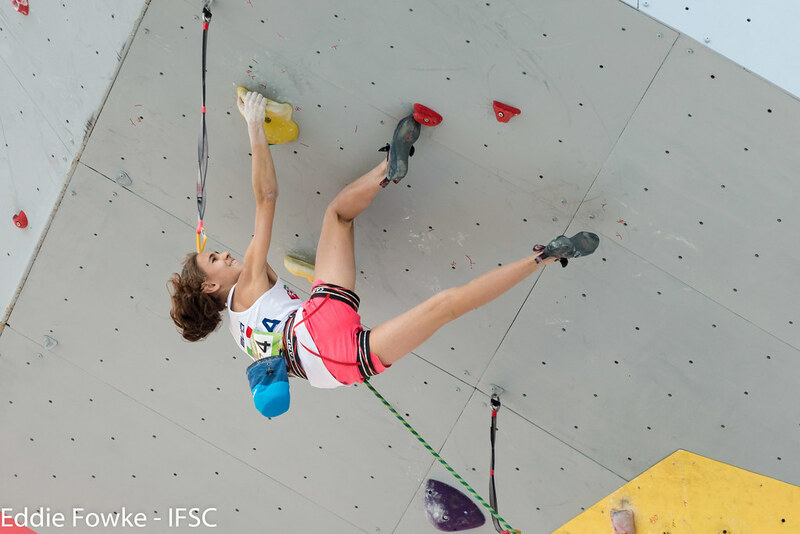 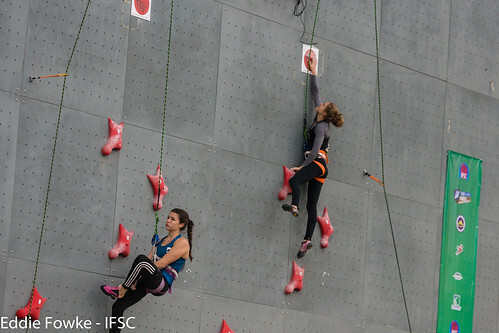 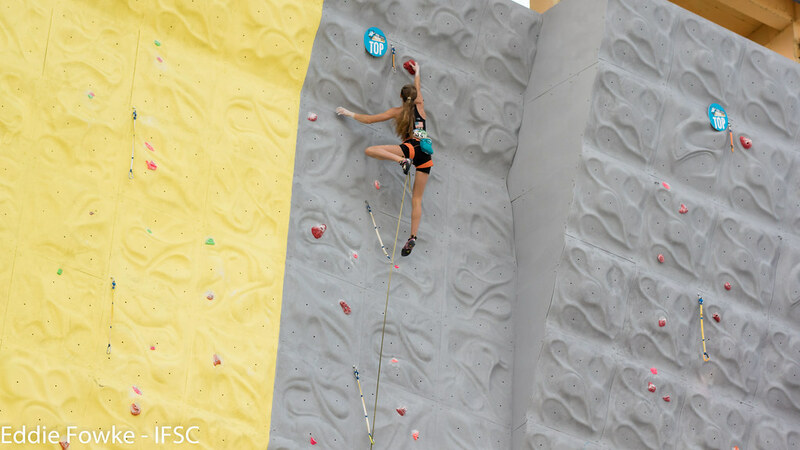 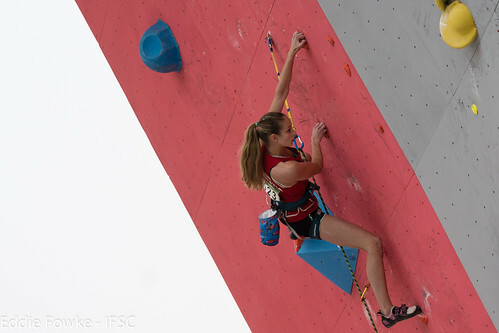 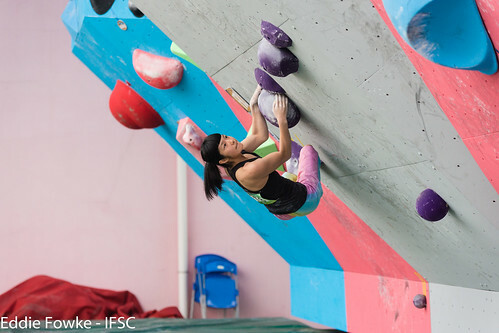 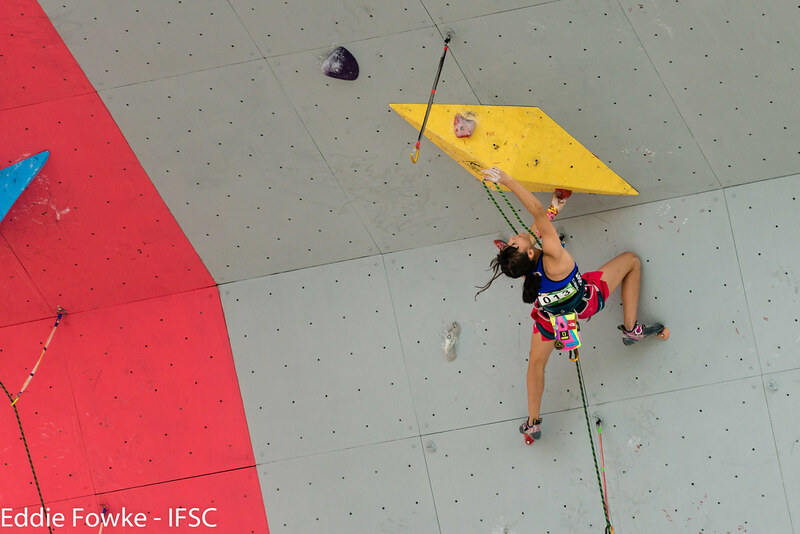 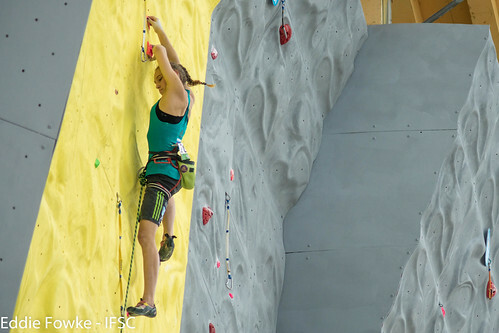 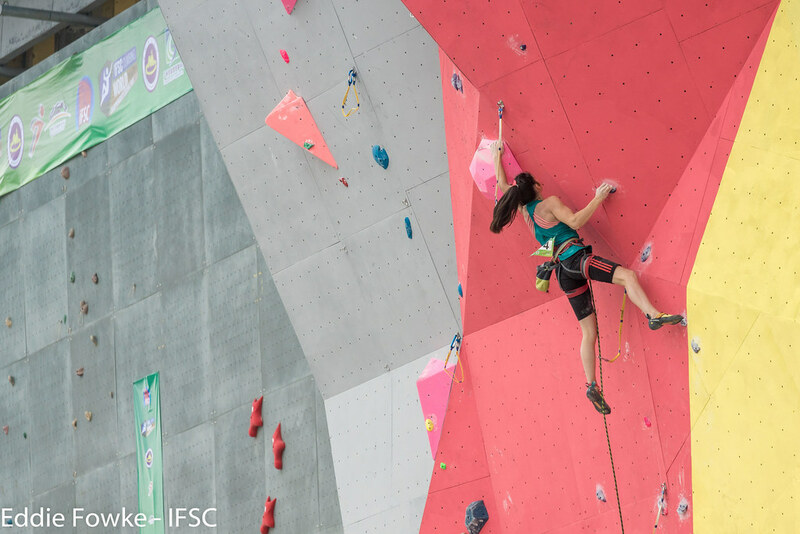 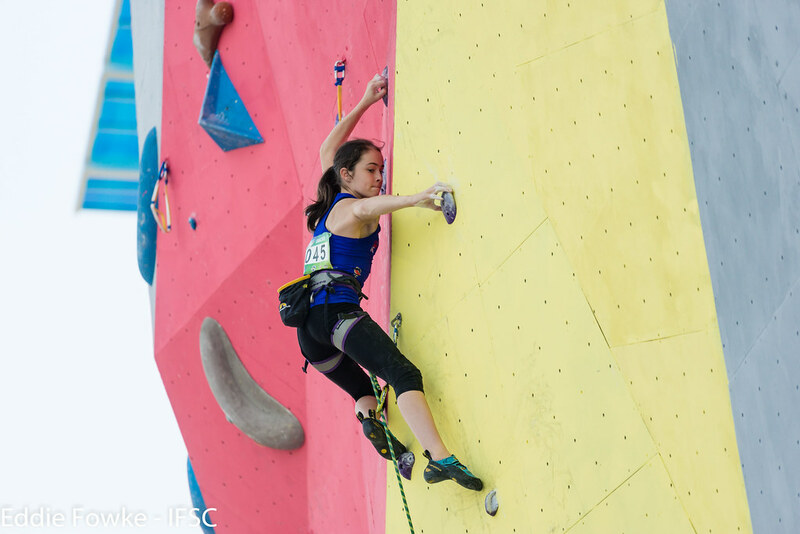 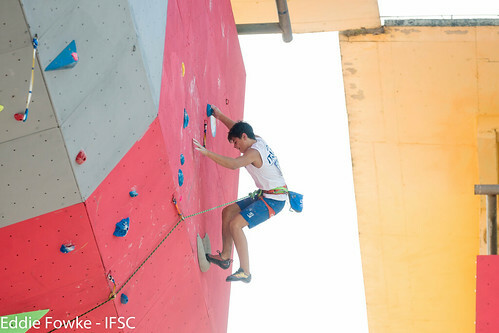 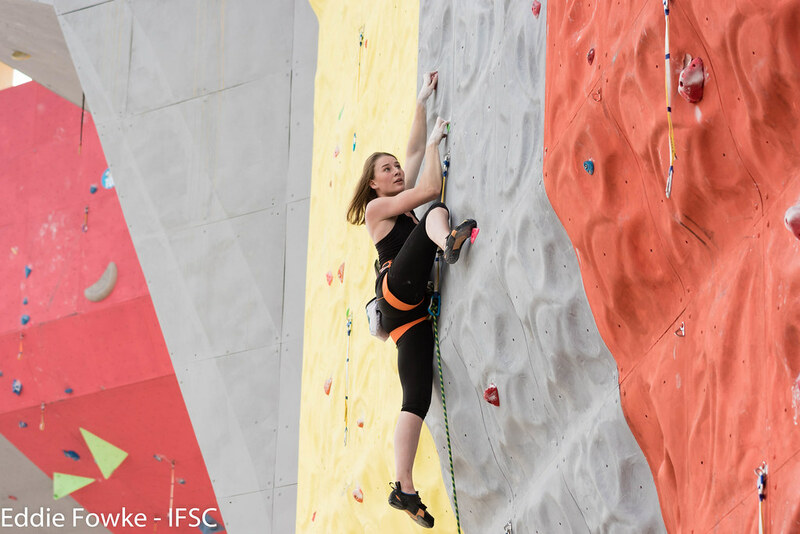 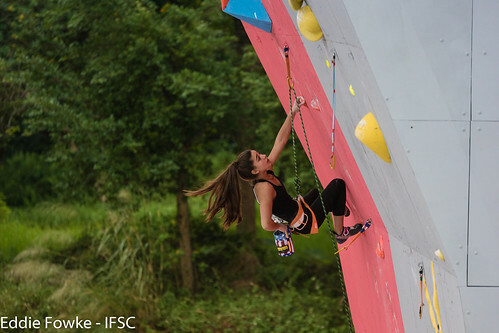 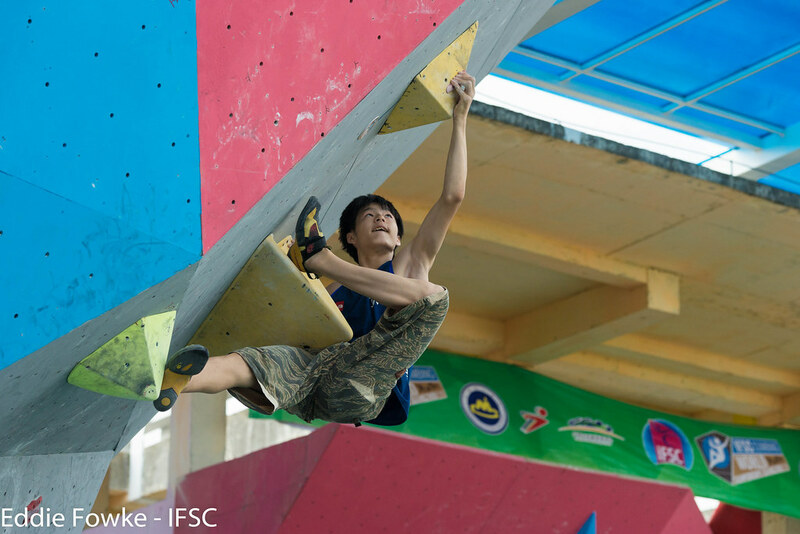 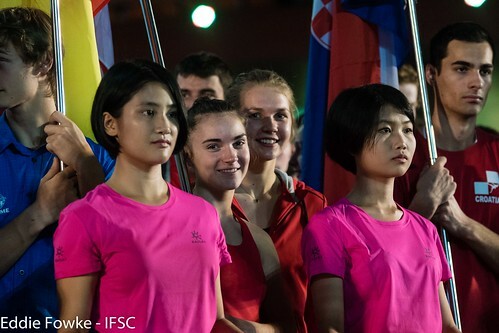 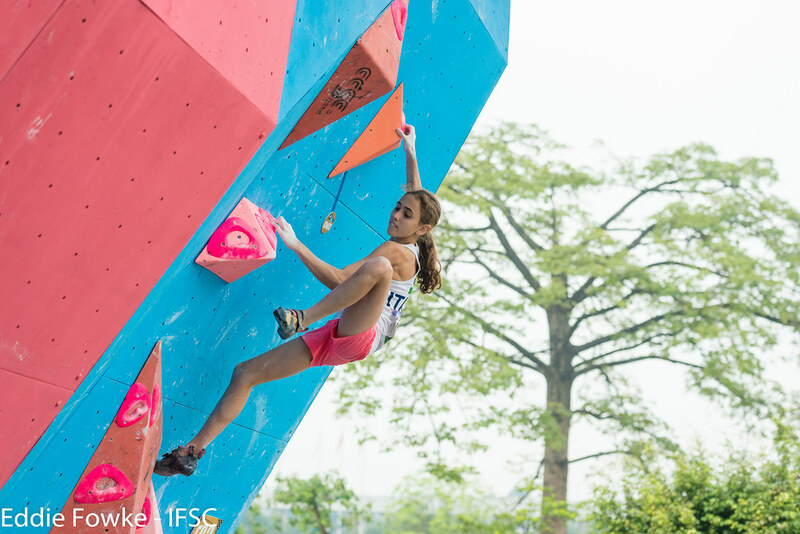 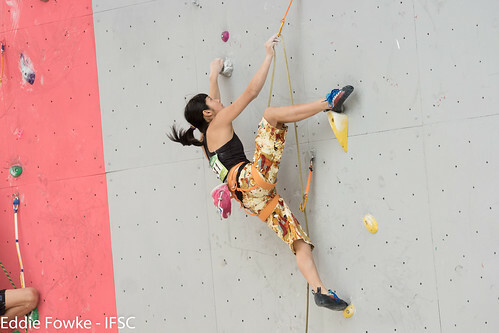 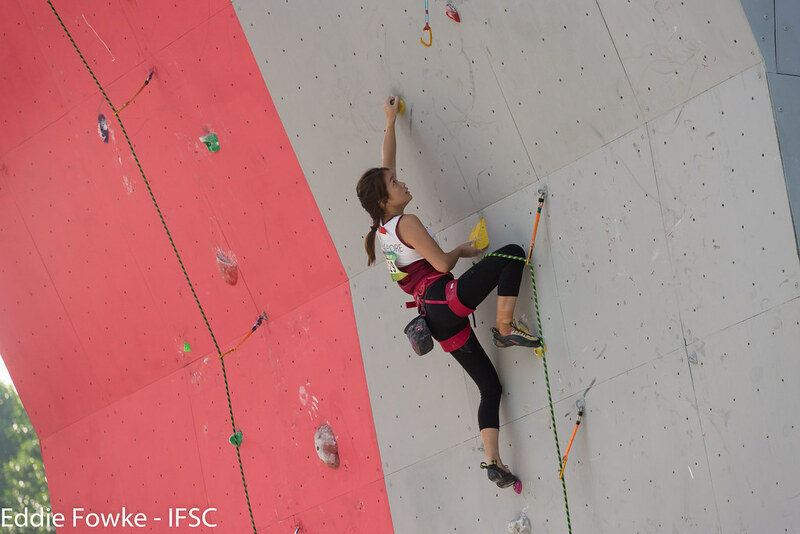 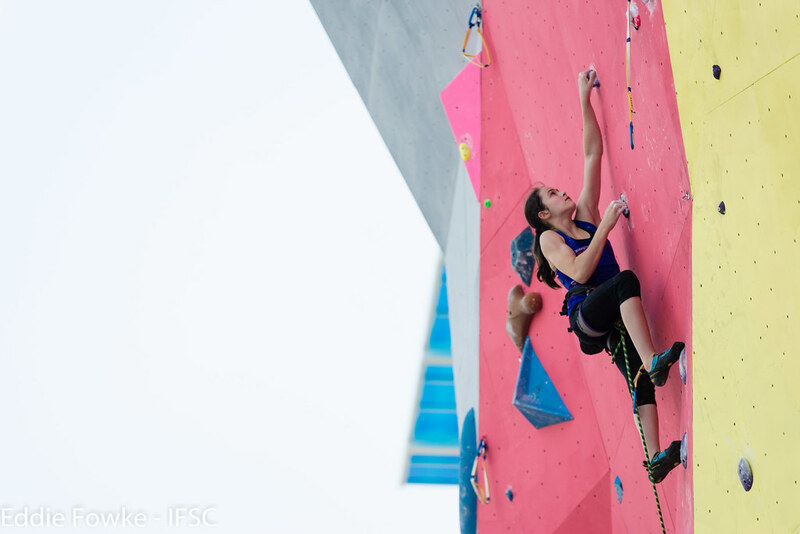 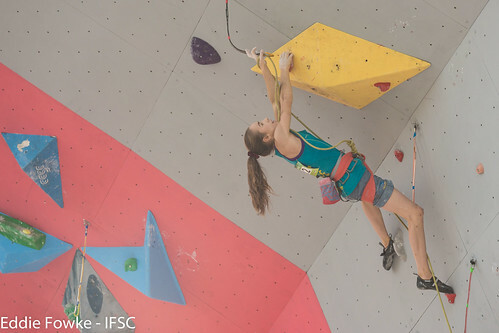 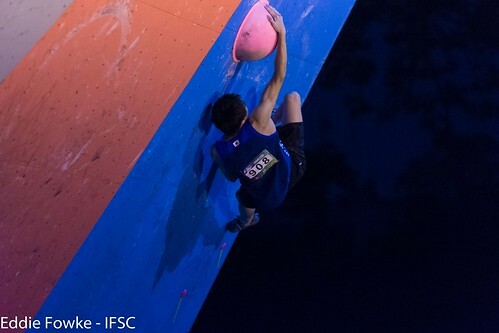 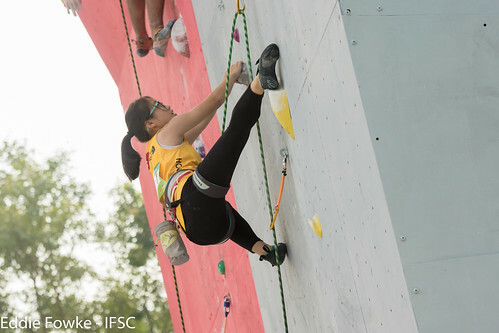 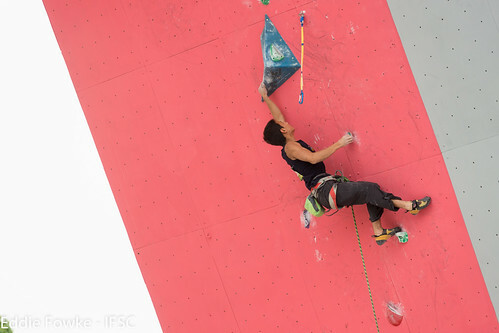 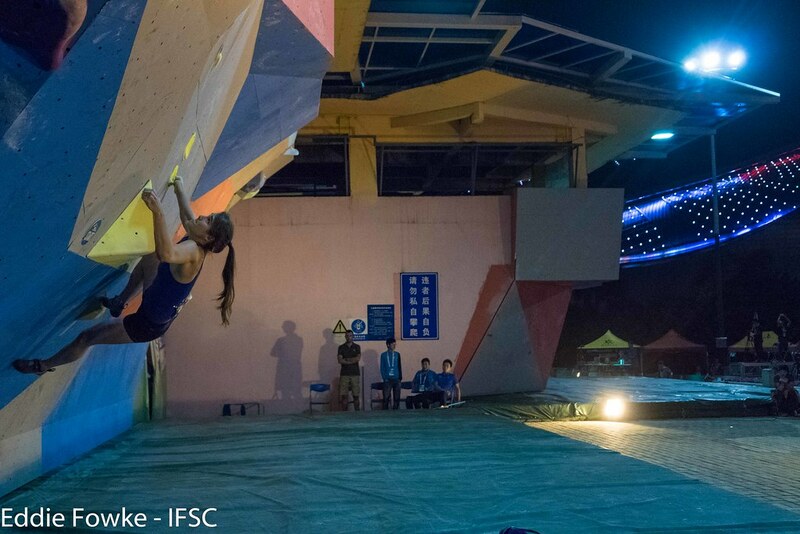 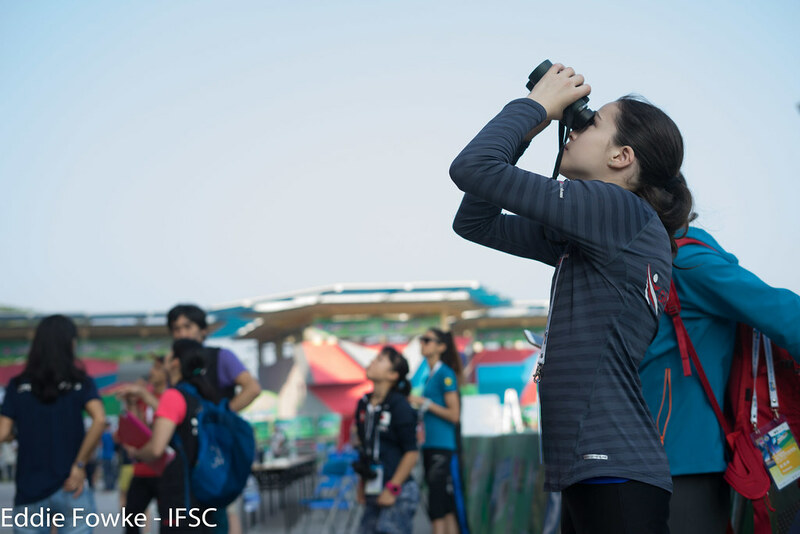 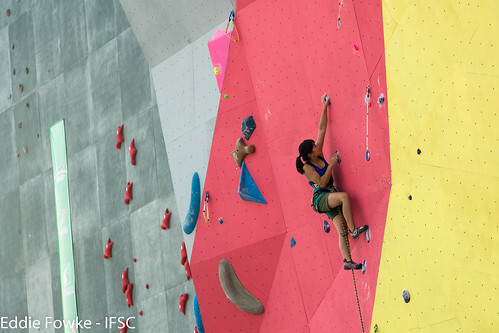 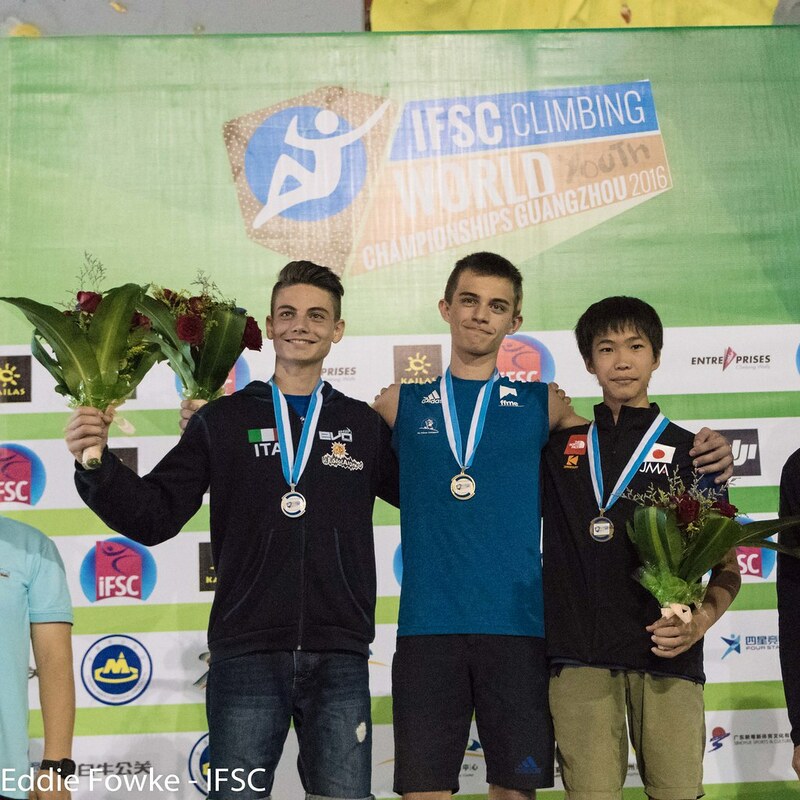 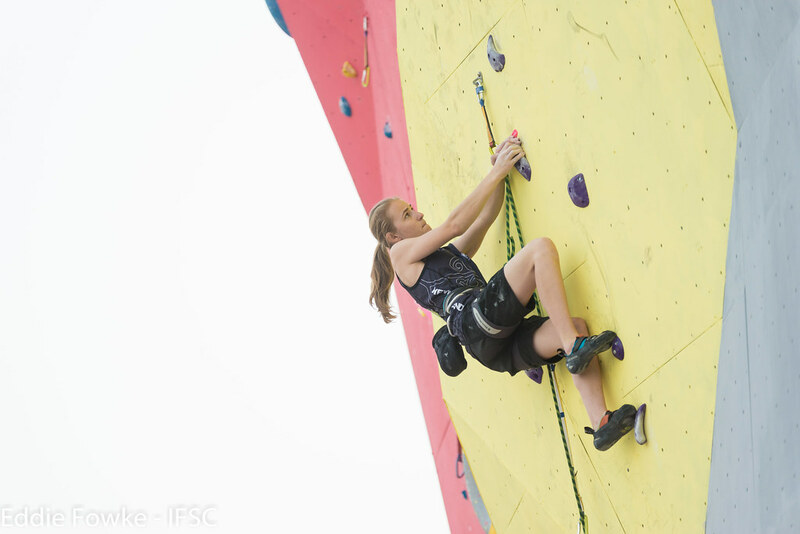 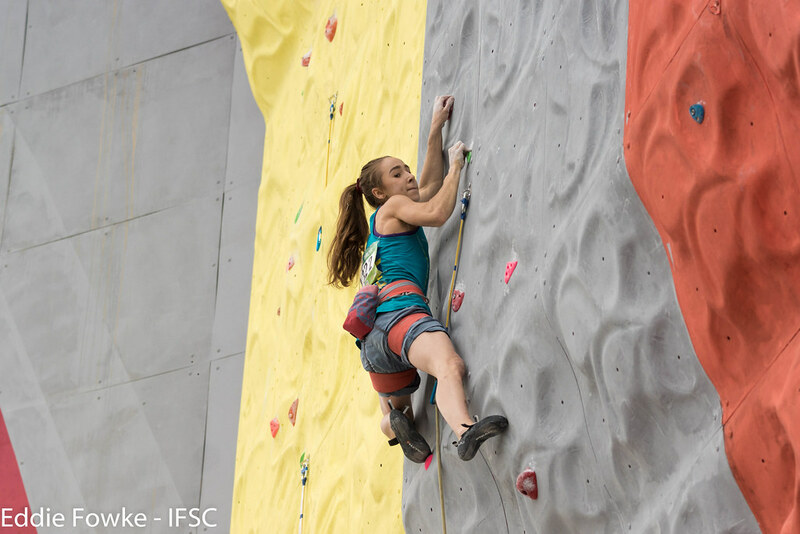 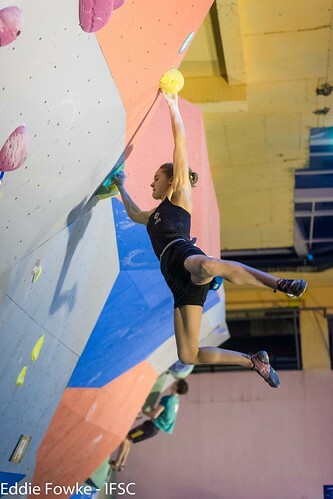 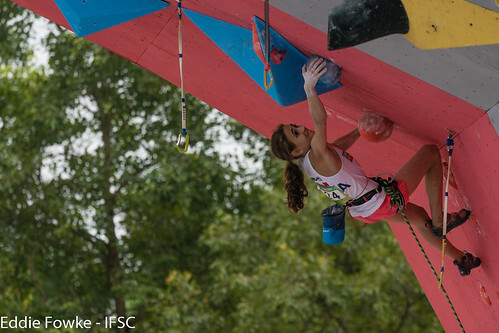 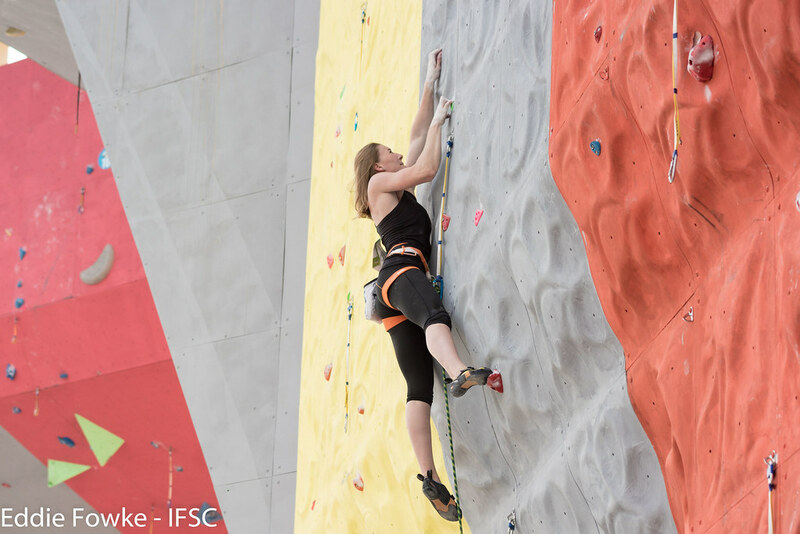 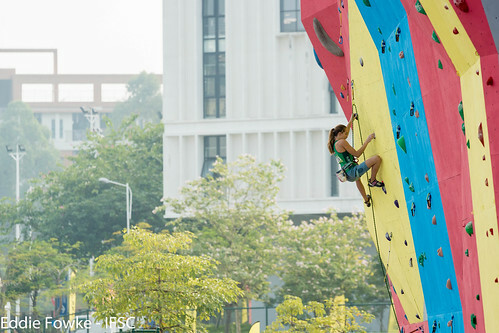 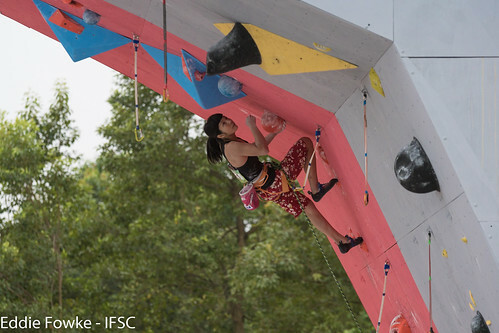 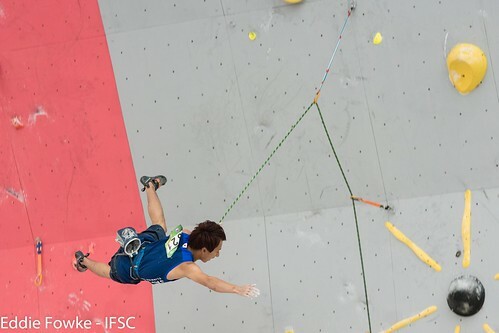 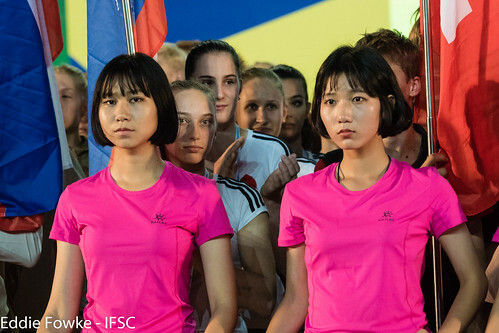 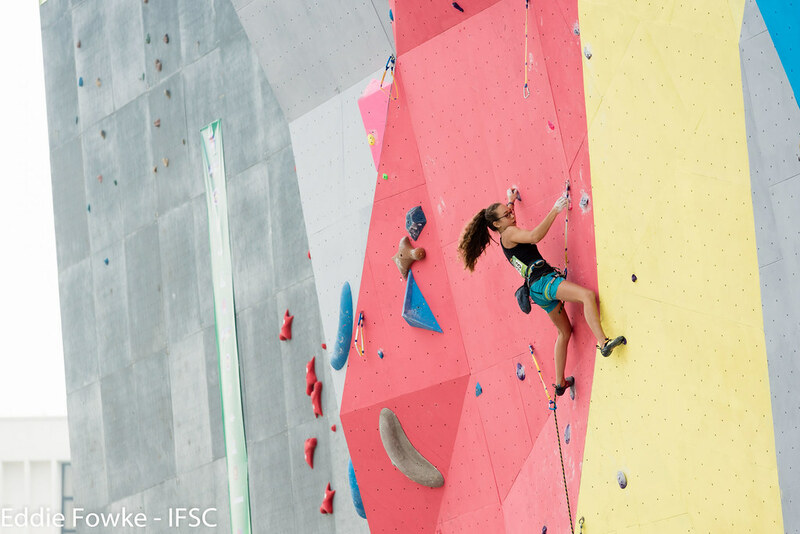 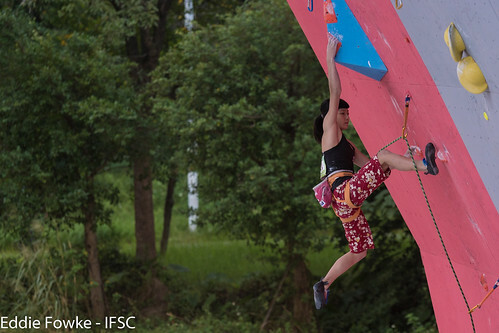 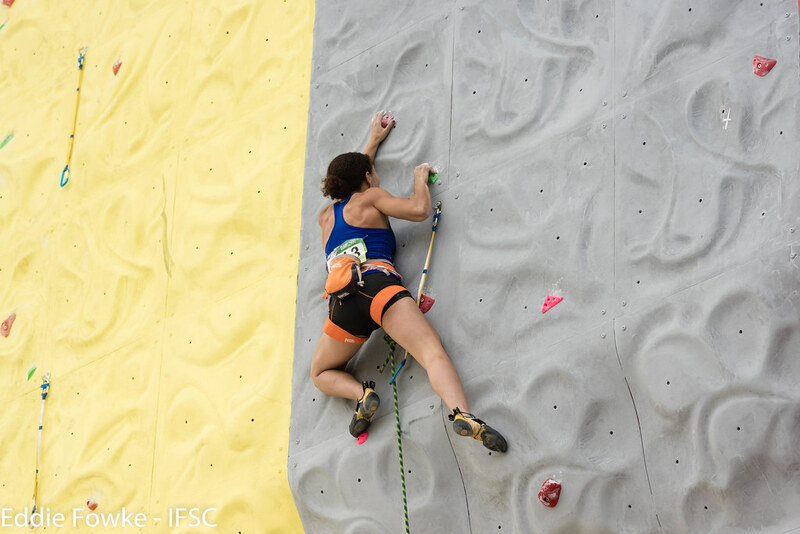 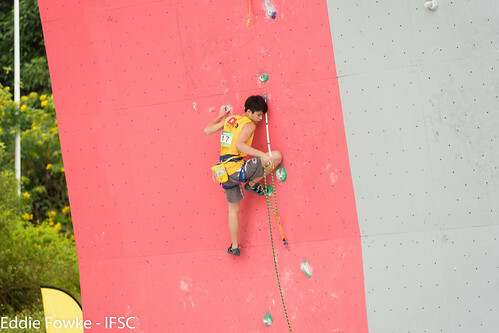 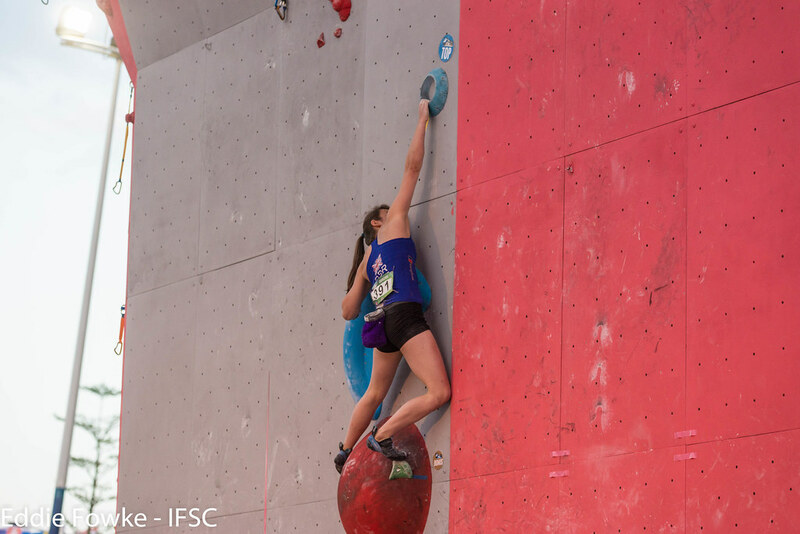 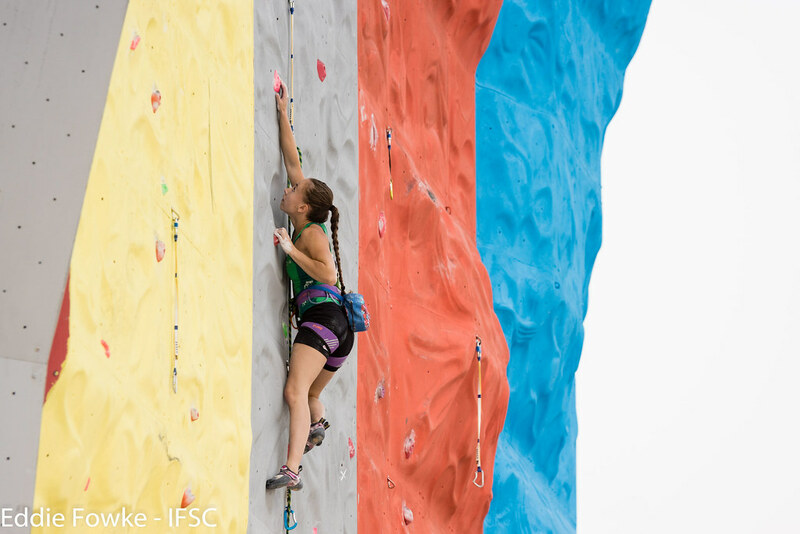 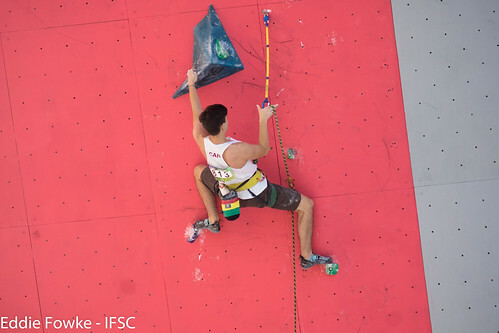 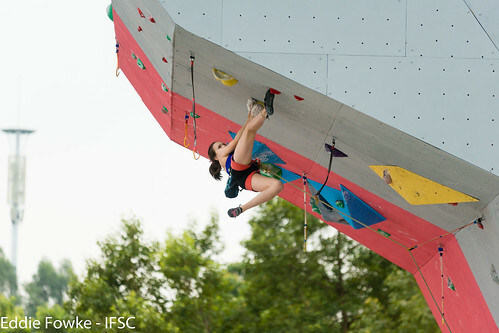 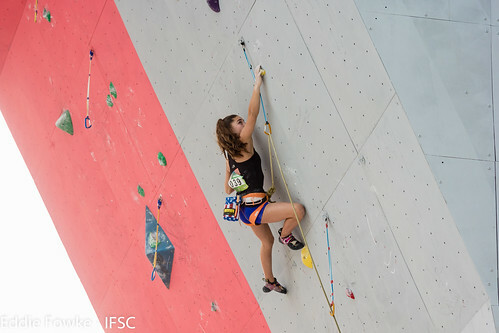 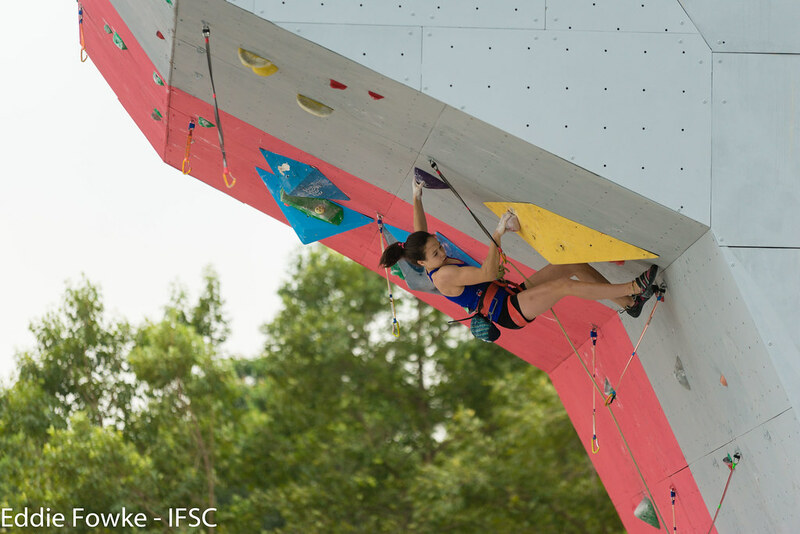 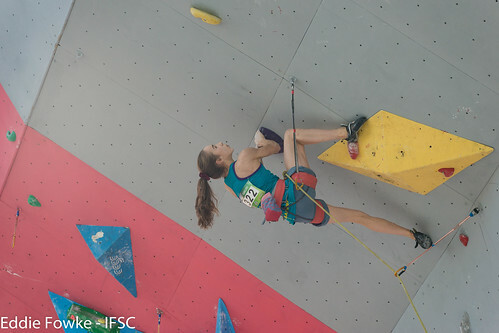 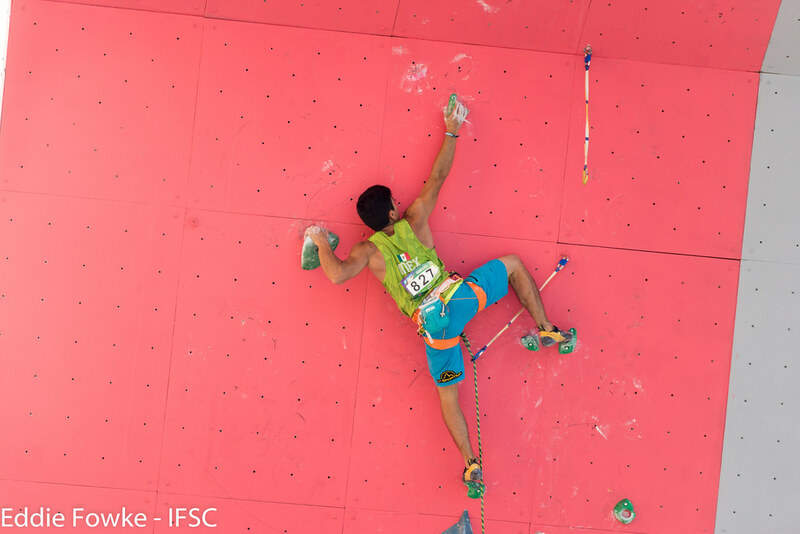 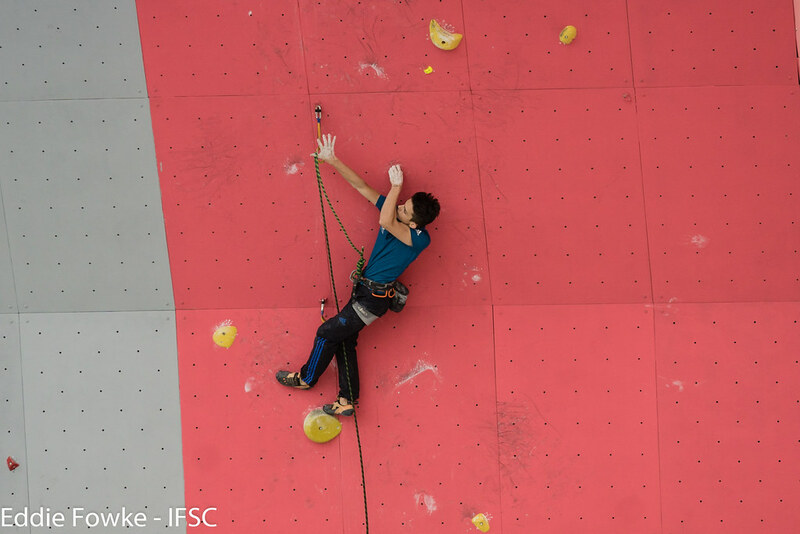 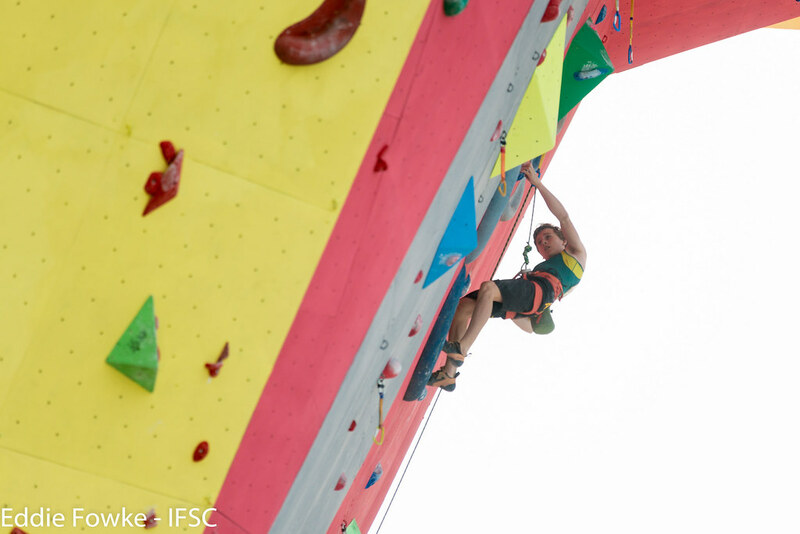 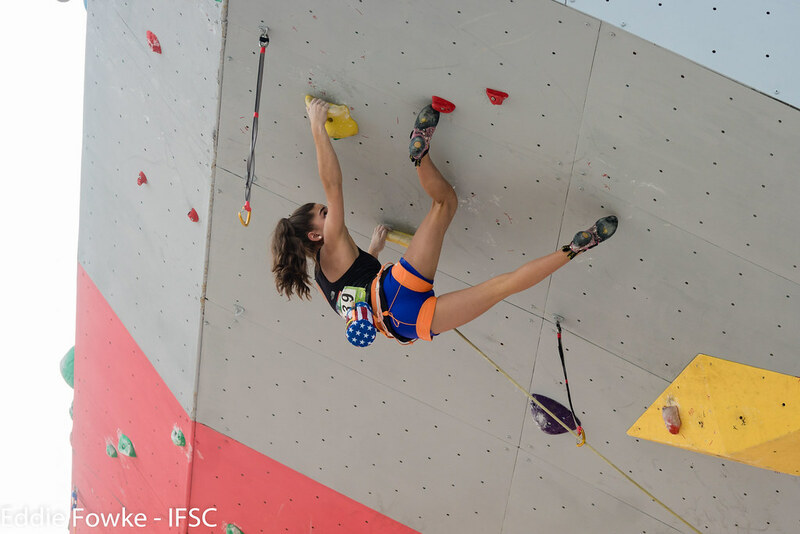 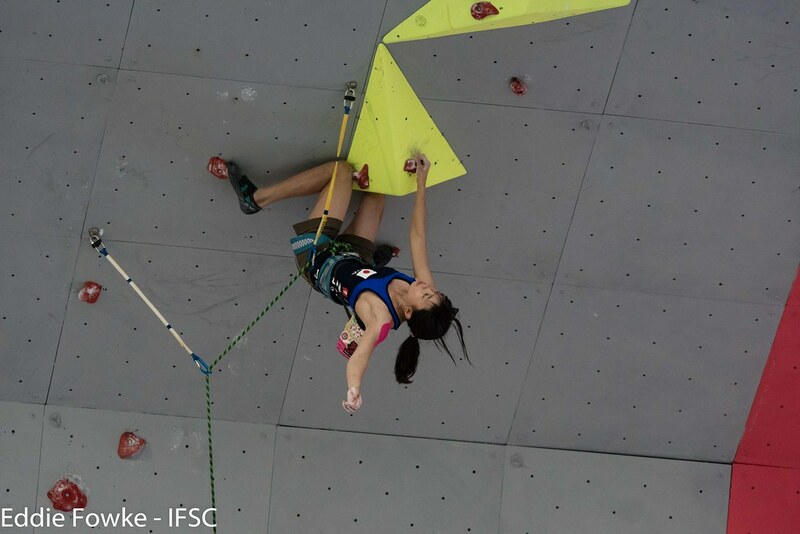 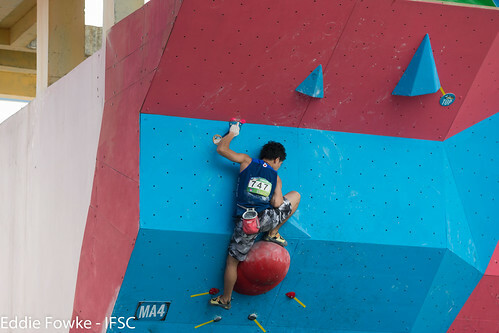 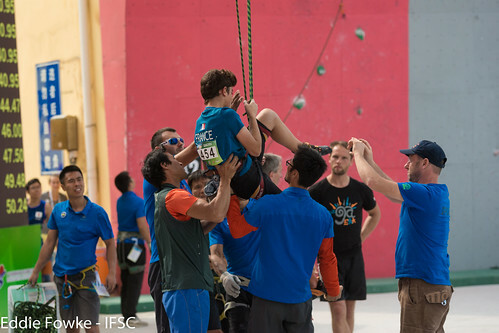 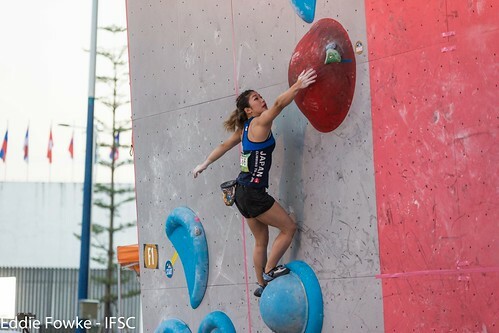 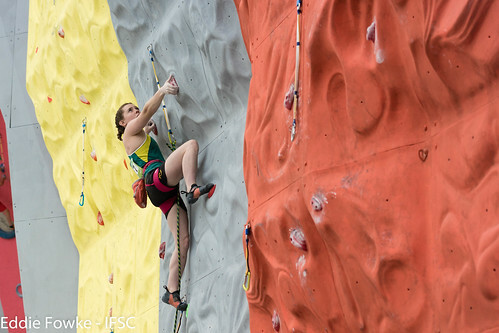 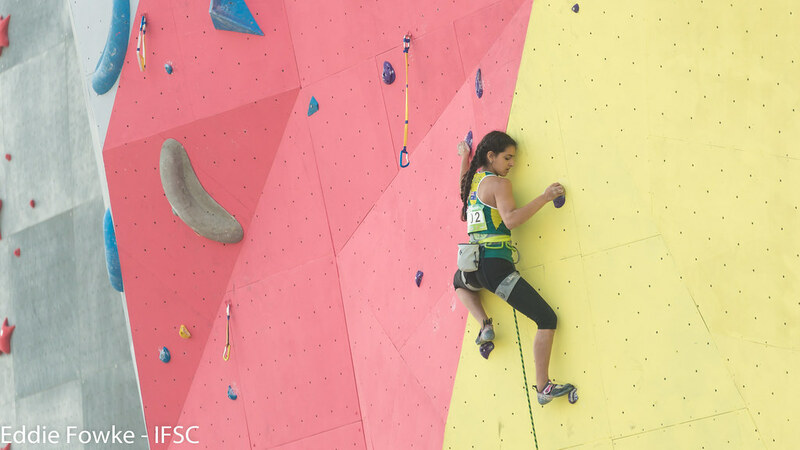 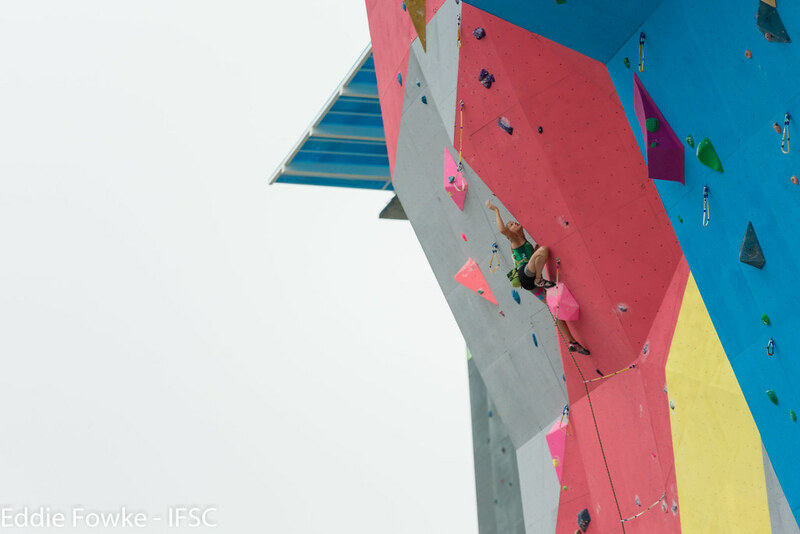 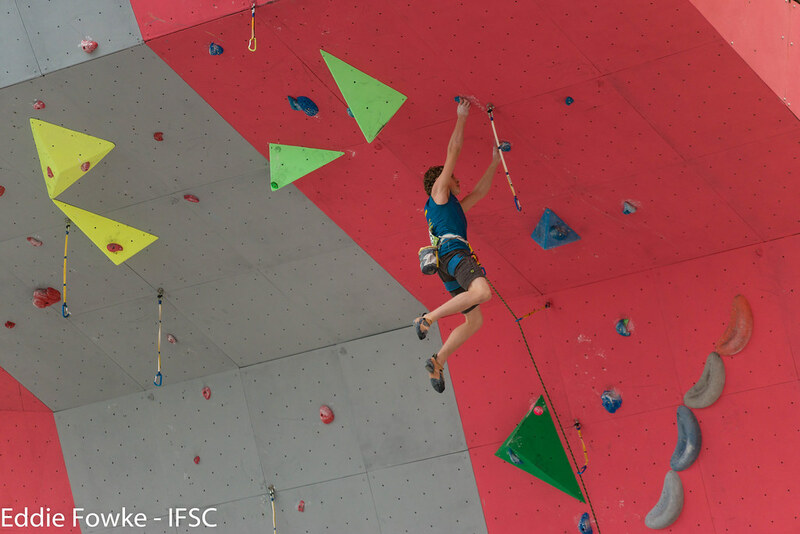 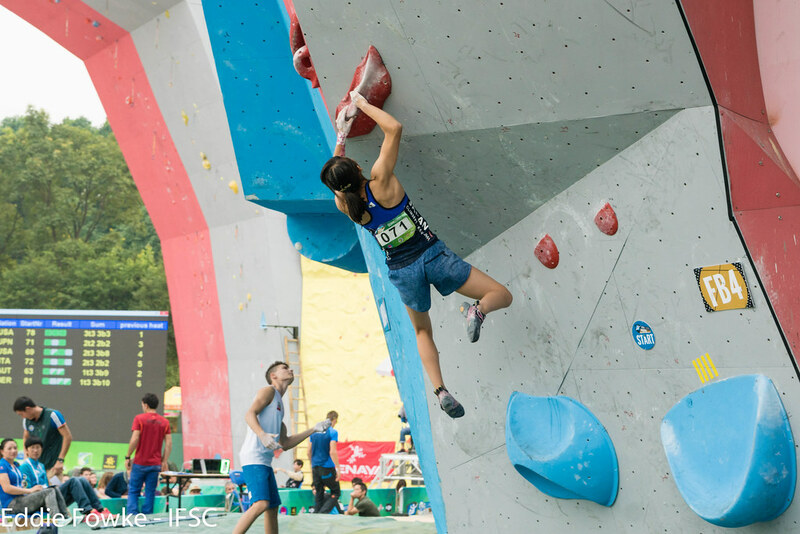 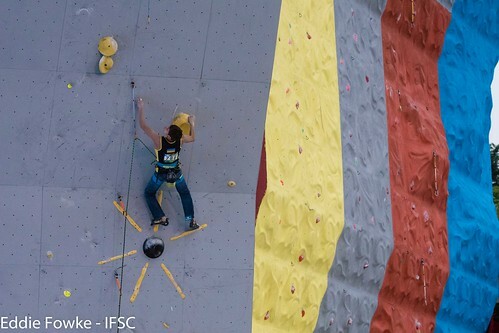 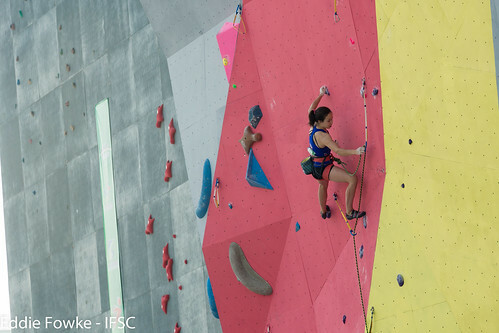 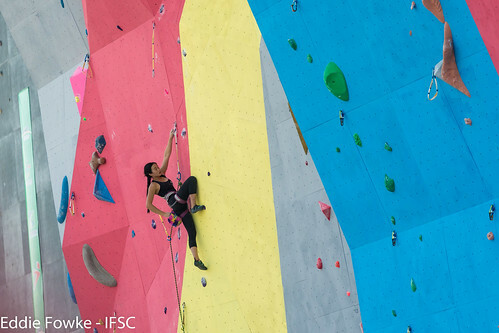 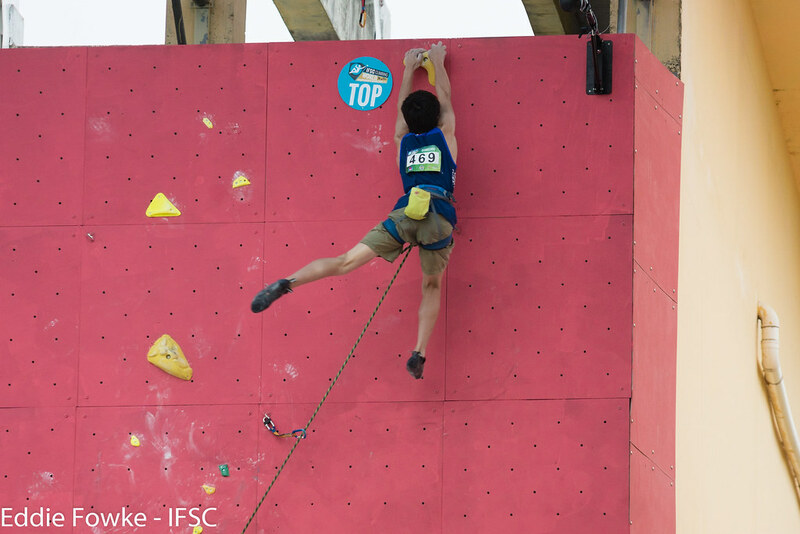 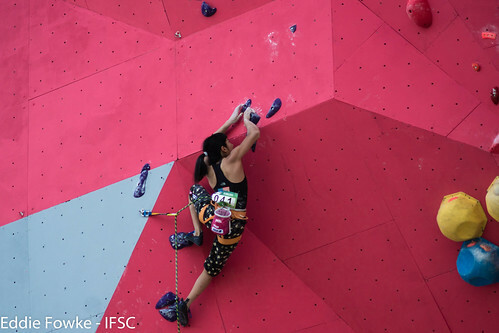 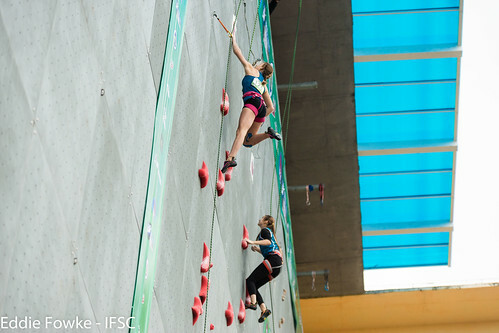 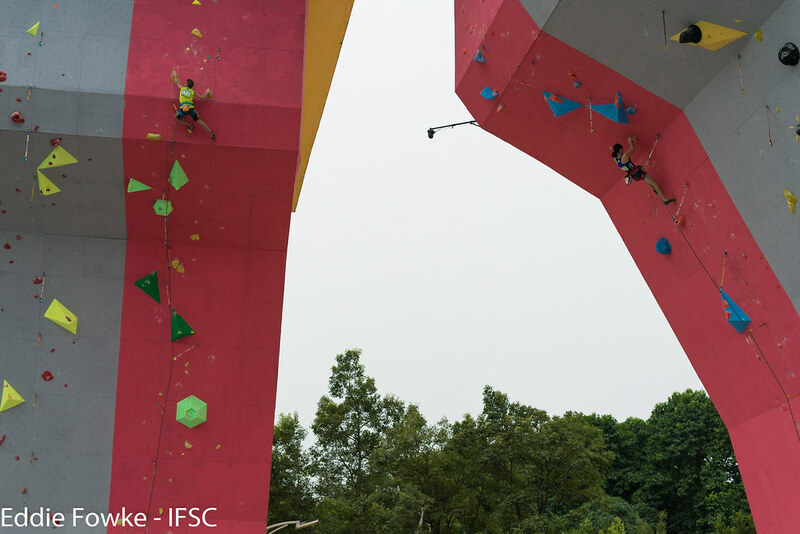 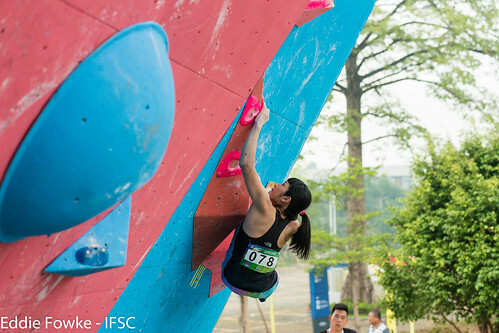 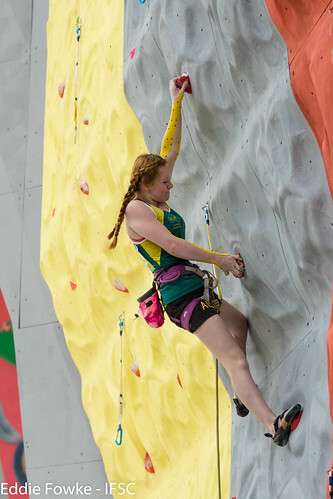 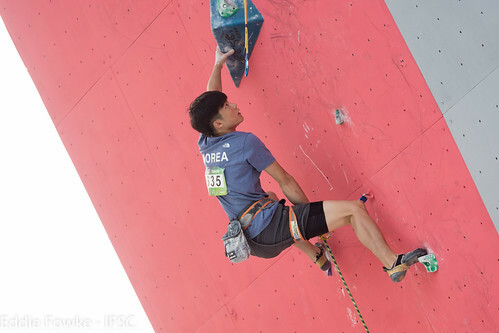 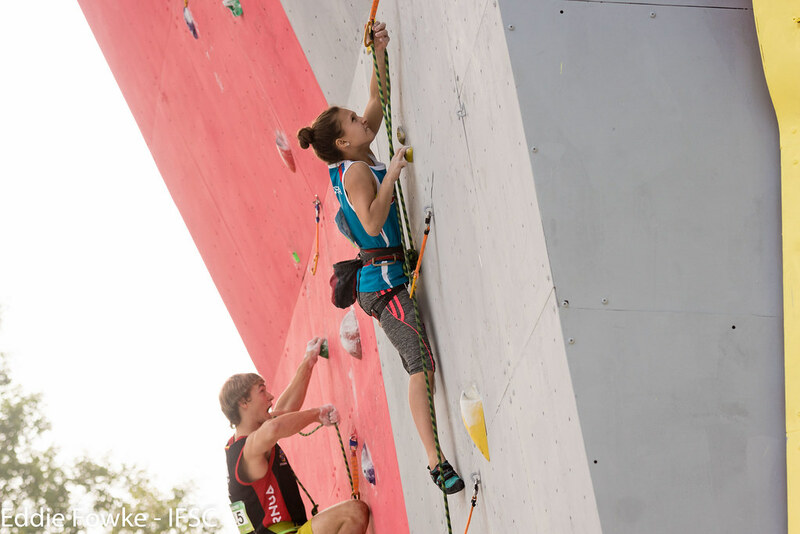 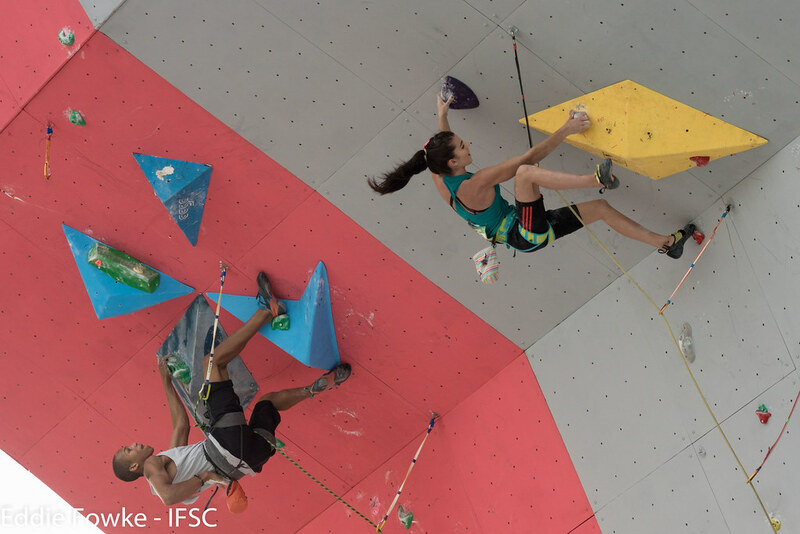 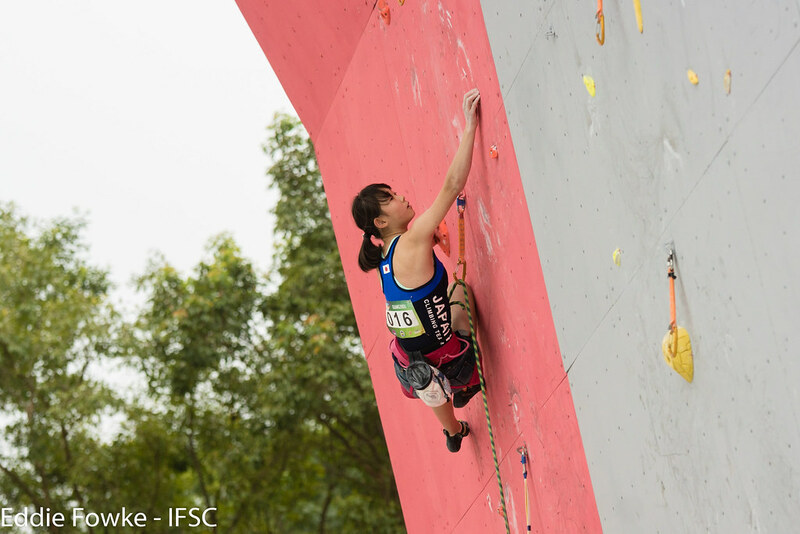 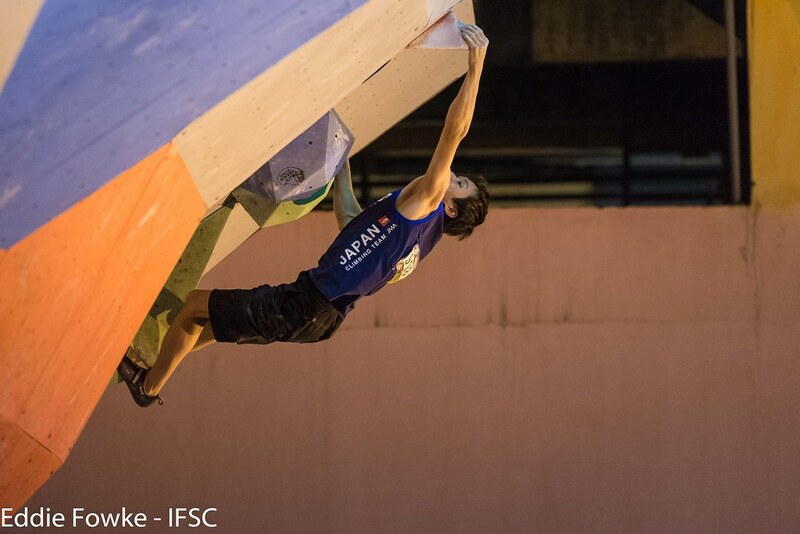 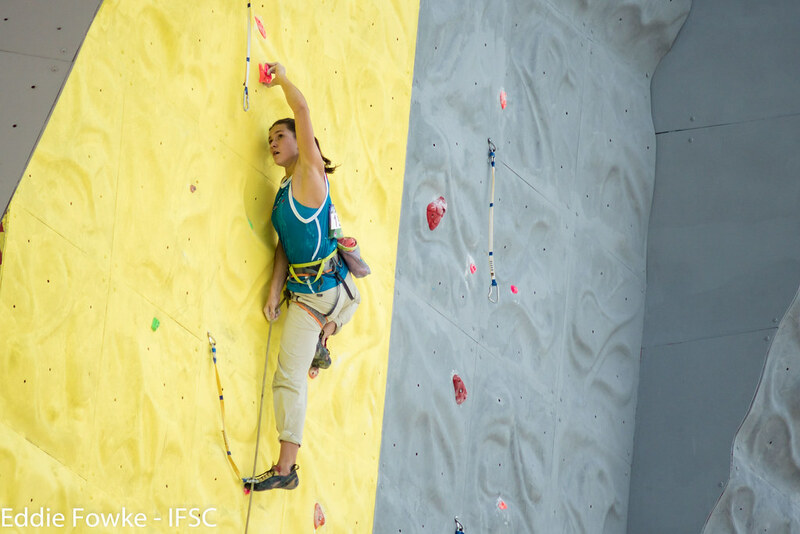 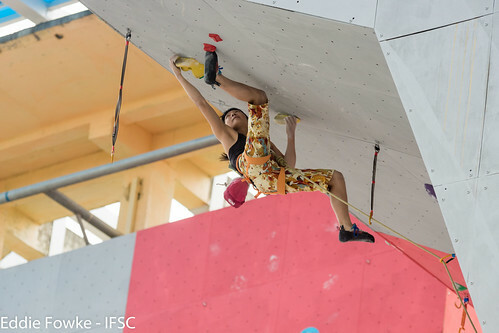 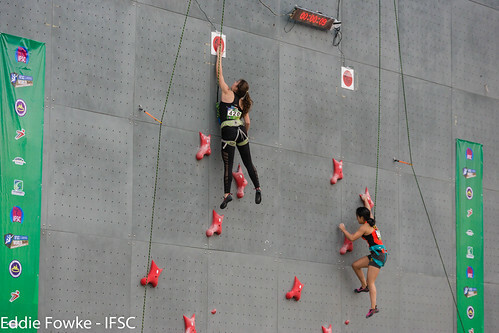 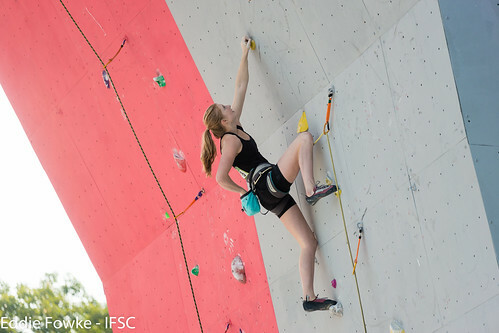 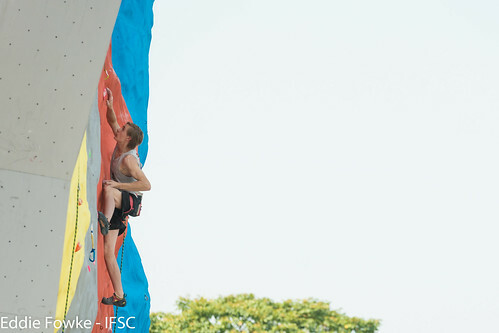 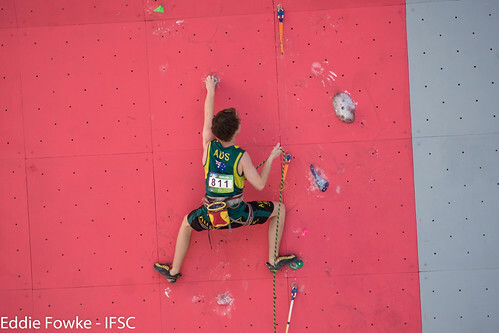 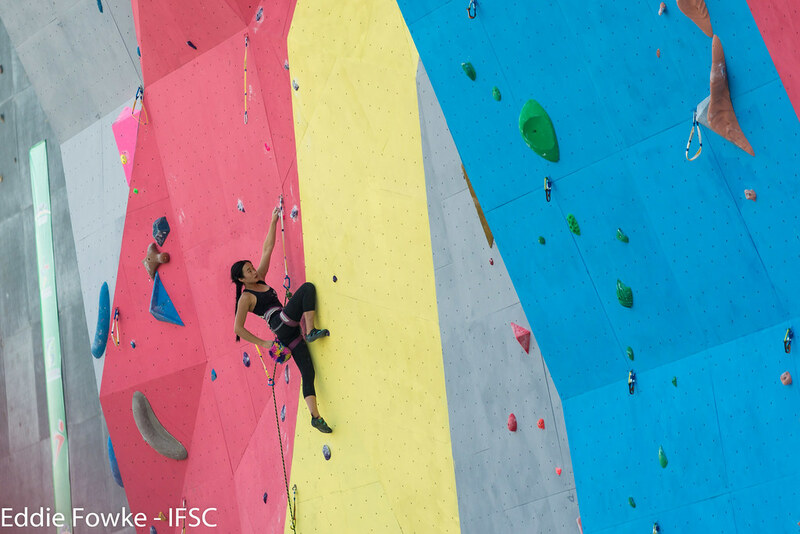 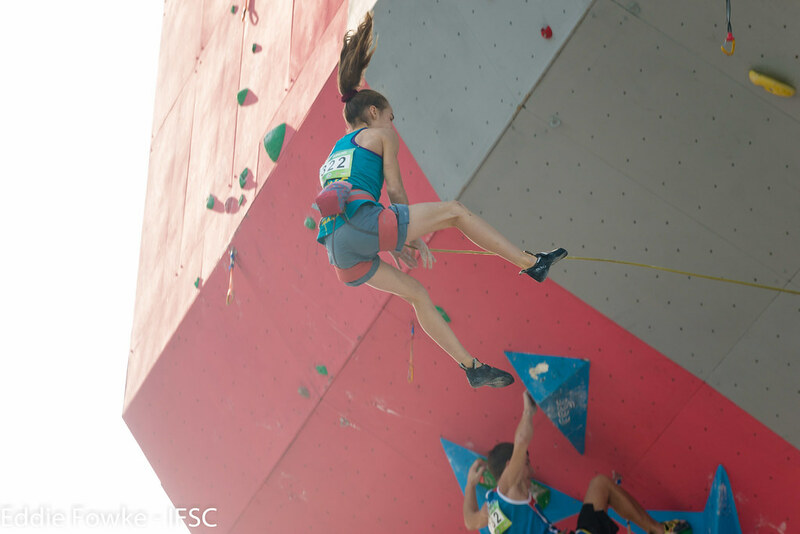 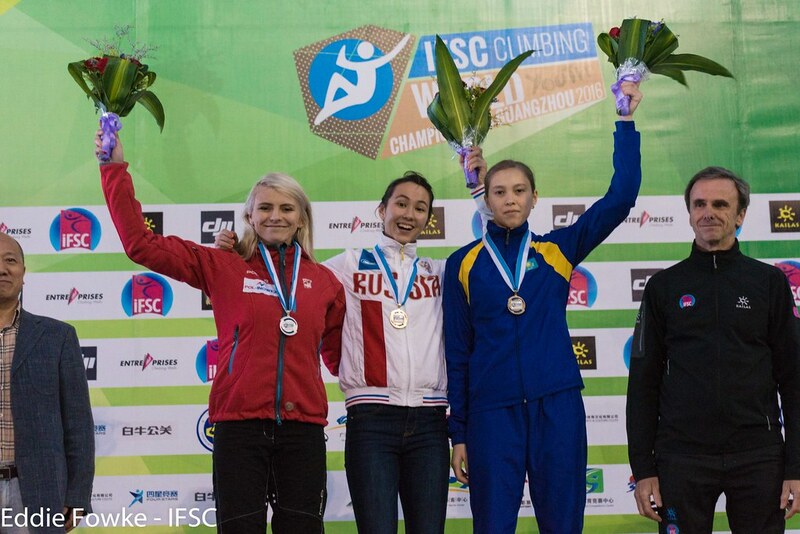 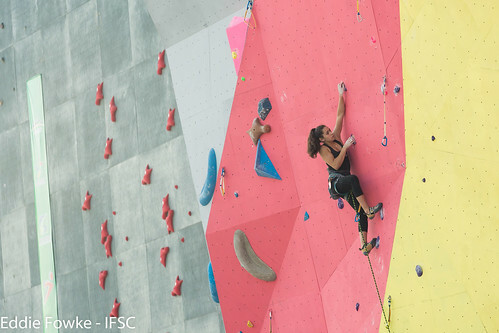 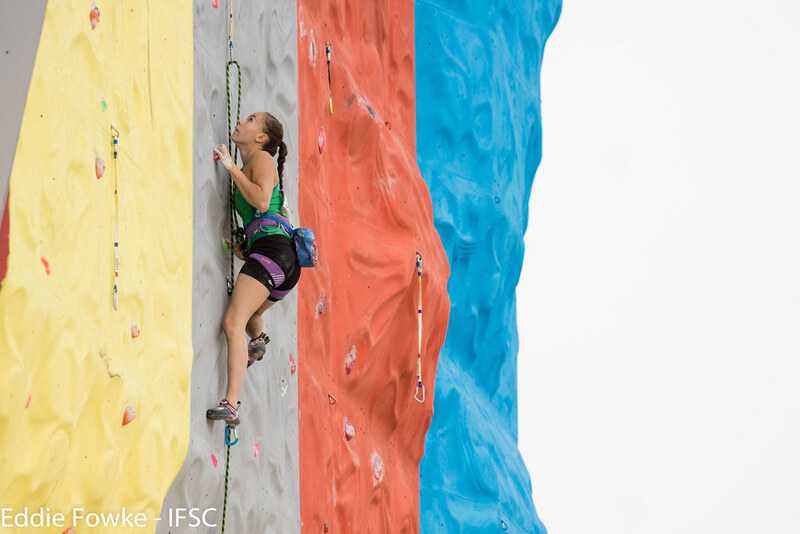 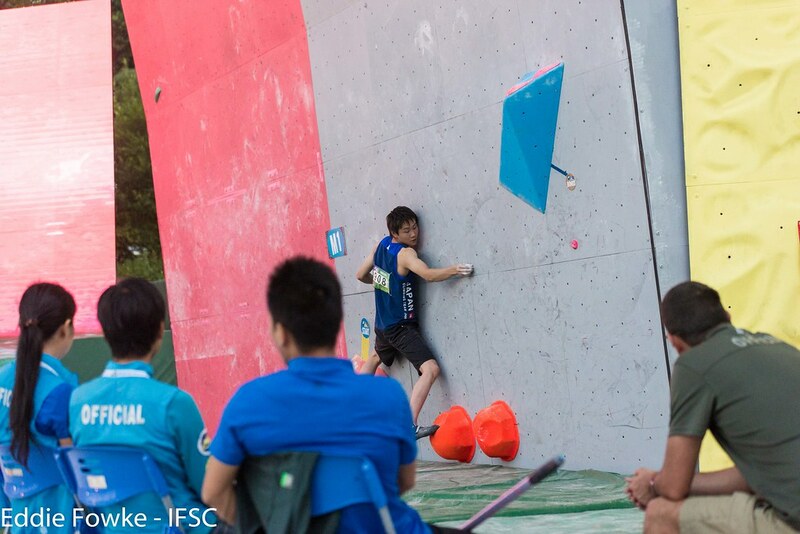 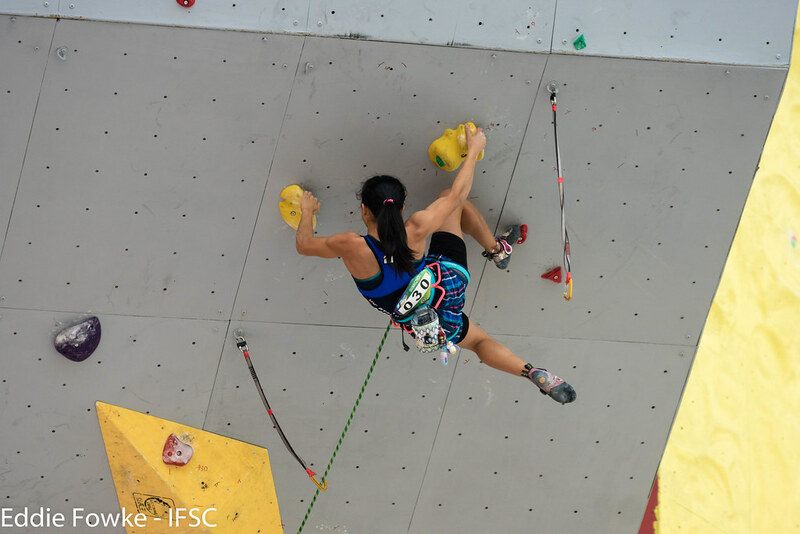 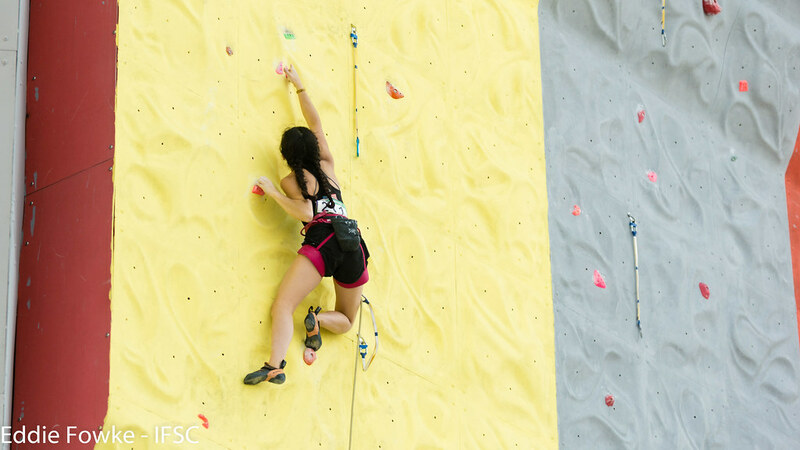 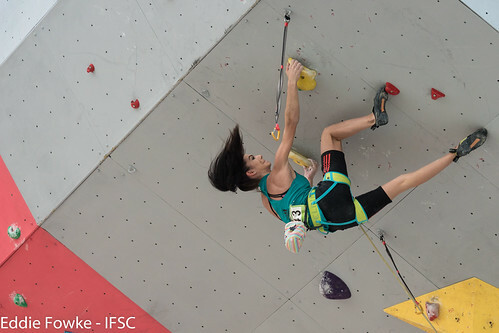 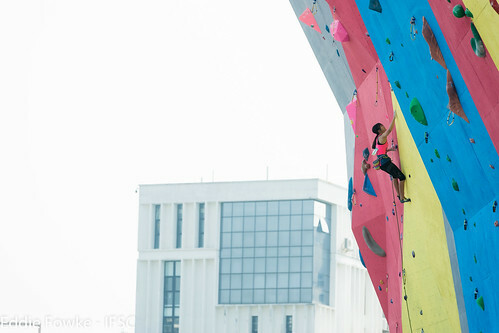 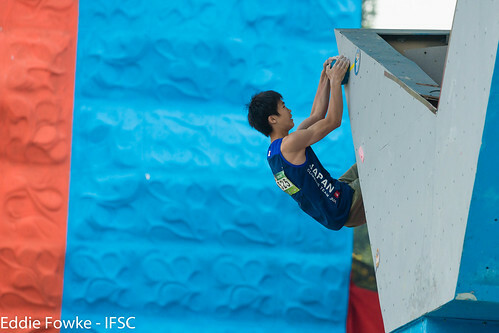 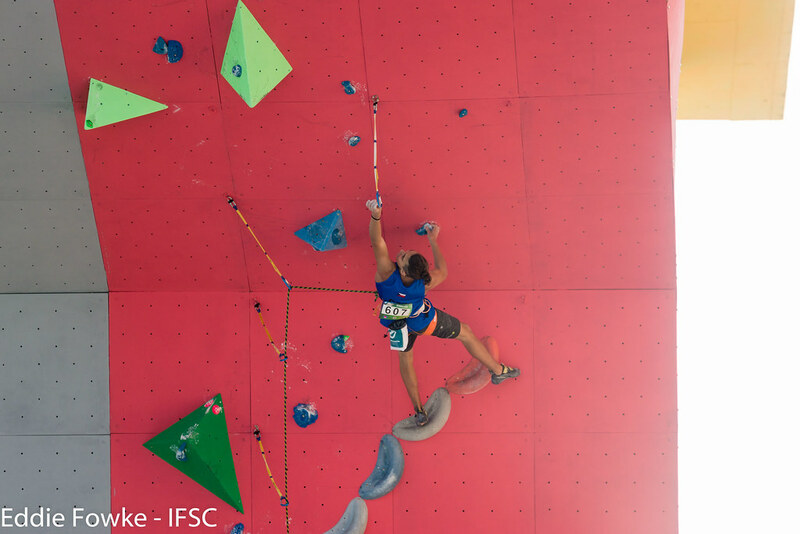 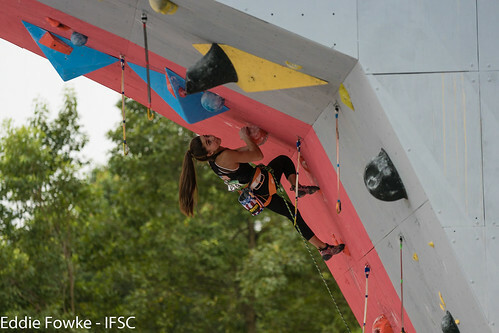 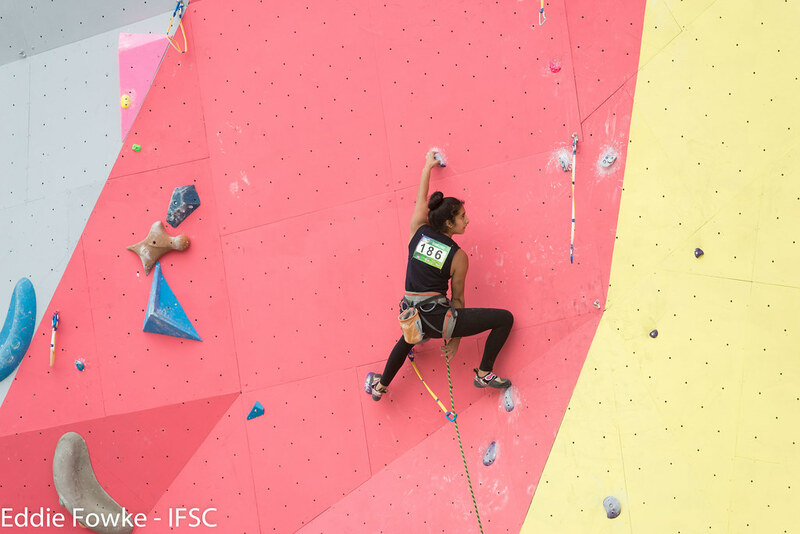 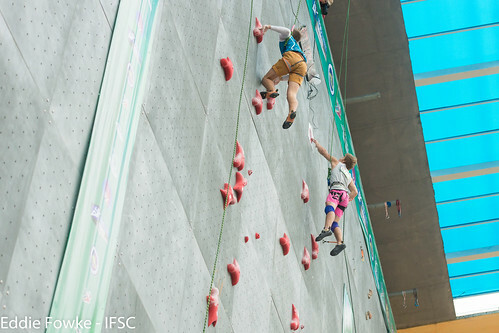 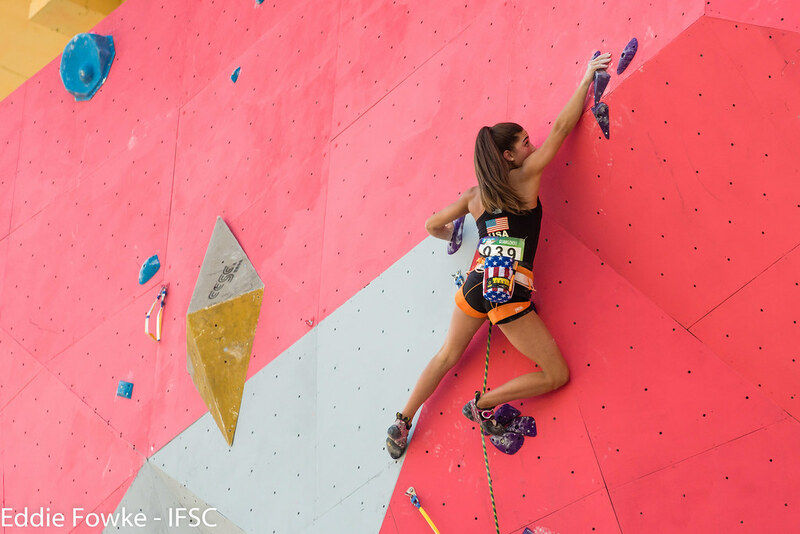 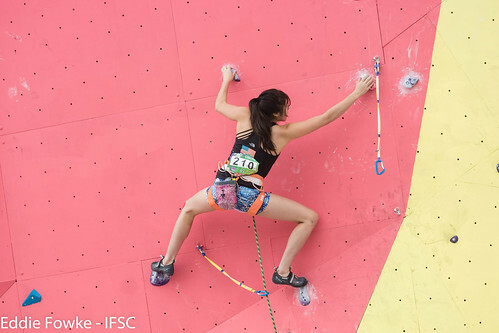 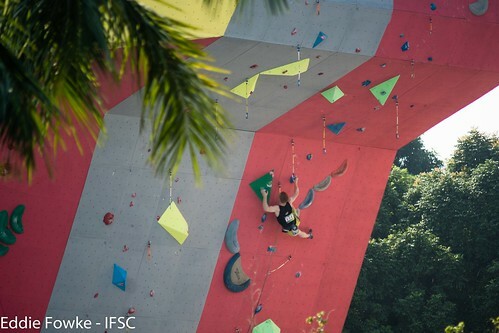 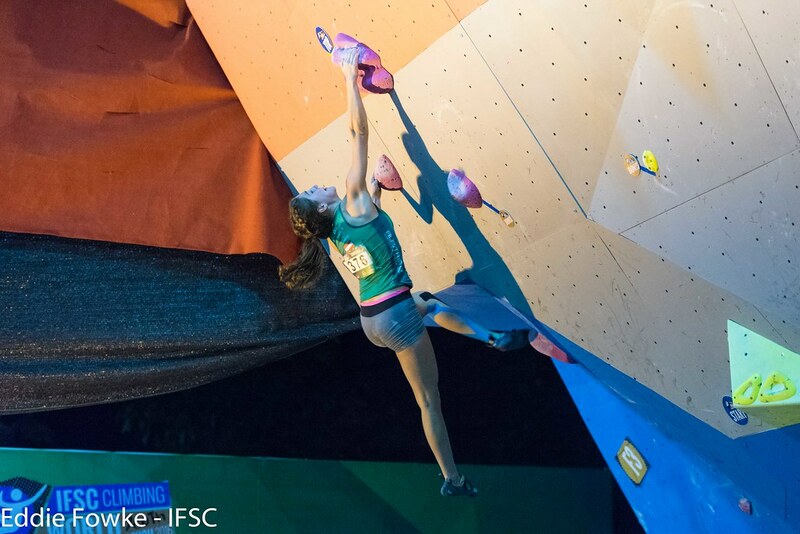 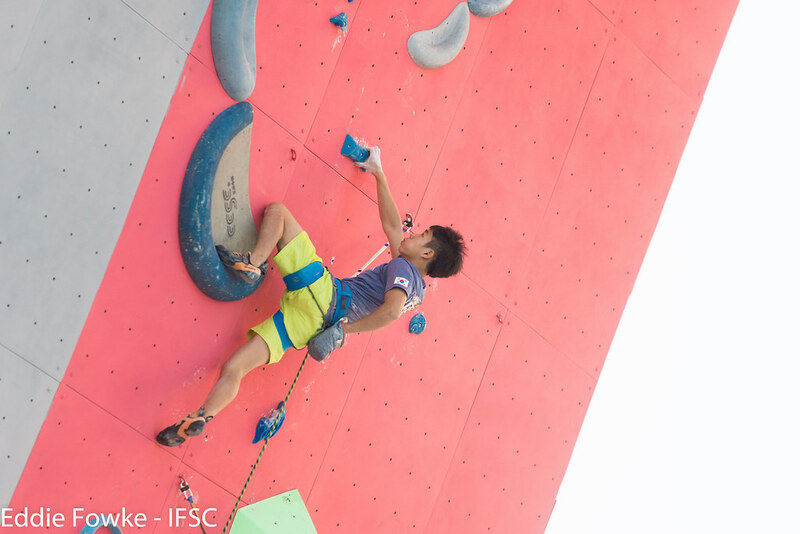 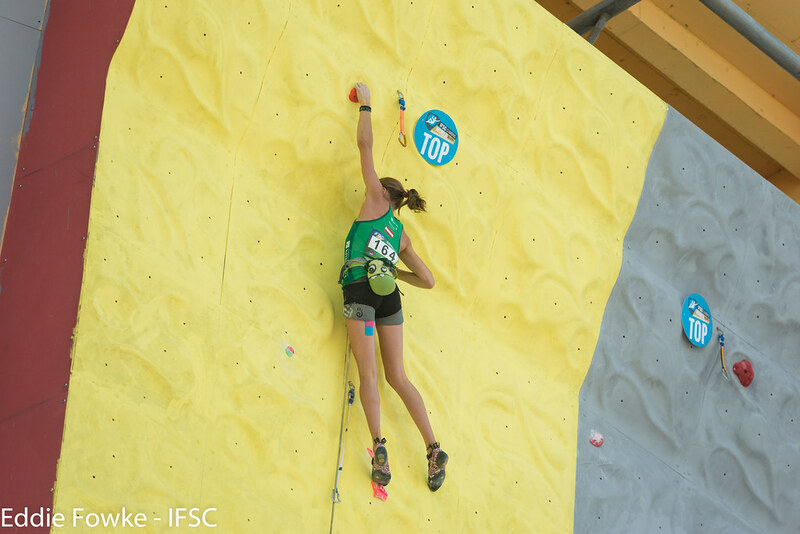 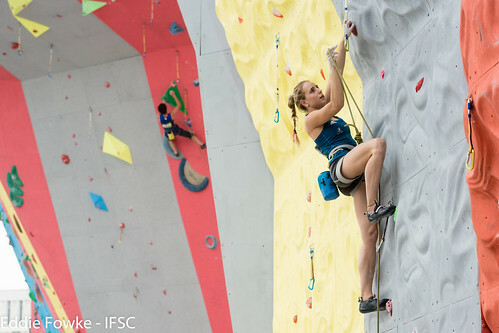 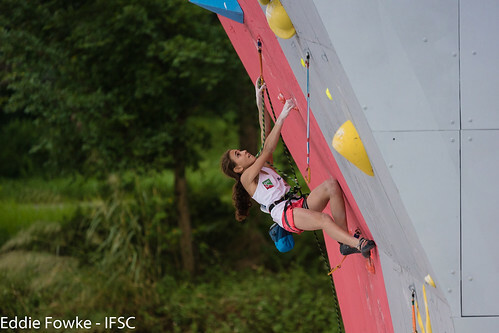 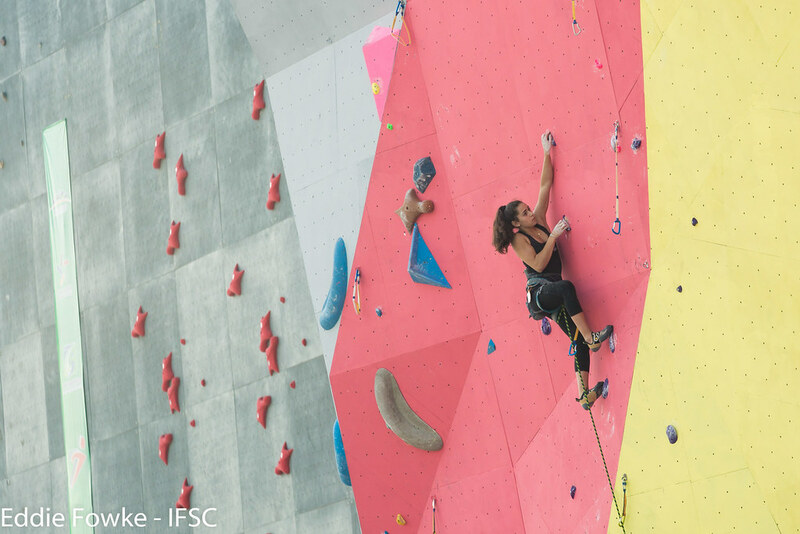 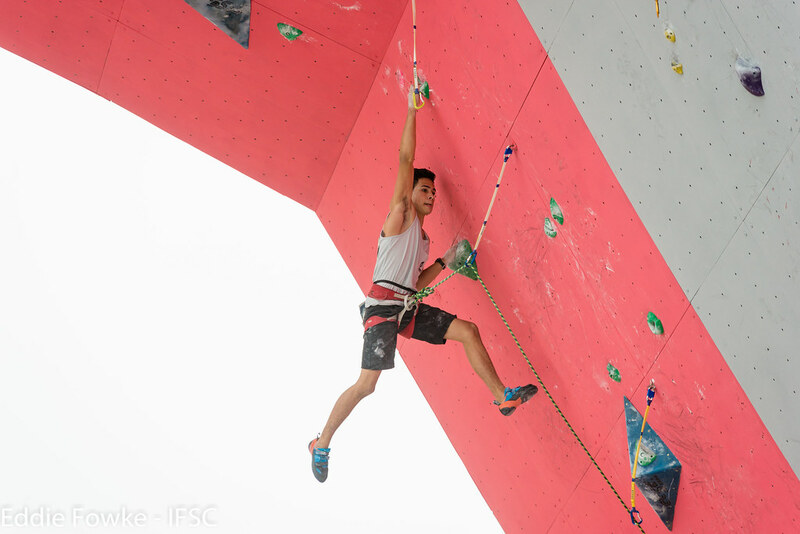 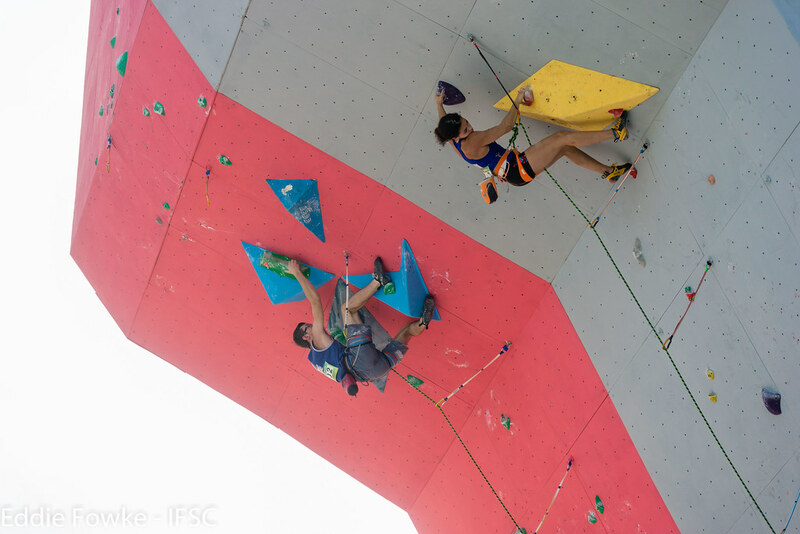 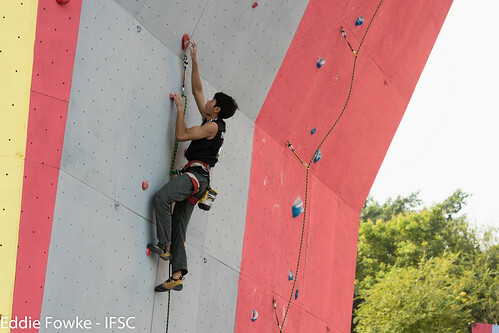 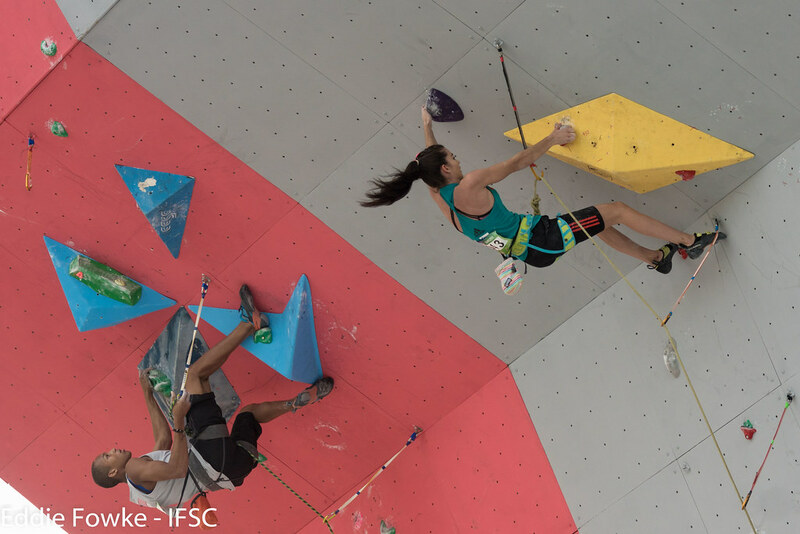 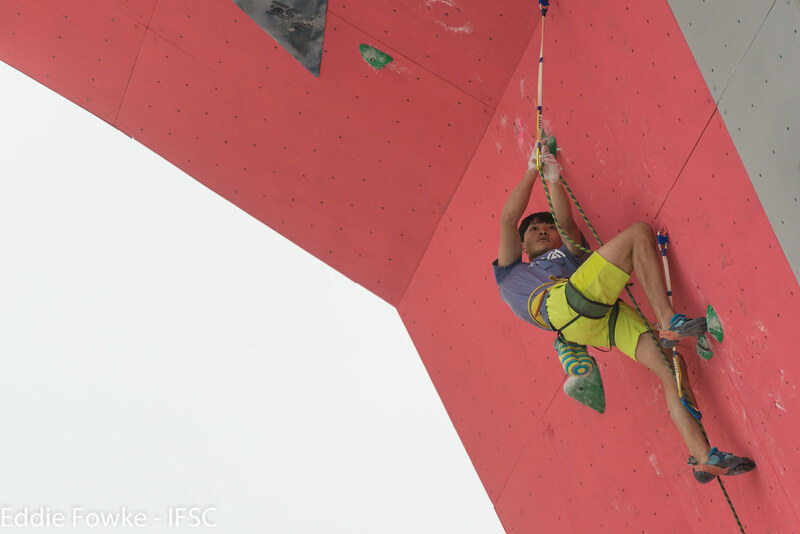 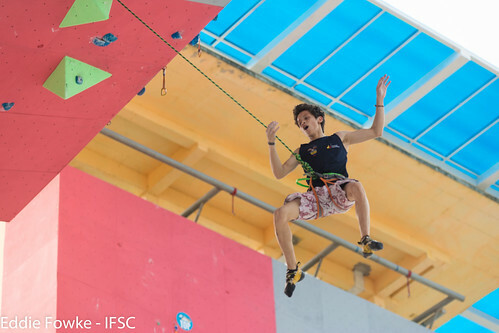 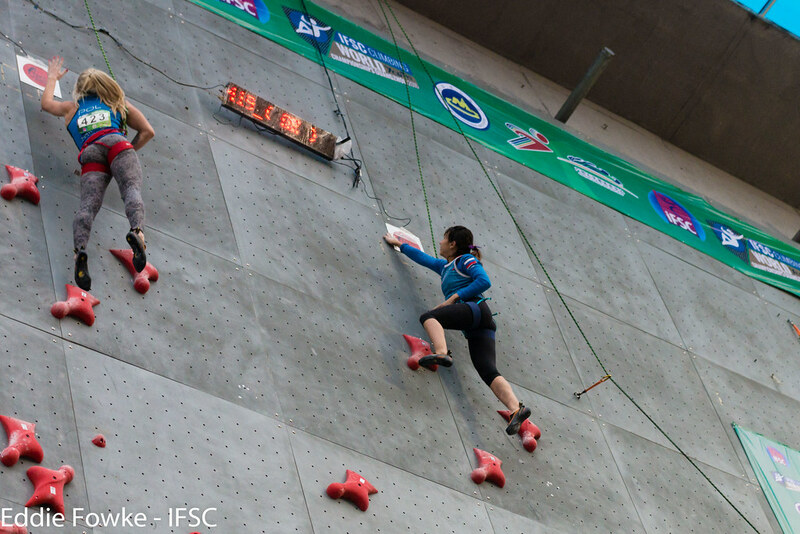 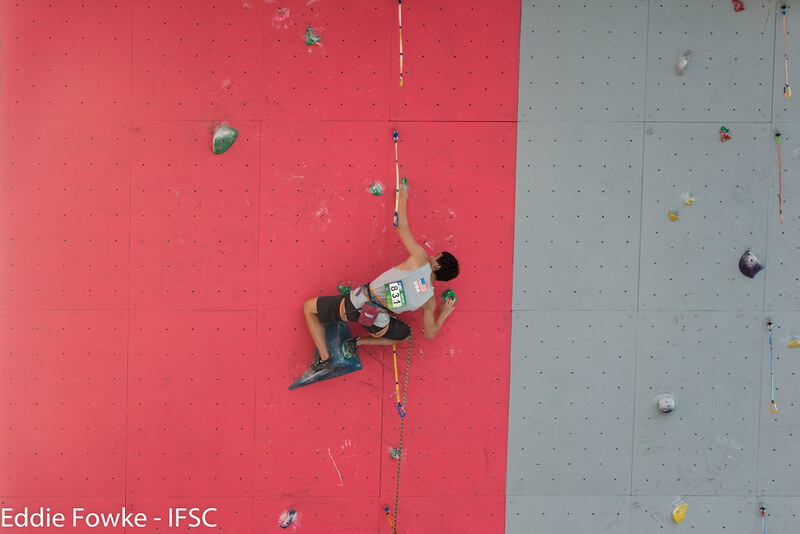 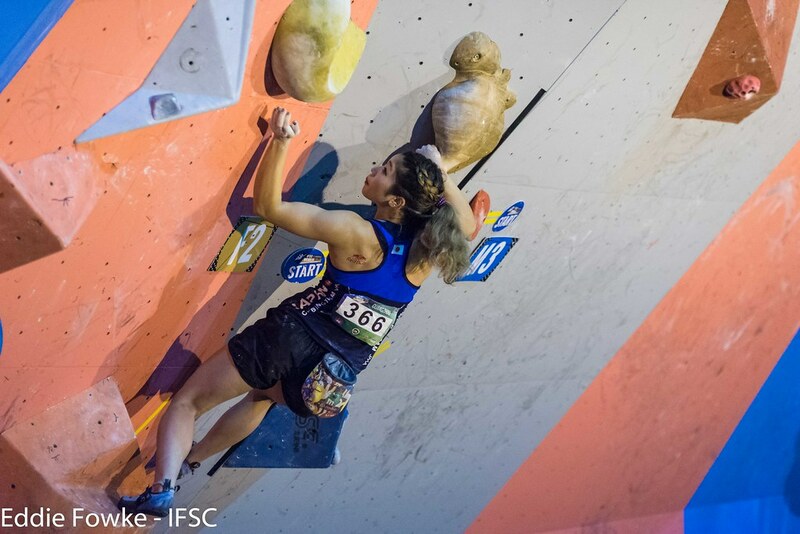 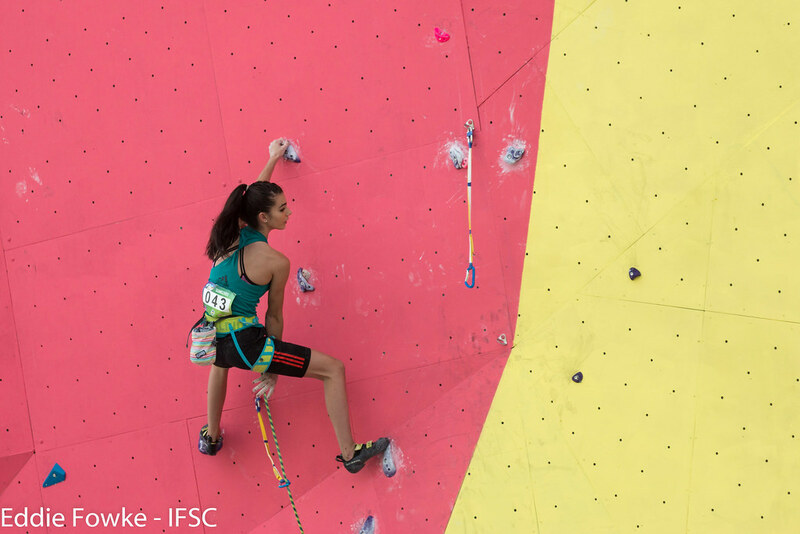 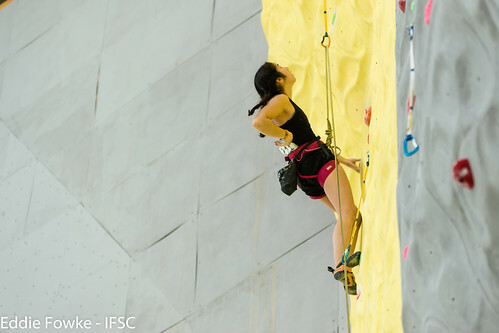 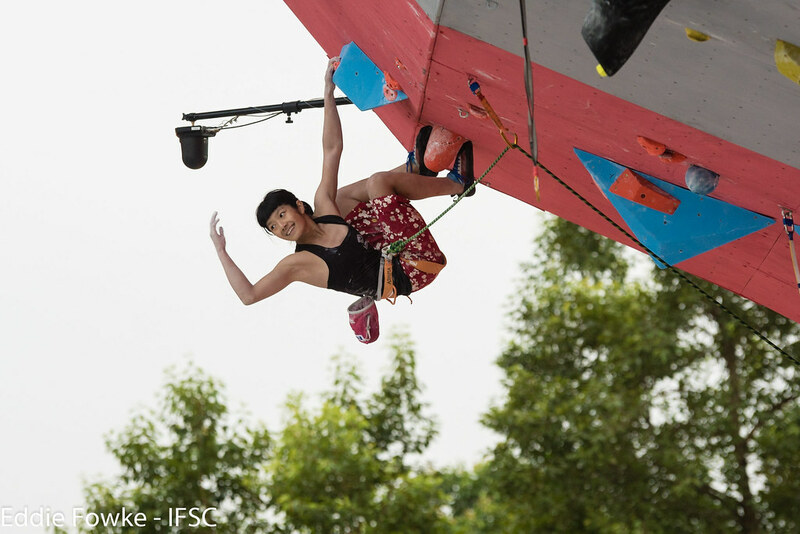 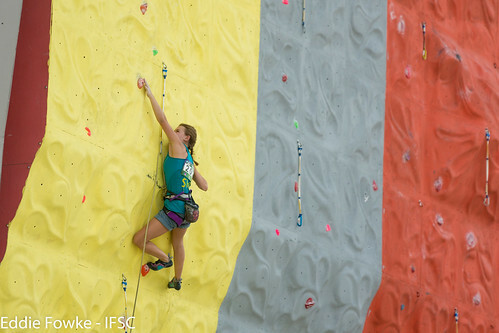 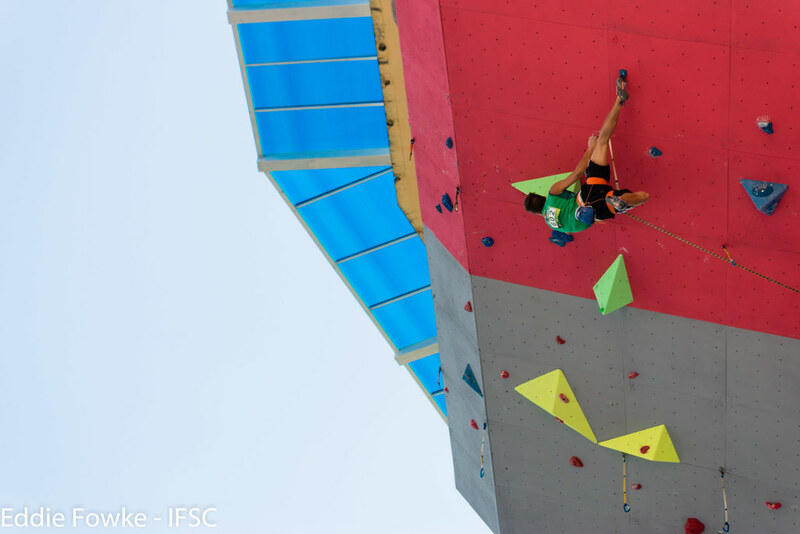 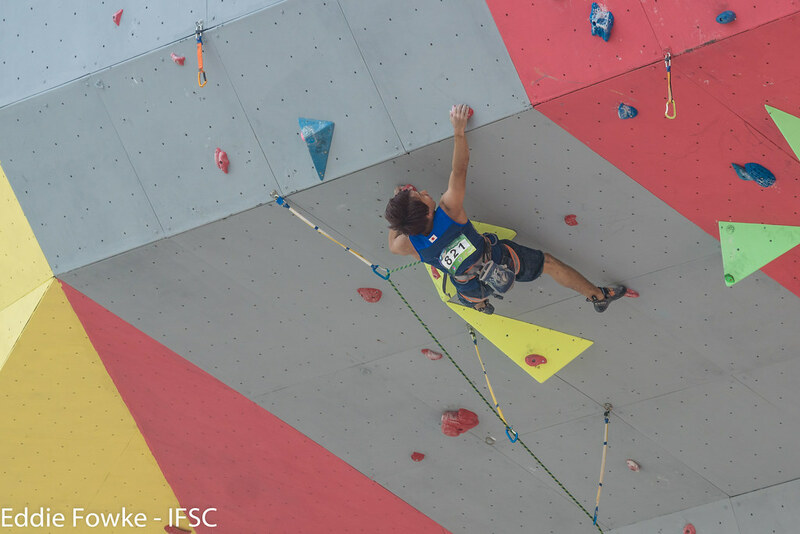 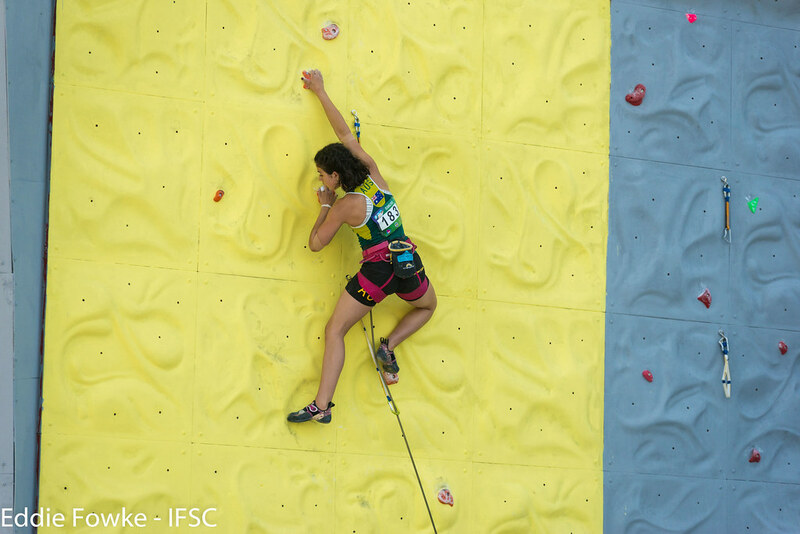 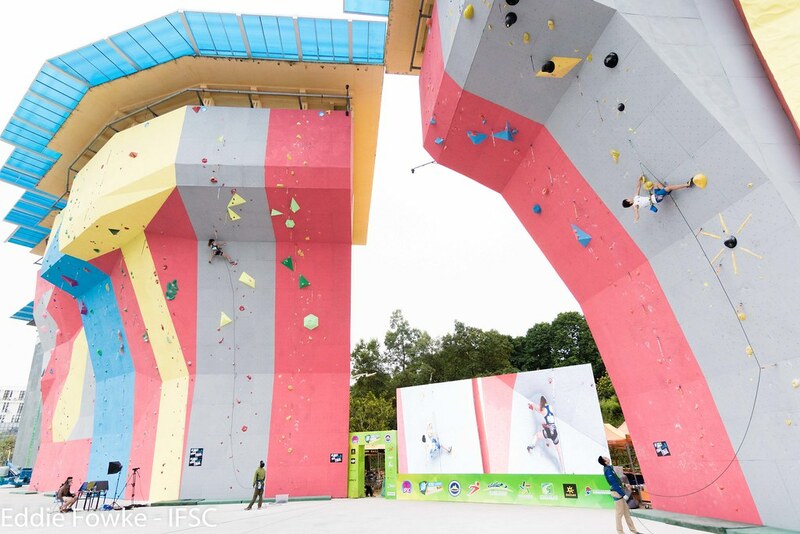 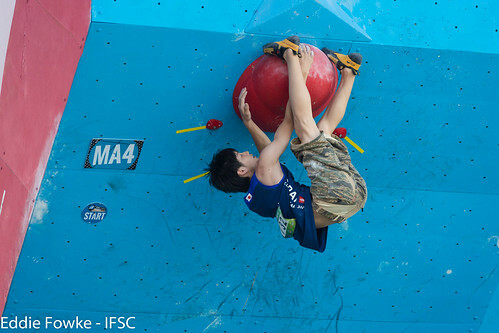 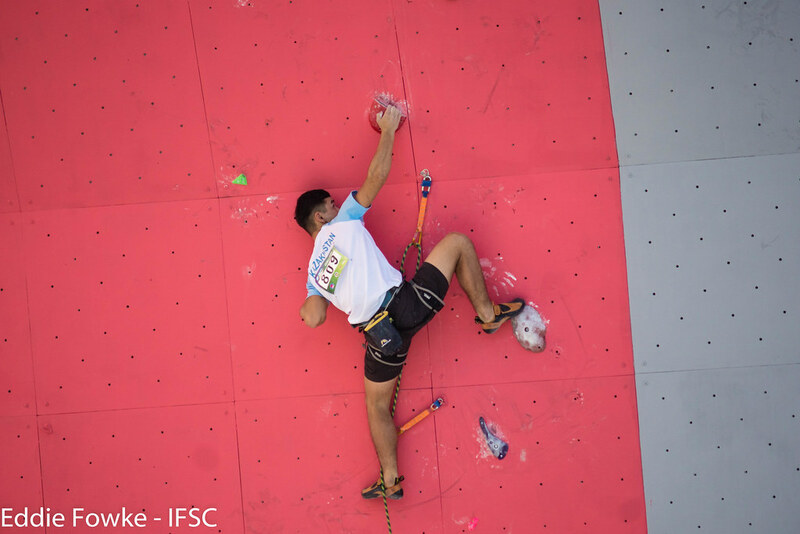 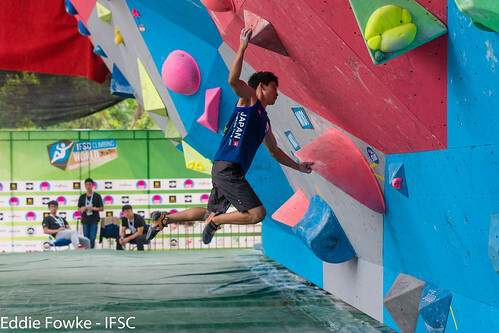 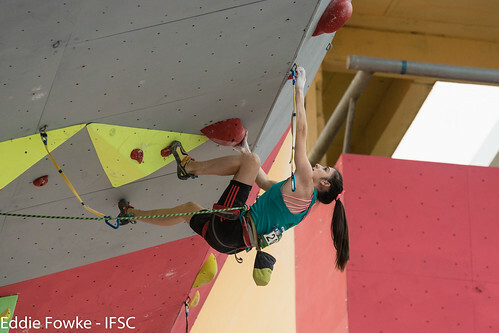 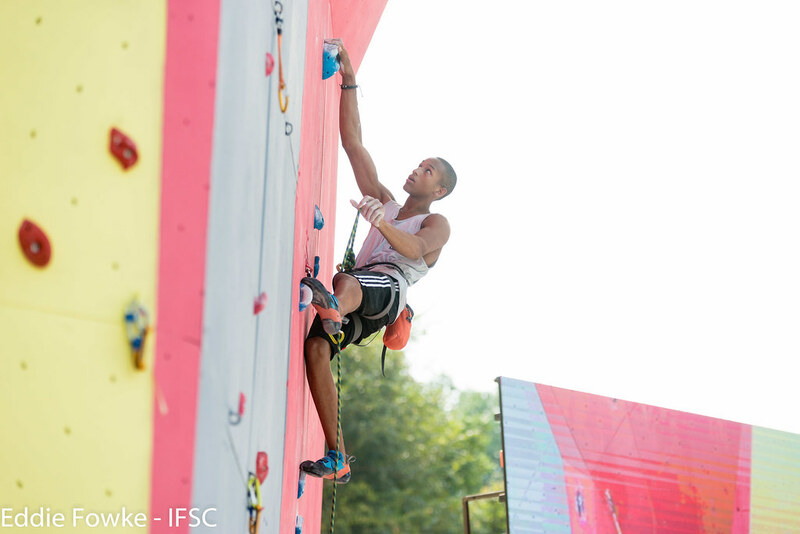 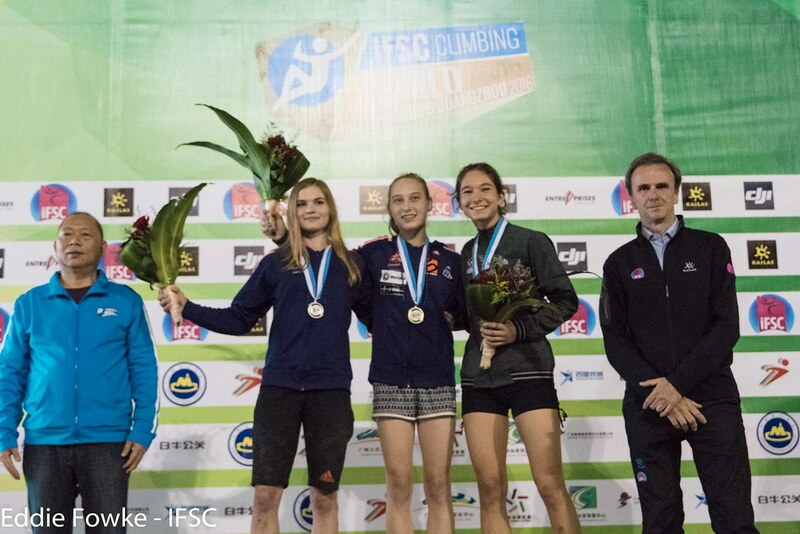 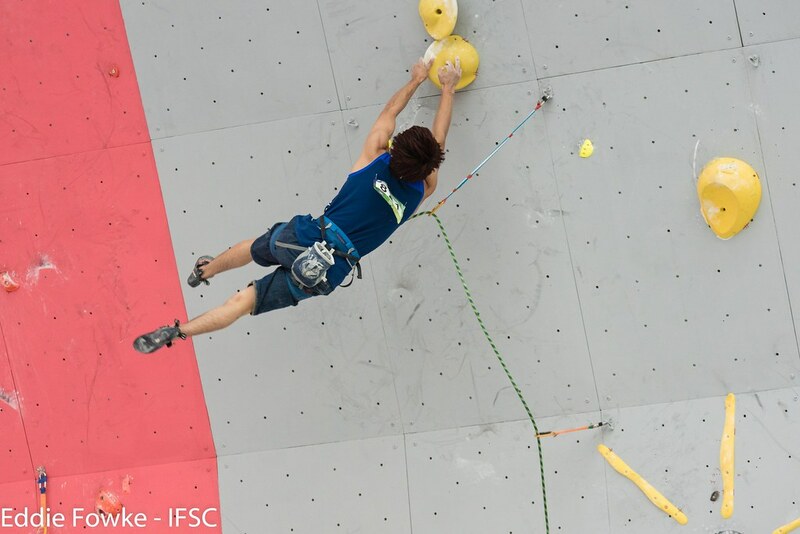 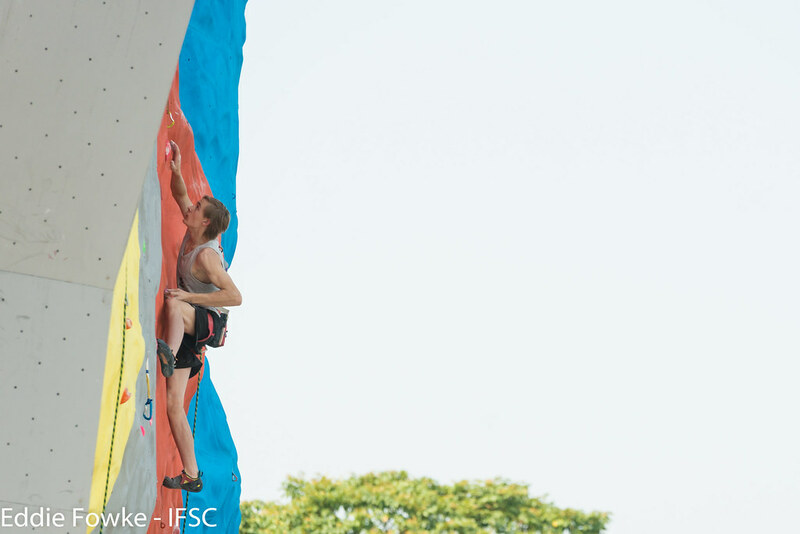 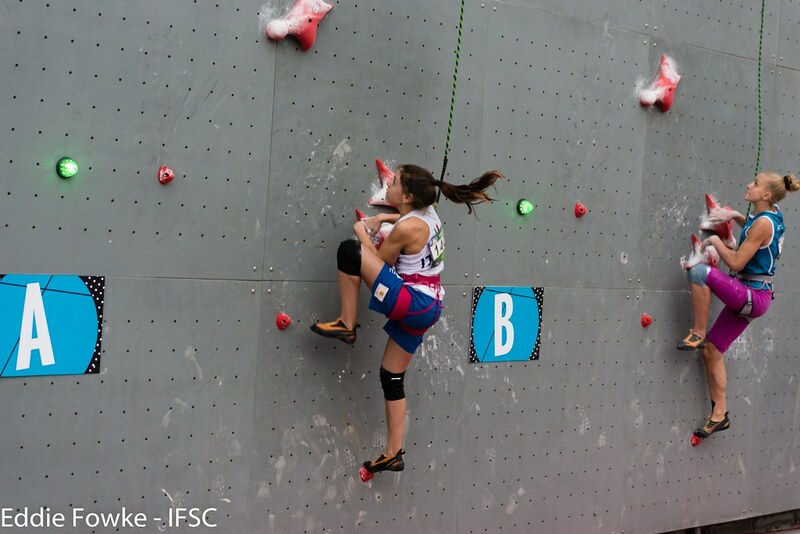 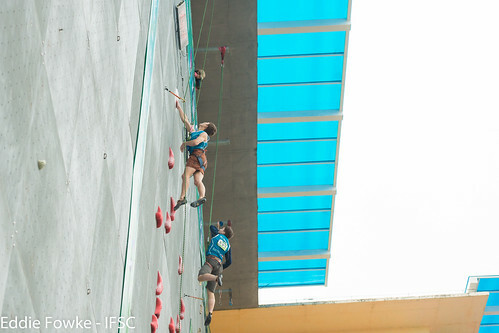 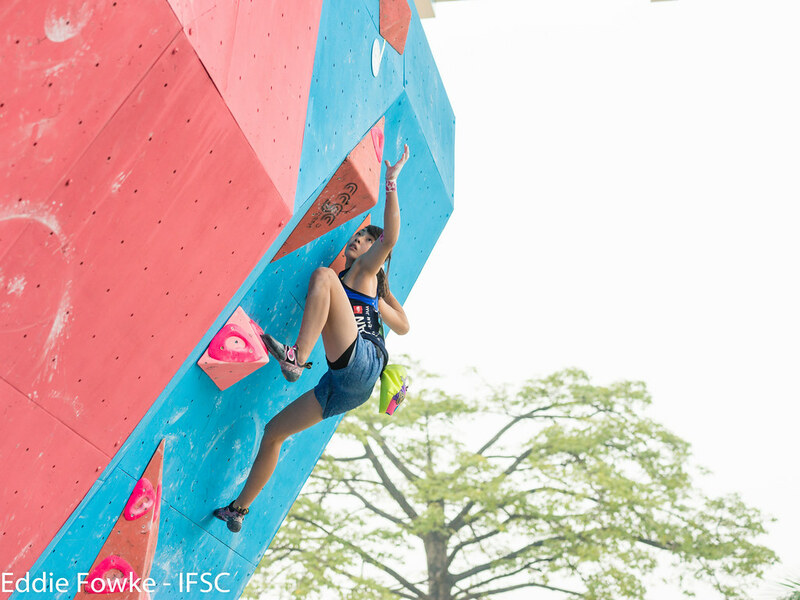 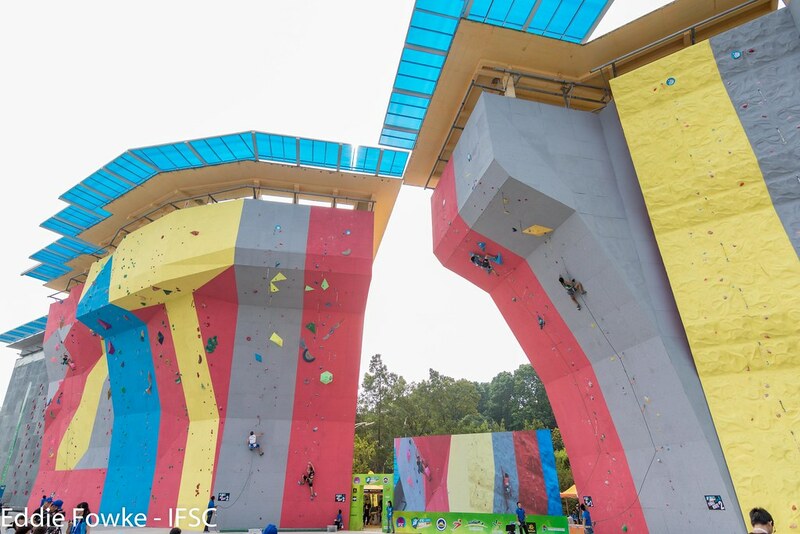 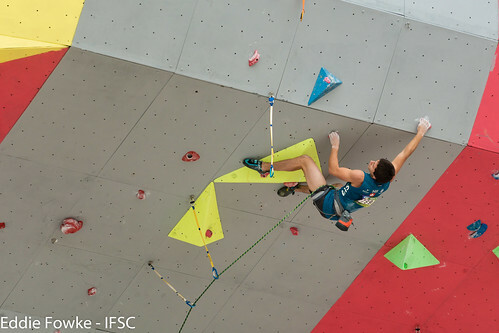 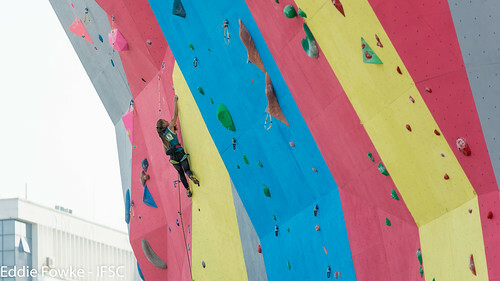 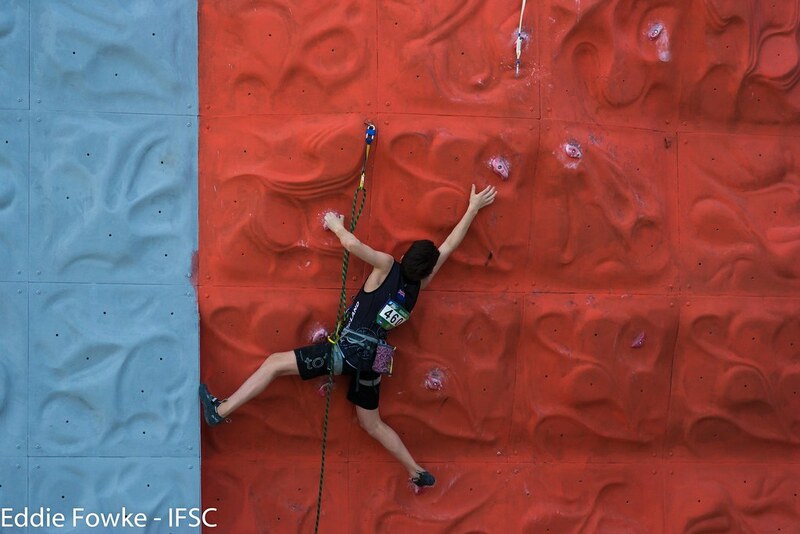 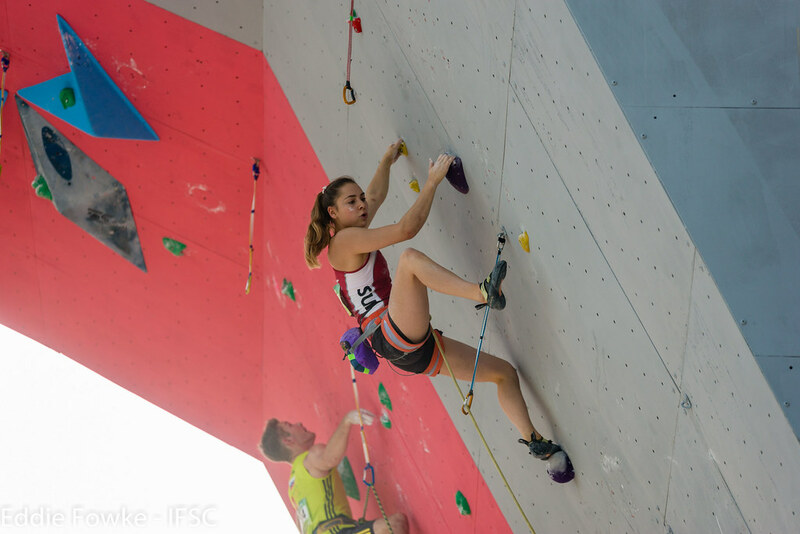 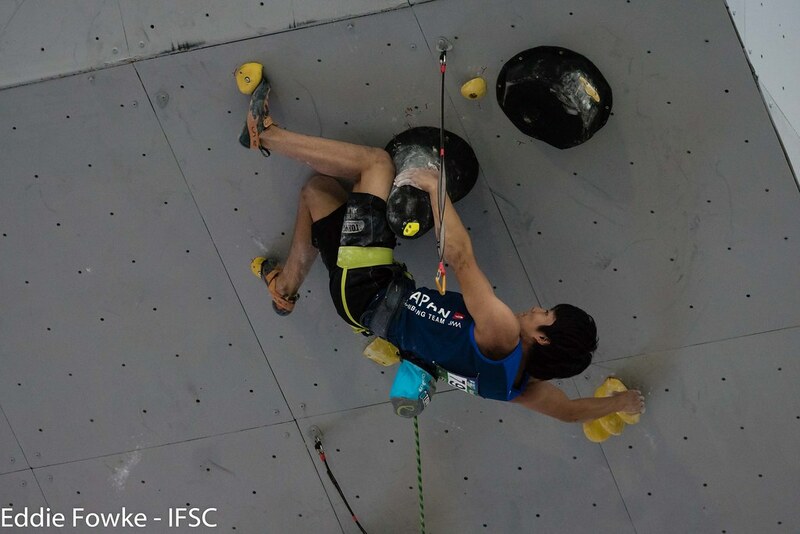 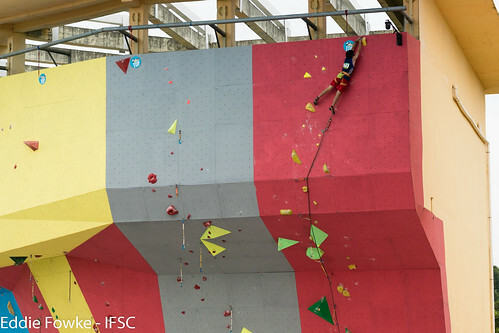 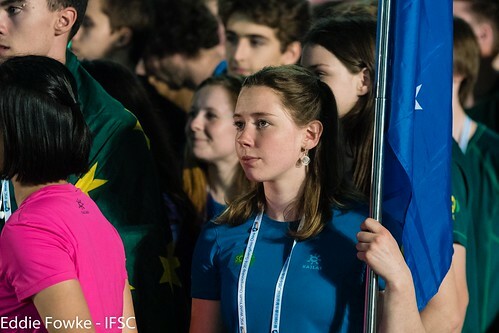 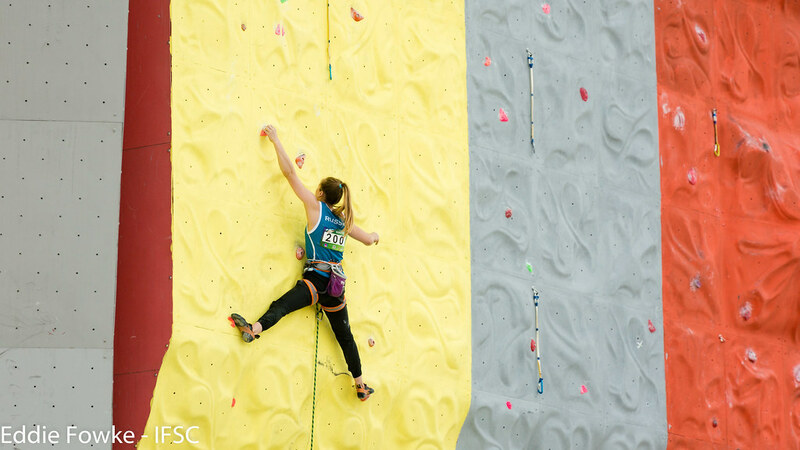 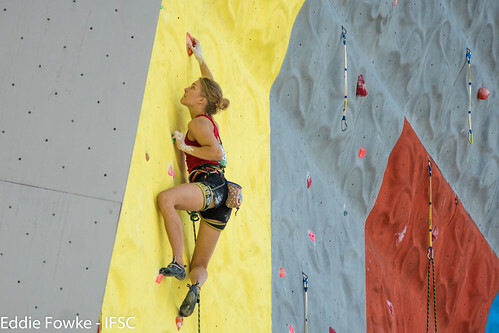 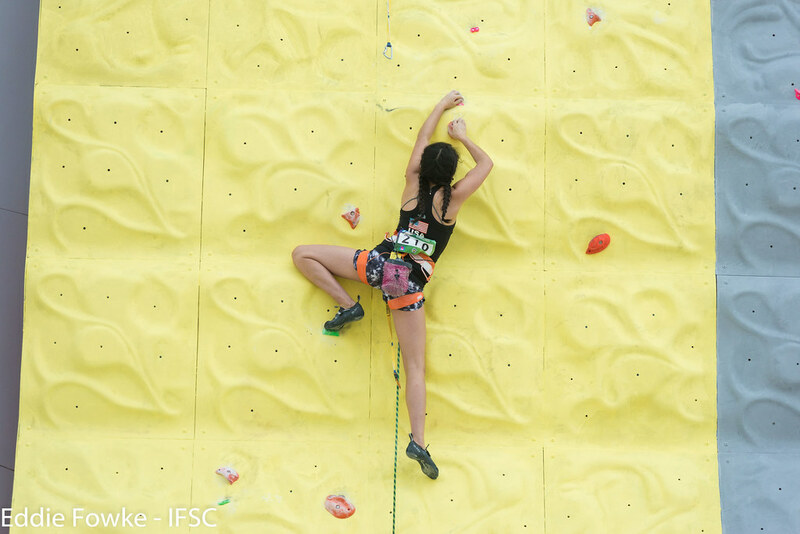 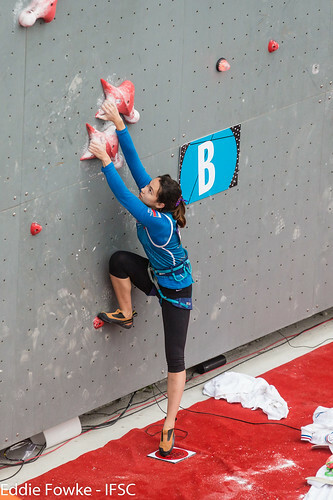 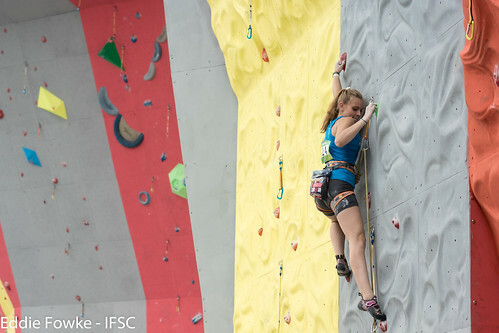 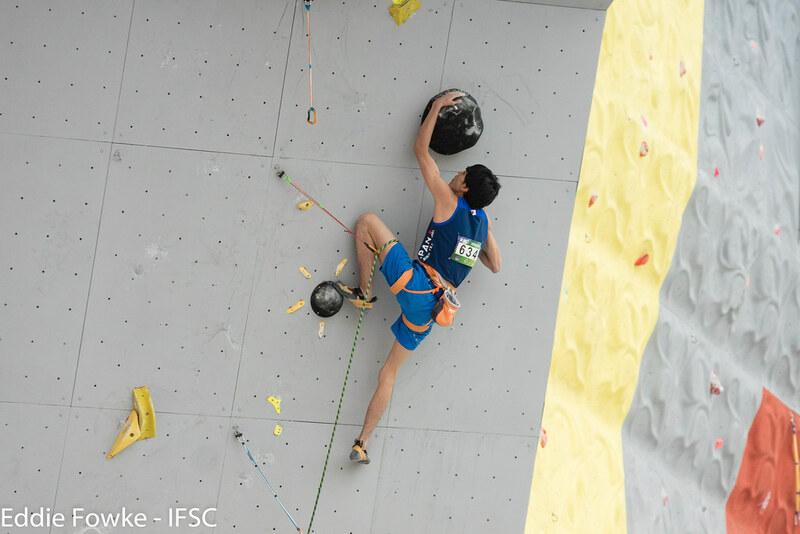 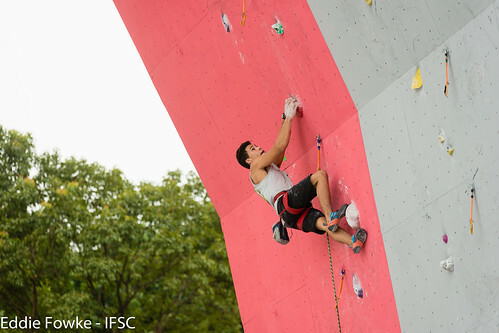 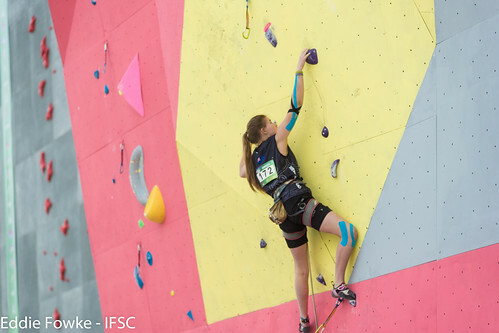 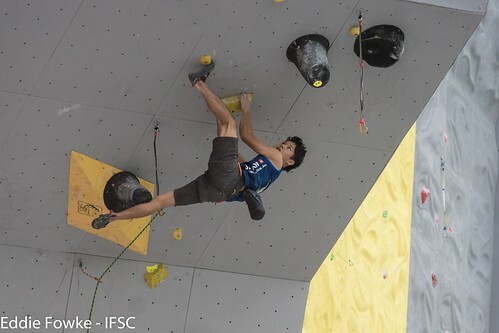 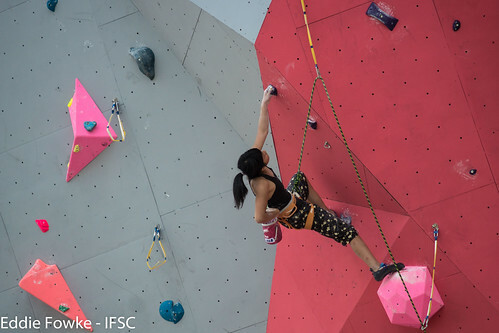 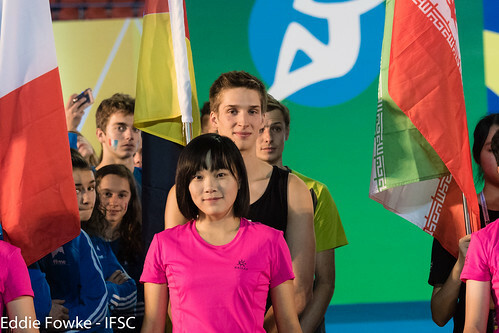 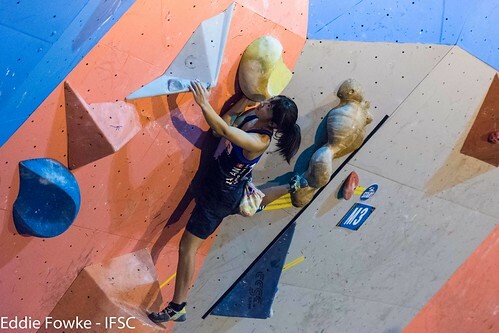 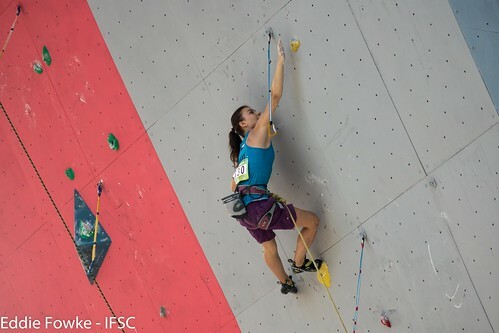 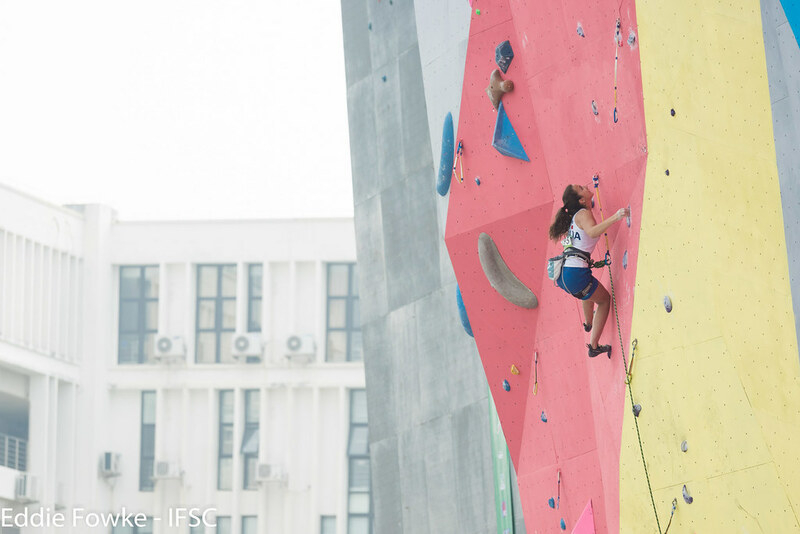 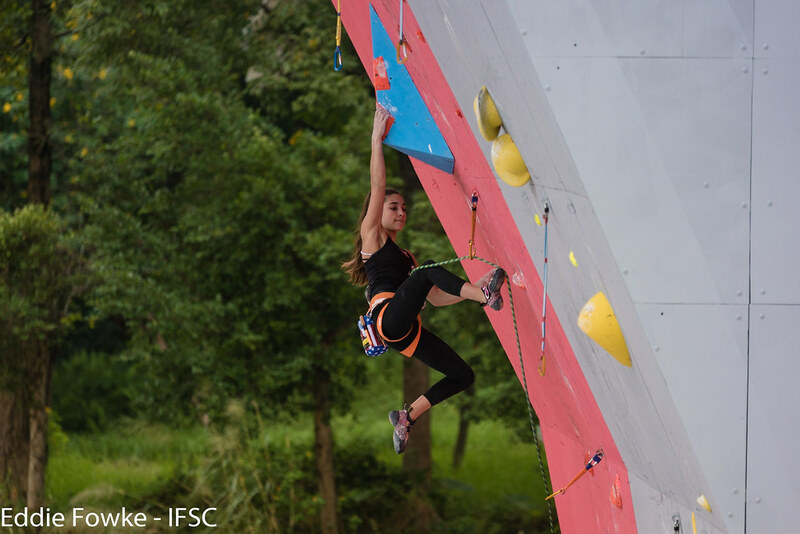 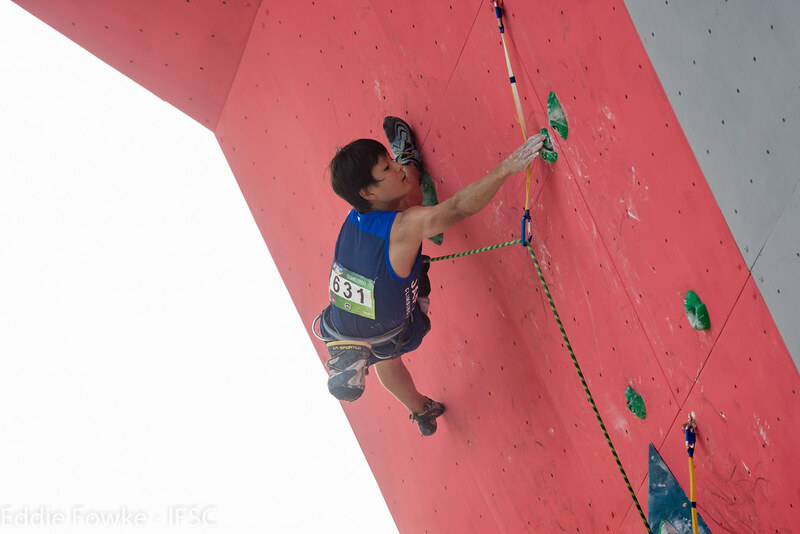 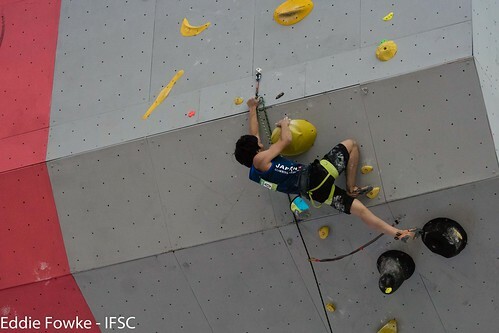 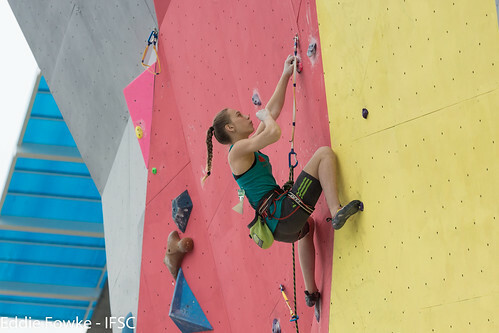 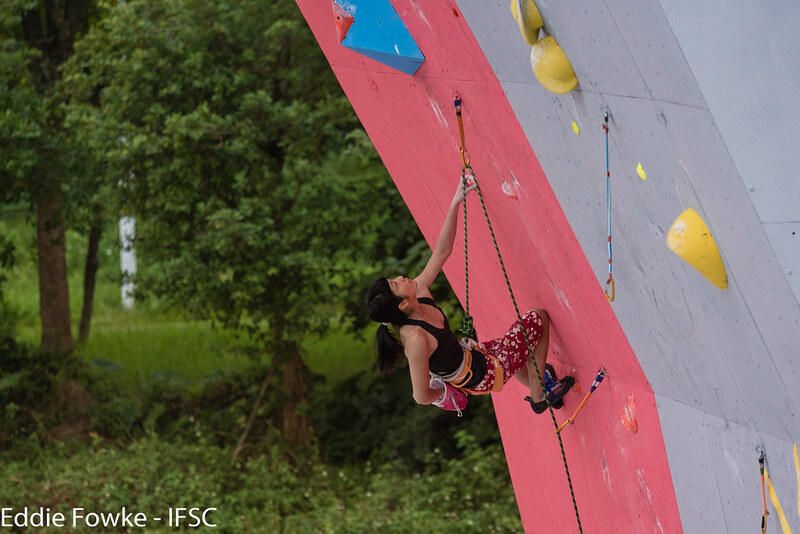 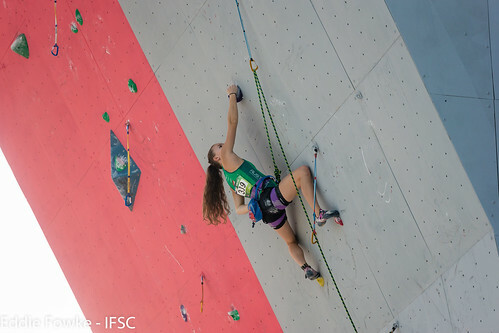 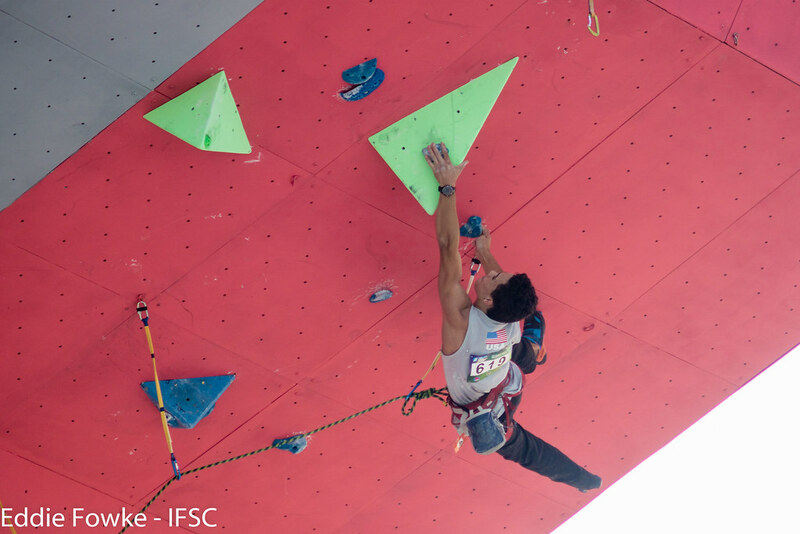 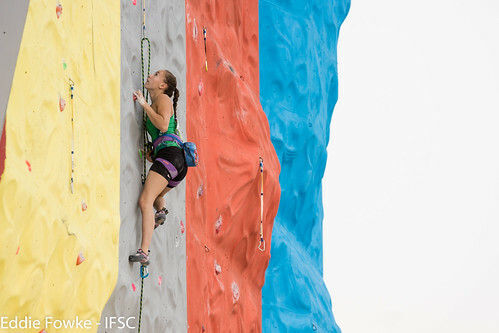 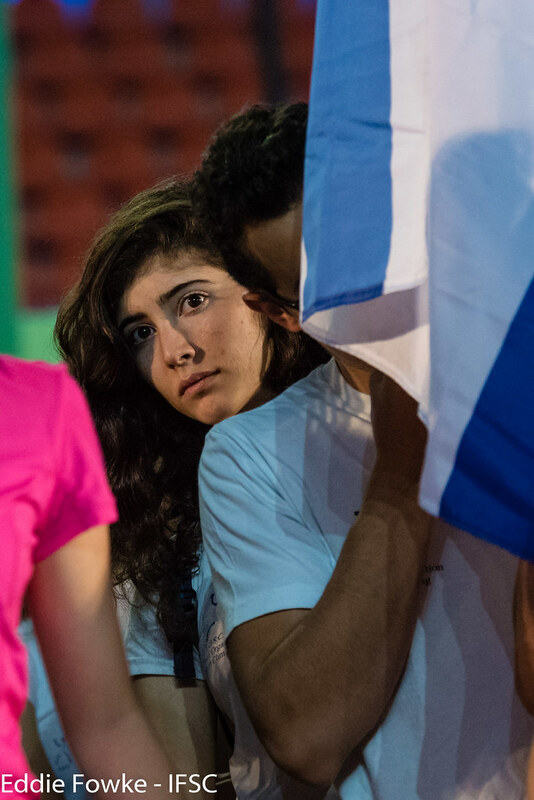 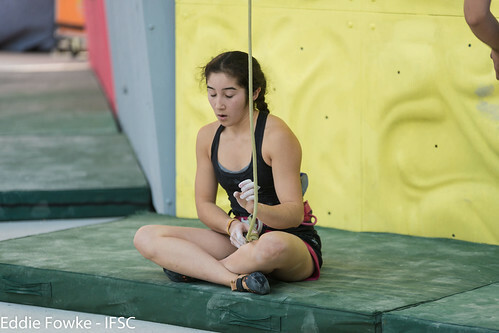 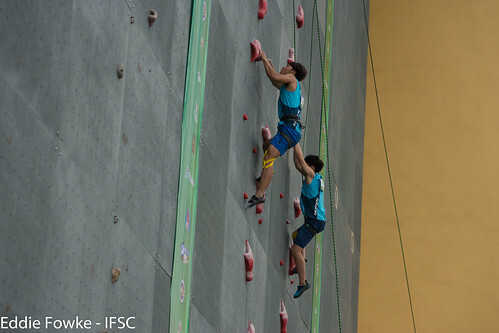 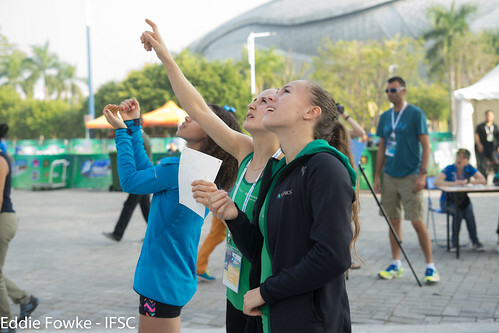 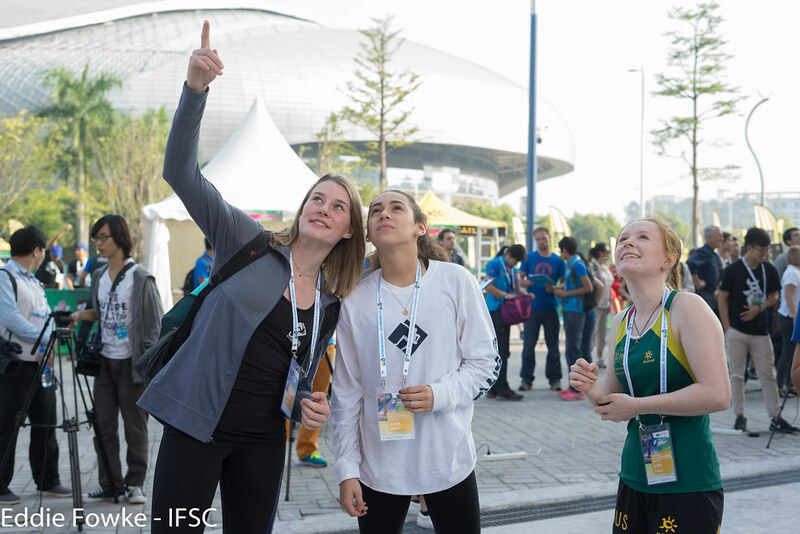 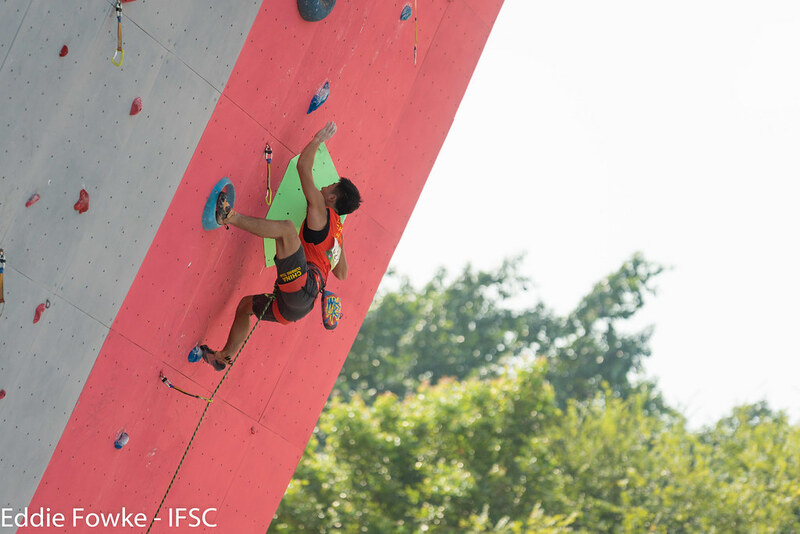 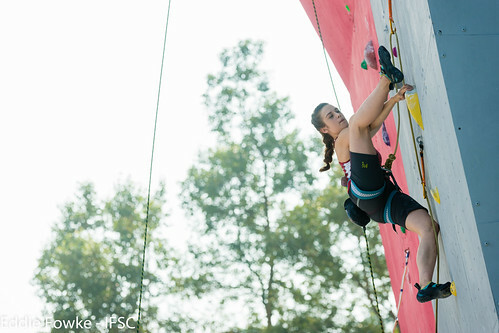 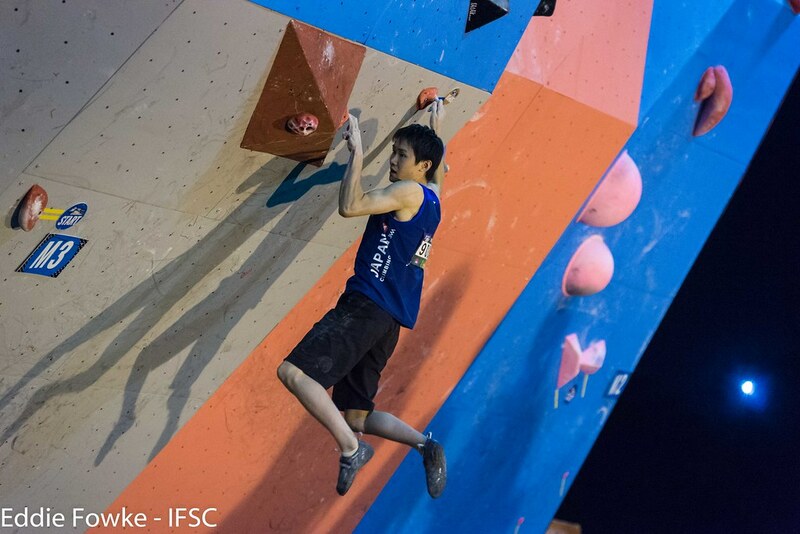 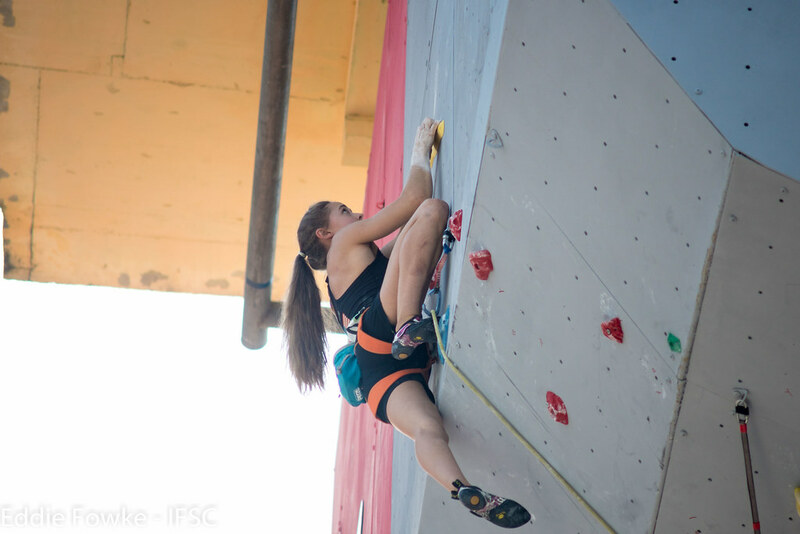 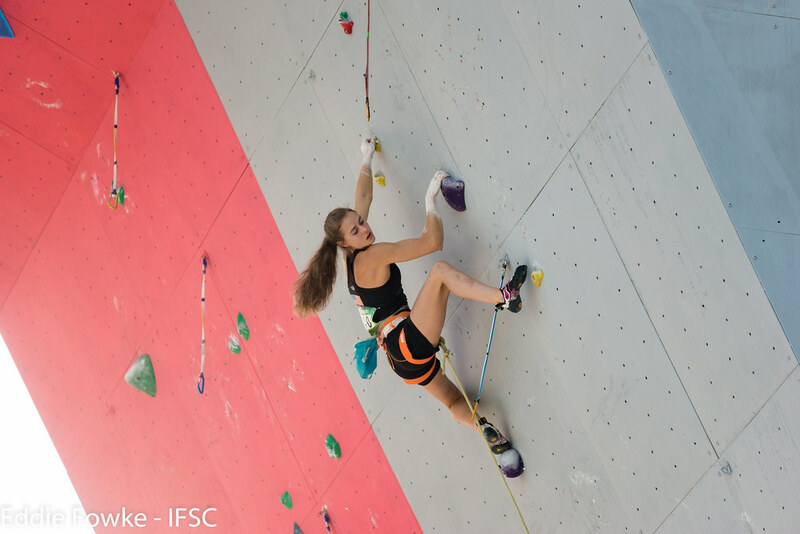 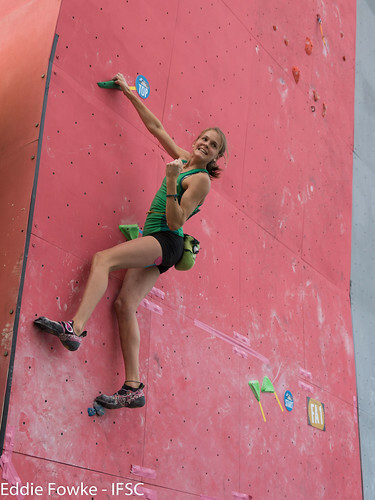 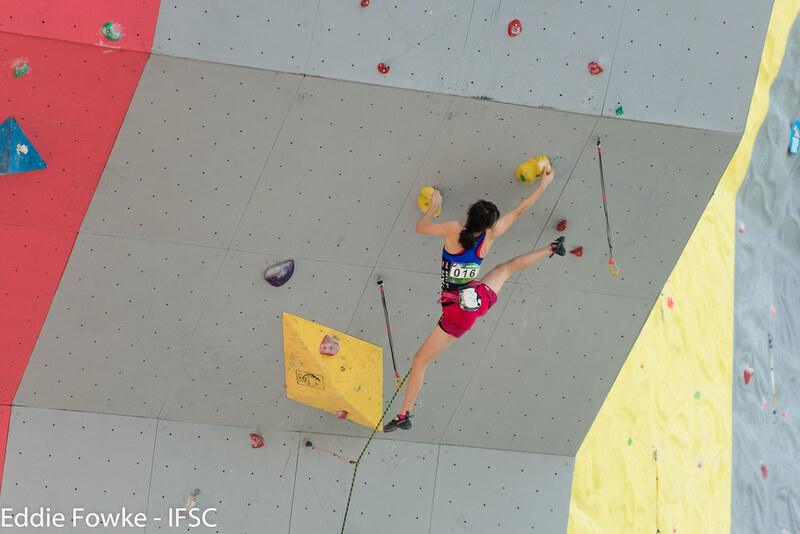 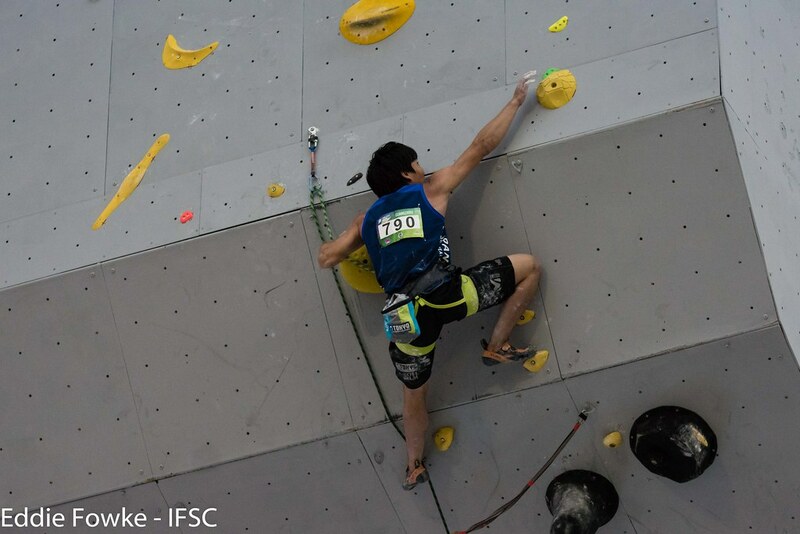 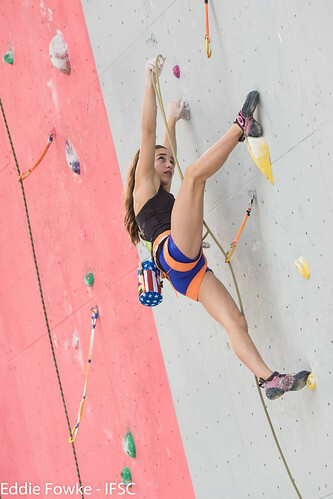 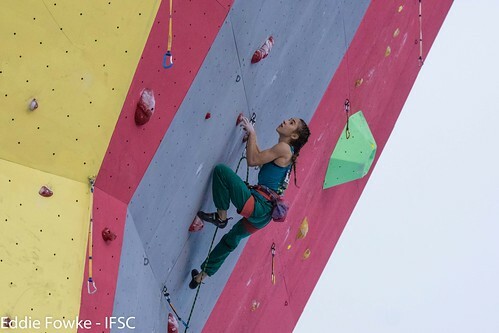 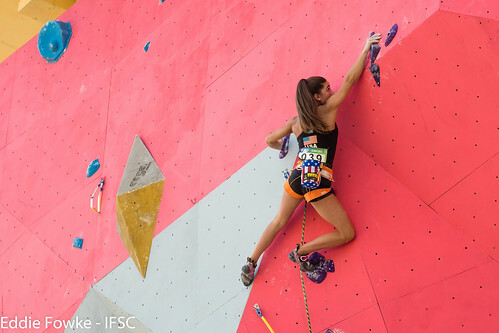 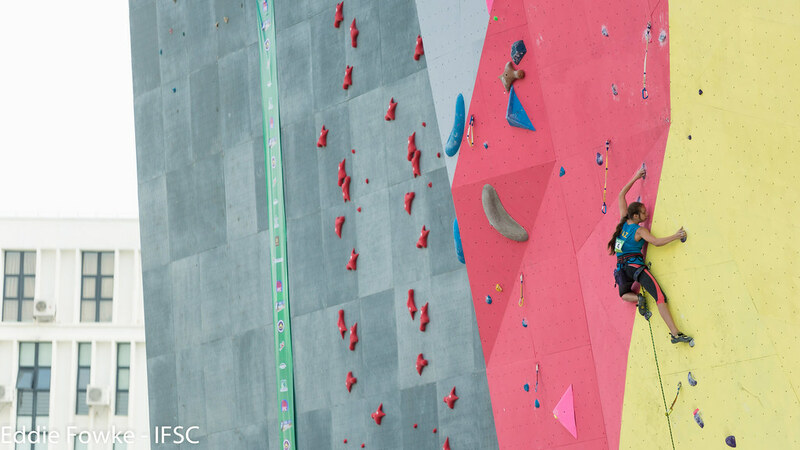 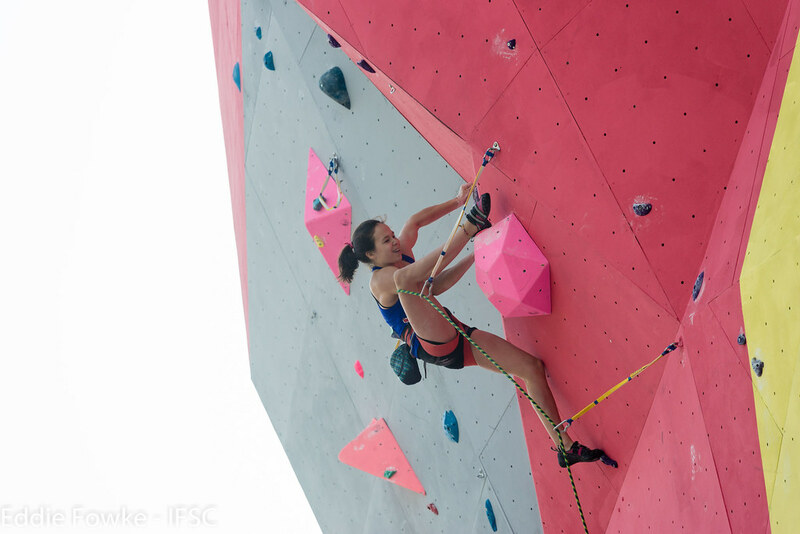 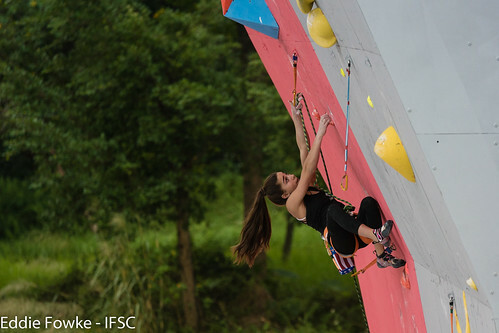 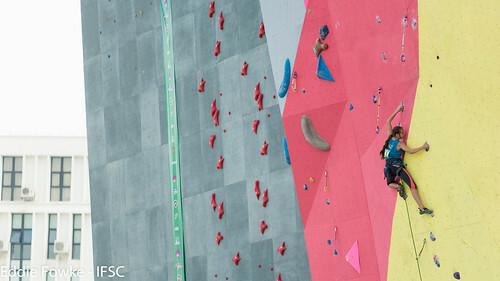 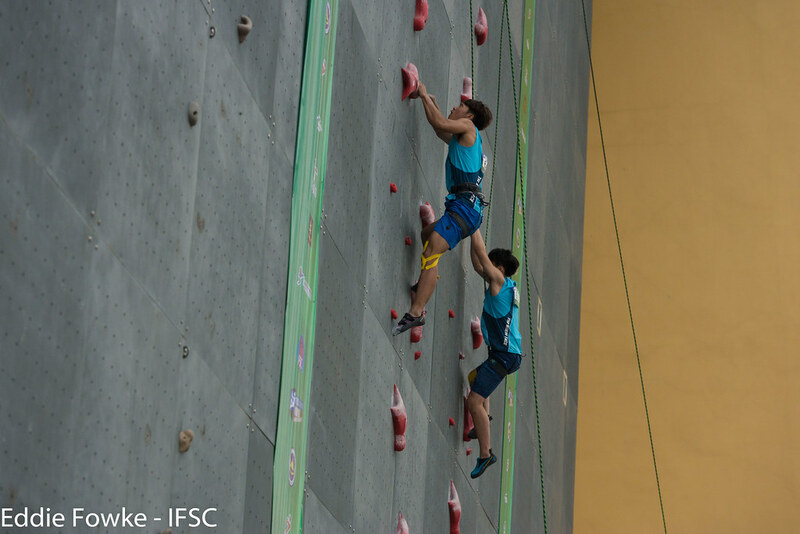 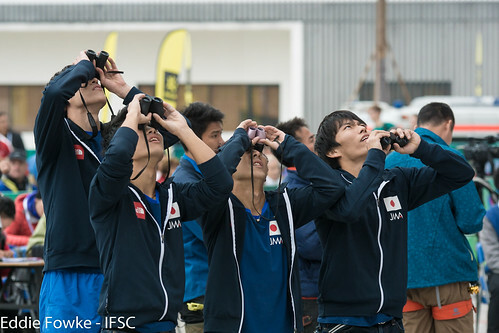 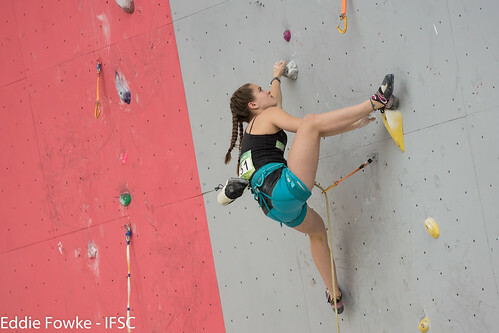 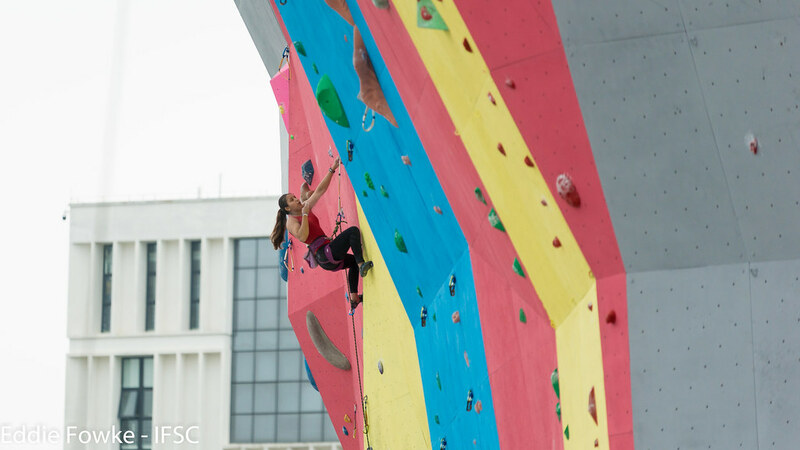 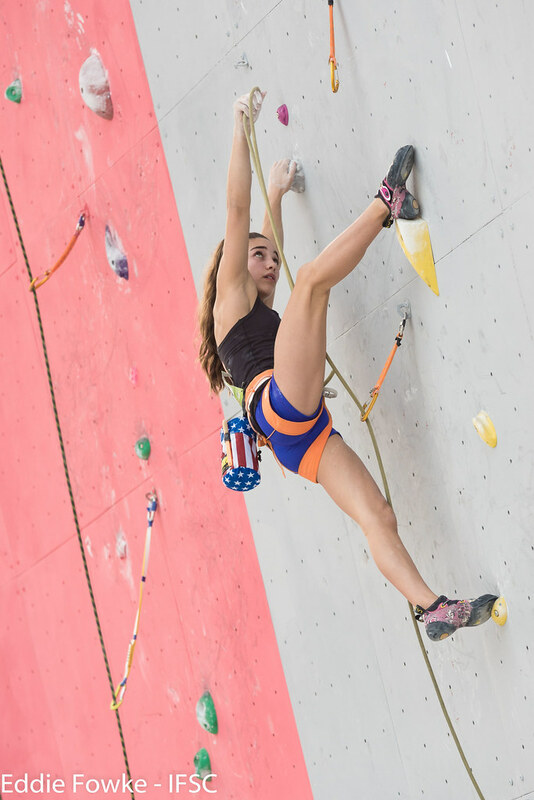 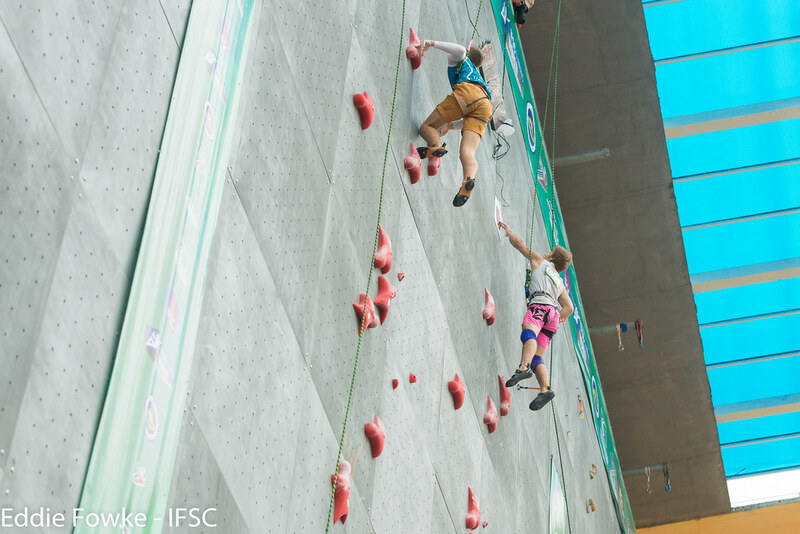 Reigning 2015 champion Ashima Shiraishi of the United States was the sole athlete to Top every route in Youth B, giving the fifteen-year-old phenom her second set of flowers in just two IFSC World Youth Championships. 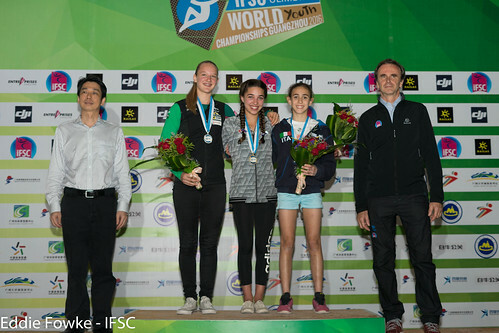 Fellow American Brooke Raboutou and Laura Rogora of Italy joined her on the podium. The Slovenians dominated Youth A, claiming every medal. 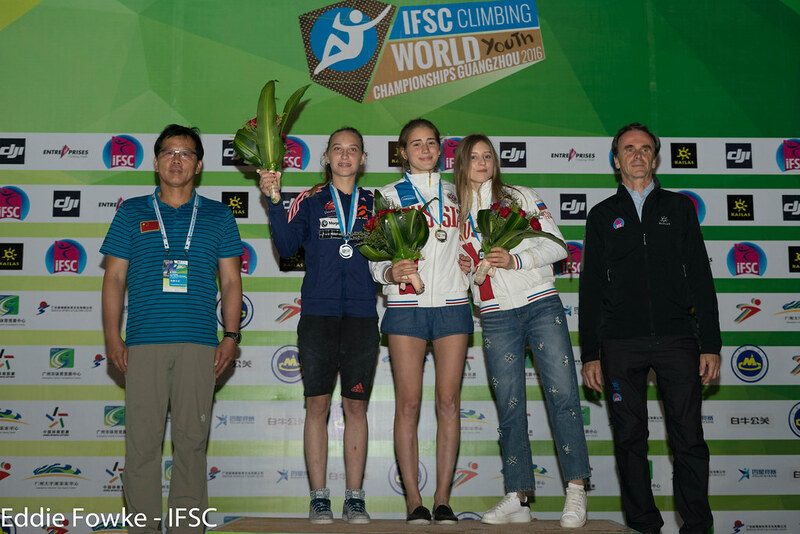 Janja Garnbret earned her third major title of the season, and she can now officially be called Overall champion, world champion and world youth champion of Lead! 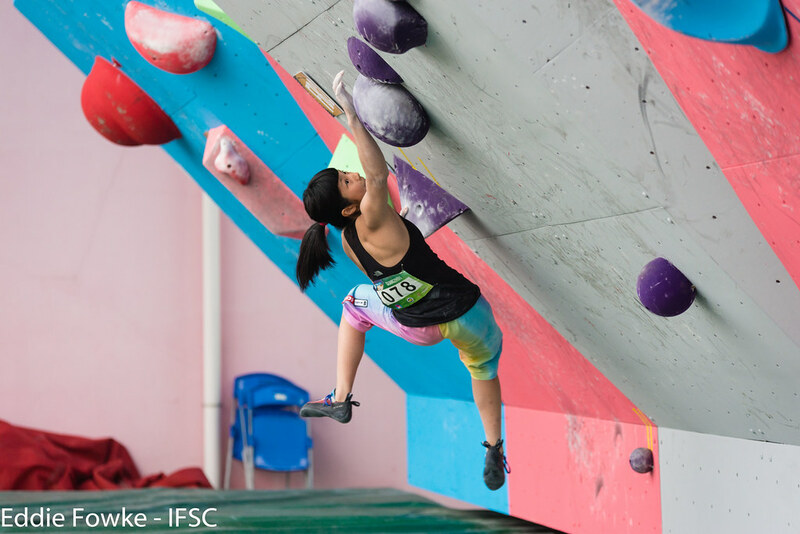 After barely qualifying for Finals, Mia Krampl showed her strength in the last round, and Vita Lukan fell only a handful of moves sooner. 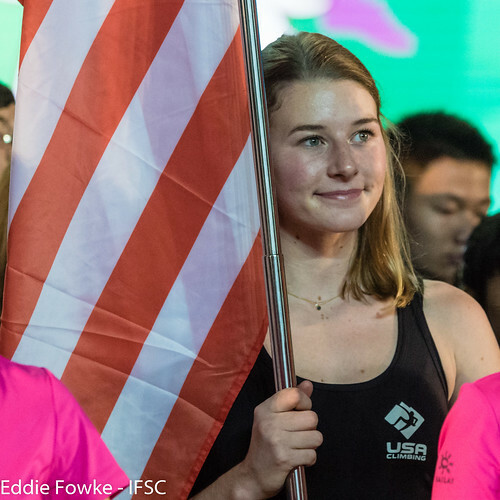 Margo Hayes of the United States made the most of her graduation to Juniors, upgrading her second place finish last year to Gold. Hannah Schubert was also impressive throughout the week and missed out on hearing her national anthem only after a countback to Semi-Finals. Aika Tajima of Japan edged Kajsa Rosen of Sweden for Bronze. For the Males, Sam Avezou followed up his category-leading performance in Qualifications with back-to-back Tops in Semi-Finals and Finals, exactly what he needed after Katsura Konishi and Hidemasa Nishida of Japan did the same. 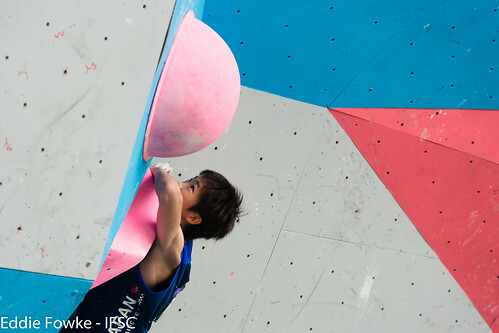 Like Shiraishi, Avezou won his second Gold in two years at just fifteen years old. 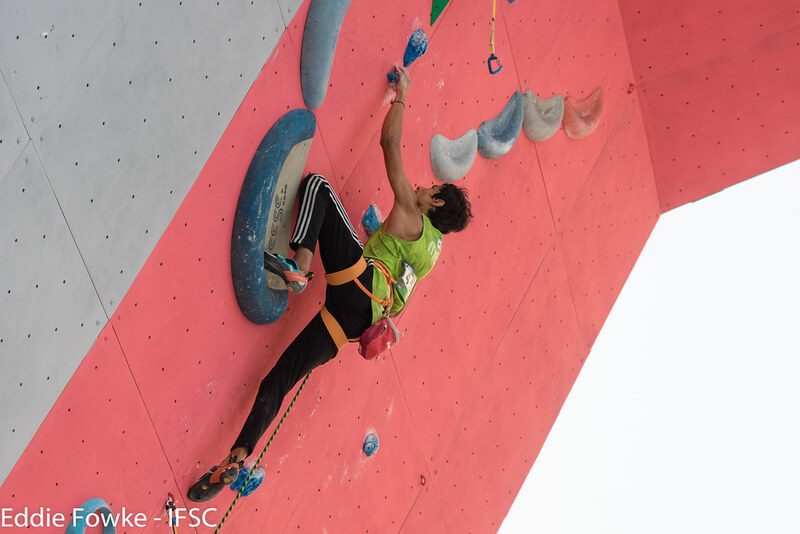 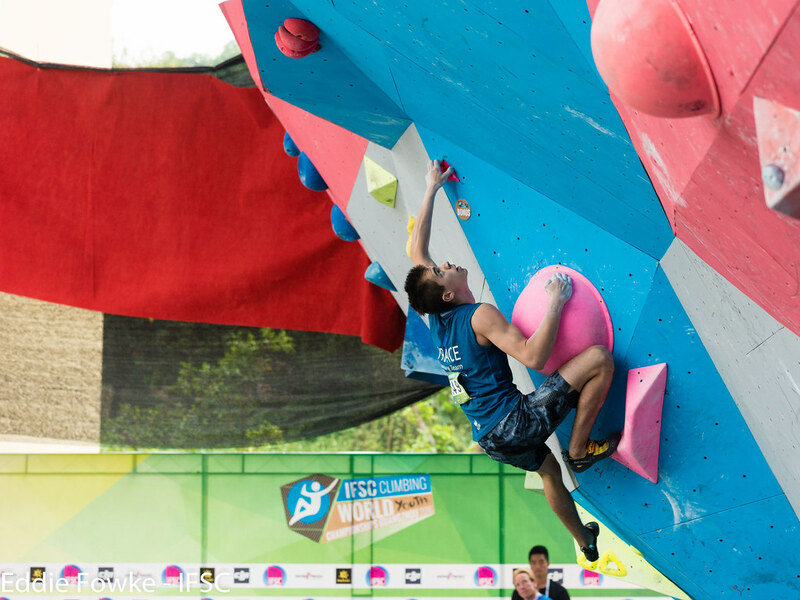 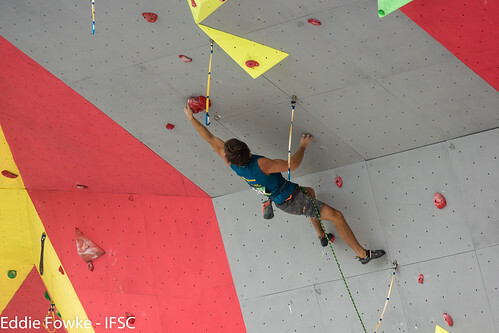 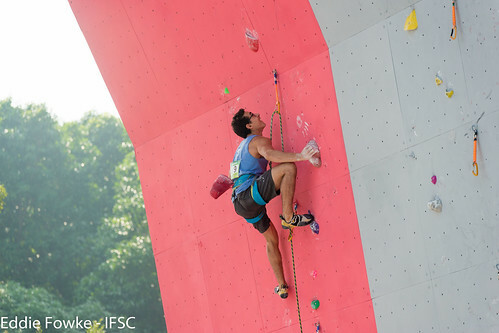 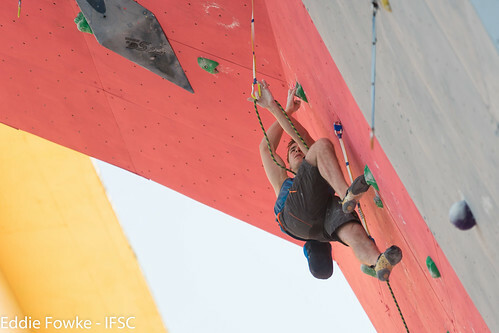 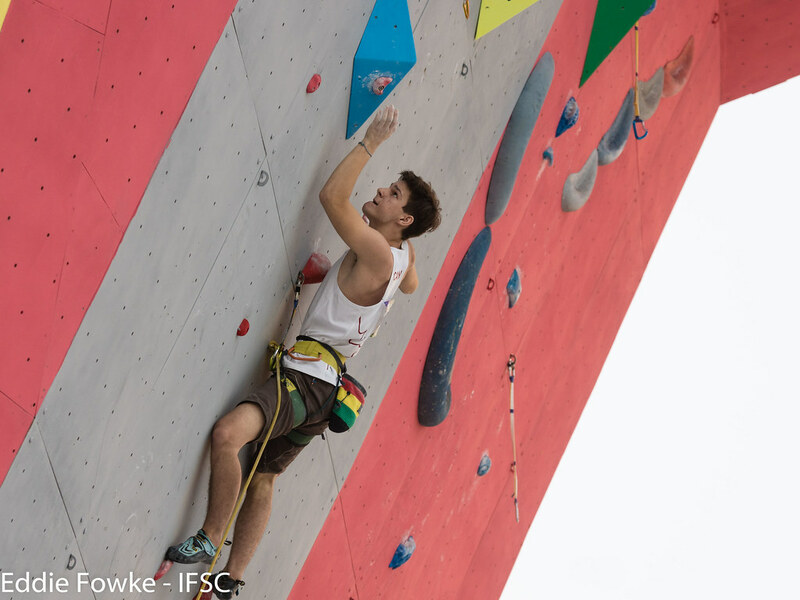 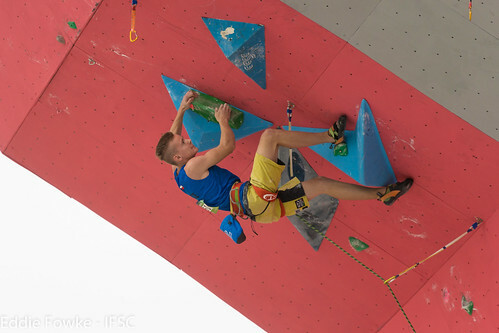 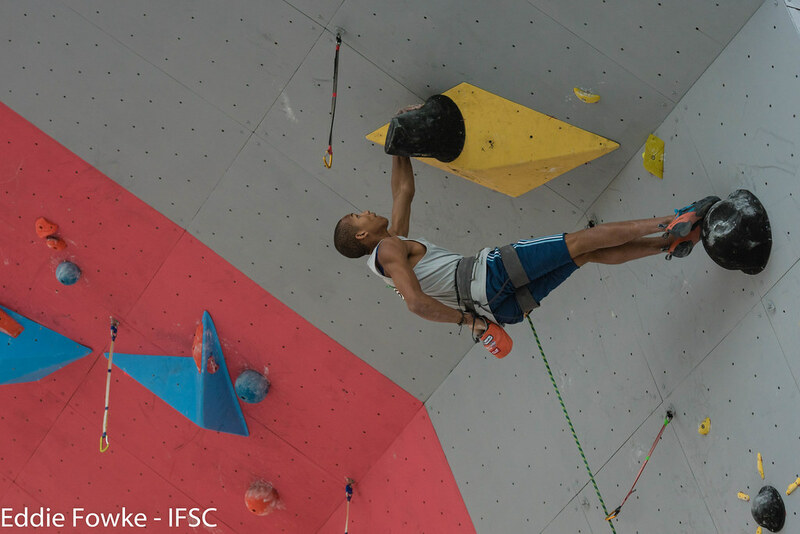 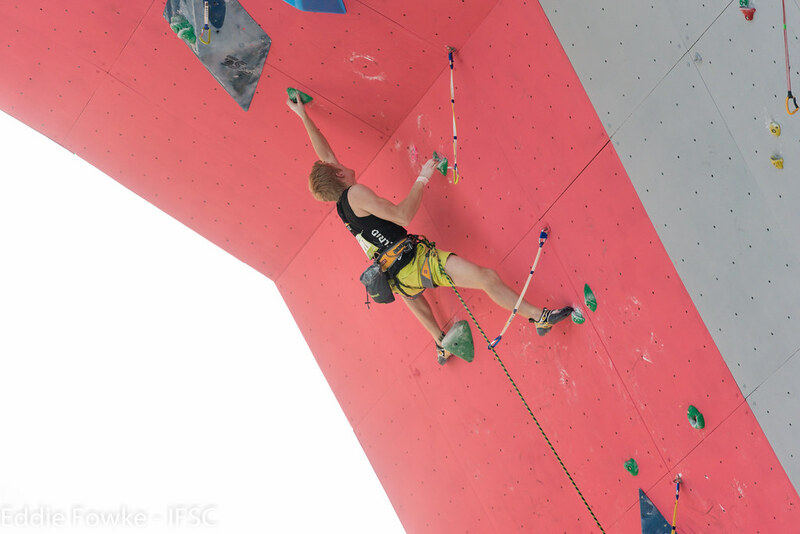 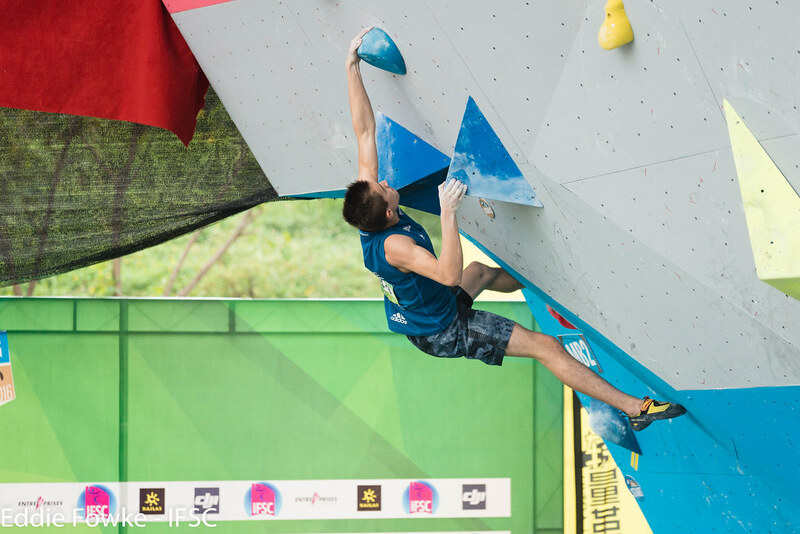 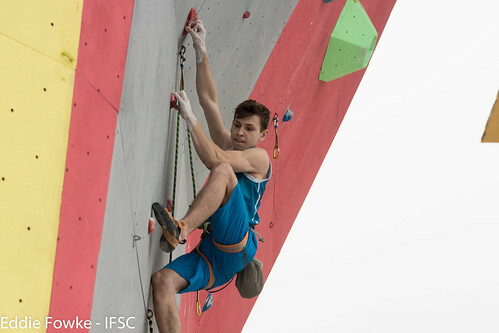 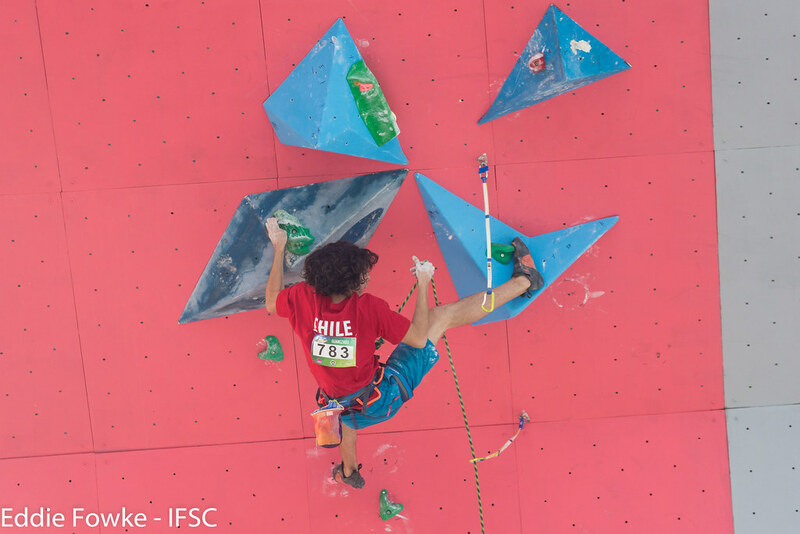 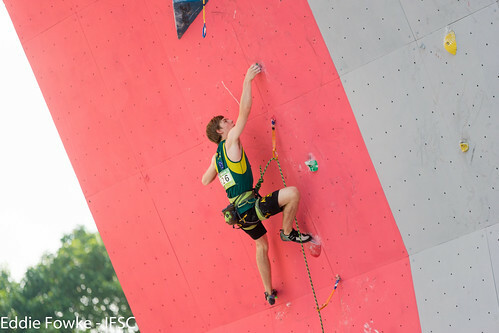 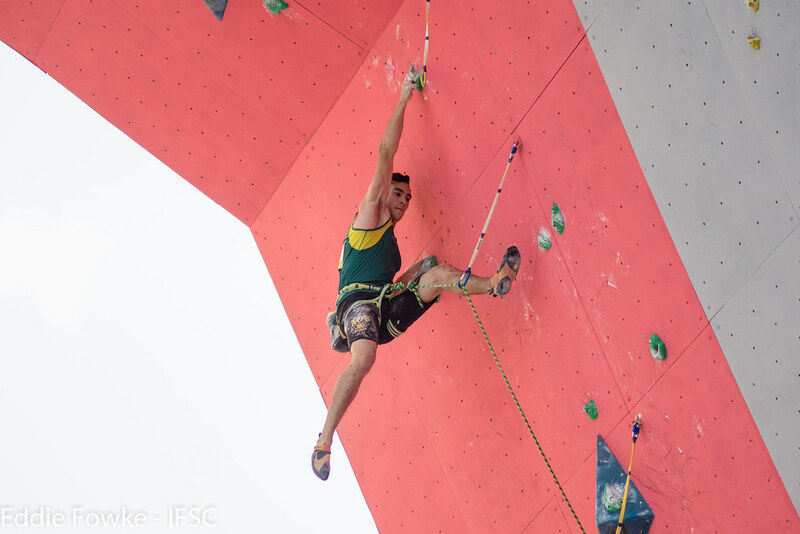 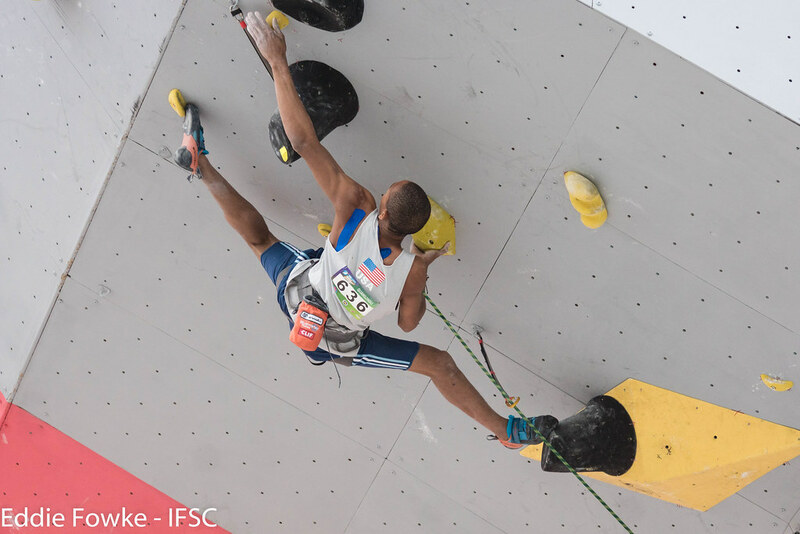 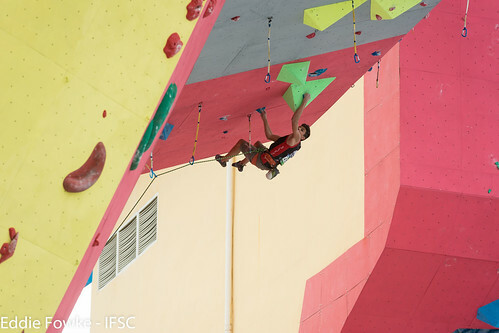 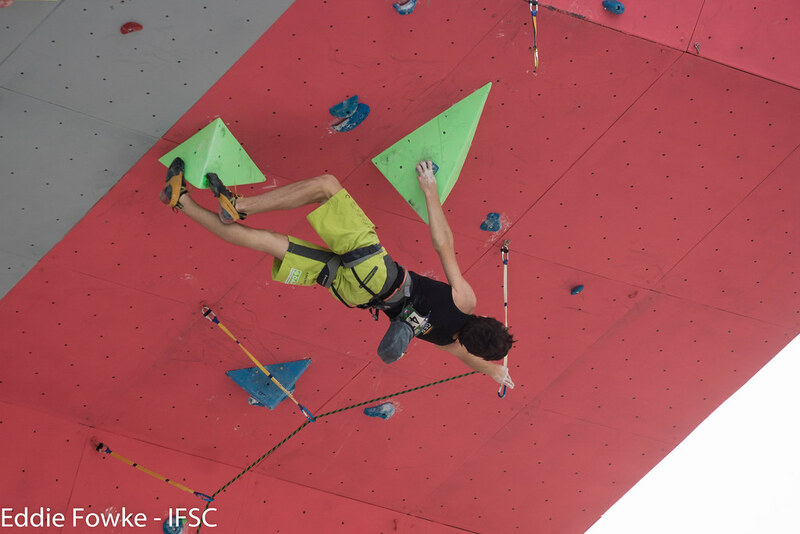 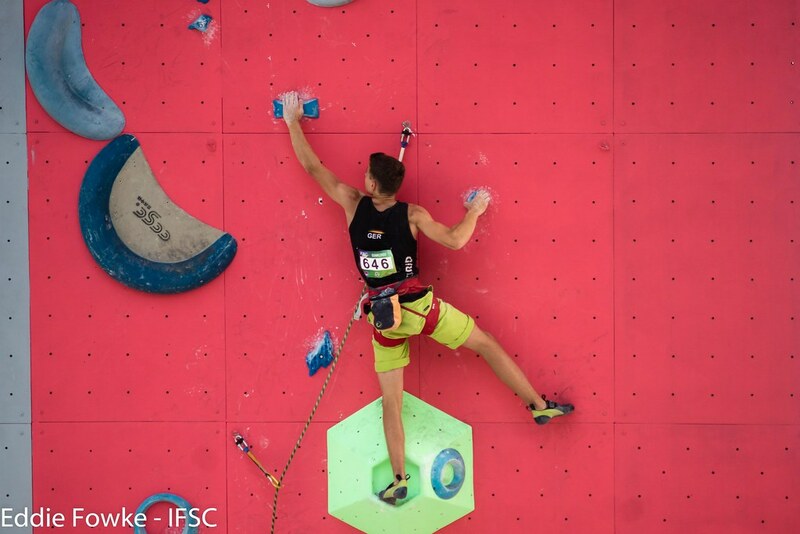 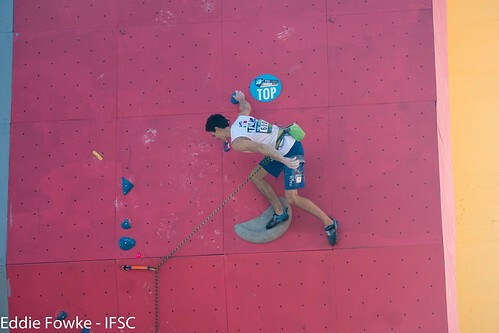 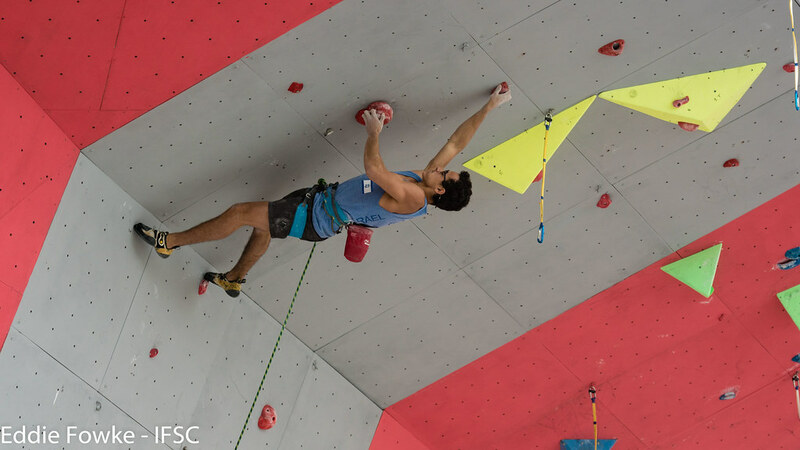 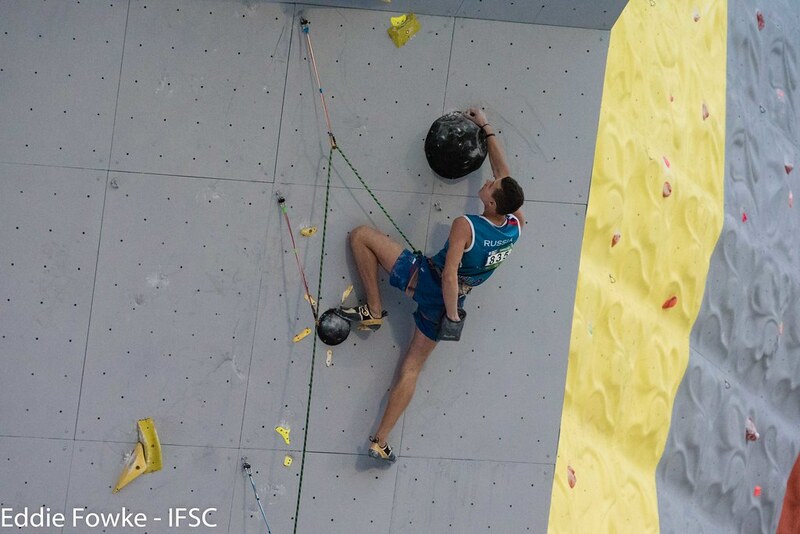 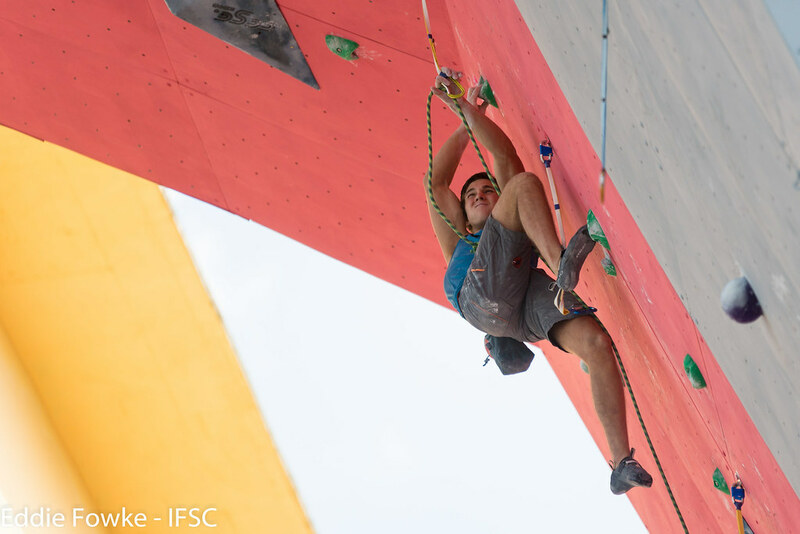 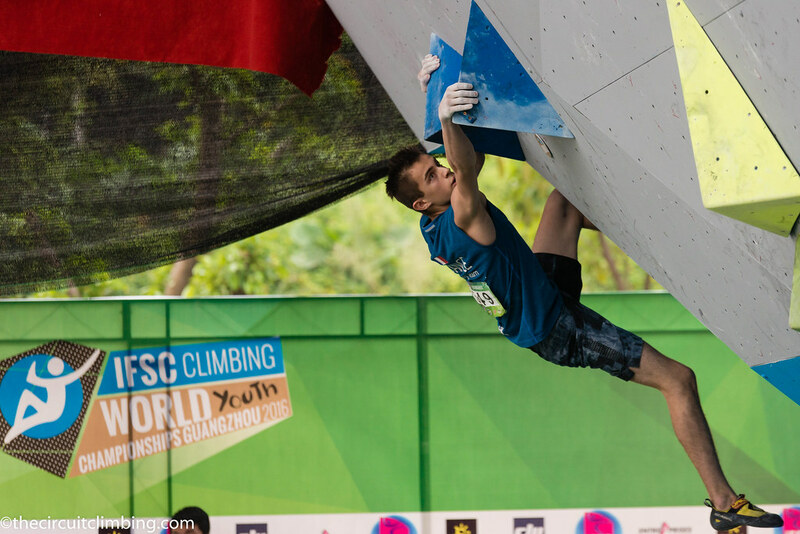 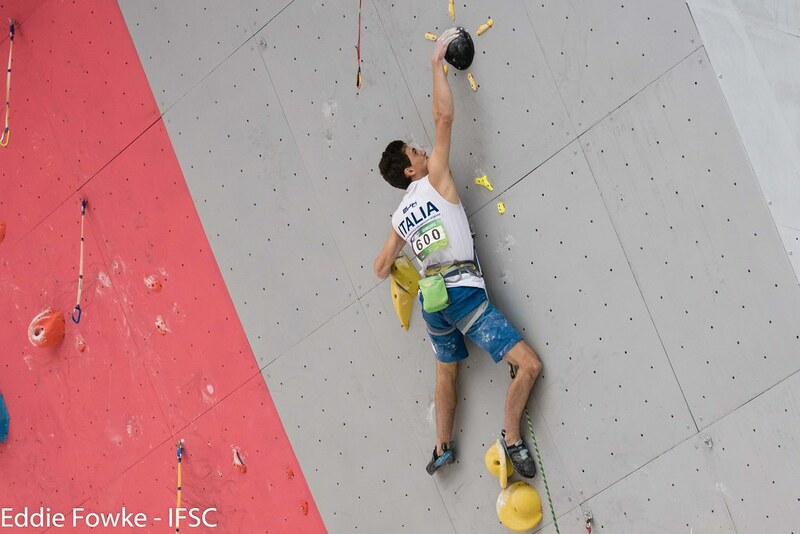 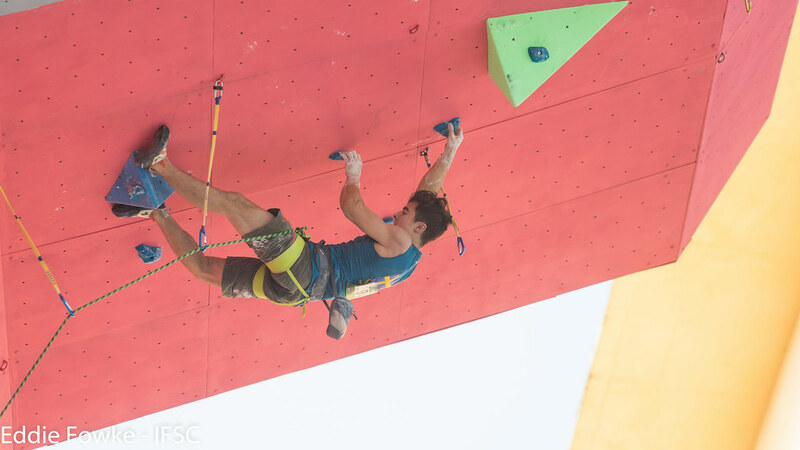 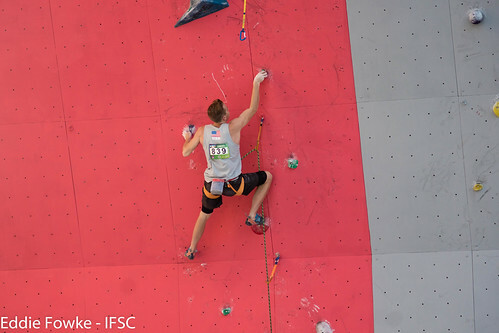 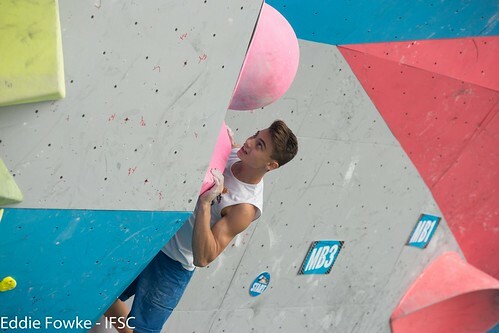 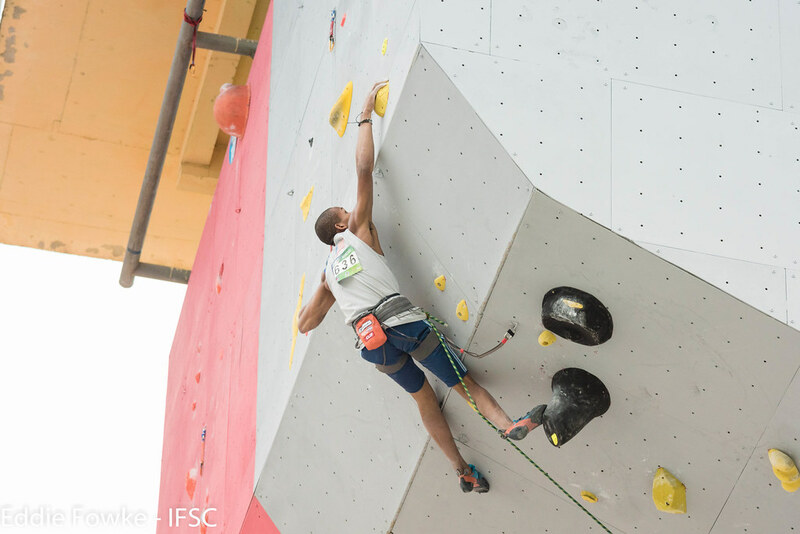 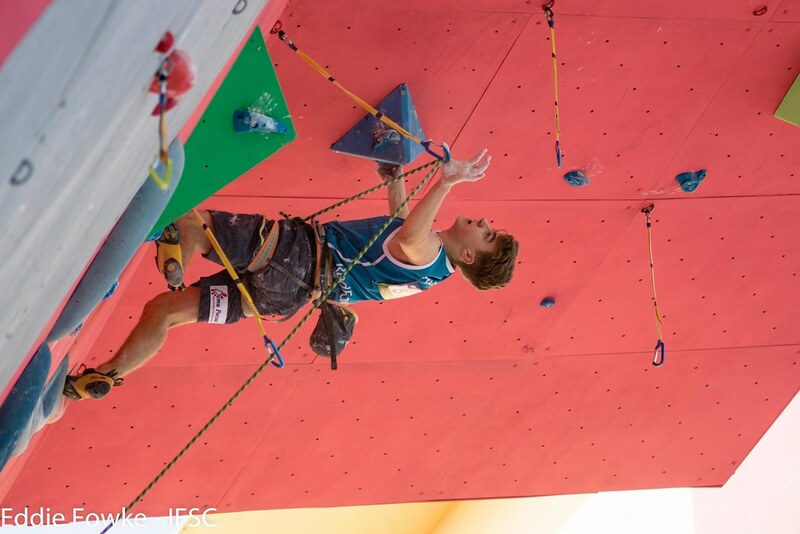 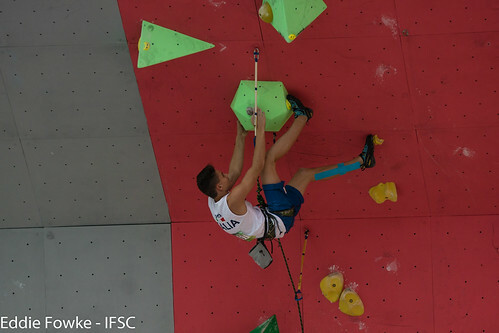 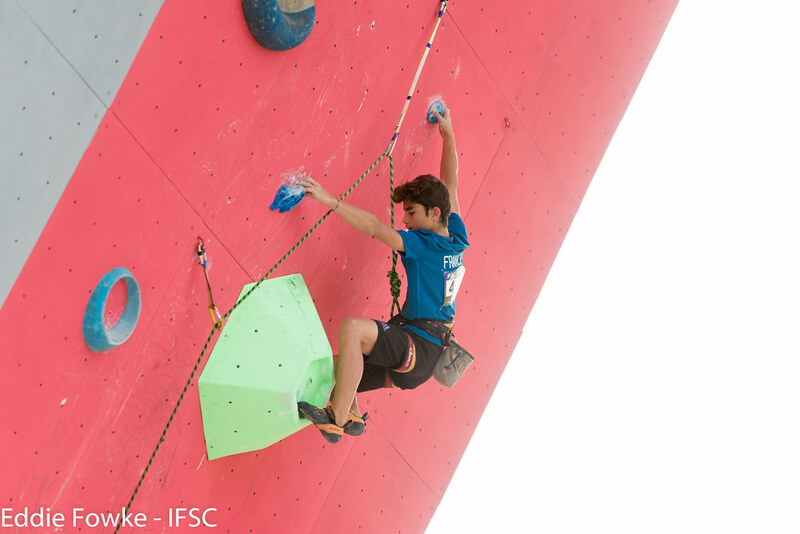 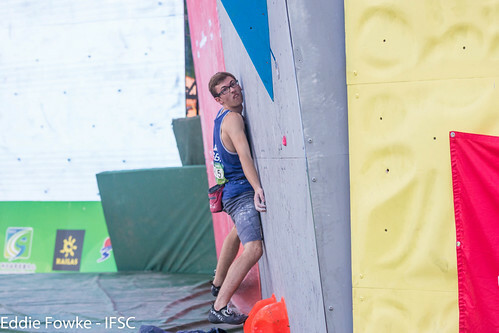 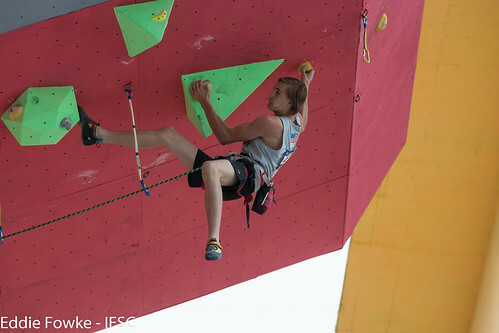 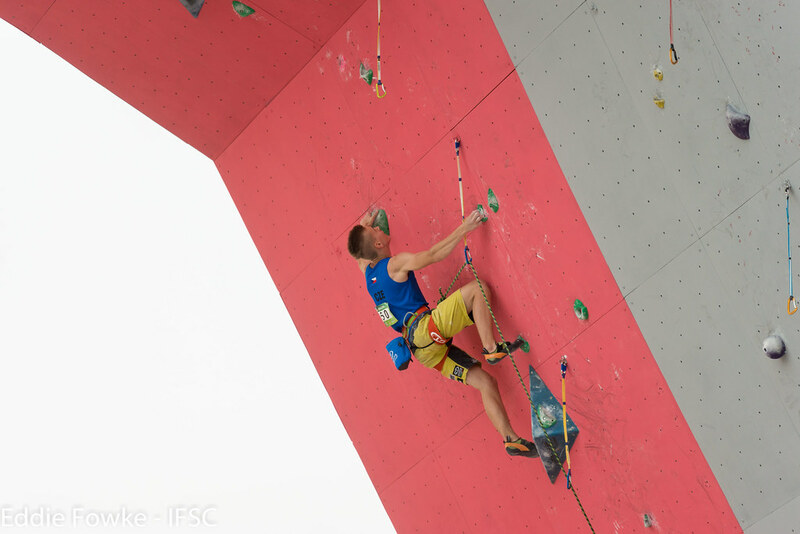 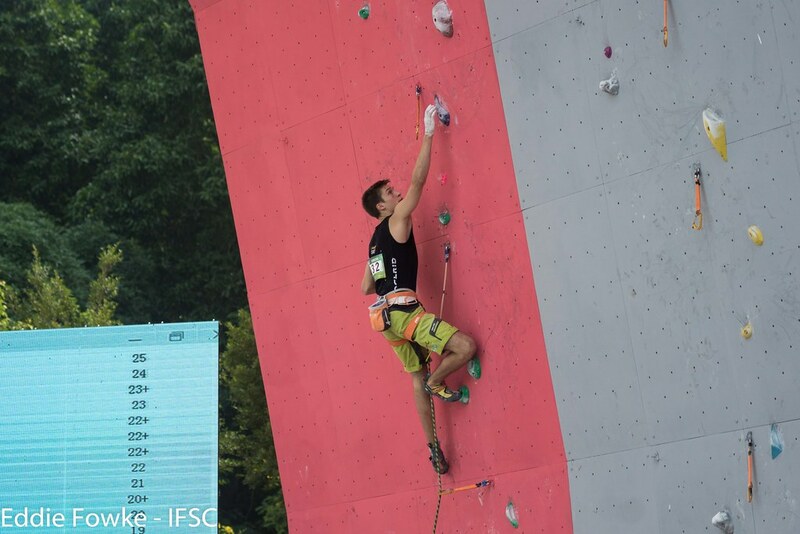 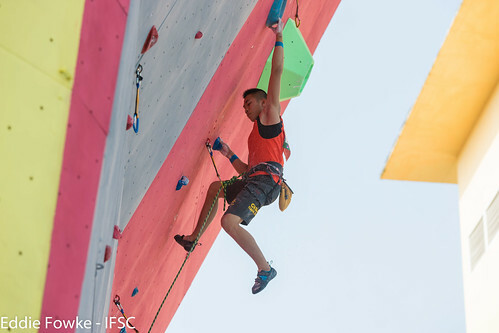 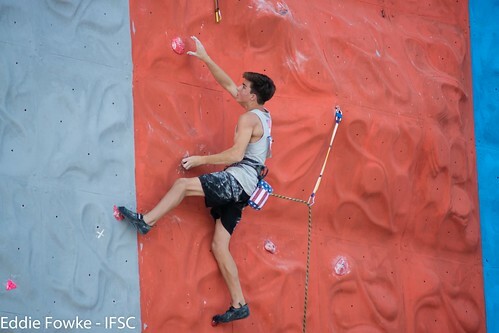 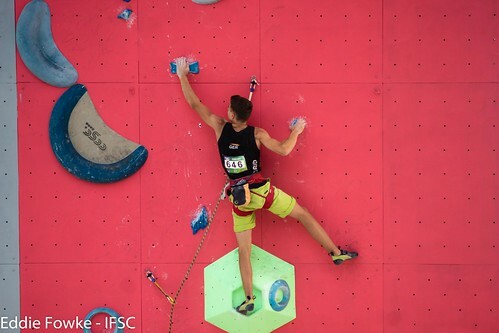 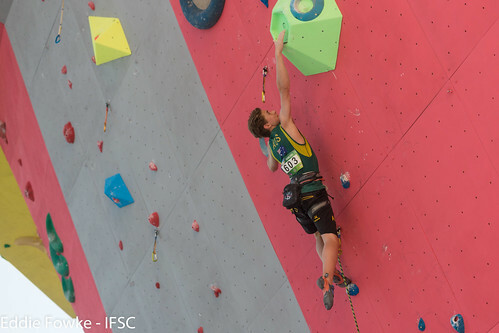 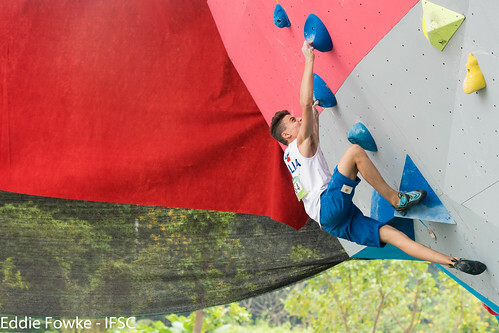 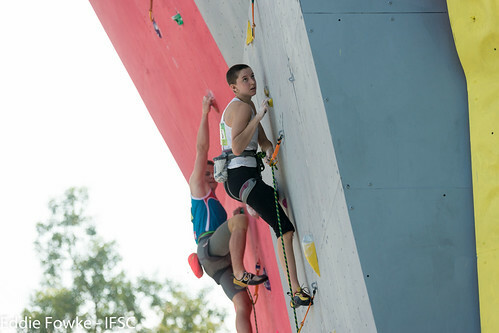 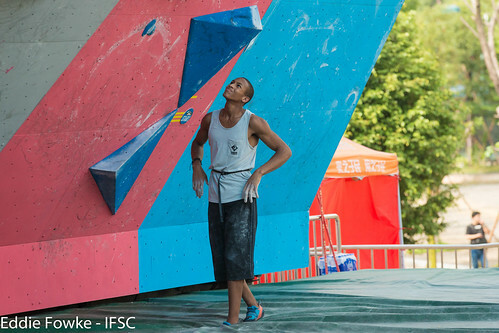 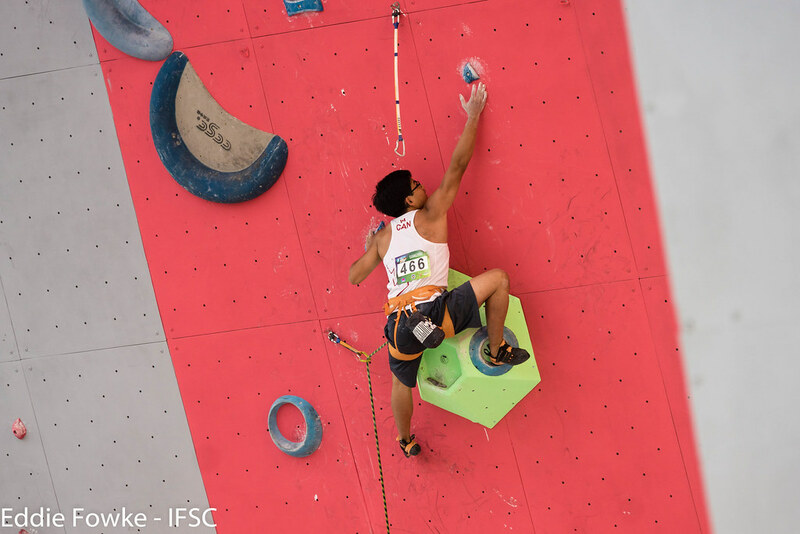 Giorgio Bendazzoli continued to distinguish himself from other Youth A athletes, rising seven holds above American Kai Lightner on the final route. 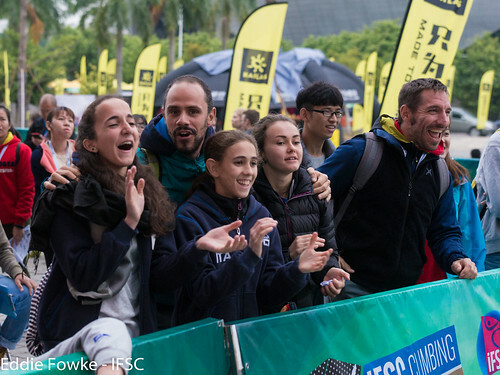 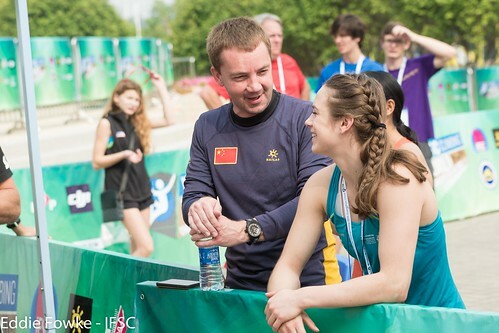 The young Italian placed 36th last year and is certainly one of the most improved athletes at Guangzhou. Taito Nakagami won more hardware for Japan, currently leading the National Team medal table. 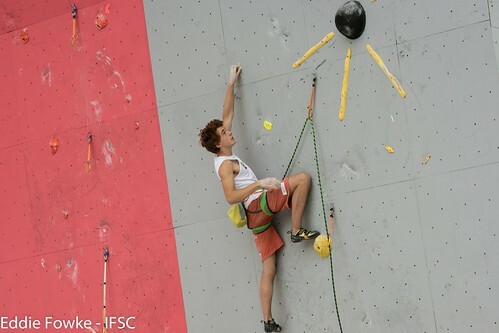 The Male Juniors category brought many surprises. 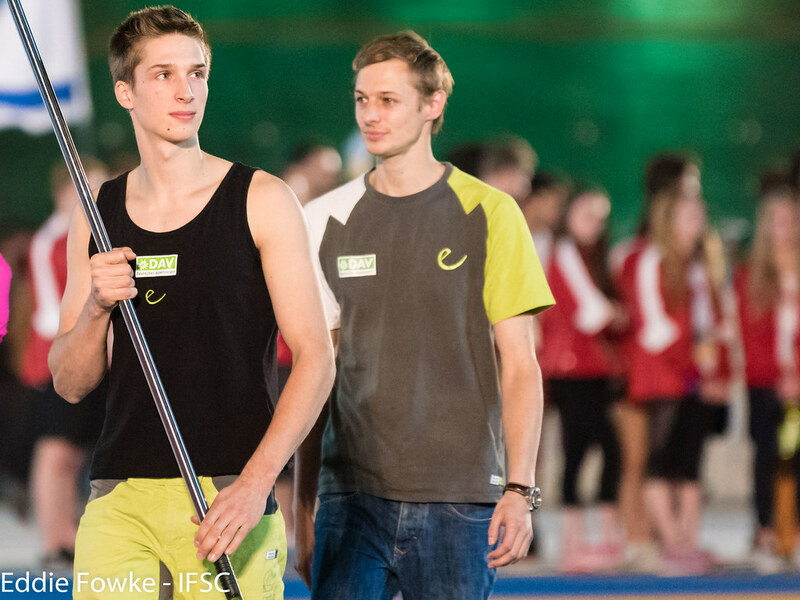 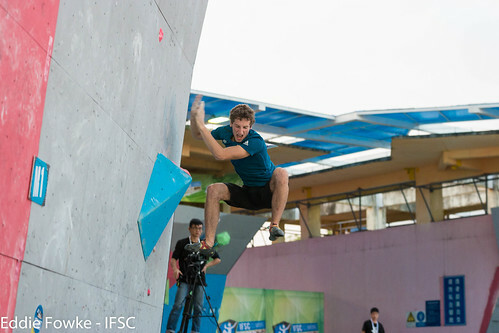 Frontrunner Sascha Lehmann of Switzerland missed the Finals cut, and Semi-Finals leader Fedir Samoilov of Ukraine missed the podium. 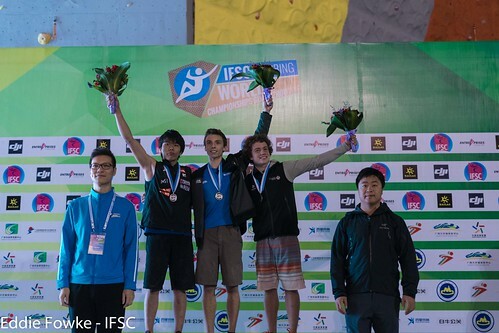 In the end, Simon Lorenzi of Belgium took home Gold, followed by Yuki Hada of Japan and Dimitri Vogt of Switzerland. 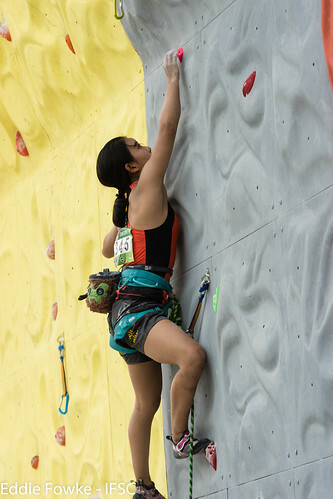 Female Speed athletes battled damp and cold conditions on Thursday. 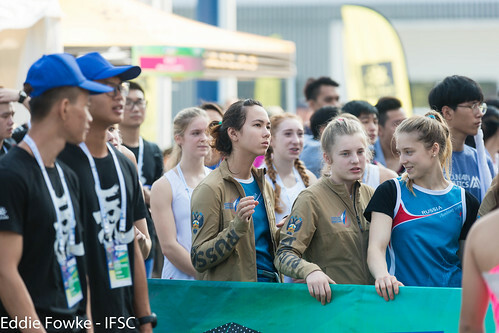 In Youth B, Karina Gareeva faced=off against Russian teammate Daria Kuznetsova. 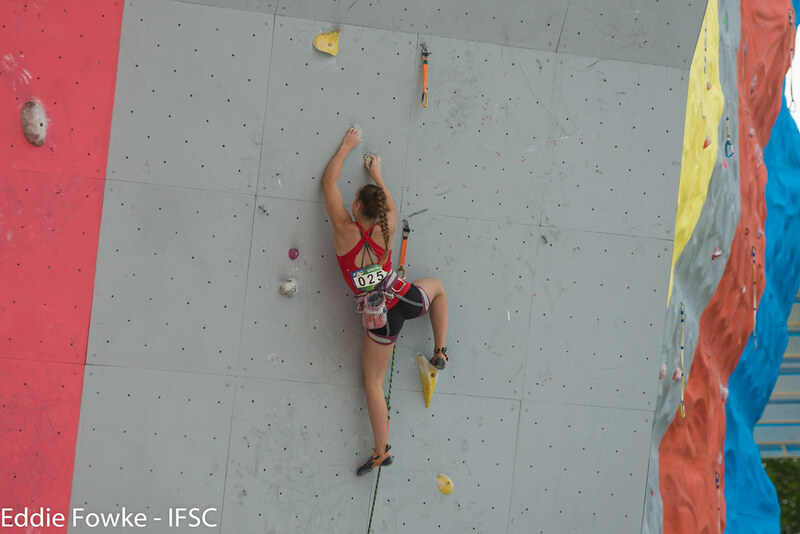 Both athletes showed great form, but Gareeva gained a few steps in the middle of the route to upgrade last year’s Silver to Gold. 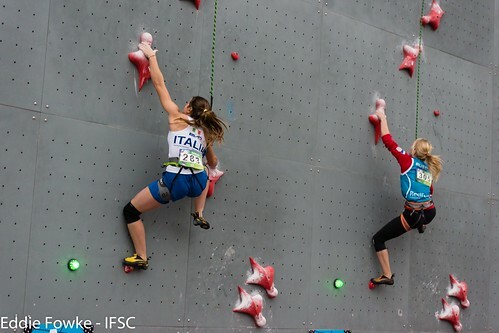 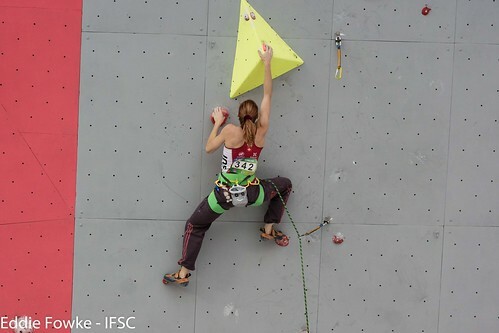 In the small final, Italian Giorgia Strazieri capitalized on a slip from Polina Kulagina at the top of the wall. 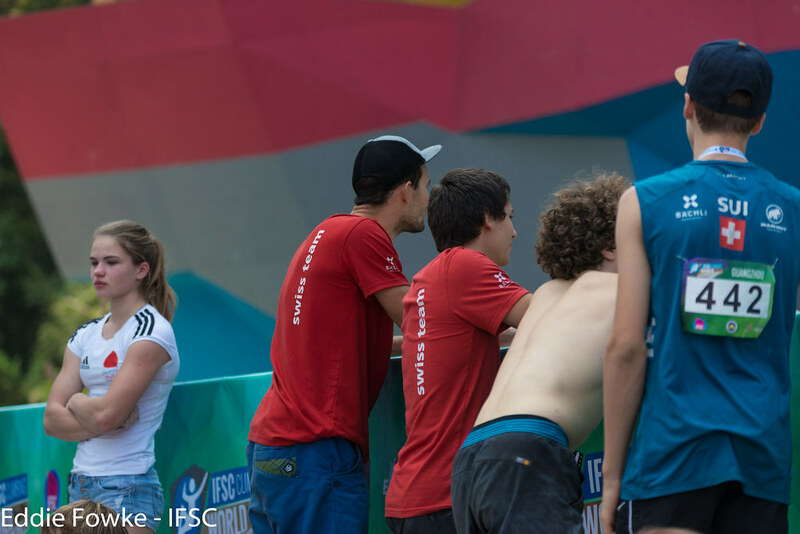 The Youth A final was one of the most exciting matches of the day. Frontrunner Elma Fleuret of France was flawless, but Elizaveta Ivanova still slapped the timer six hundredths of a second sooner, earning another victory for Russia. Italian Elisabetta Dalla Brida rounded out the podium. To complete the dream for Russia, Daria Kan outlasted Patrycja Chudziak of Poland in the Juniors final. 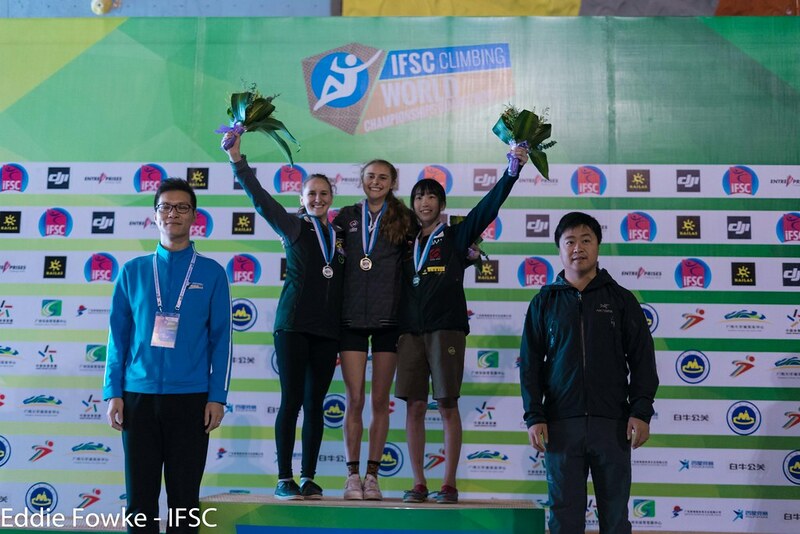 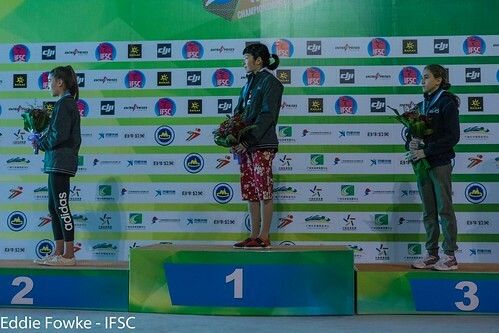 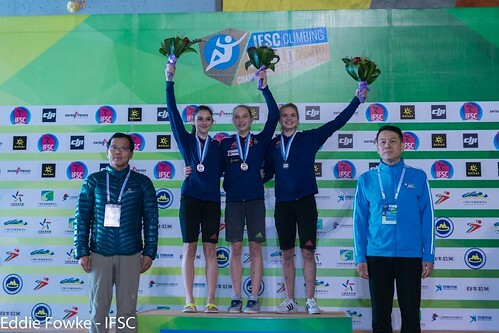 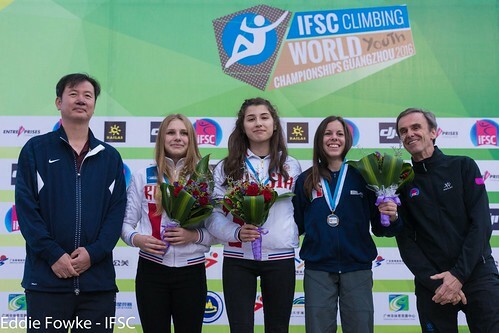 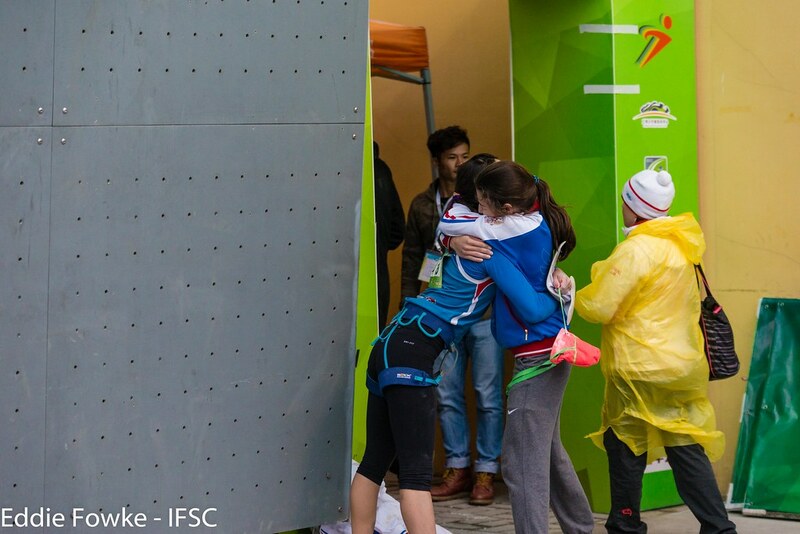 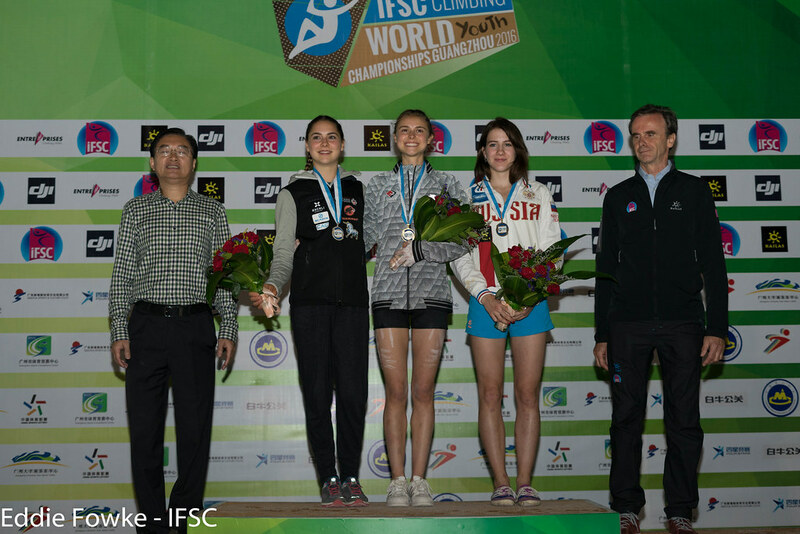 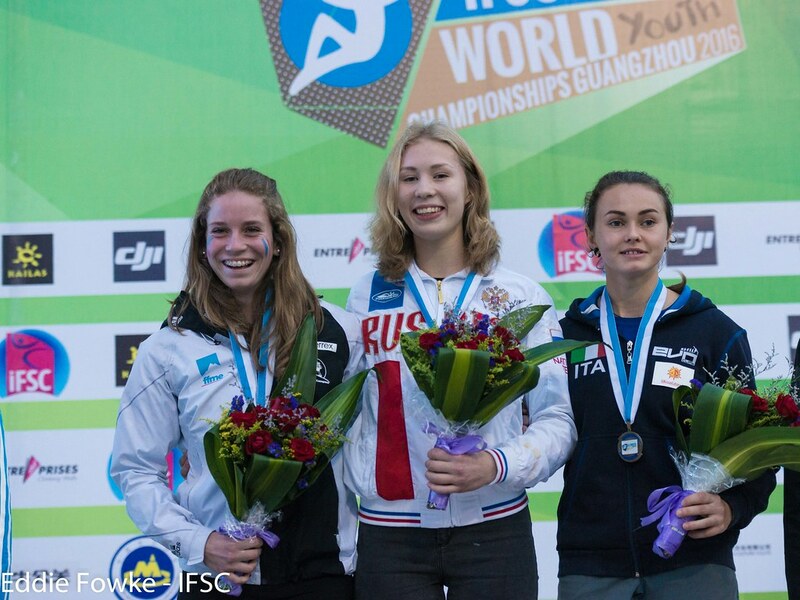 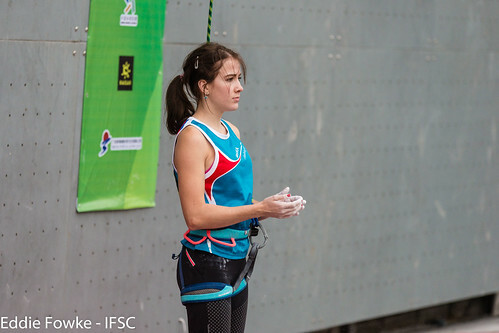 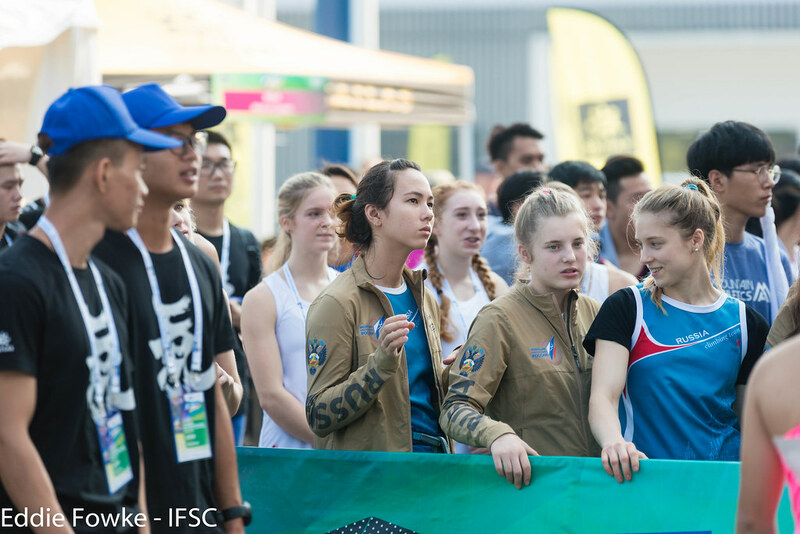 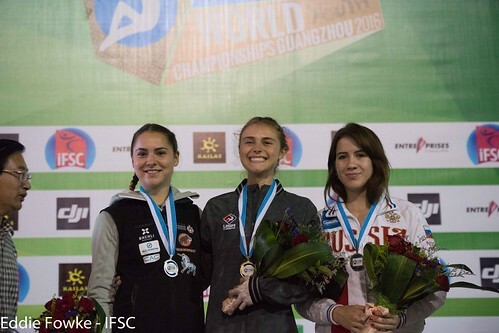 Assel Marlenova won Bronze, becoming the first female Speed athlete from Kazakhstan to podium at the IFSC World Youth Championships. Russsia continued their momentum in the Males’ competition on Friday, sweeping the Youth B podium. 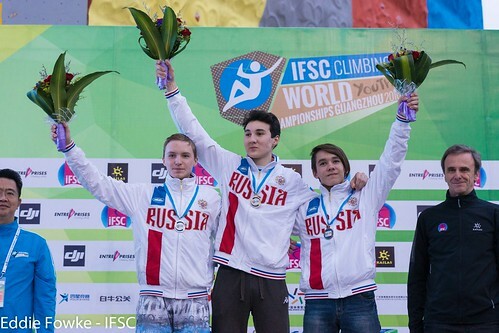 Winner Almaz Nagaev and runner-up Roman Bozhko were spectacular, posting times in the tight final race that compare to Juniors quarterfinalists. One tenth of a second gave Danil Ogorodnikov the final award. The Italians were also fast in Guangzhou. 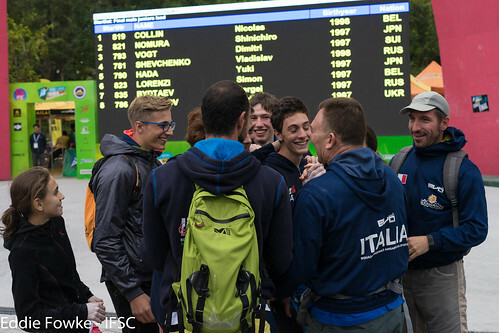 Gian Luca Zodda stayed strong until the end, while Russian Sergey Rukin (who posted multiple sub-seven times) fell in the final race. 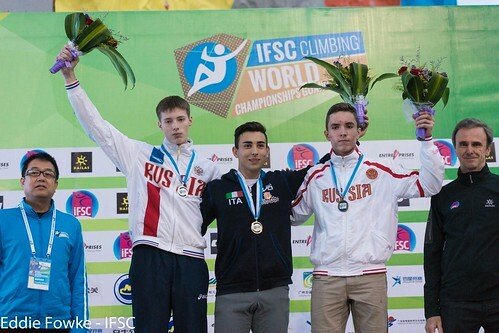 Rukin’s teammate Georgii Morozov bested Yongsu Lee of Korea for Bronze. 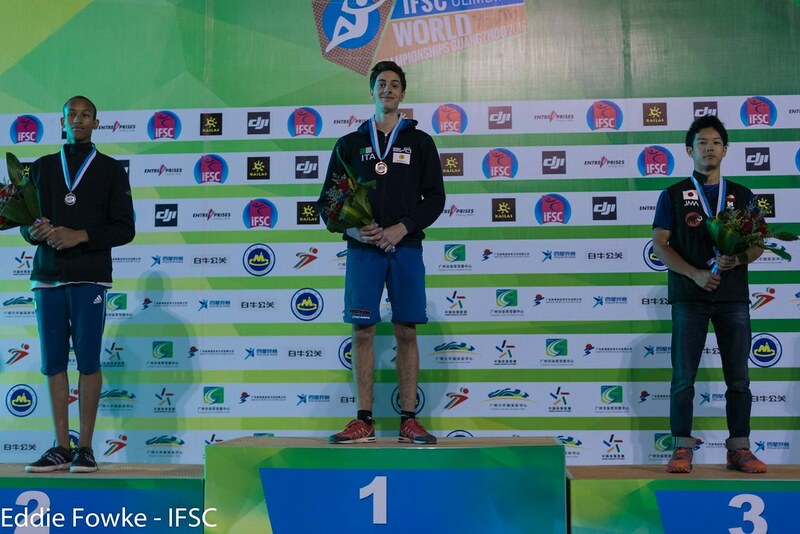 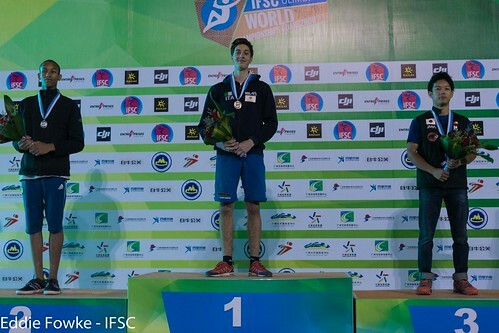 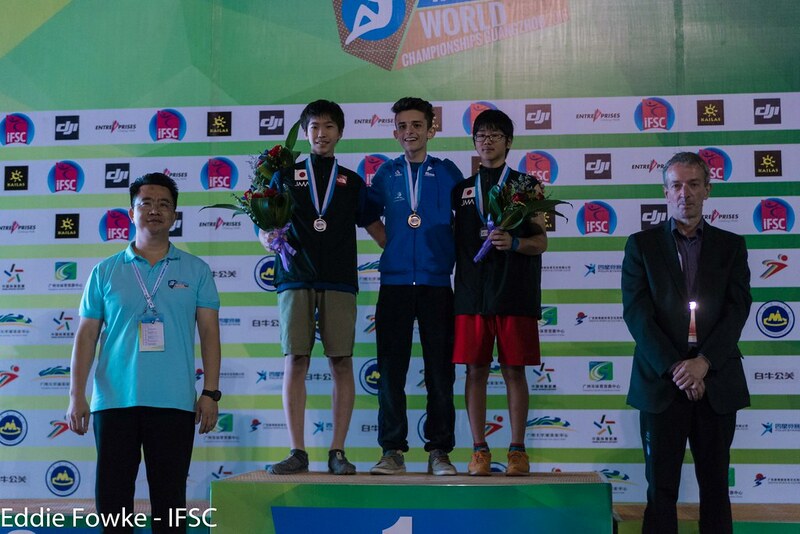 Ludovico Fossali of Italy stood tall on the podium too after a victory over Pierre Rebreyend of France. The small final showcased the quick Aleksandr Shikov against Kostiantyn Pavlenko of Ukraine. Shikov closed out the Speed action with a 6.23 ­ the best time of the day ­ and gave Russia one last medal. 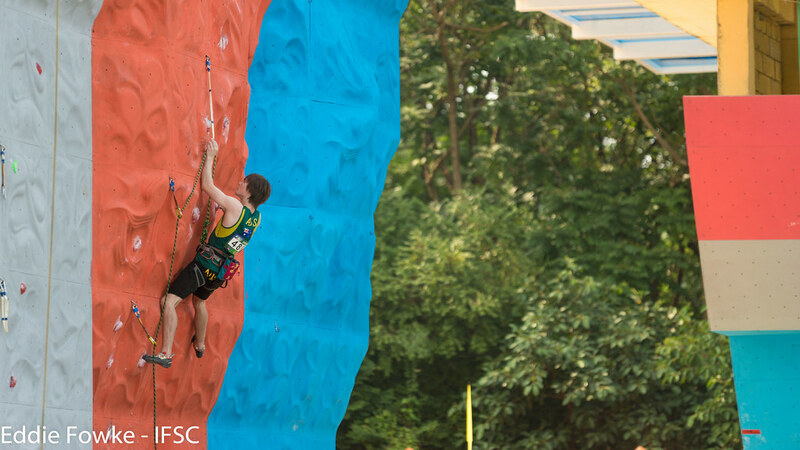 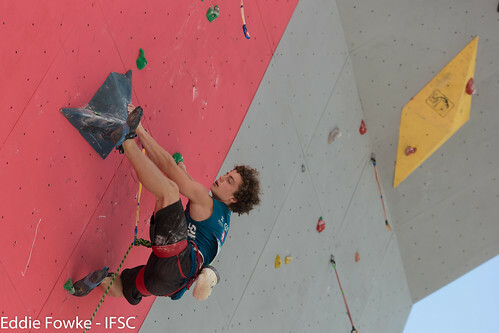 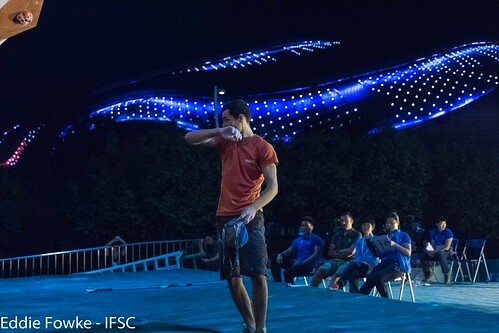 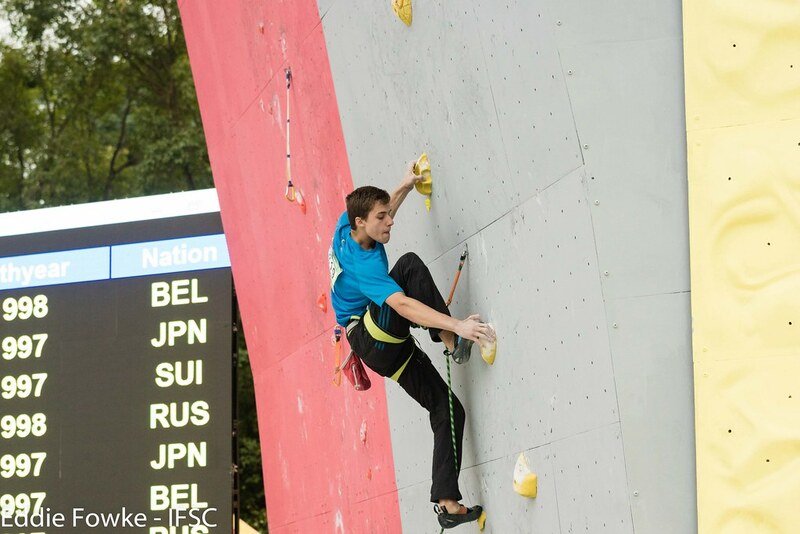 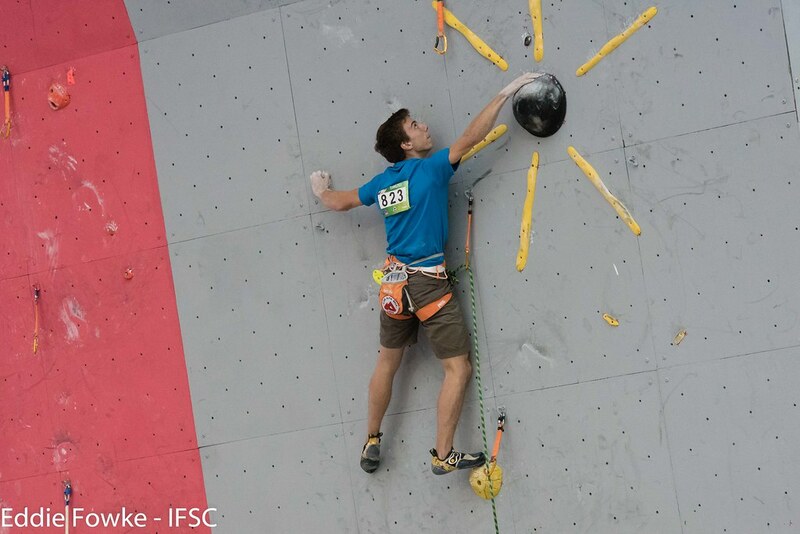 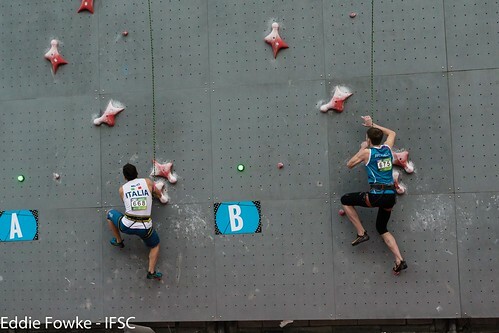 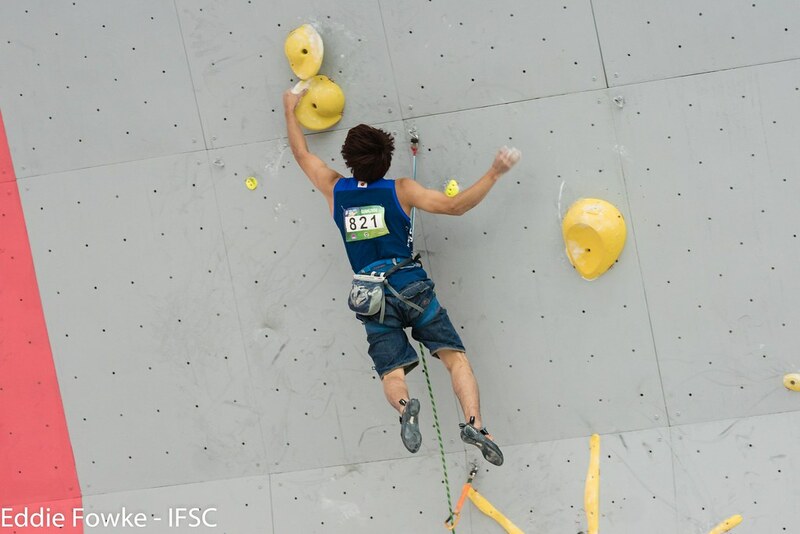 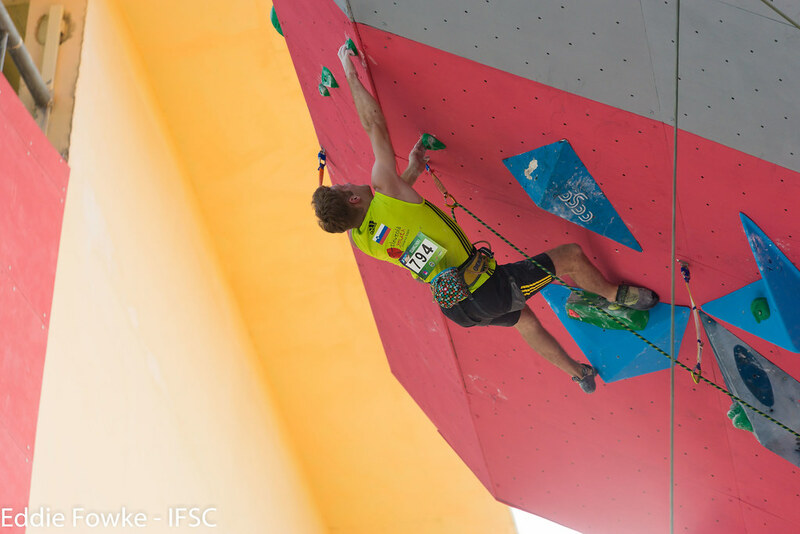 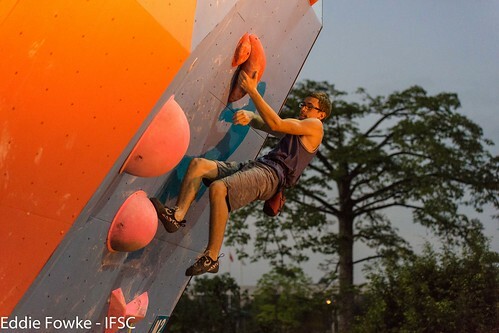 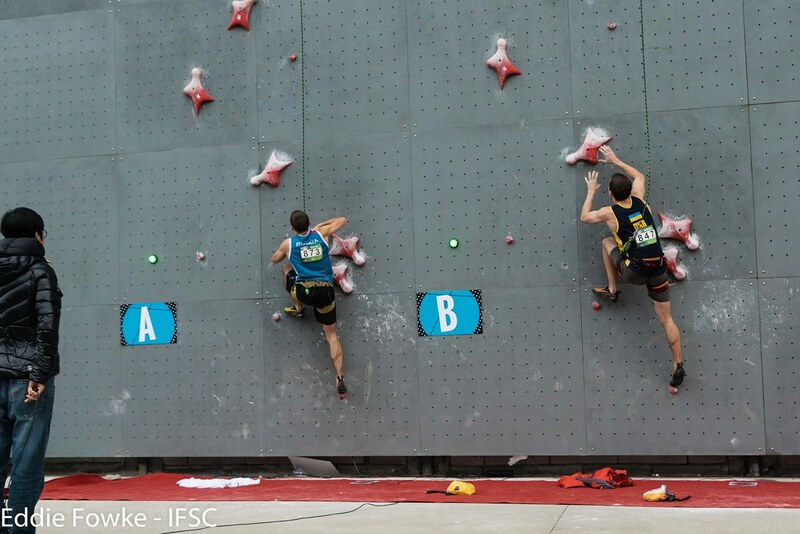 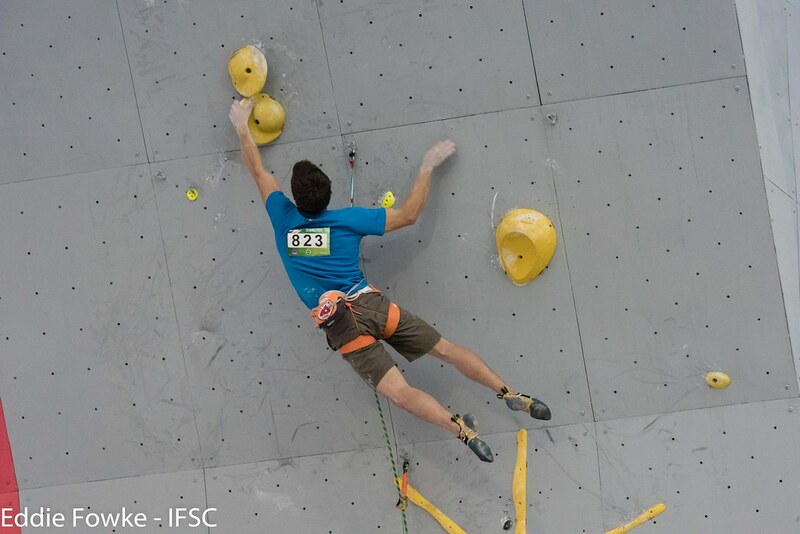 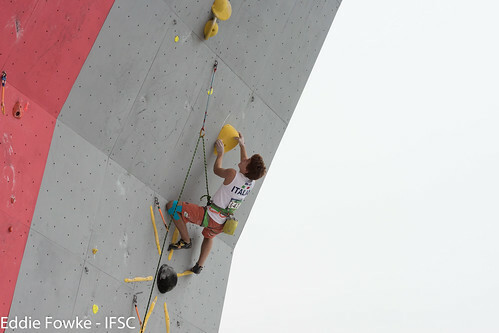 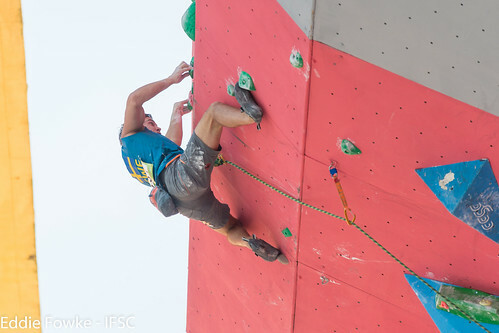 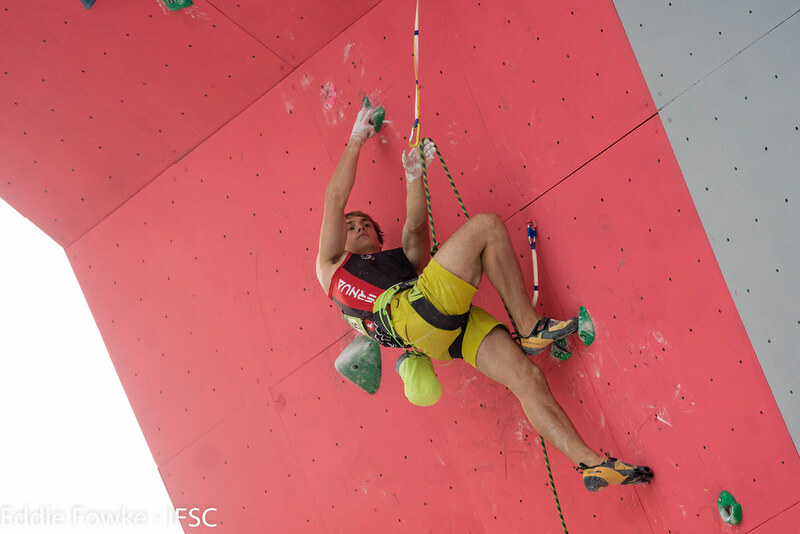 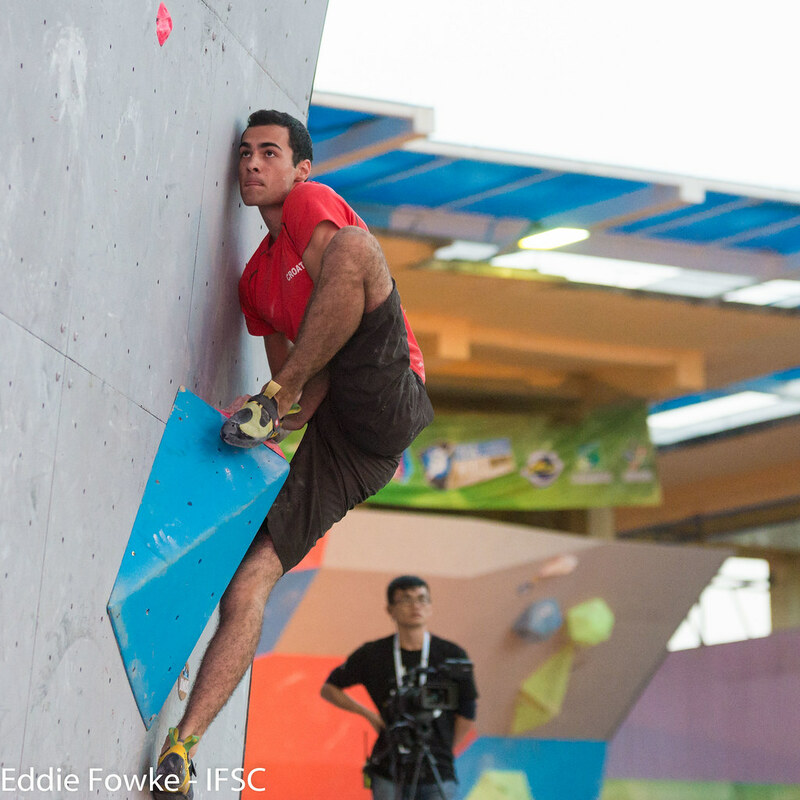 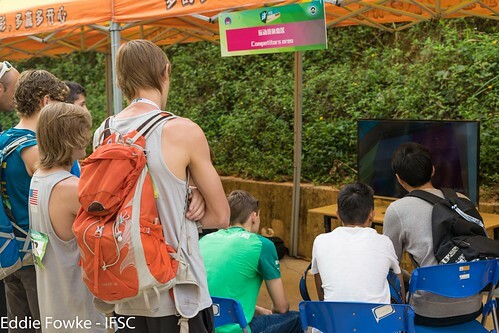 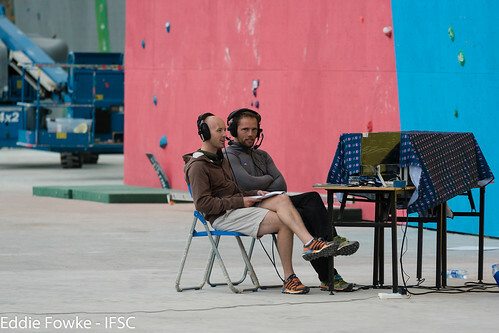 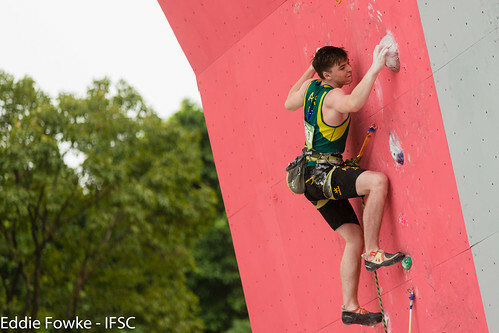 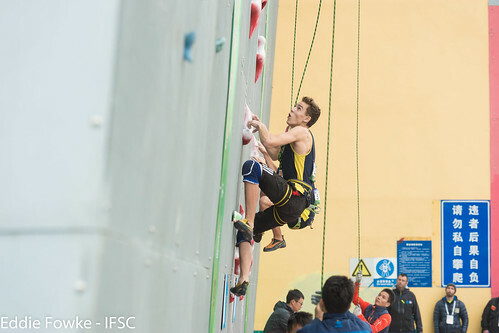 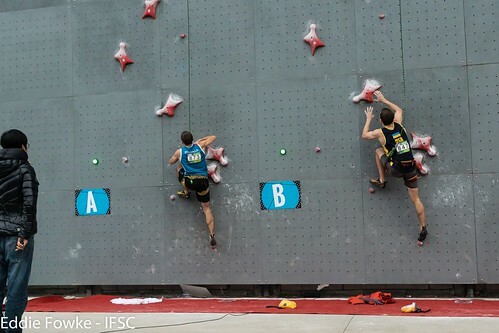 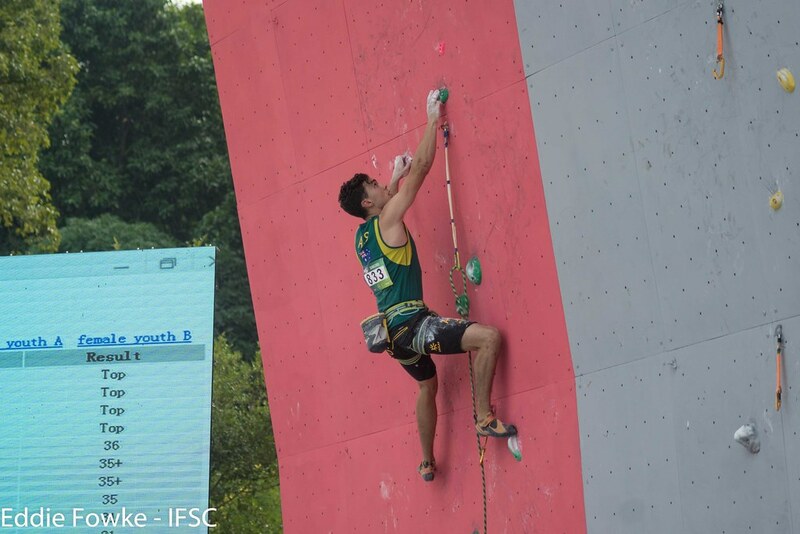 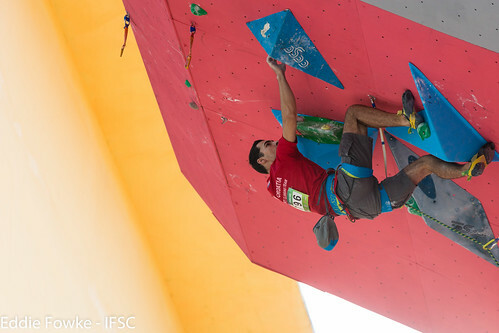 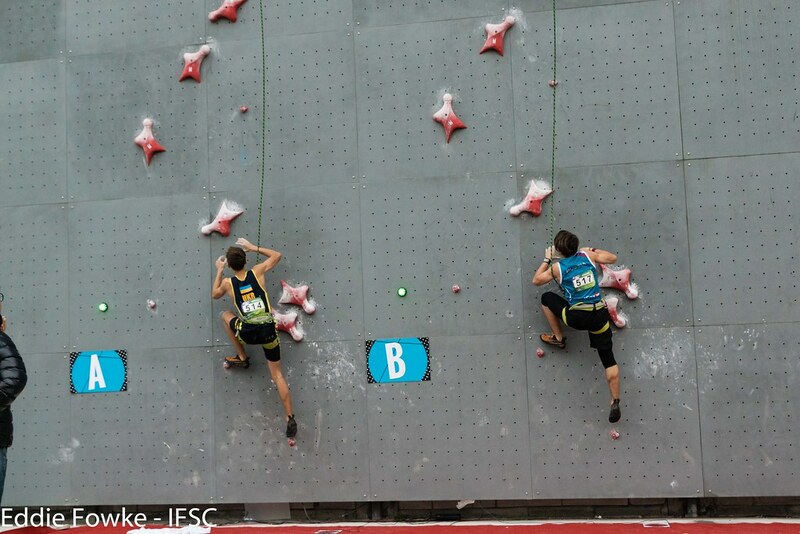 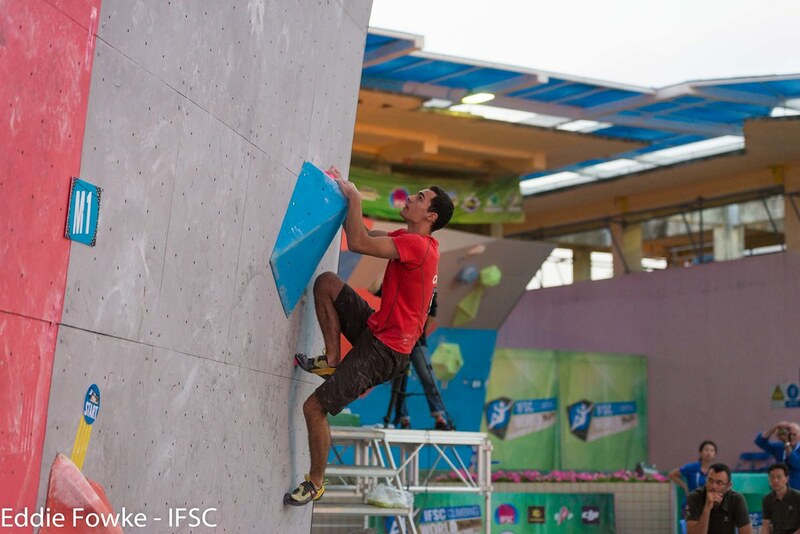 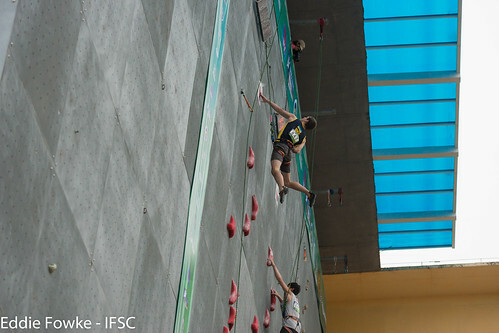 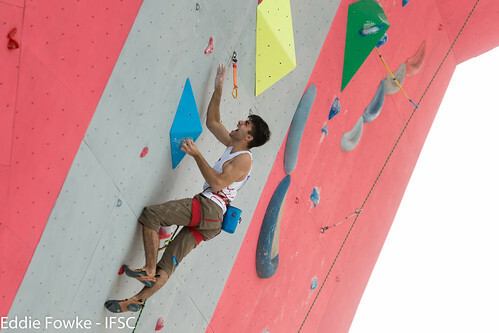 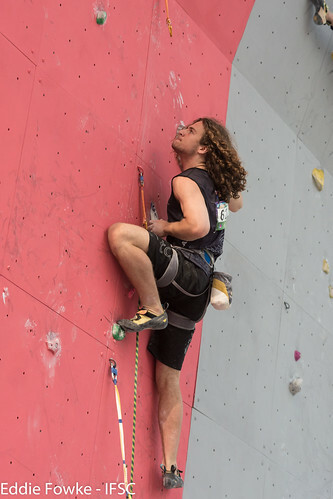 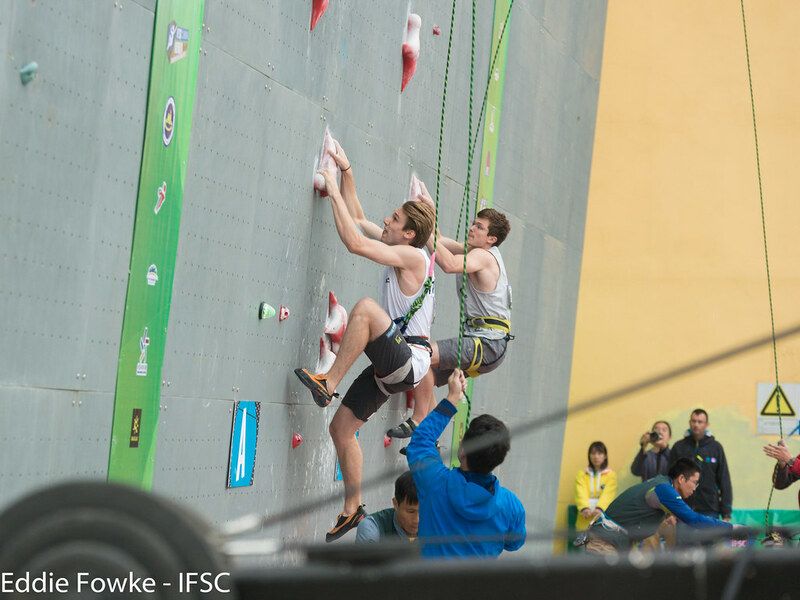 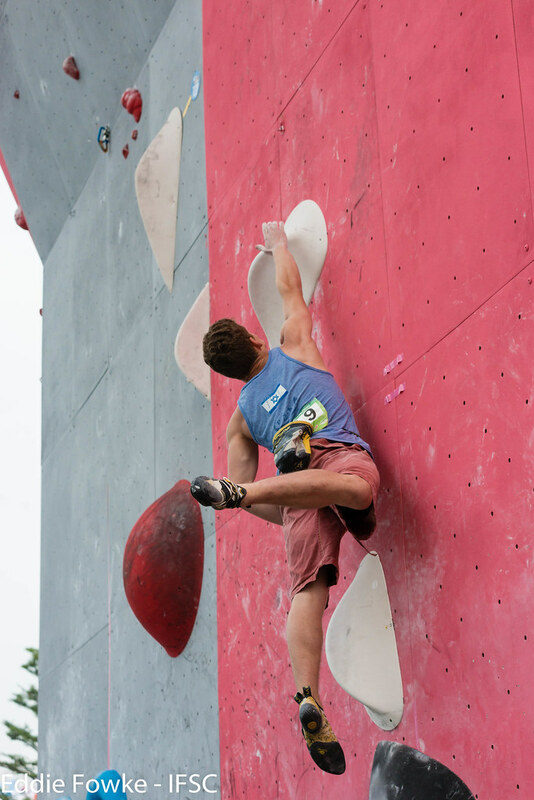 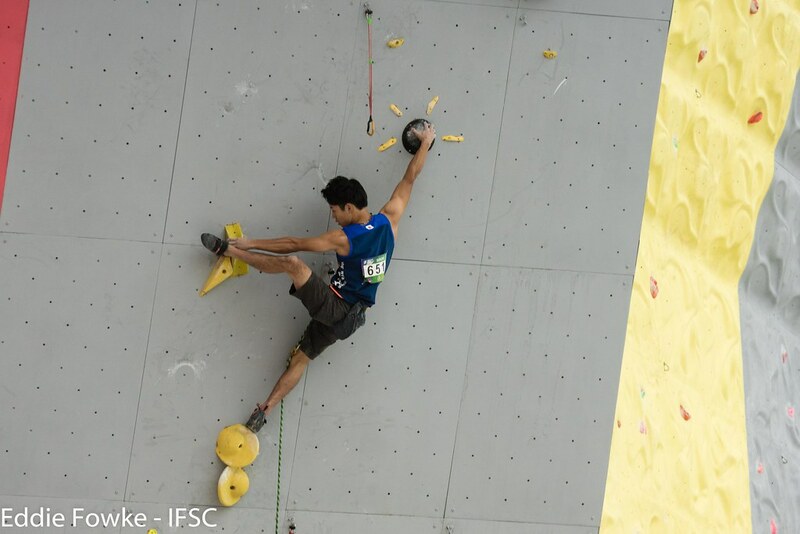 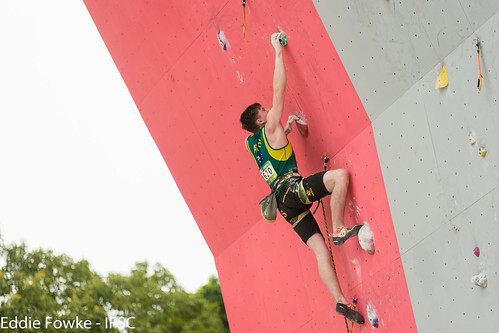 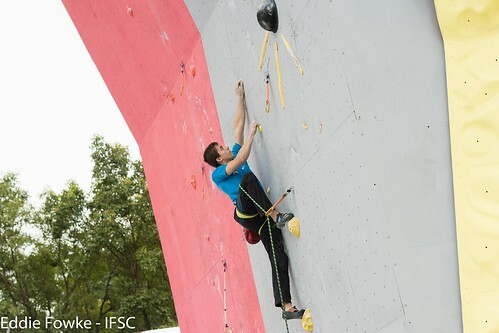 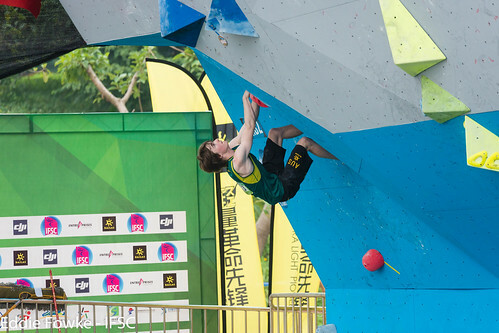 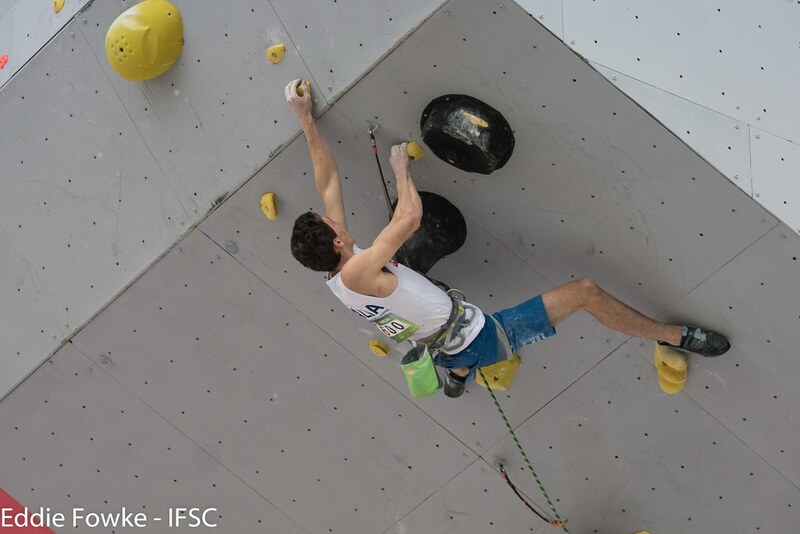 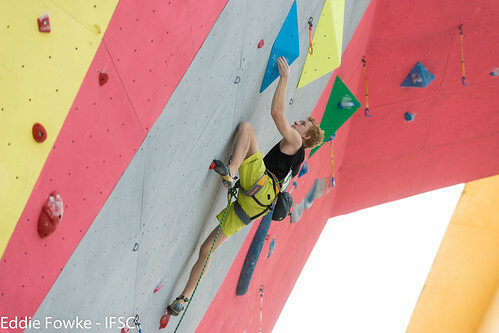 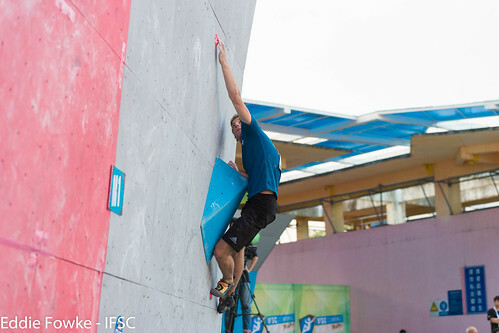 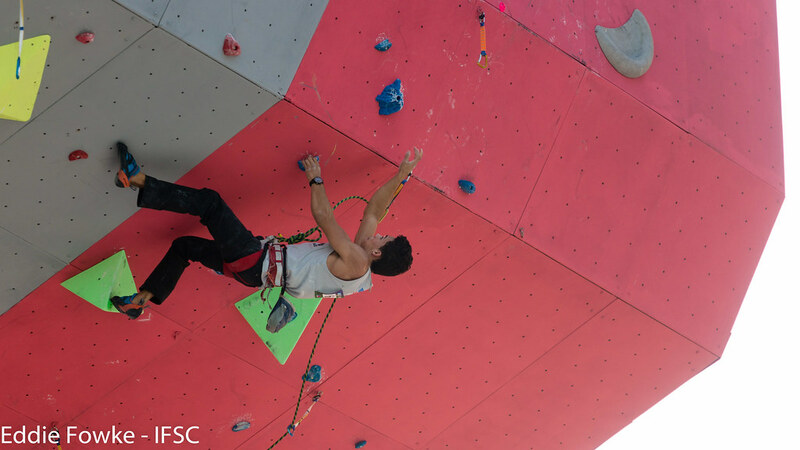 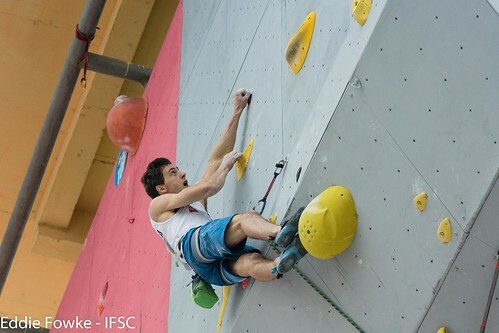 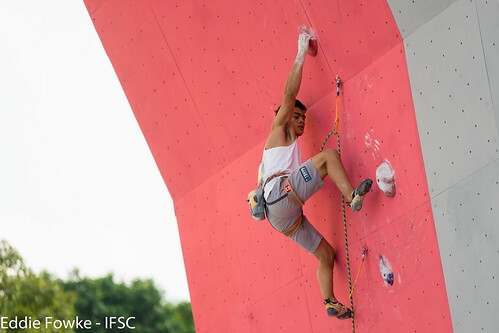 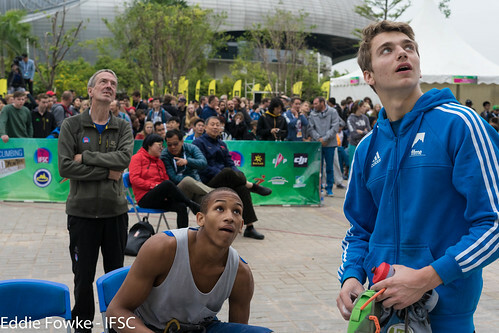 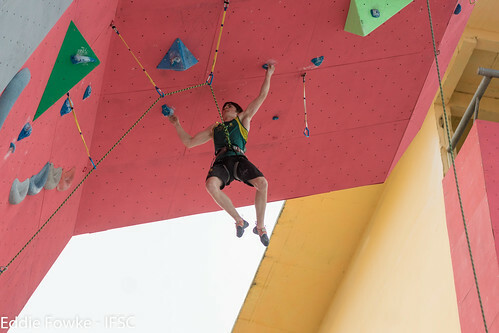 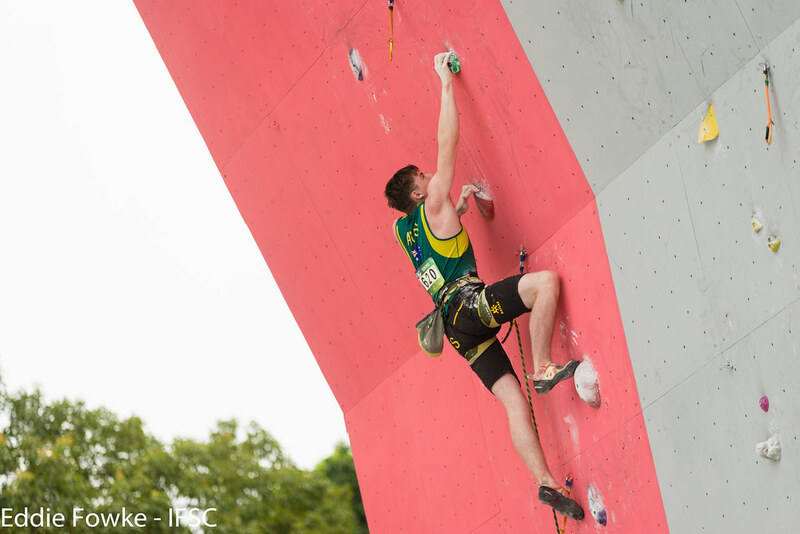 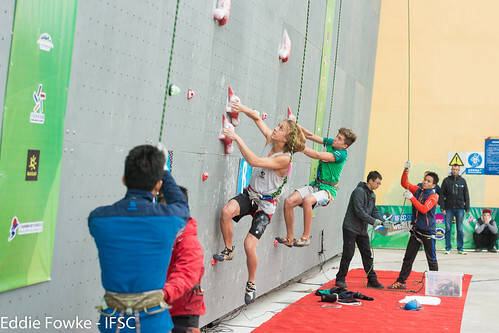 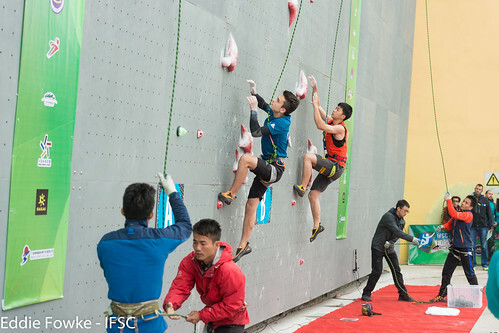 All Male Boulderers qualified for Semi-Finals after rain forced a cancellation of Qualifications. 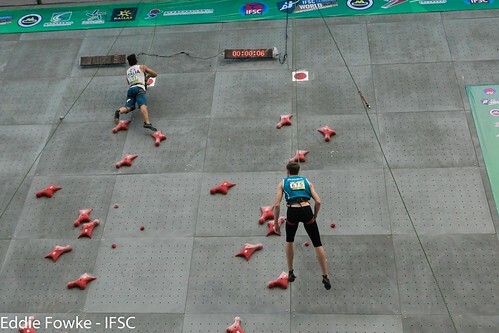 Still, only the top six athletes in each category advanced to Finals. 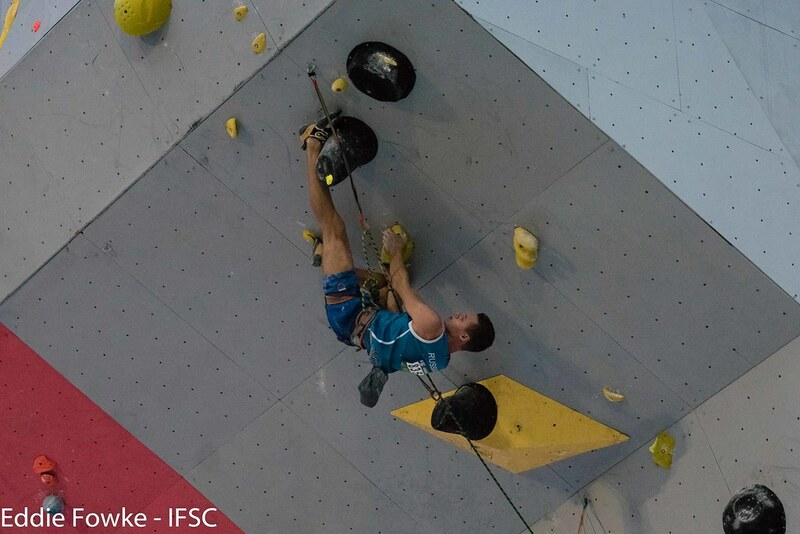 Nathan Martin of France and Italian Davide Marco Colombo were tied heading into the final problem after the sole Tops of M3, but a flash by Martin gave him the Youth B victory. 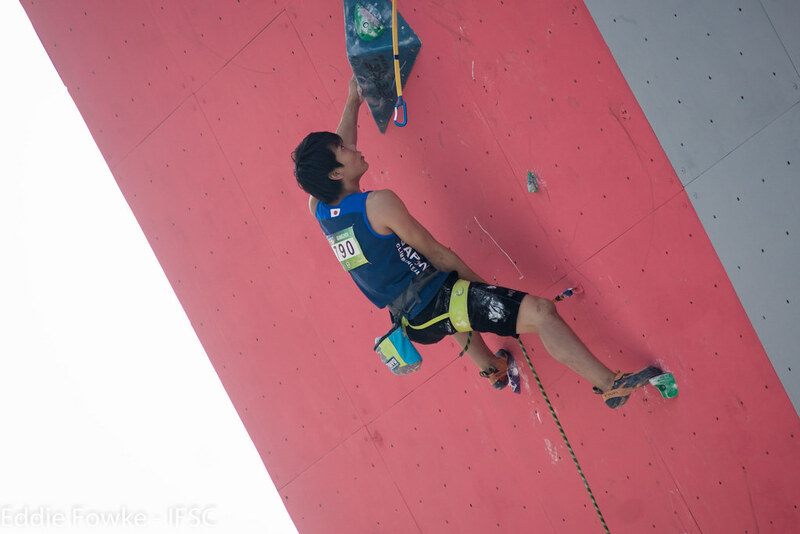 Konishi picked up another medal with the other Top of M4. Lightner came out strong in Youth A by flashing the first Finals problem, but he settled for another Silver when Keita Dohi of Japan completed a crucial Top of M4 before time expired. Dohi’s teammate, Kai Harada, completed two problems for Bronze. 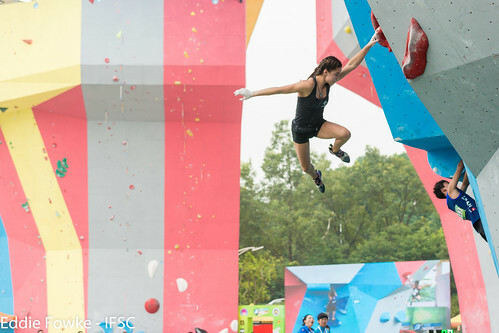 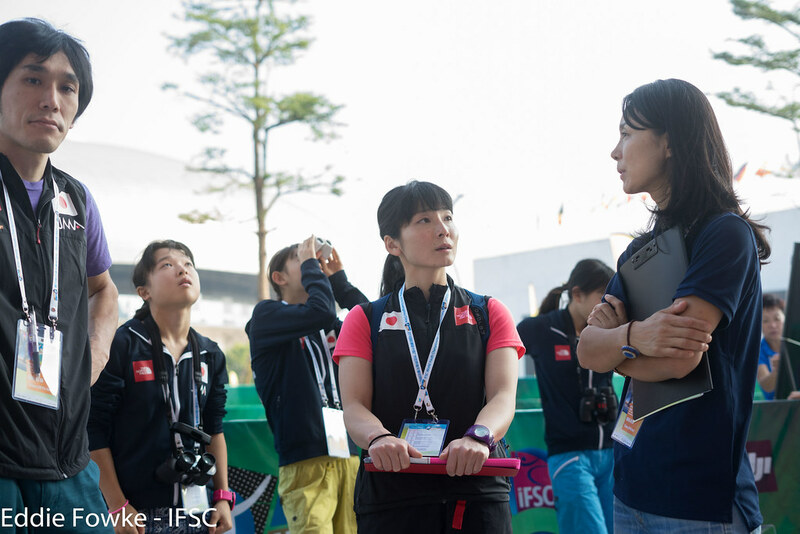 For the Females, Garnbret and Shiraishi continued to amaze in Guangzhou. 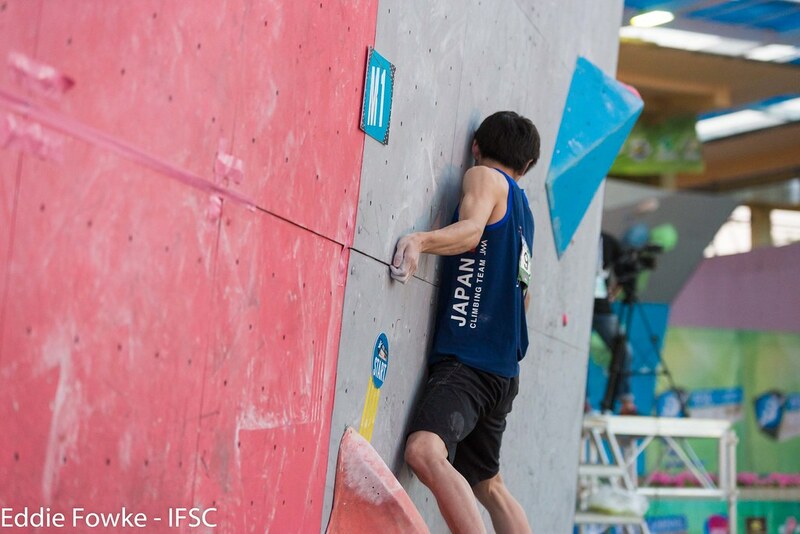 Shiraishi flashed the first three problems on Sunday to secure the double victory. 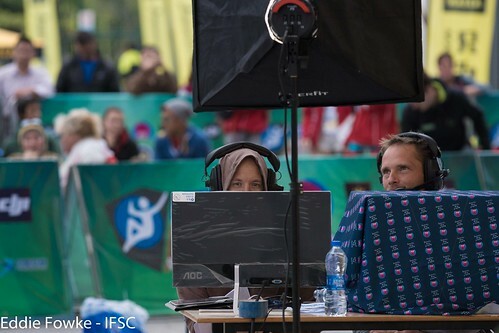 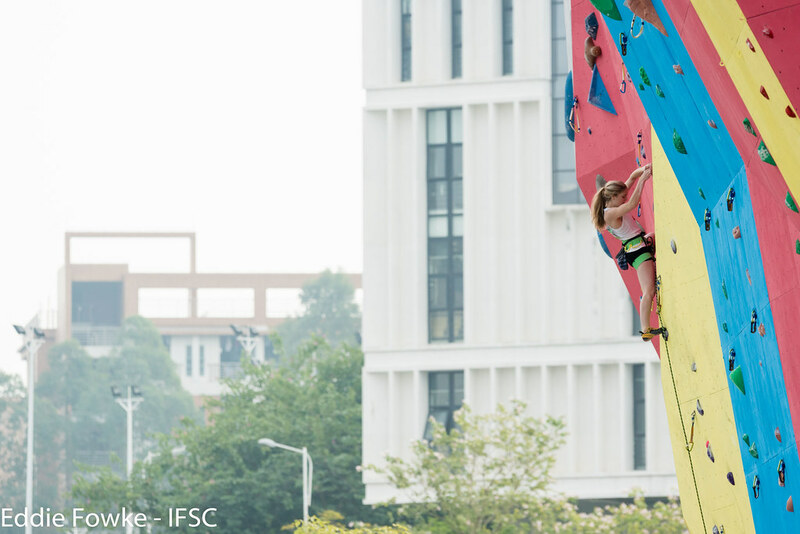 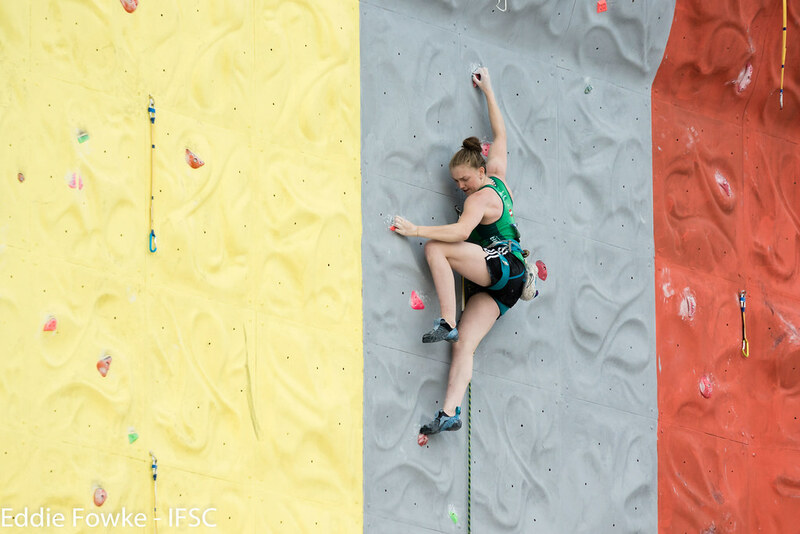 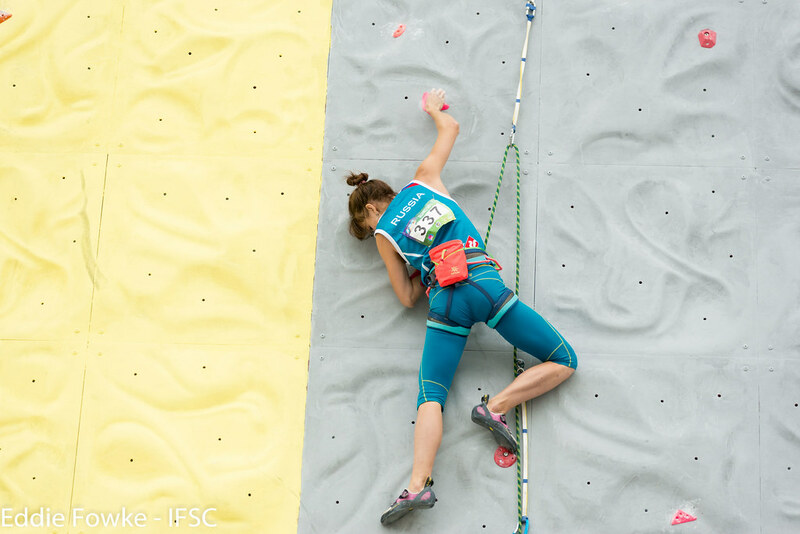 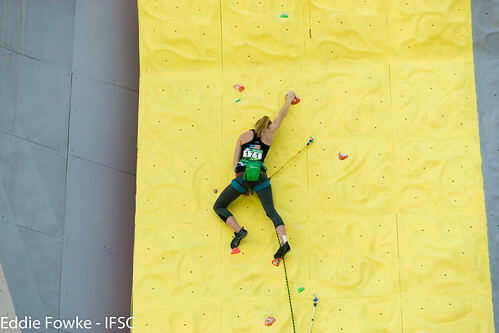 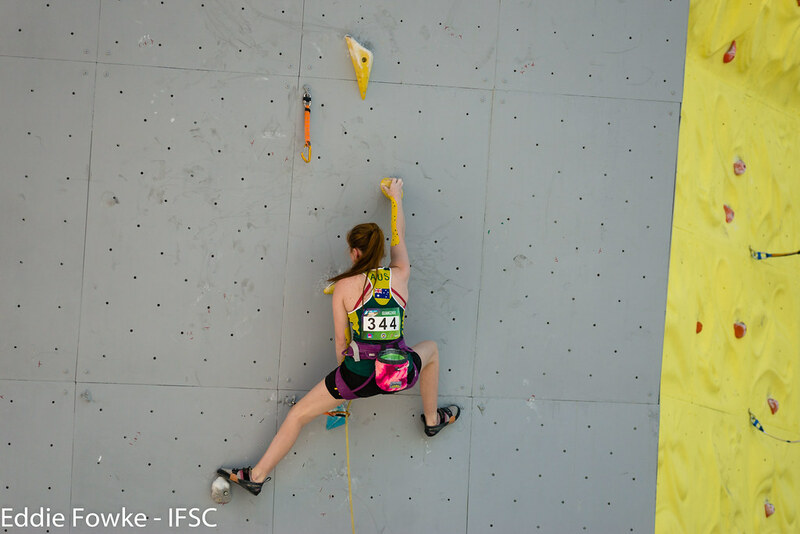 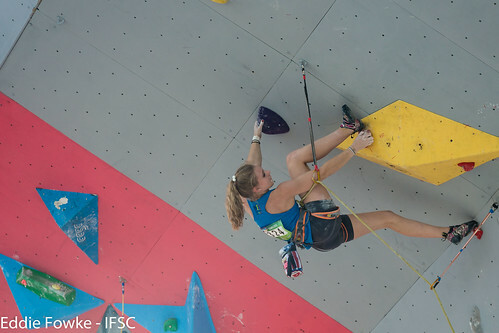 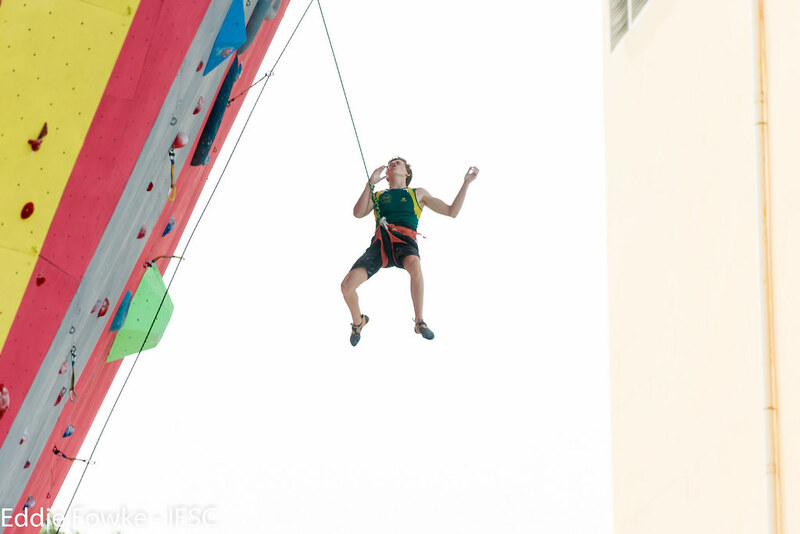 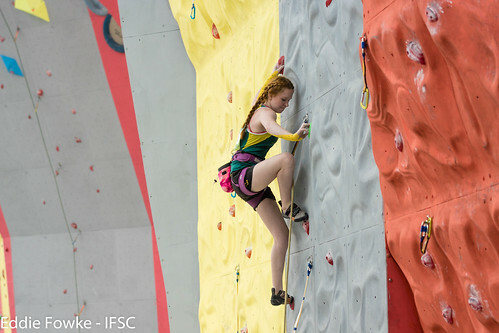 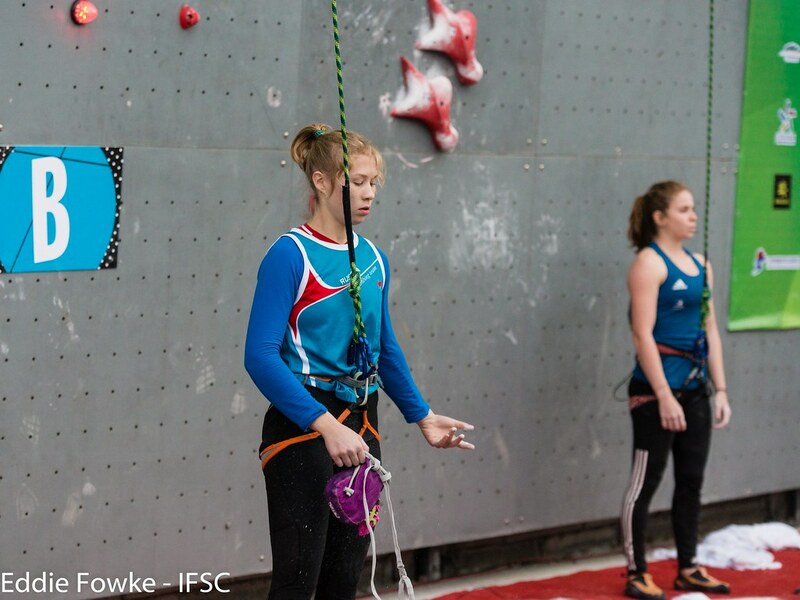 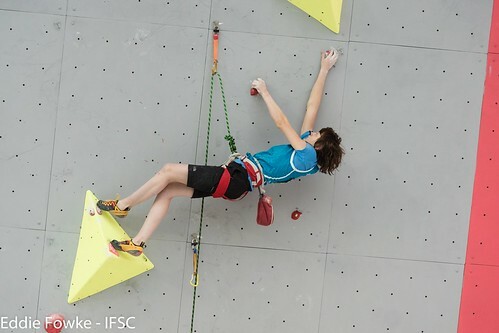 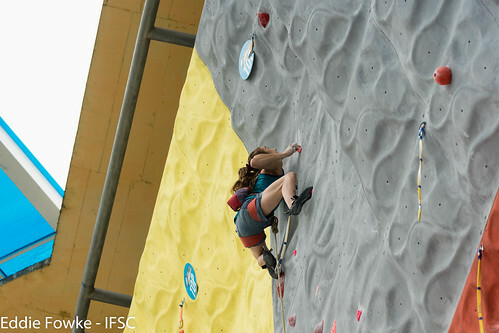 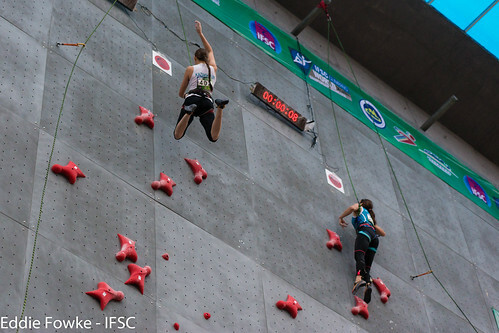 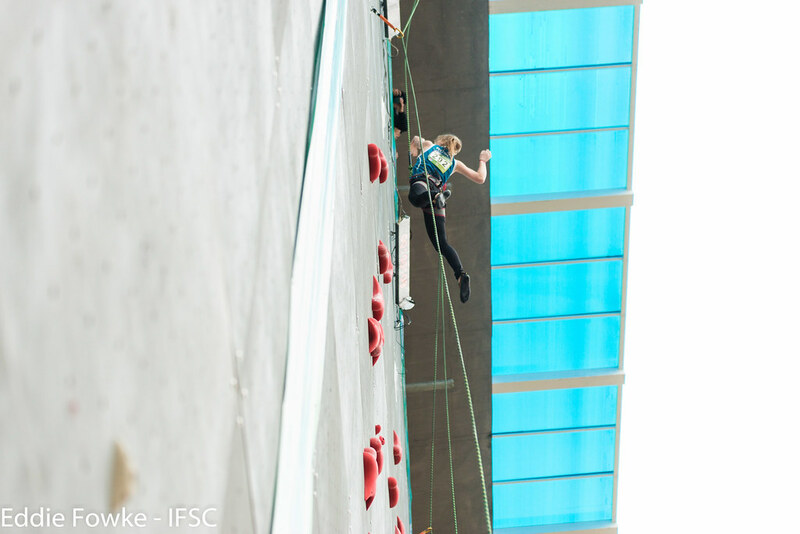 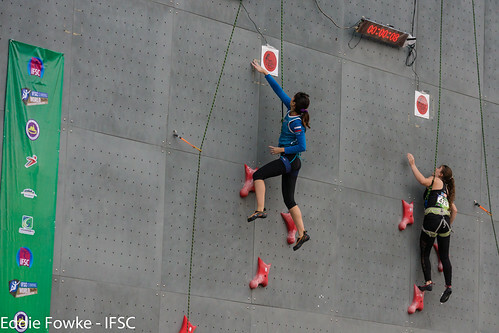 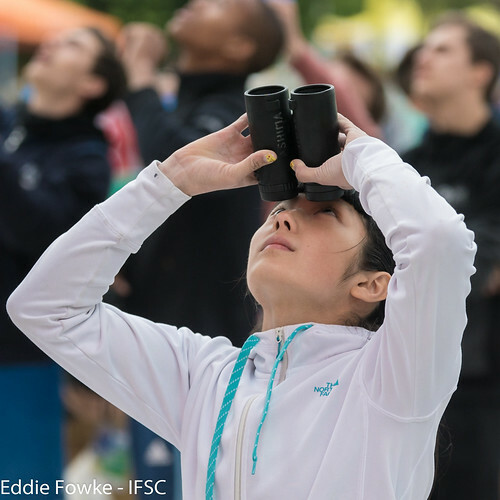 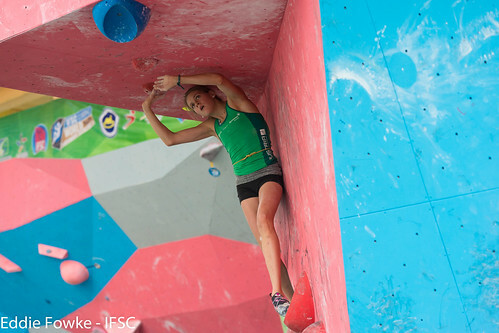 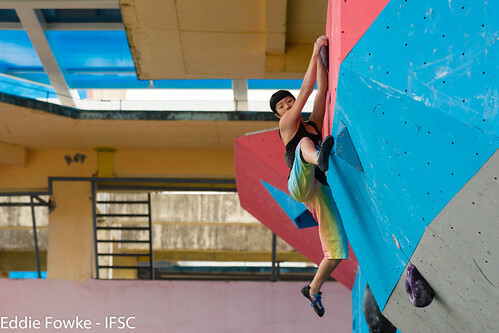 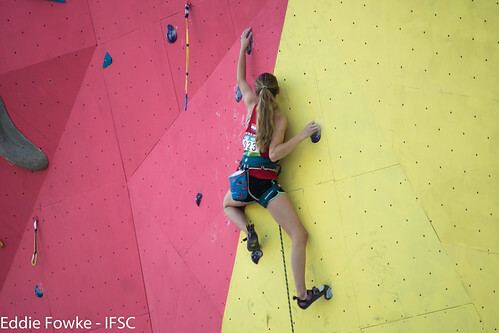 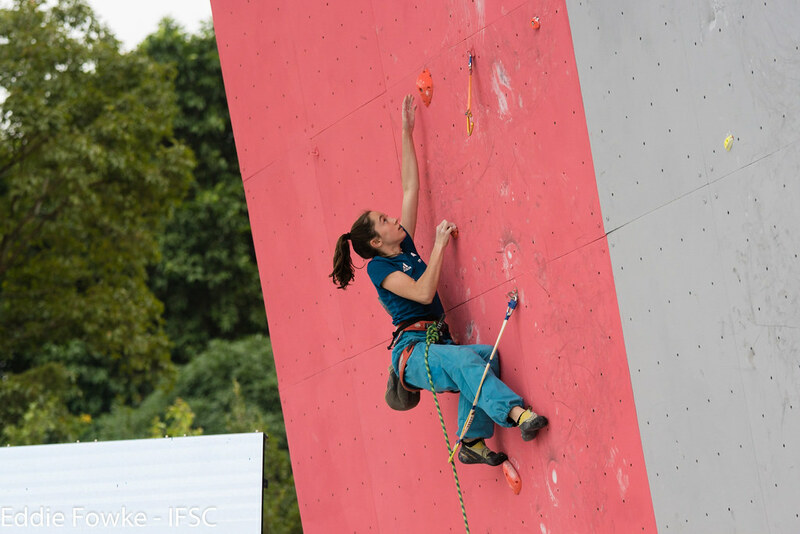 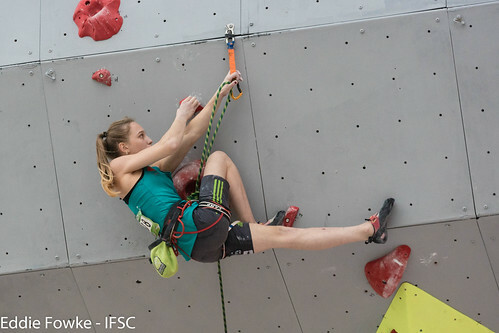 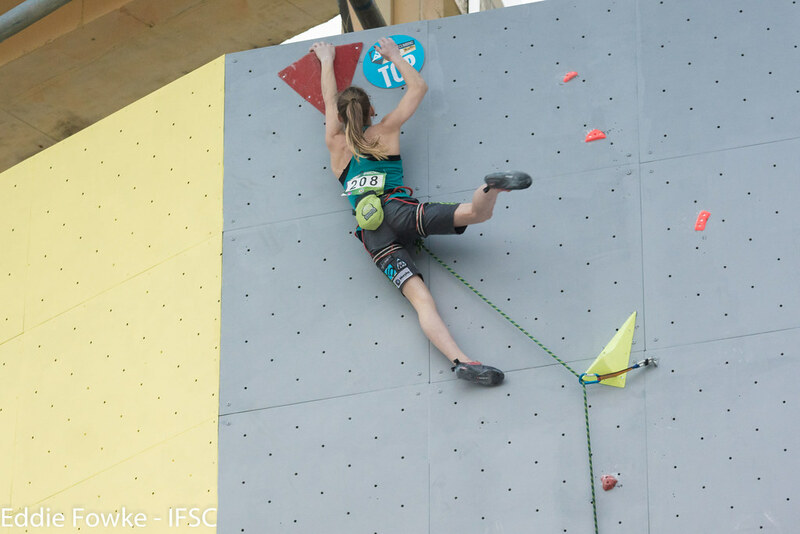 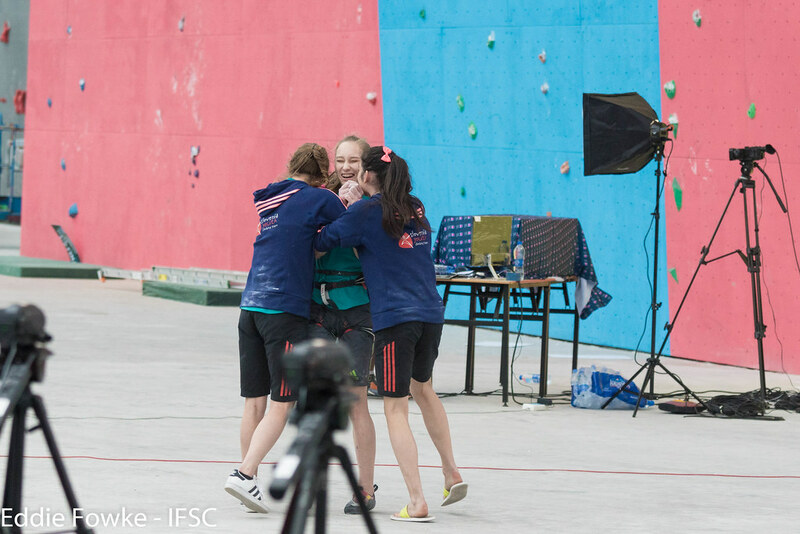 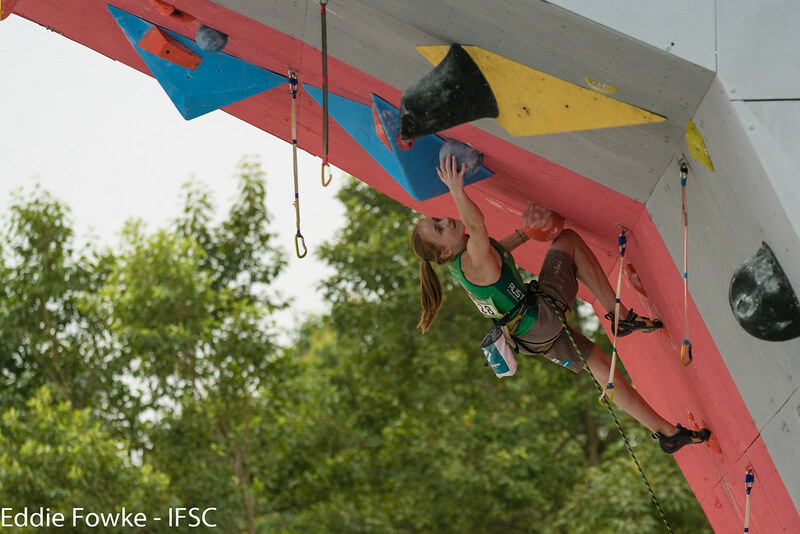 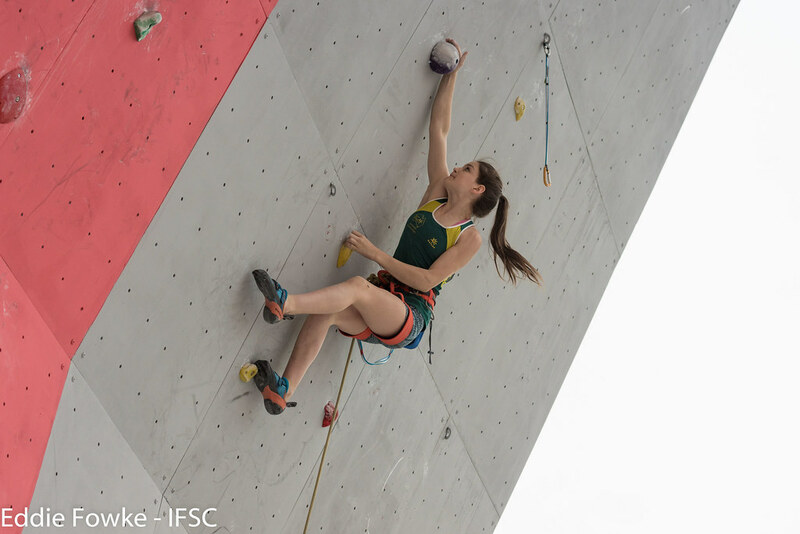 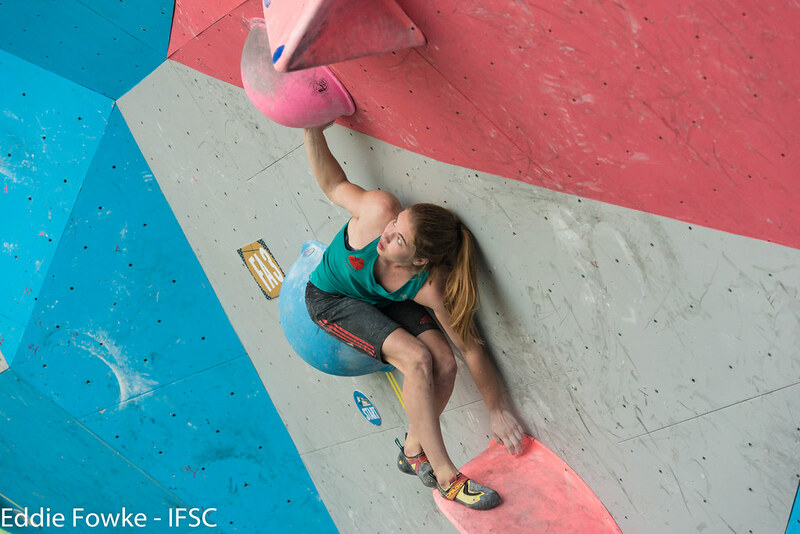 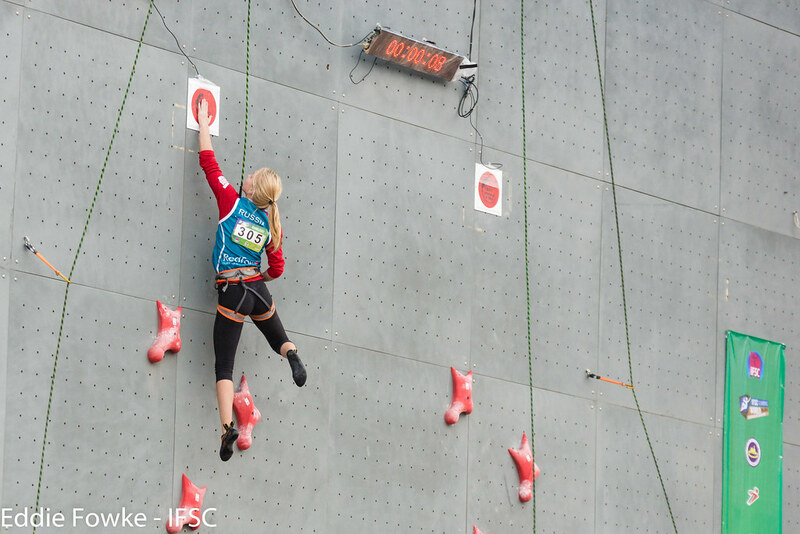 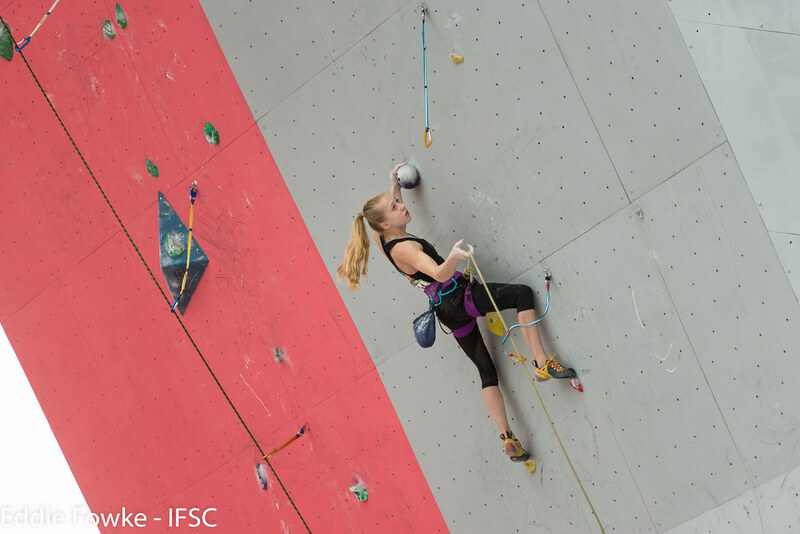 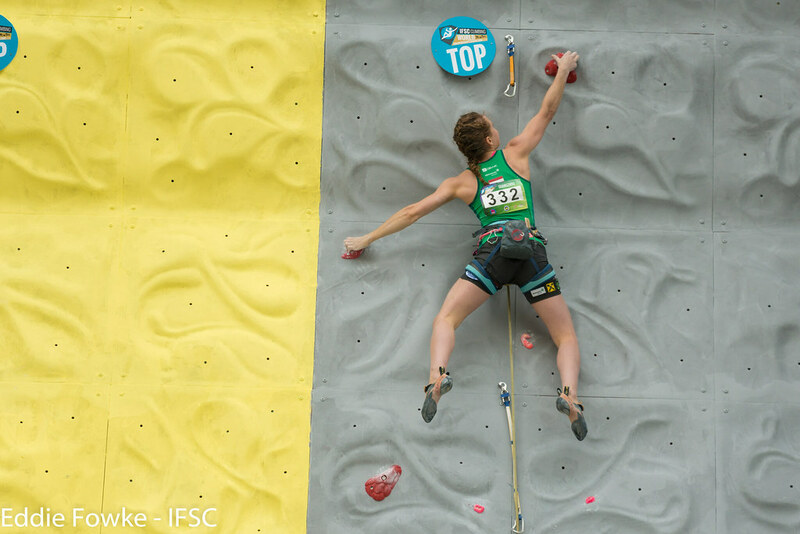 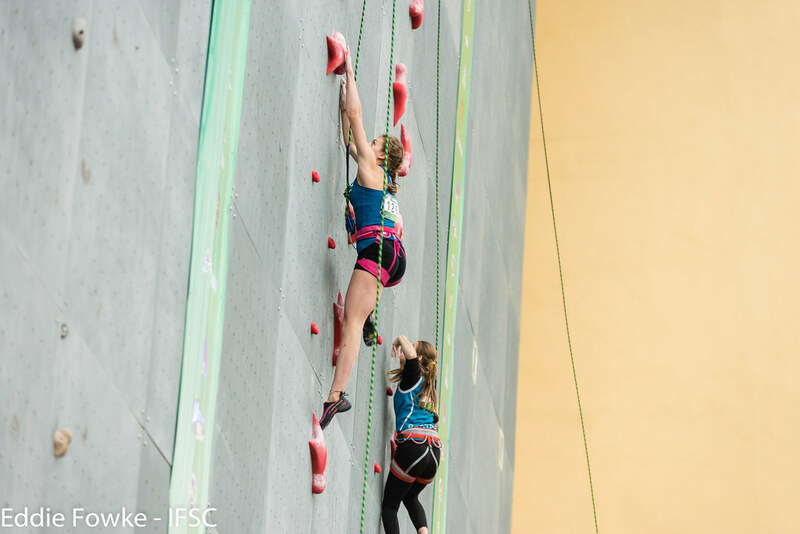 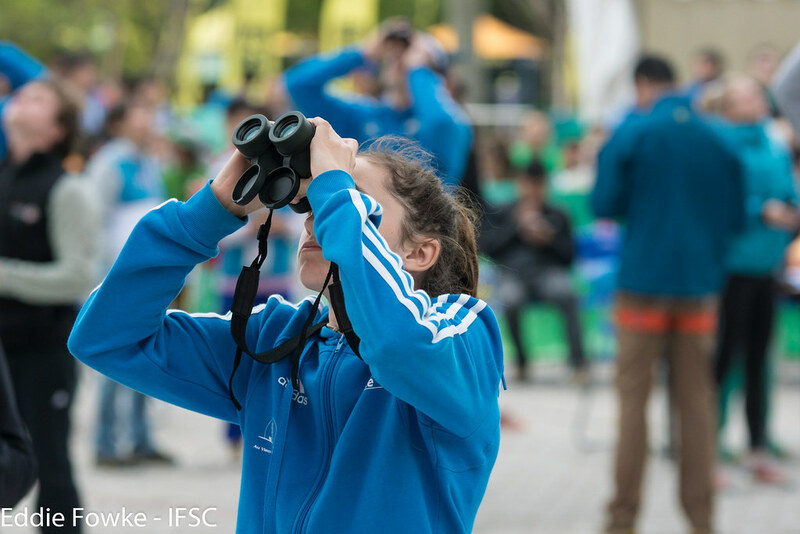 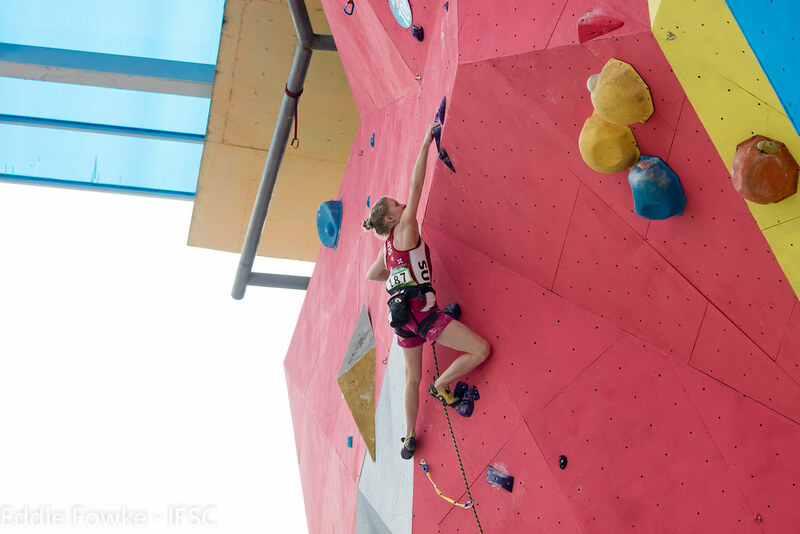 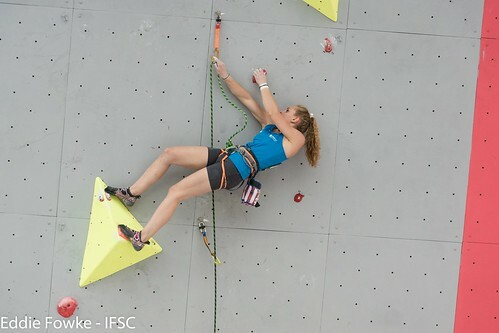 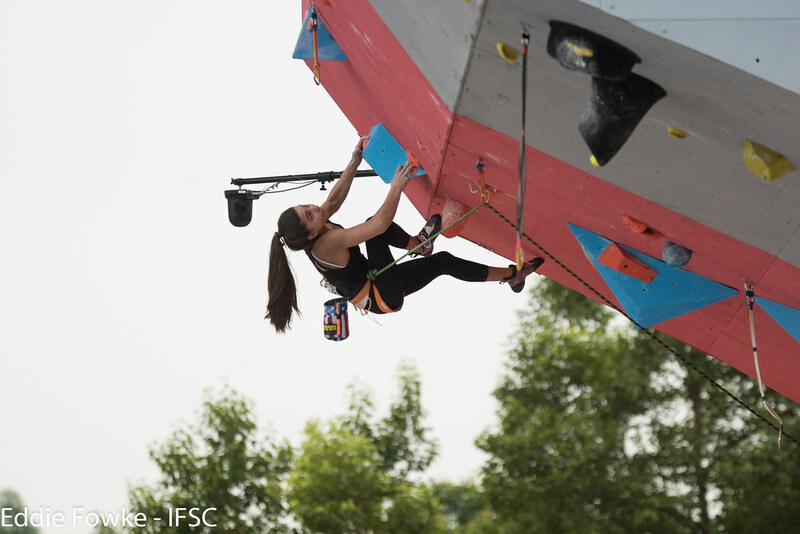 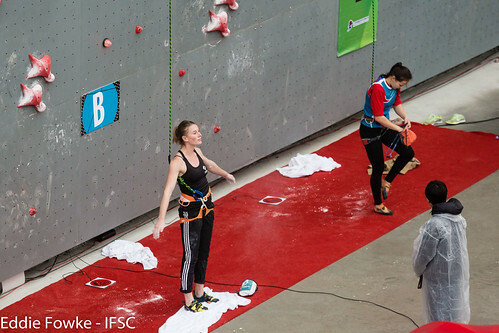 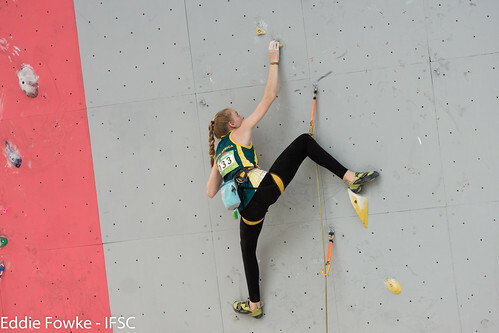 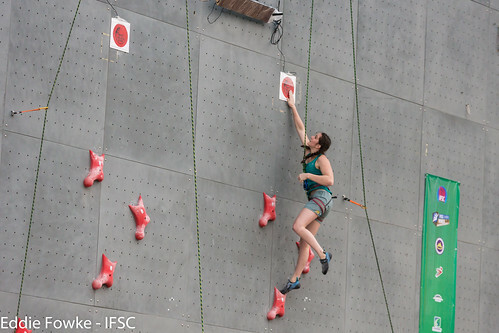 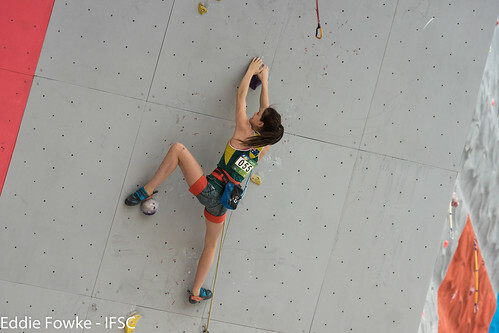 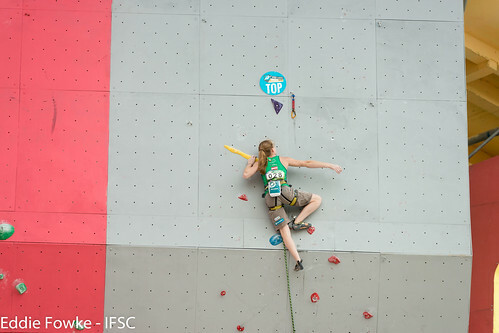 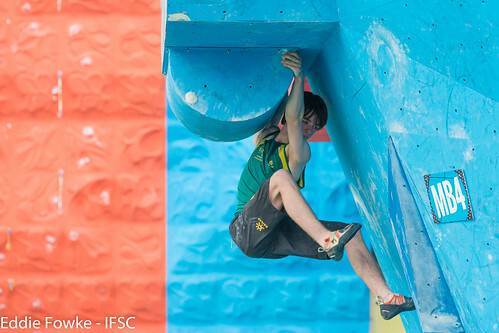 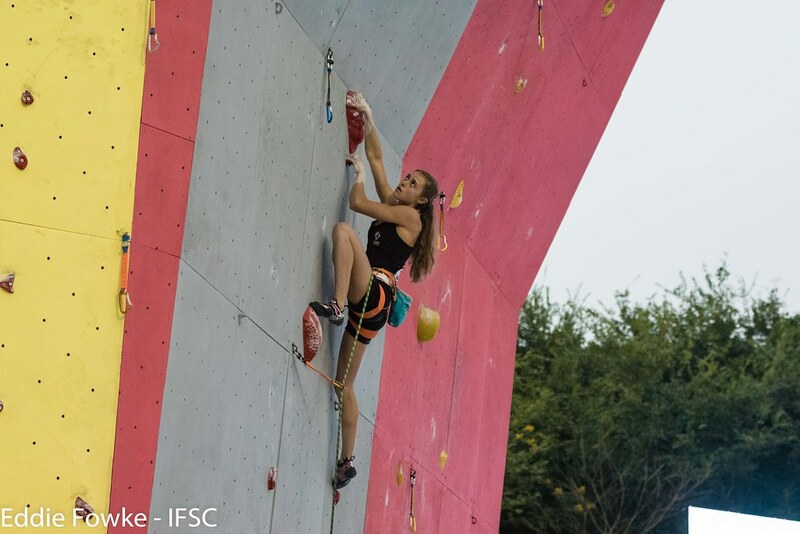 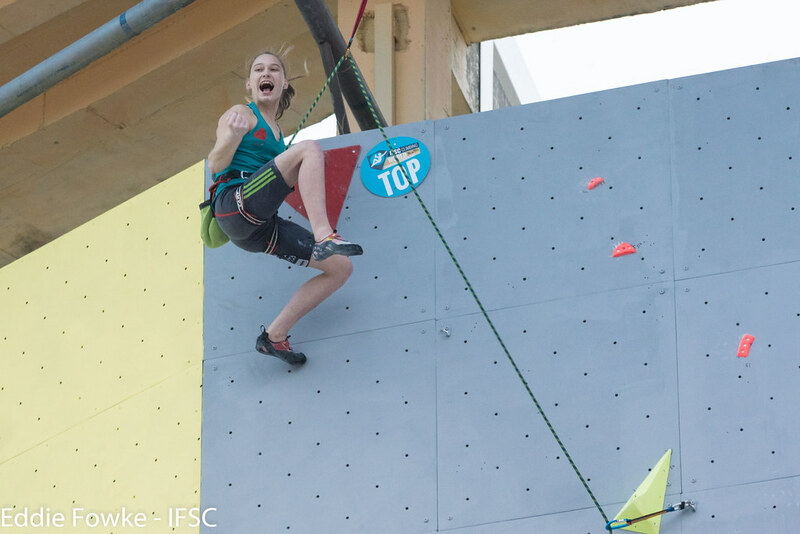 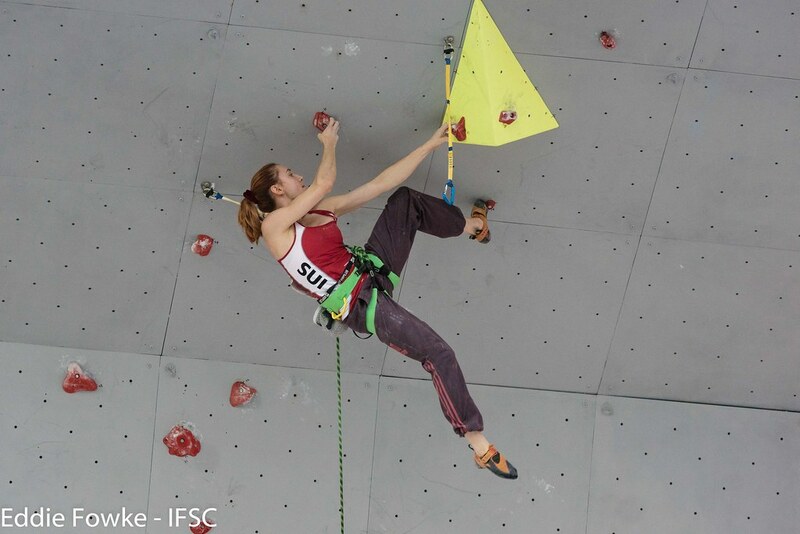 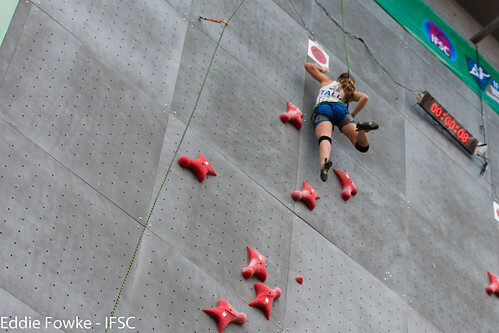 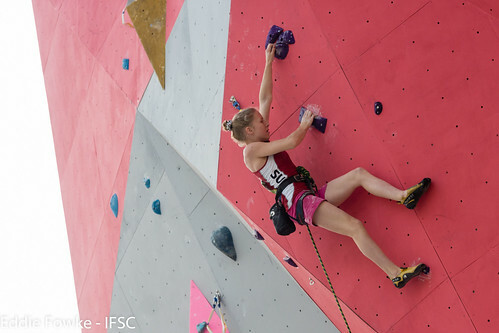 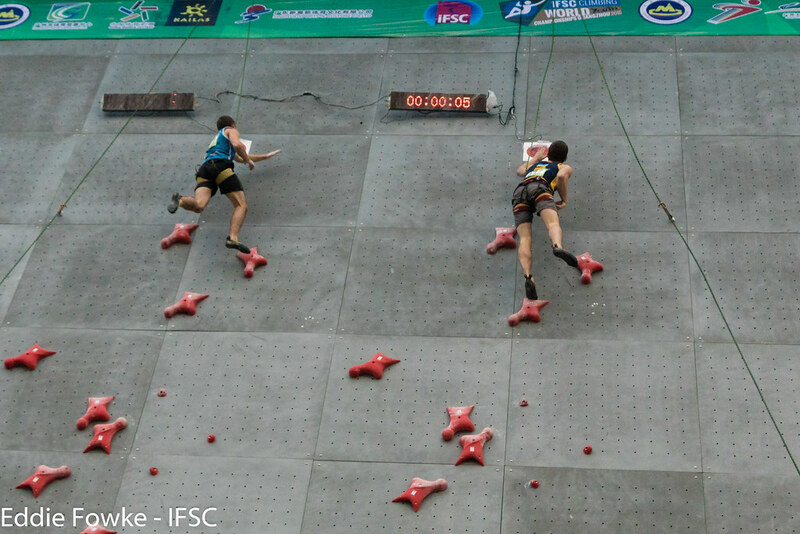 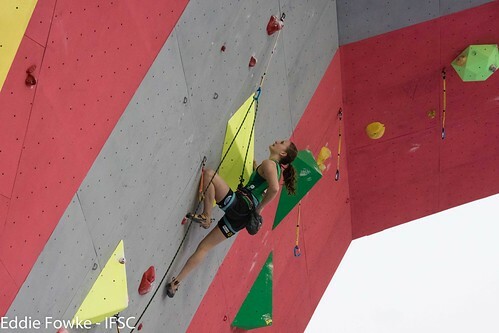 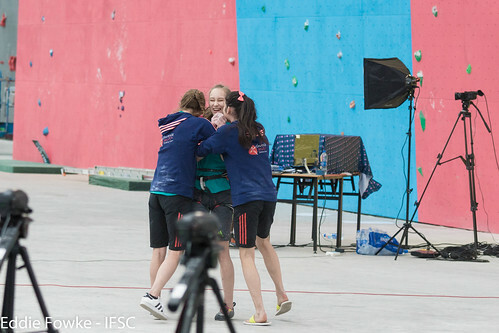 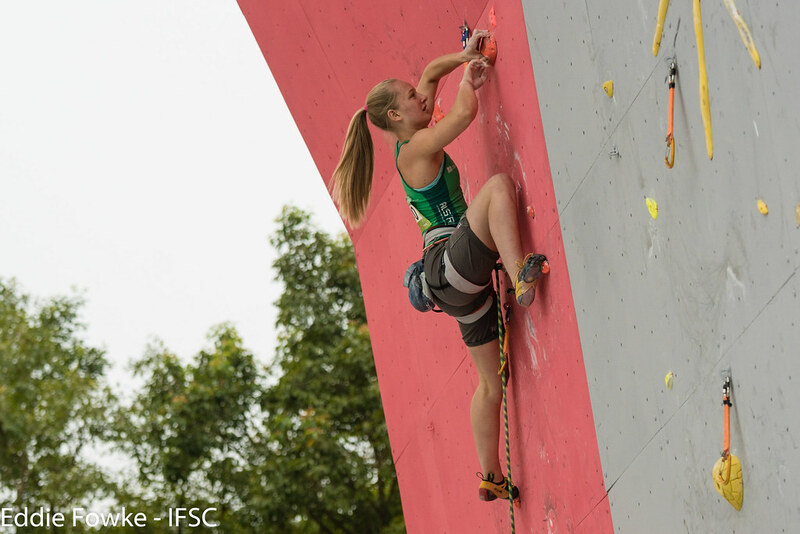 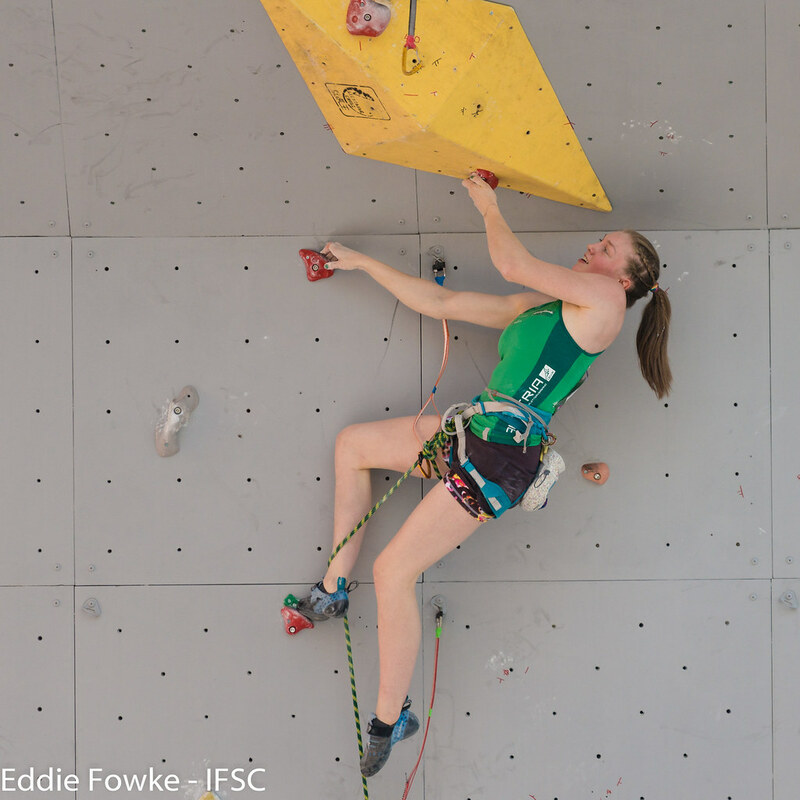 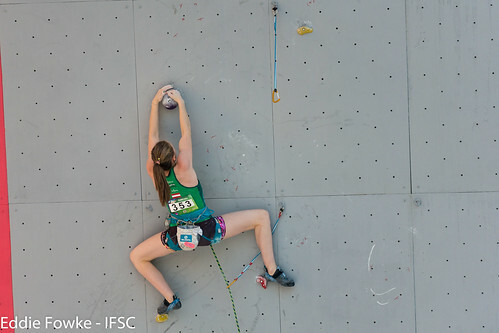 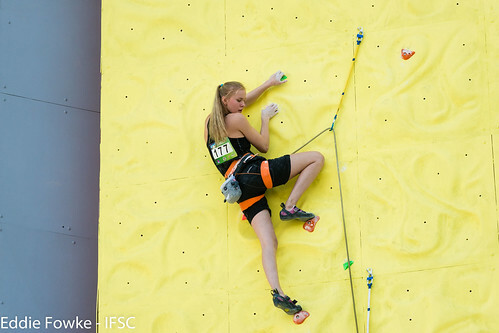 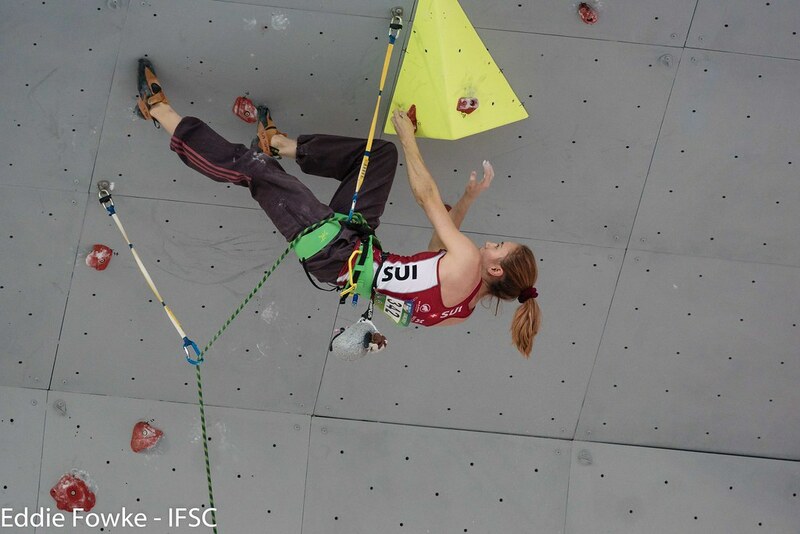 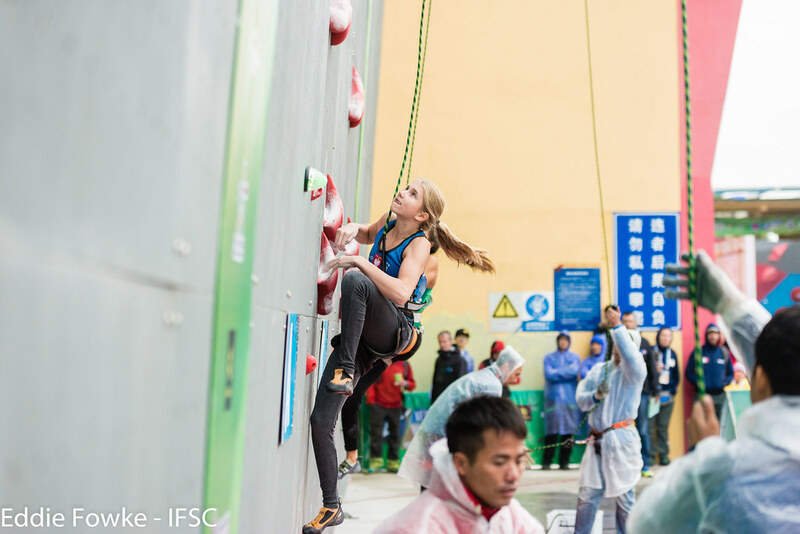 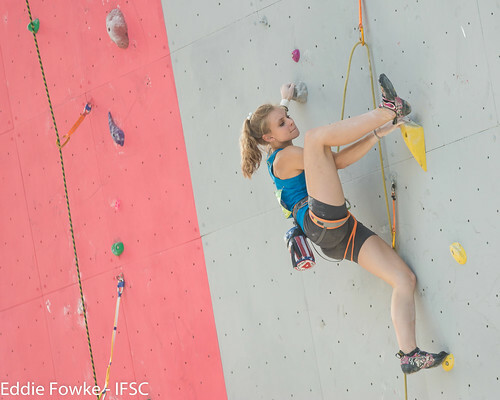 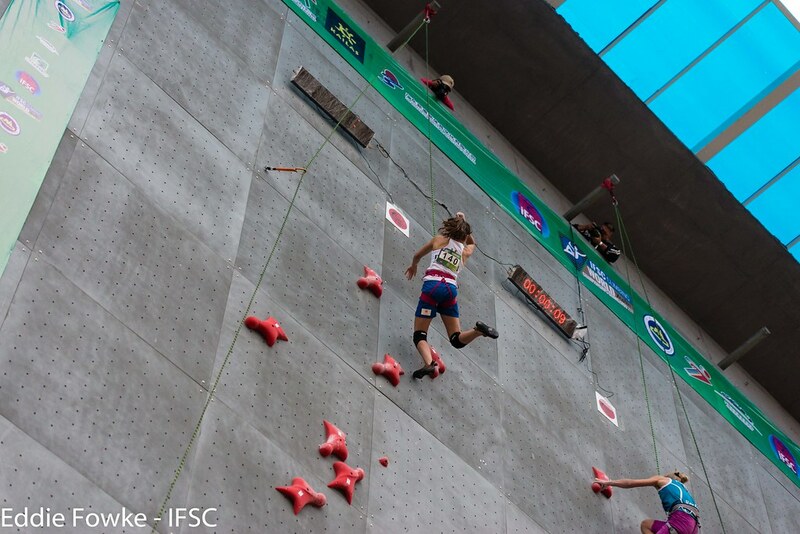 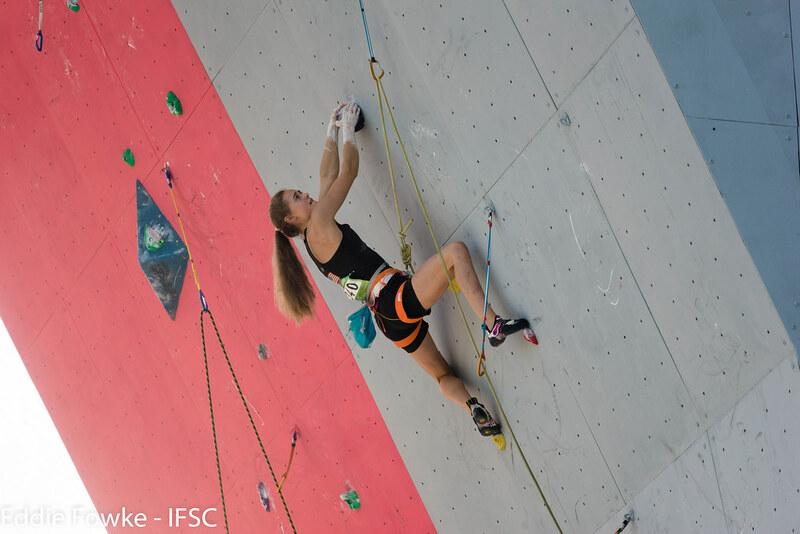 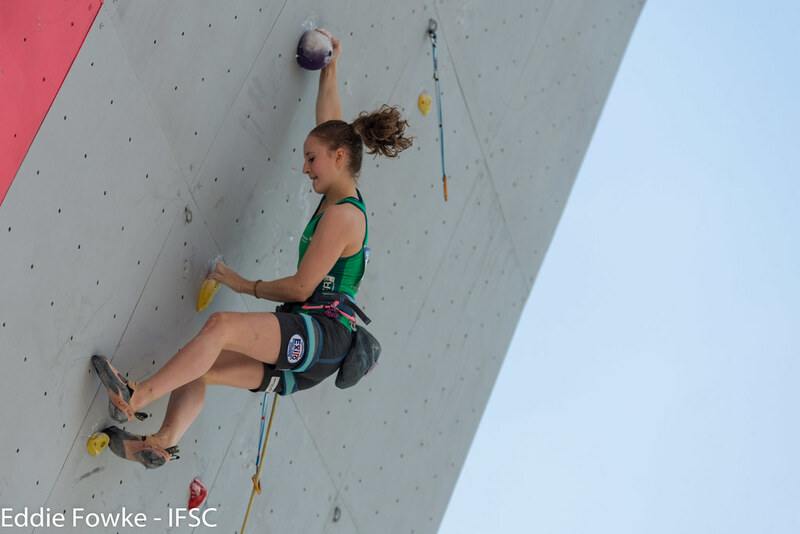 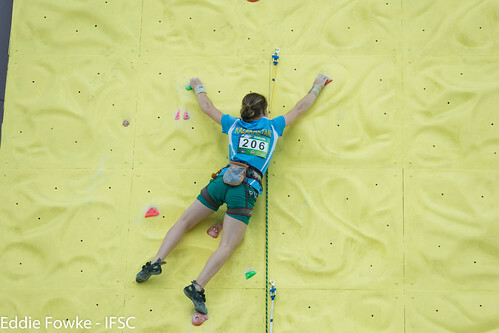 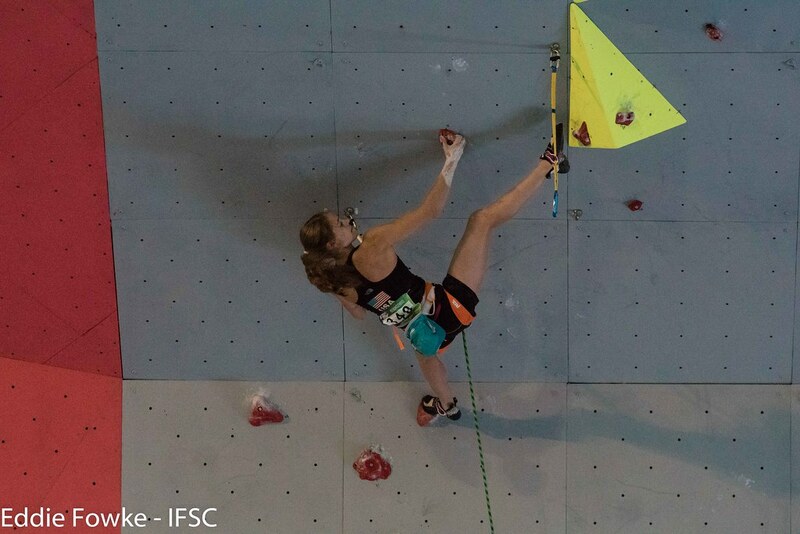 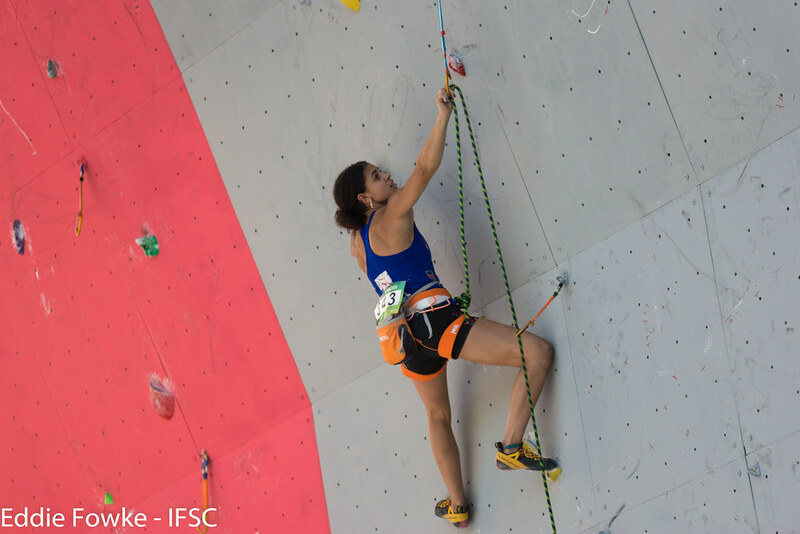 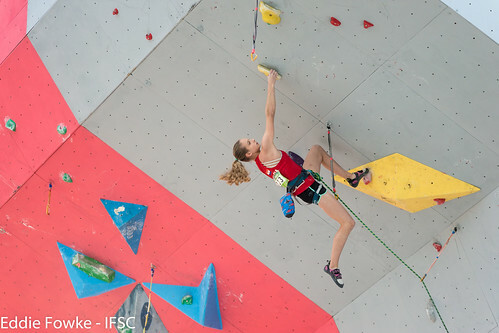 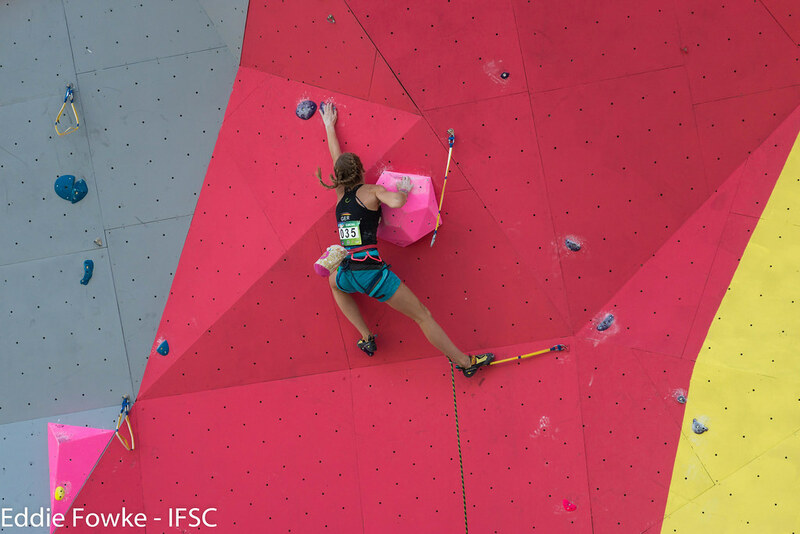 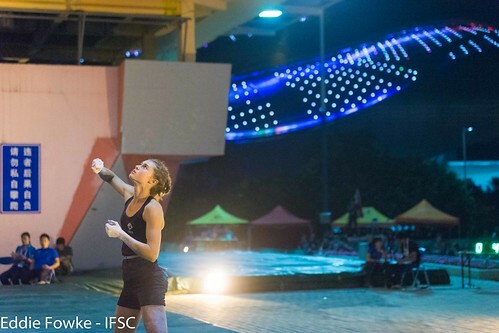 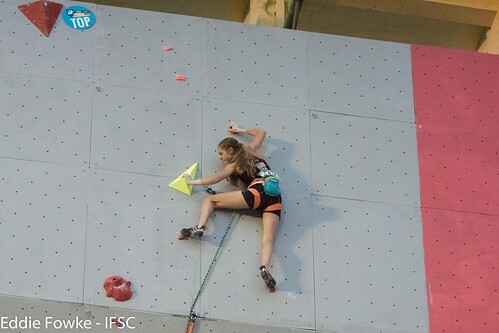 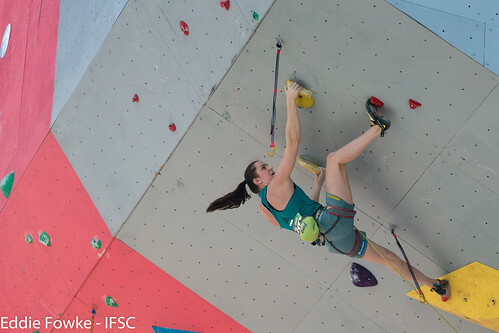 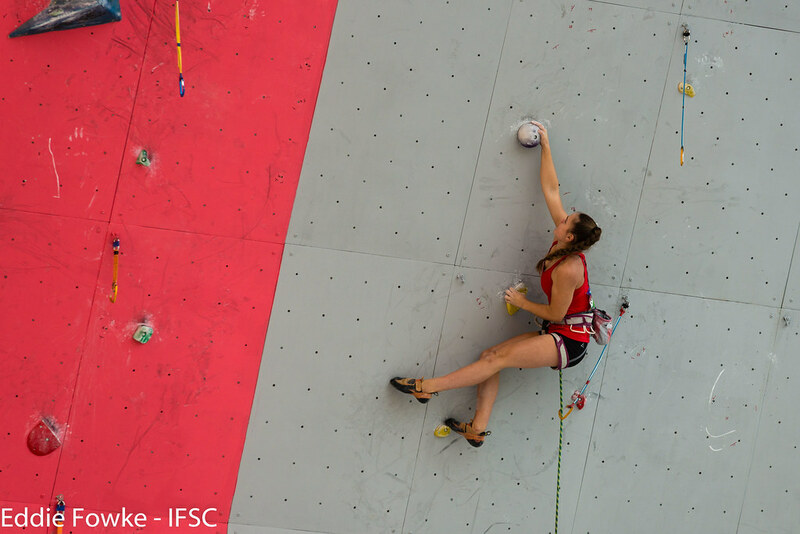 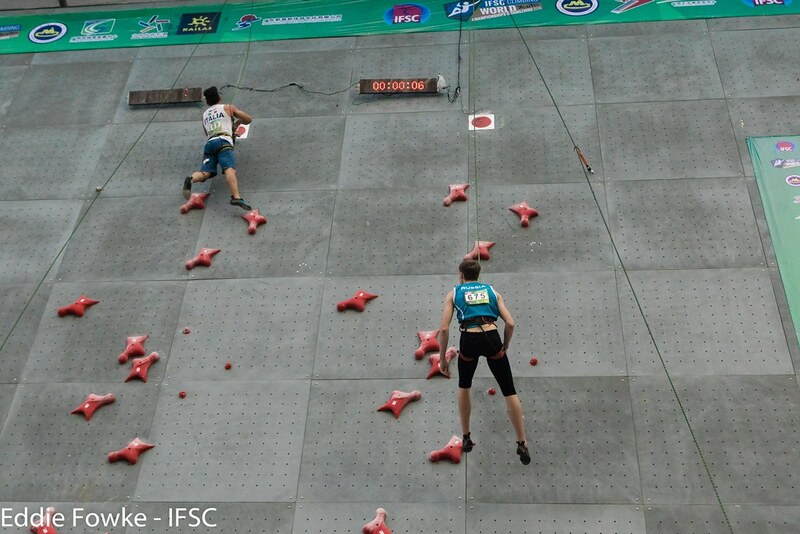 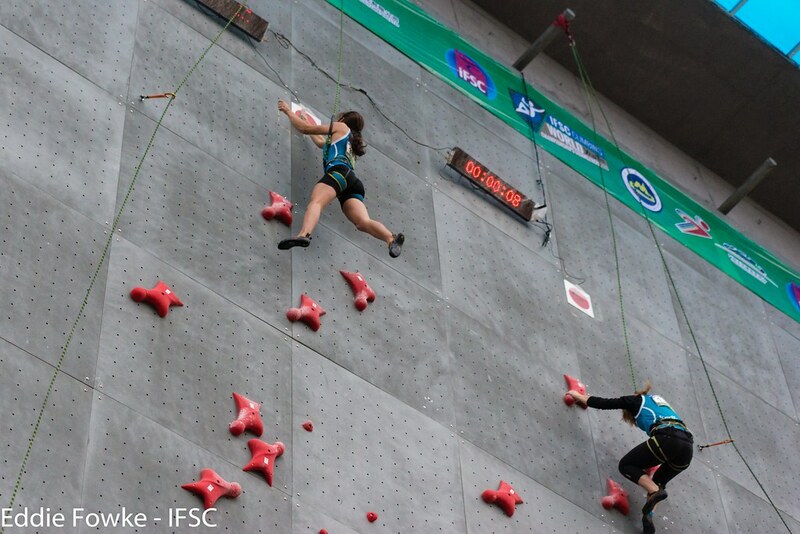 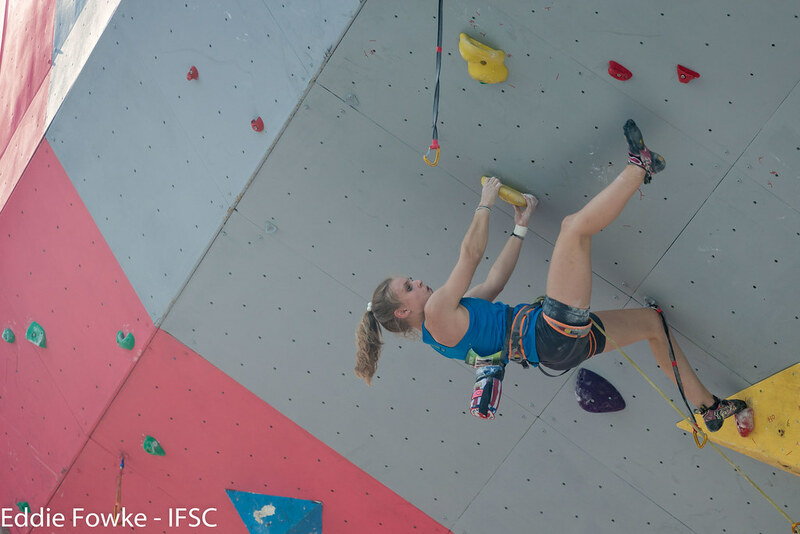 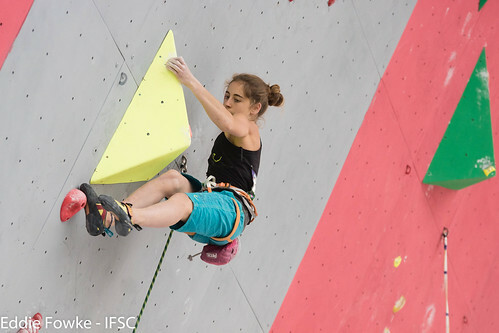 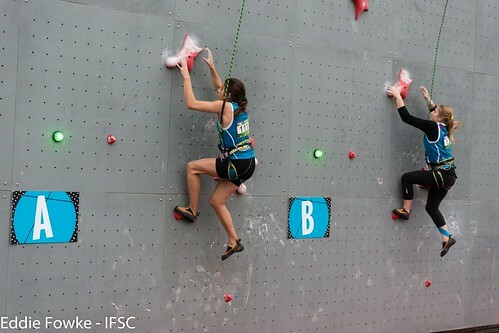 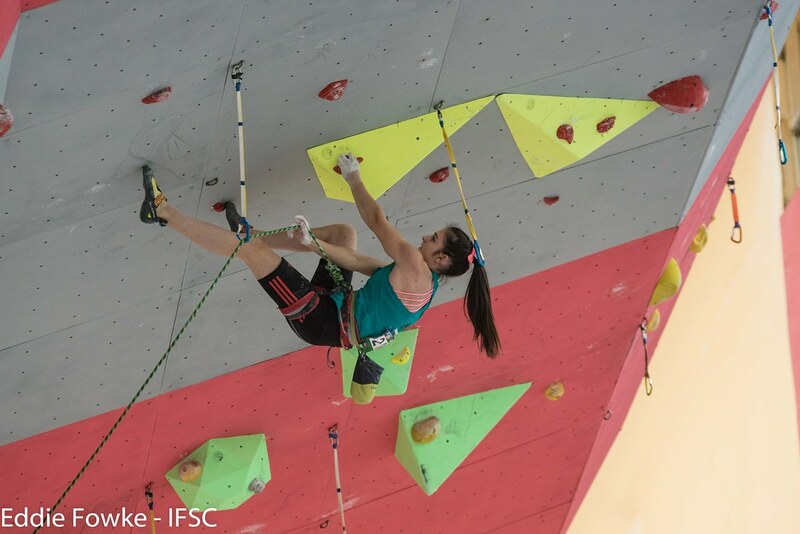 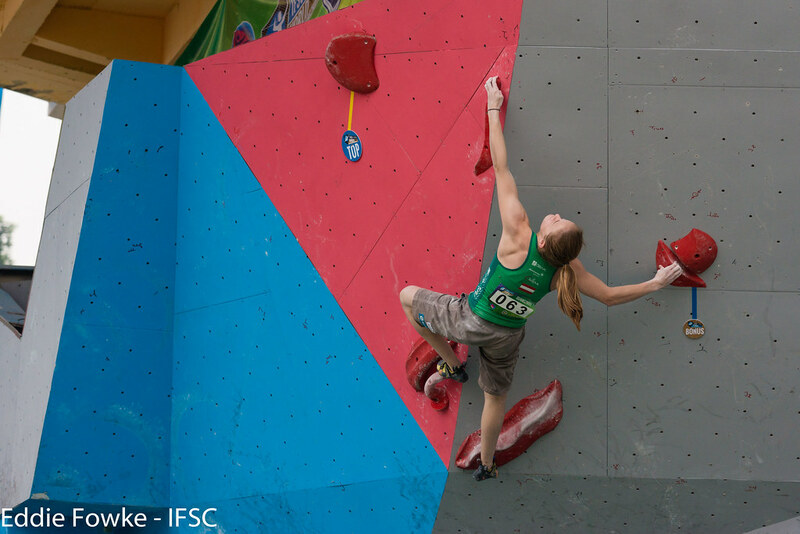 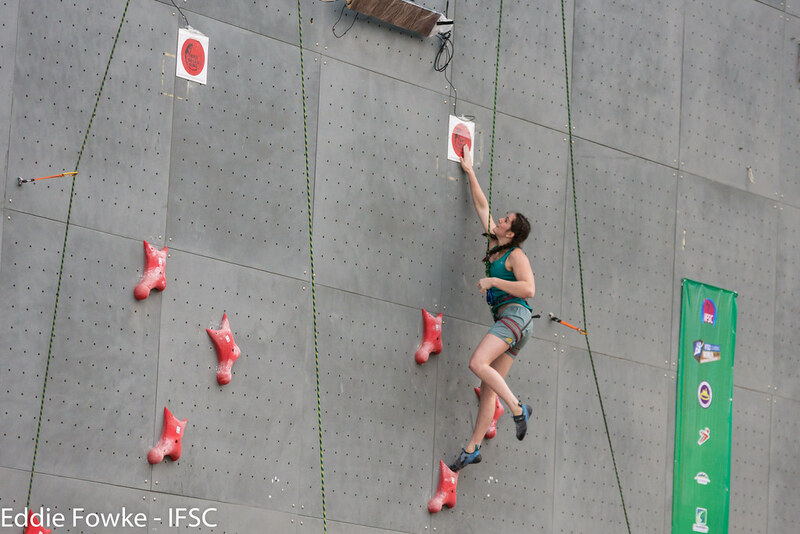 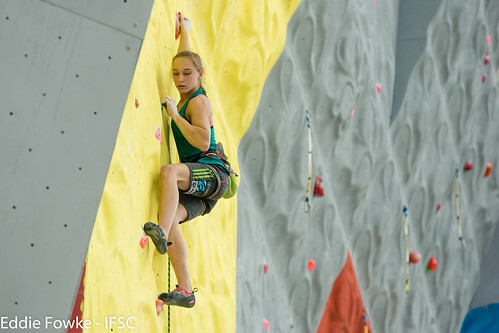 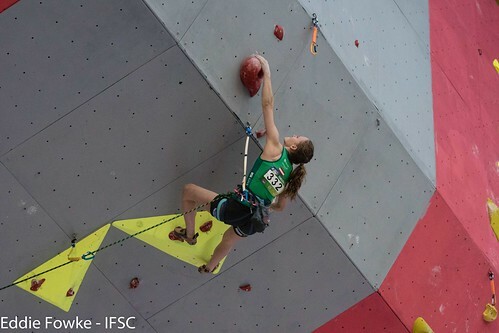 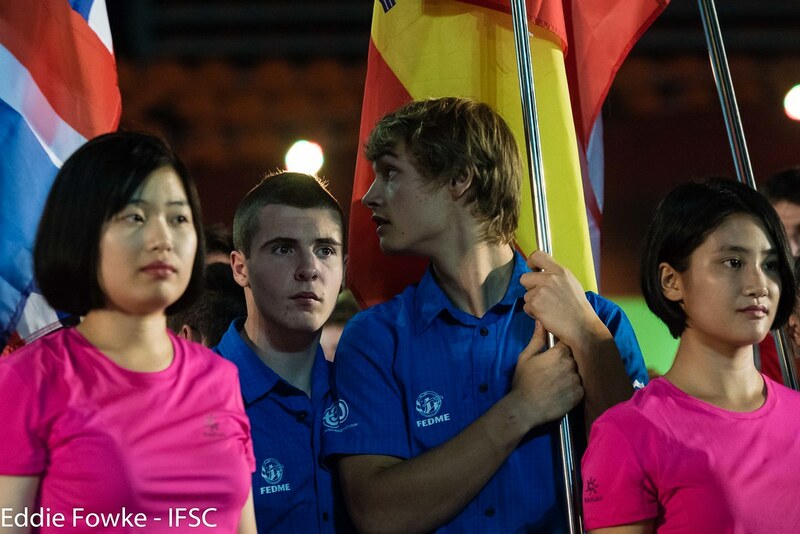 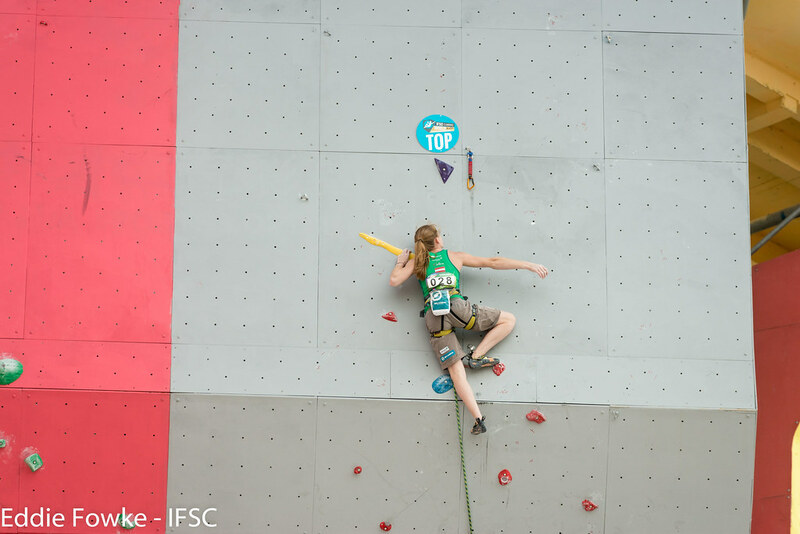 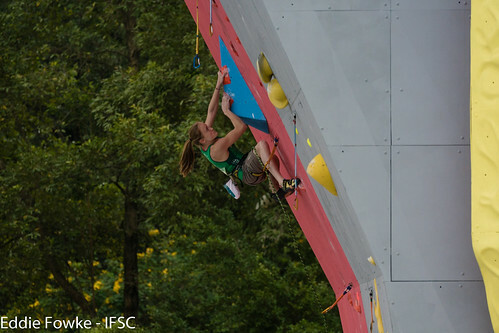 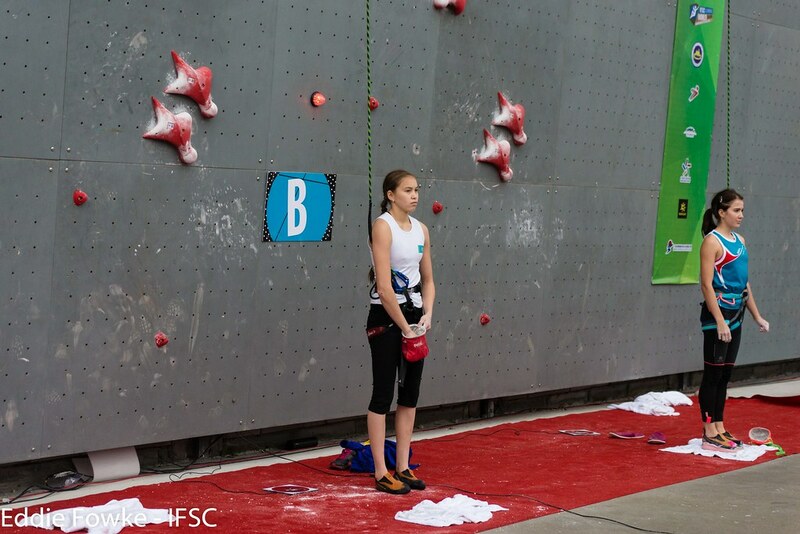 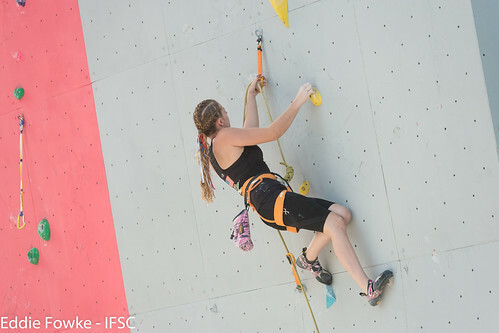 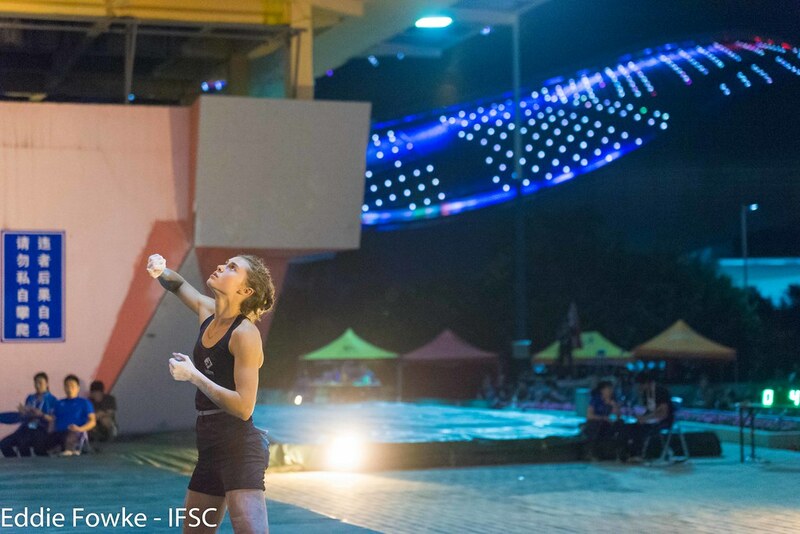 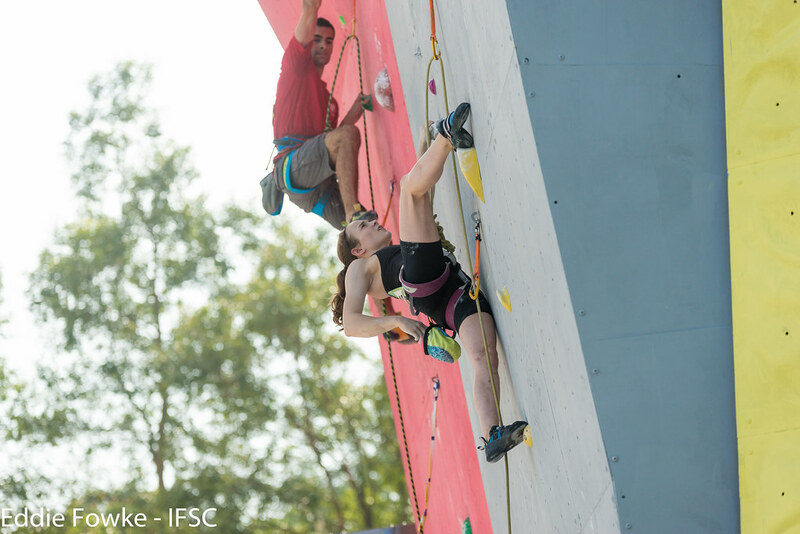 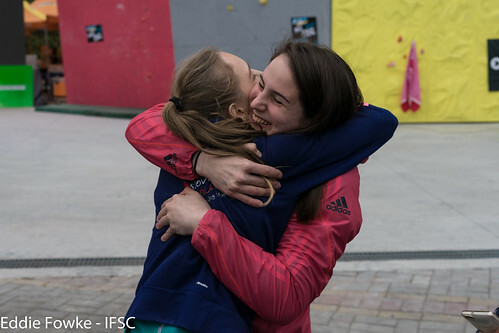 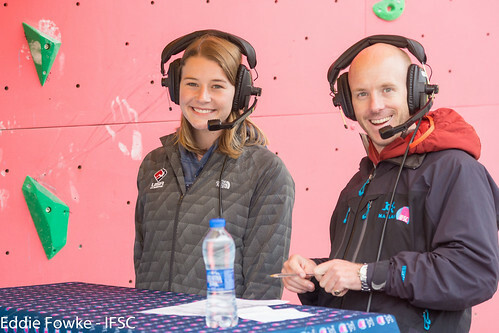 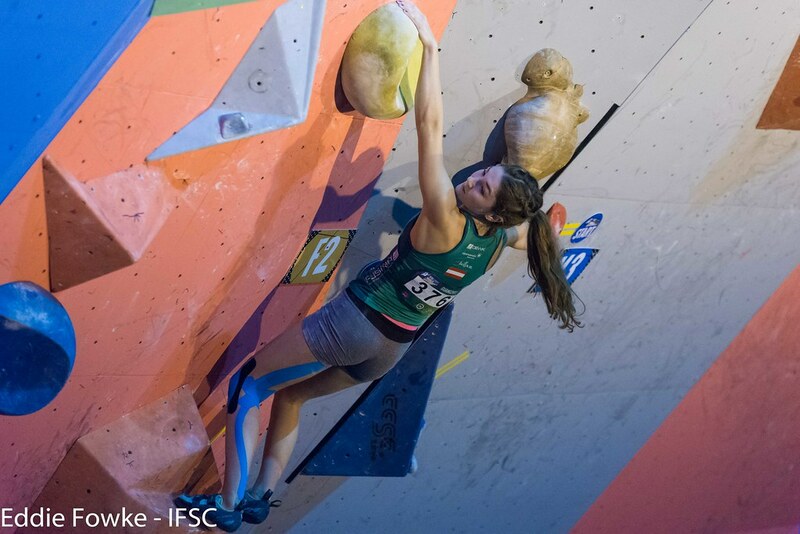 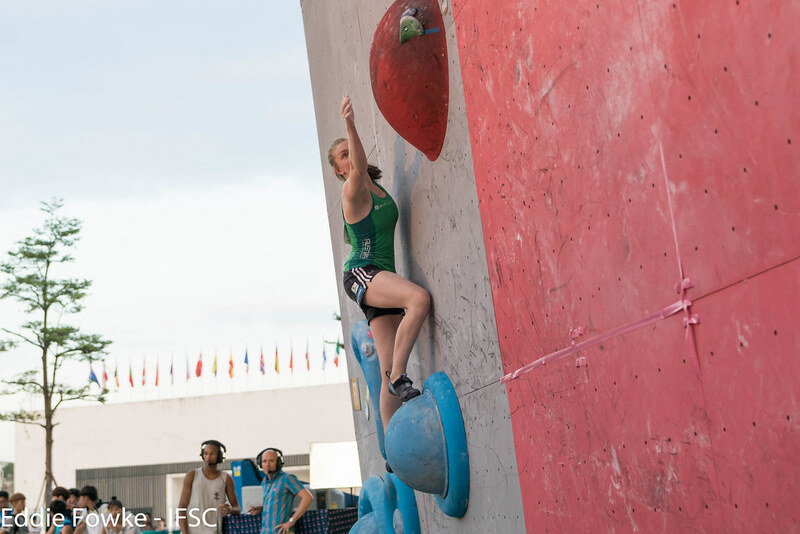 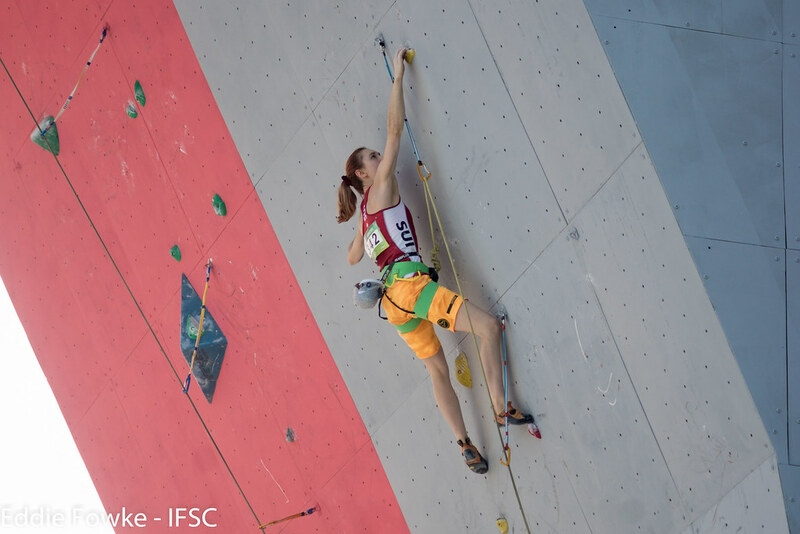 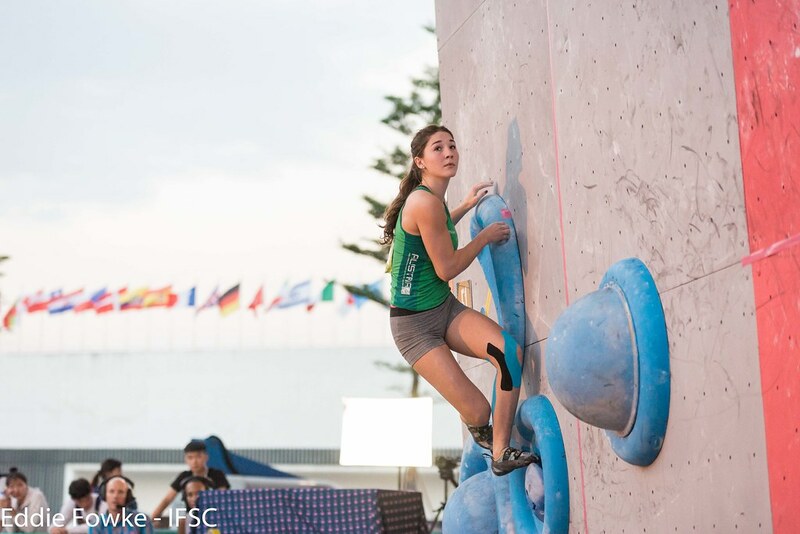 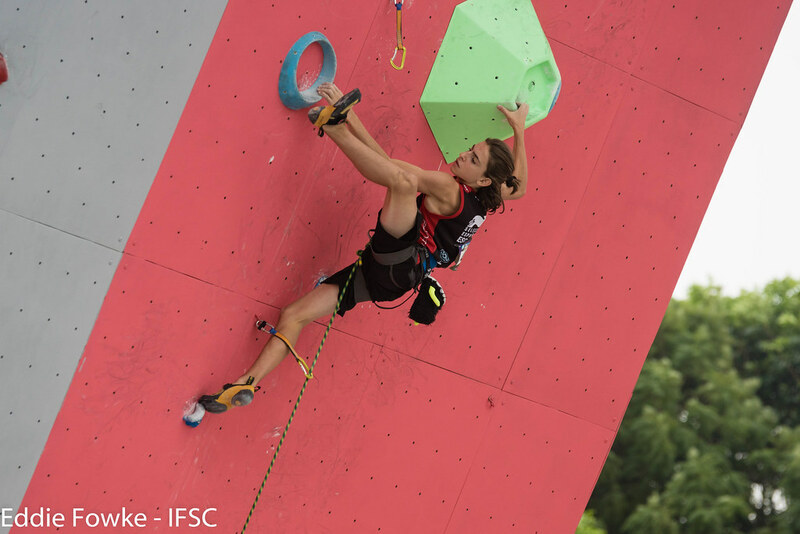 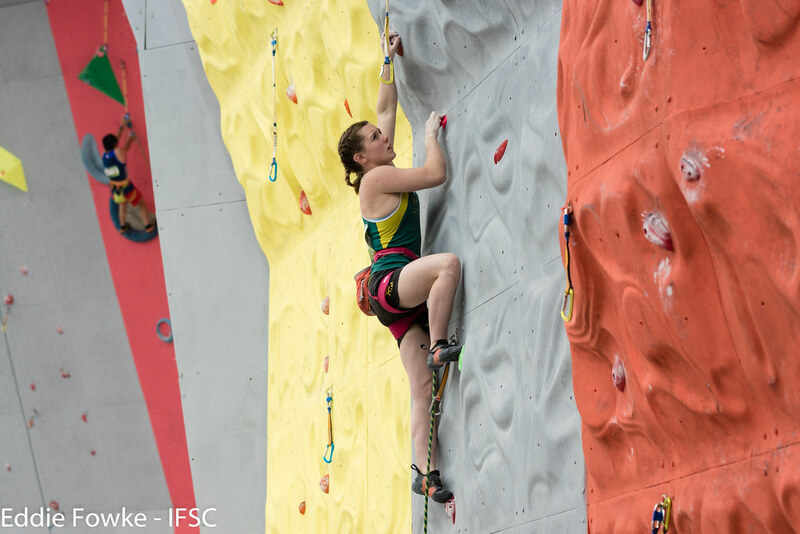 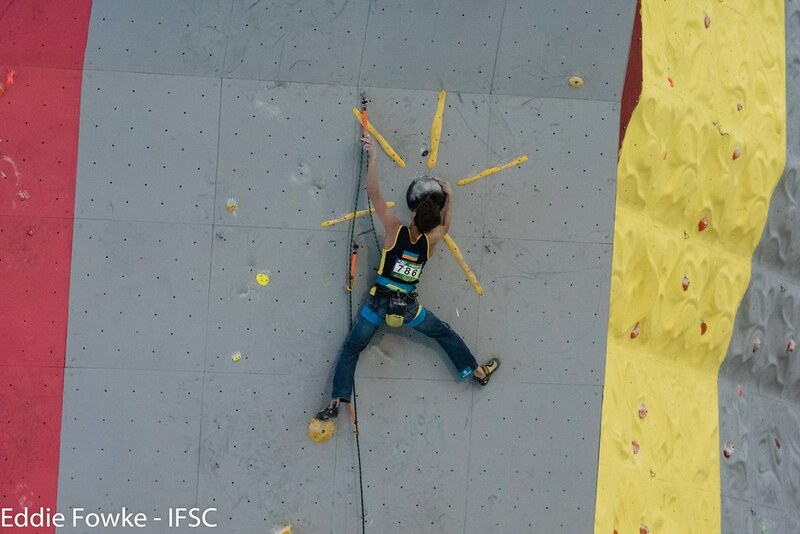 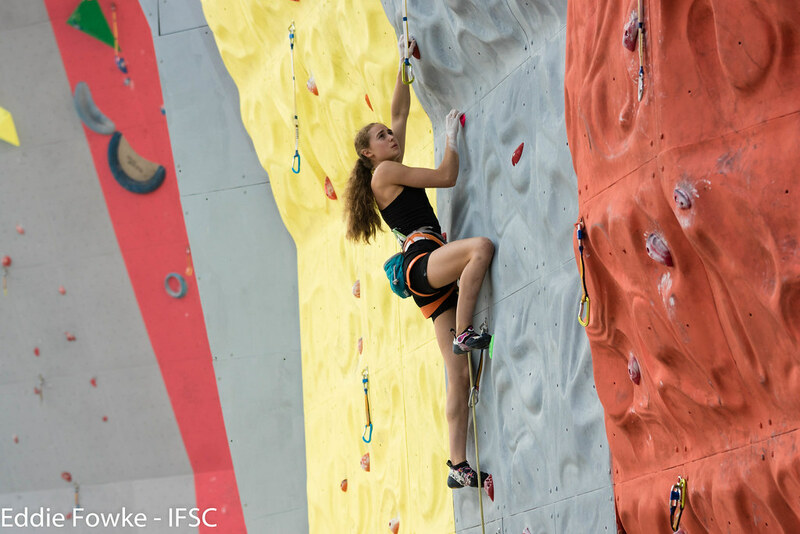 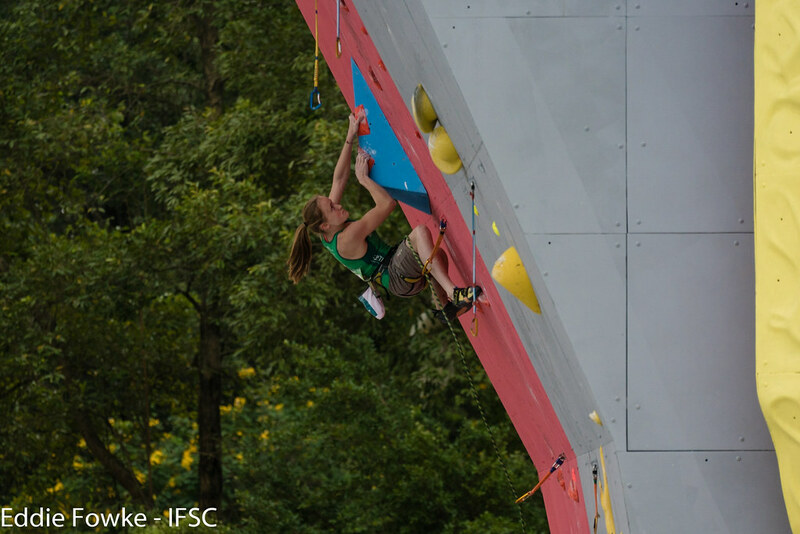 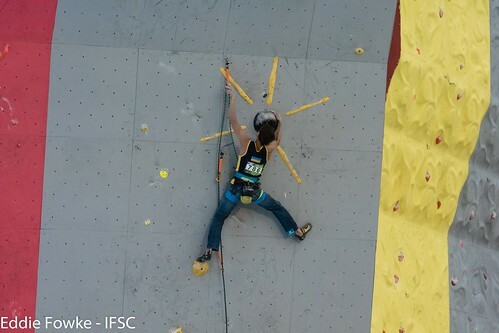 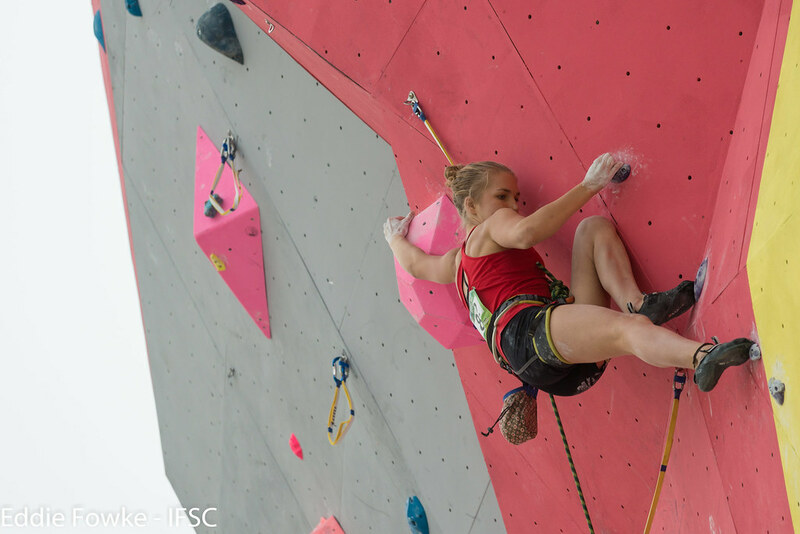 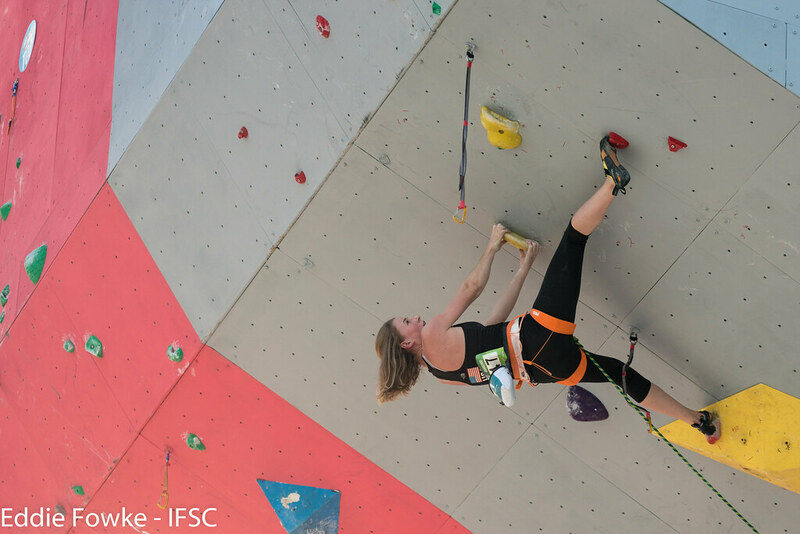 She has yet to lose at the IFSC World Youth Championships! Raboutou kept Rogora off the podium and added another medal to her week by finding all bonus holds, and Futaba Ito of Japan placed second with one less attempt on two Tops. 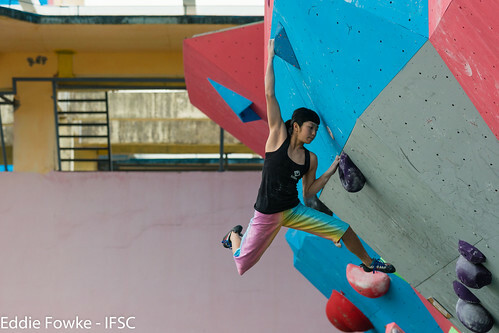 Garnbret was in a league of her own in Youth A, completing every problem and flashing two. The next closest competitor was Garnbret’s teammate Lukan, who finished two problems in three attempts. 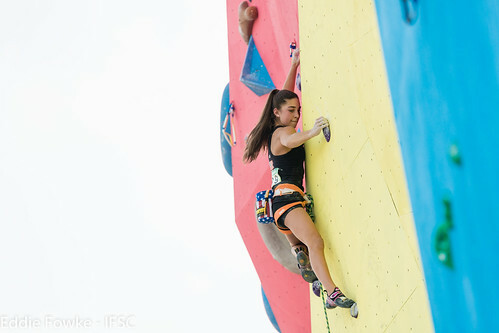 American Maya Madere placed third. Also distinguishing herself in the Finals was Hayes. 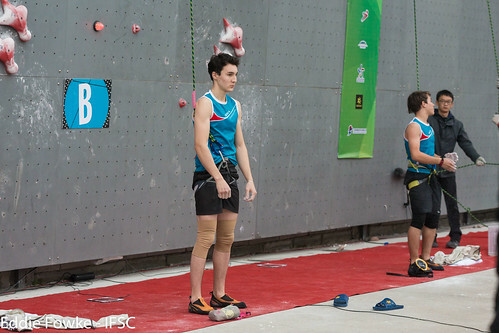 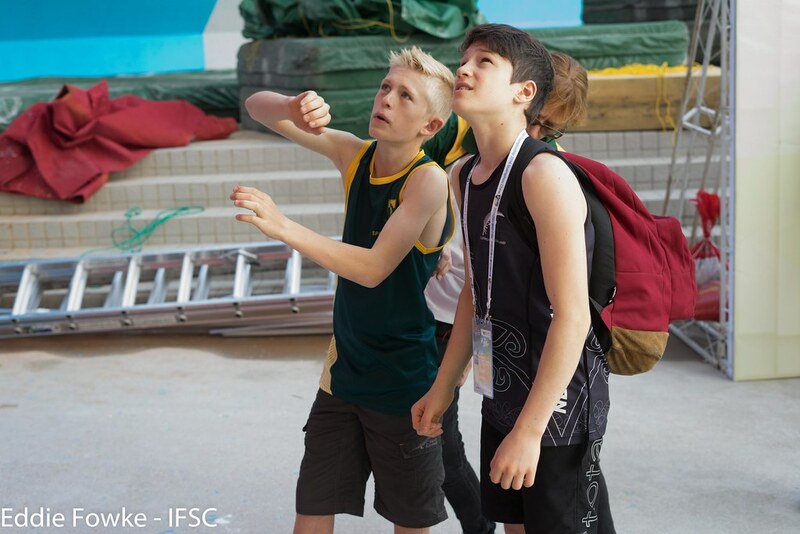 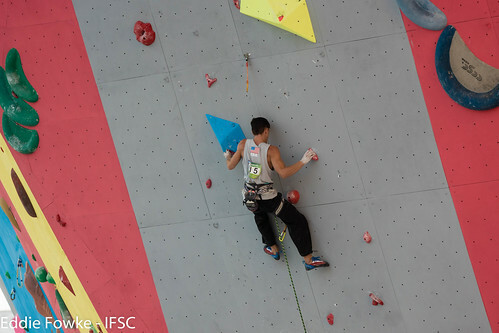 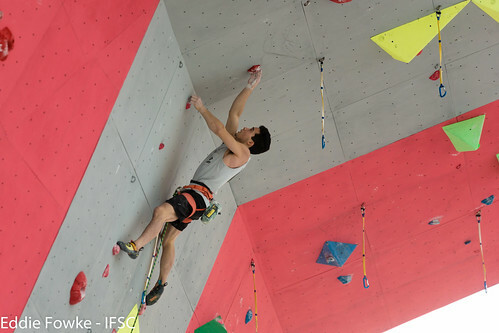 No other Juniors finalist completed multiple problems, and this year’s Lead world youth champion sent all four of them. 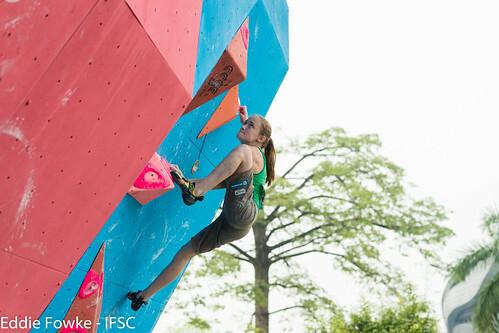 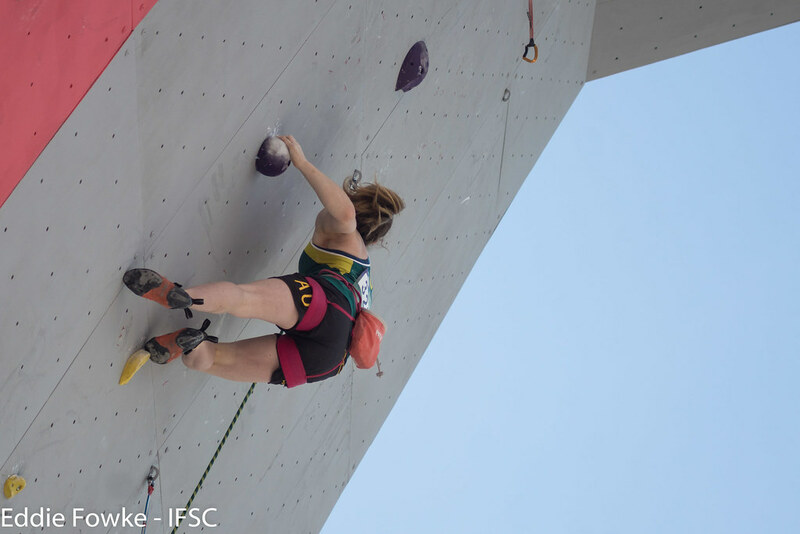 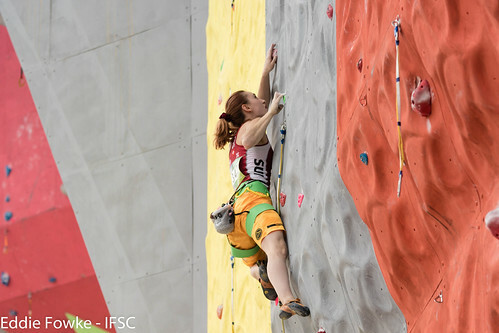 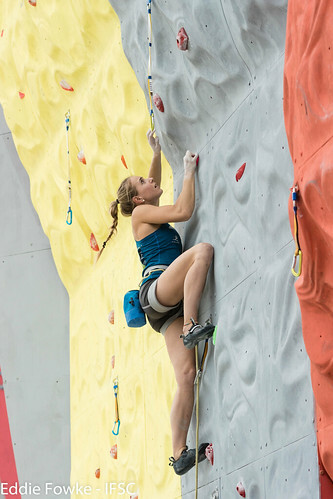 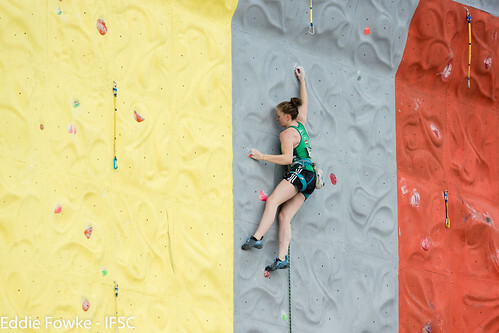 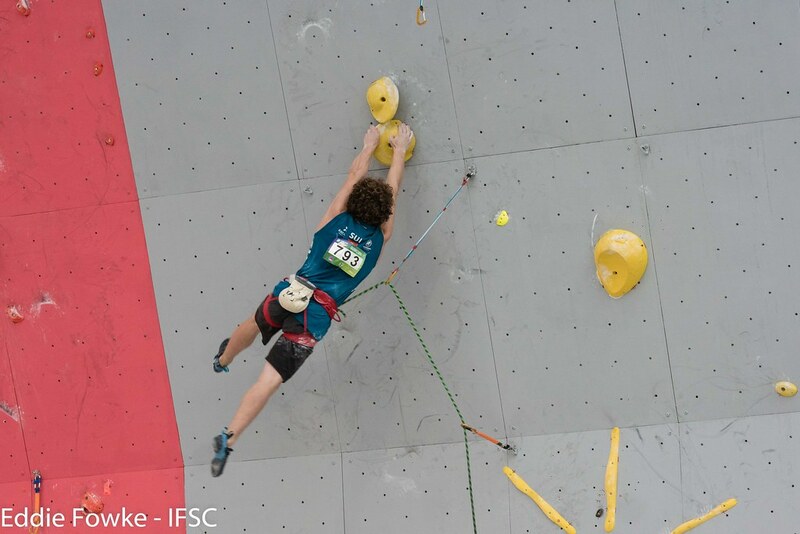 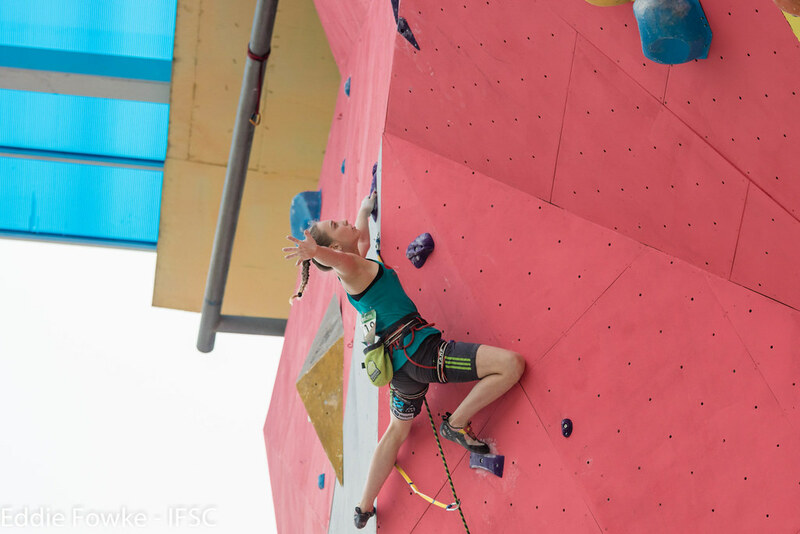 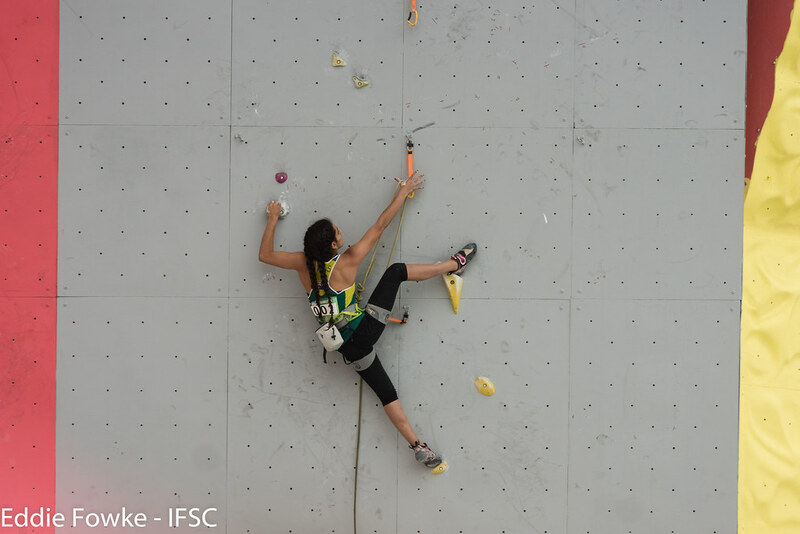 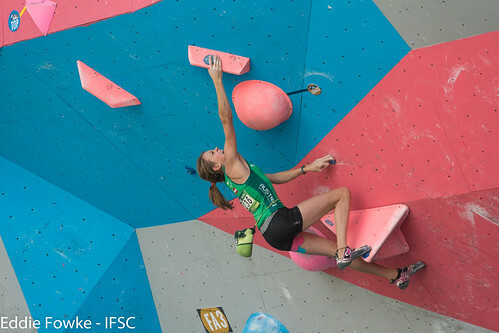 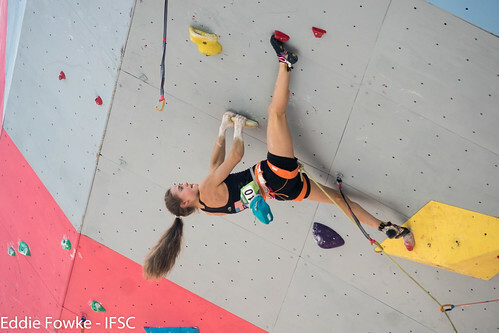 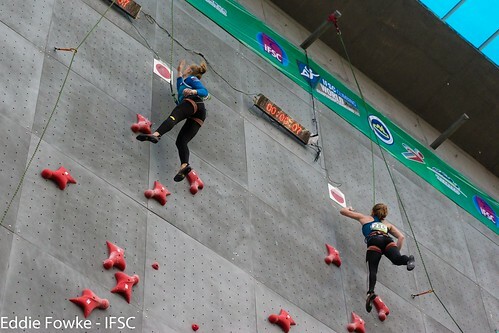 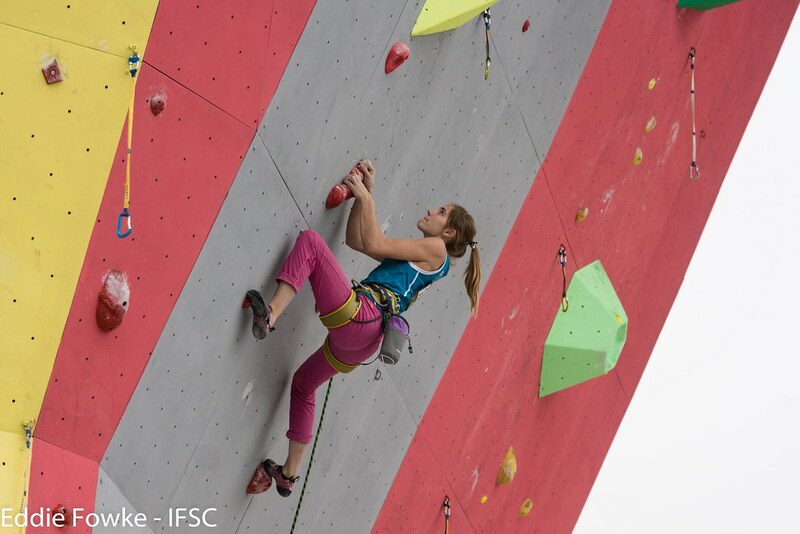 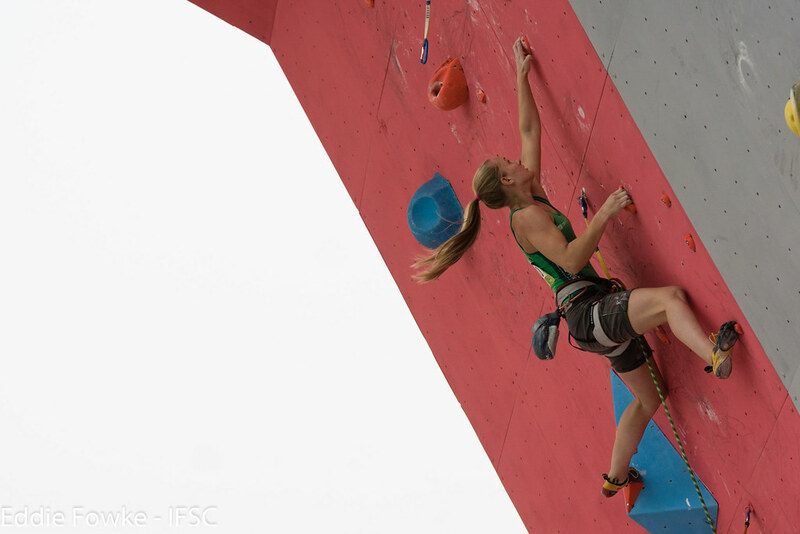 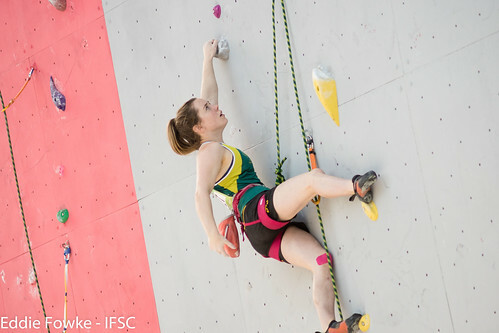 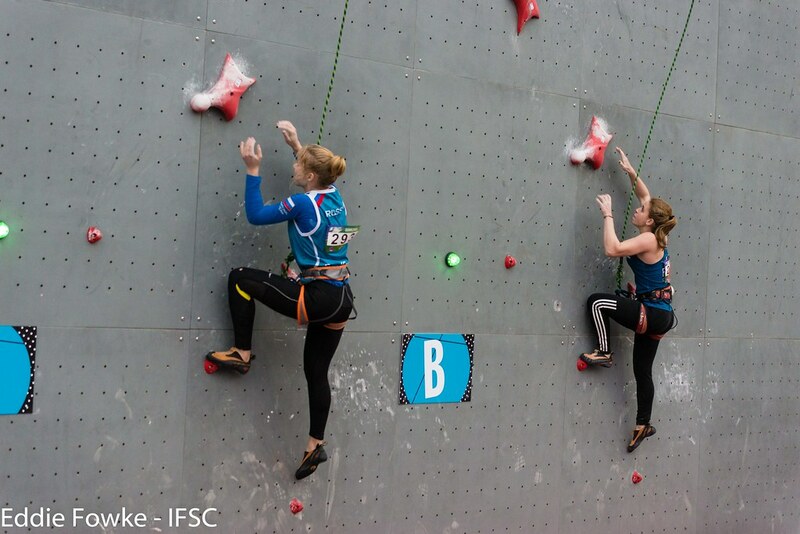 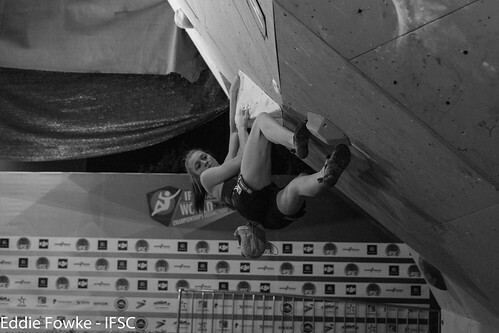 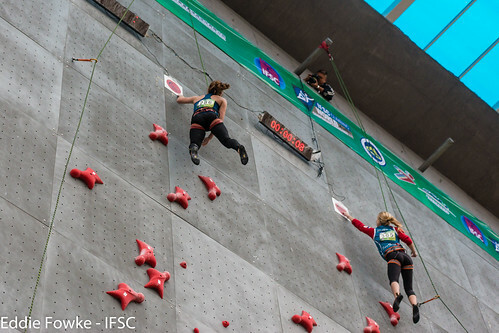 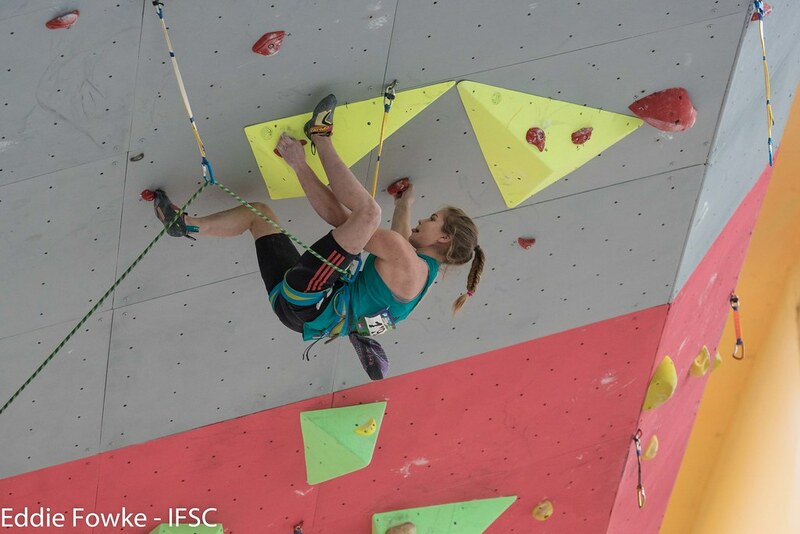 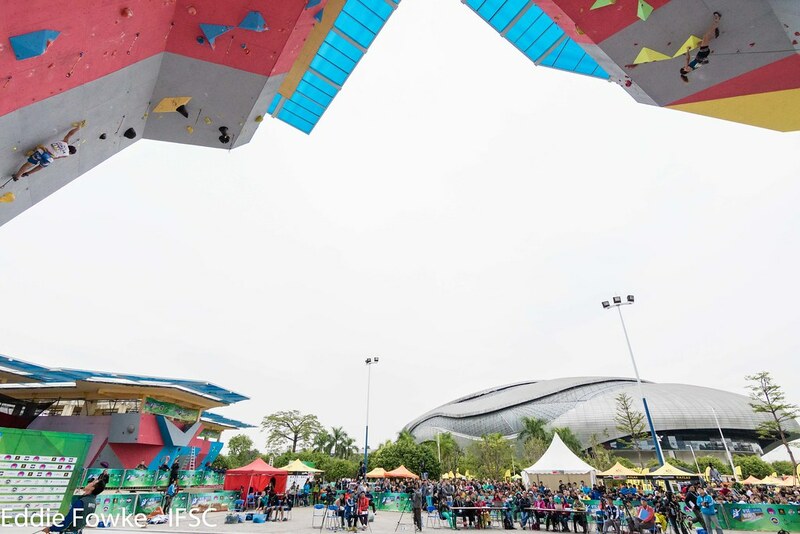 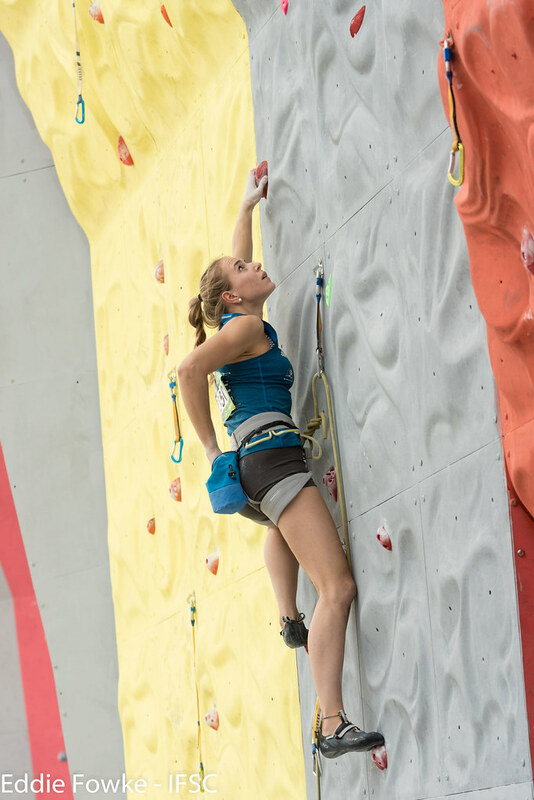 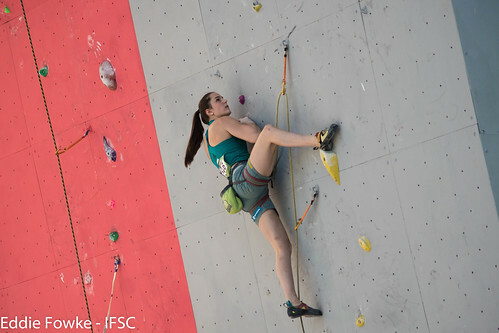 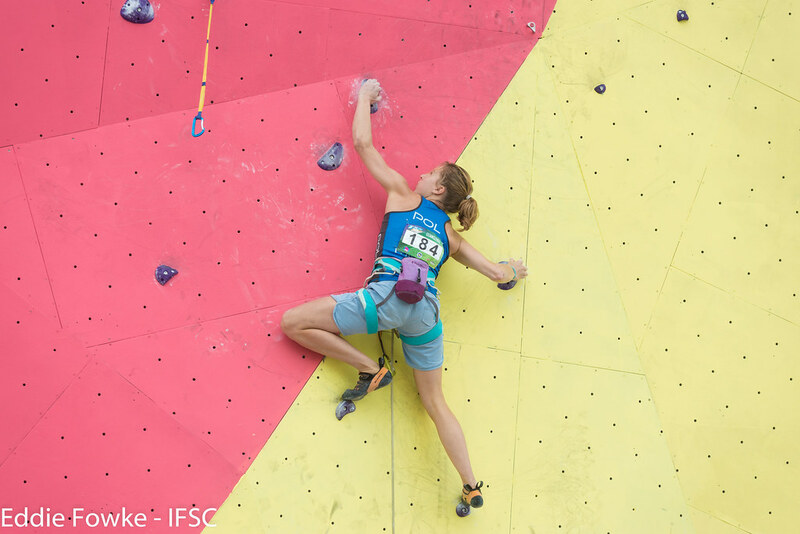 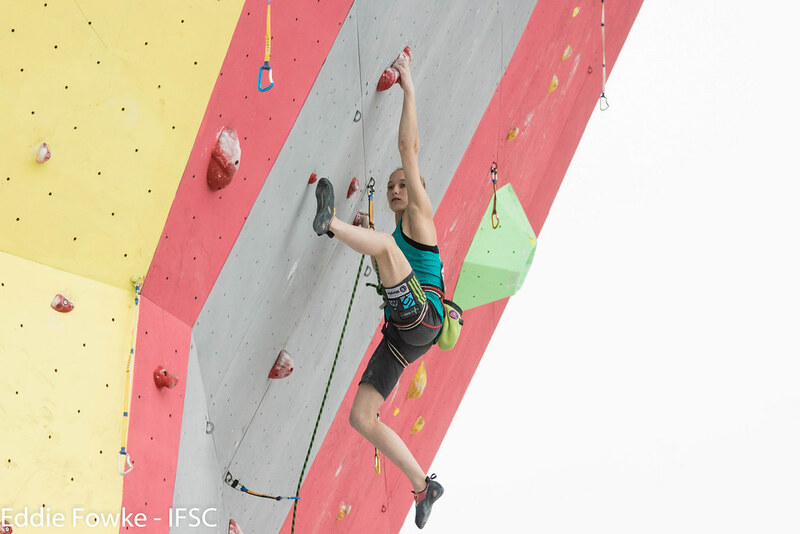 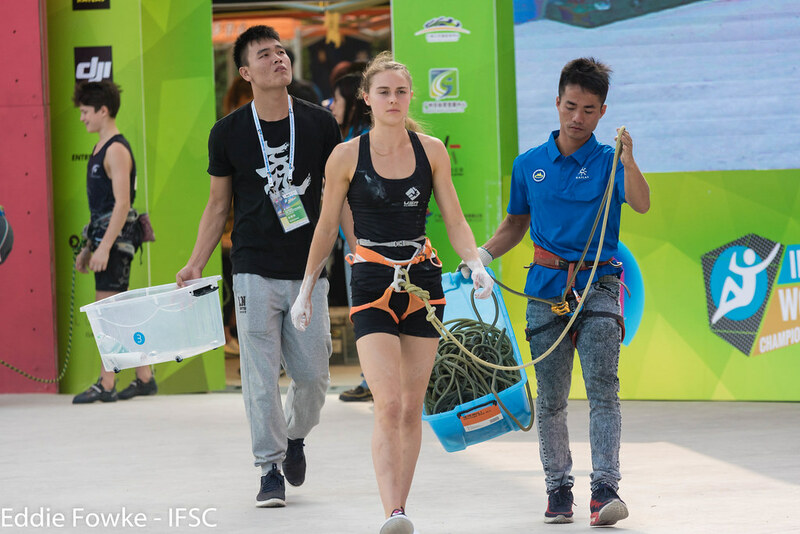 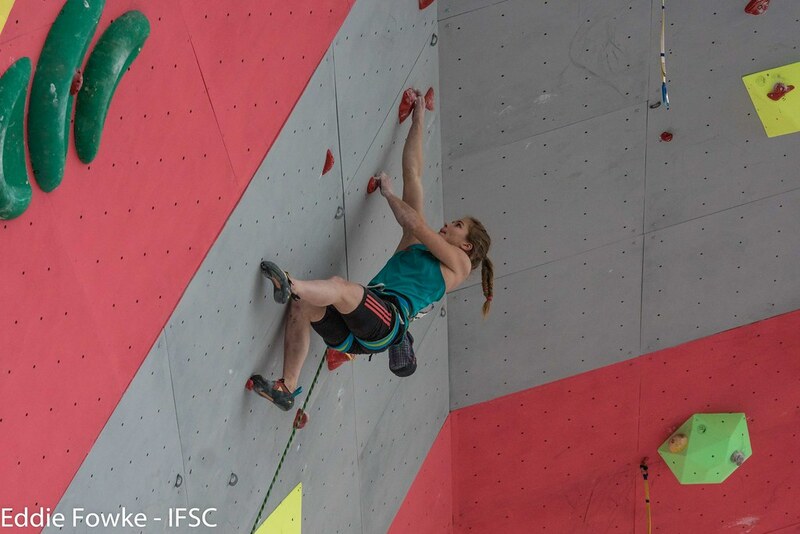 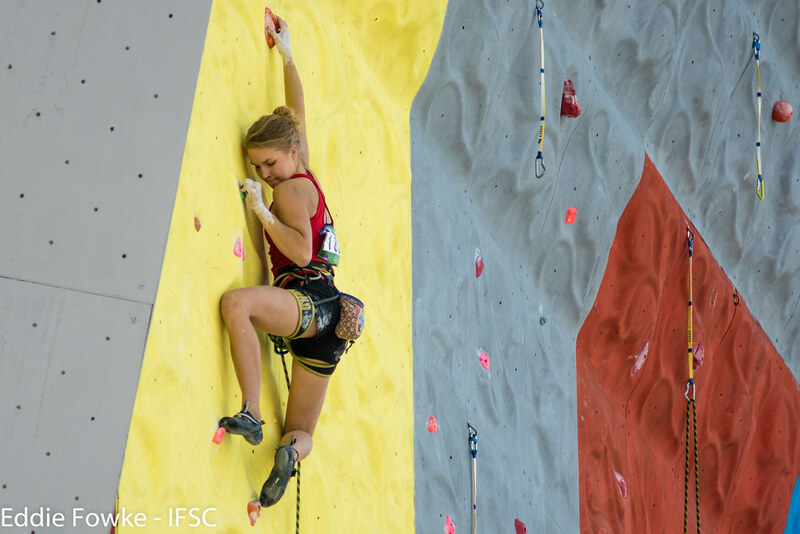 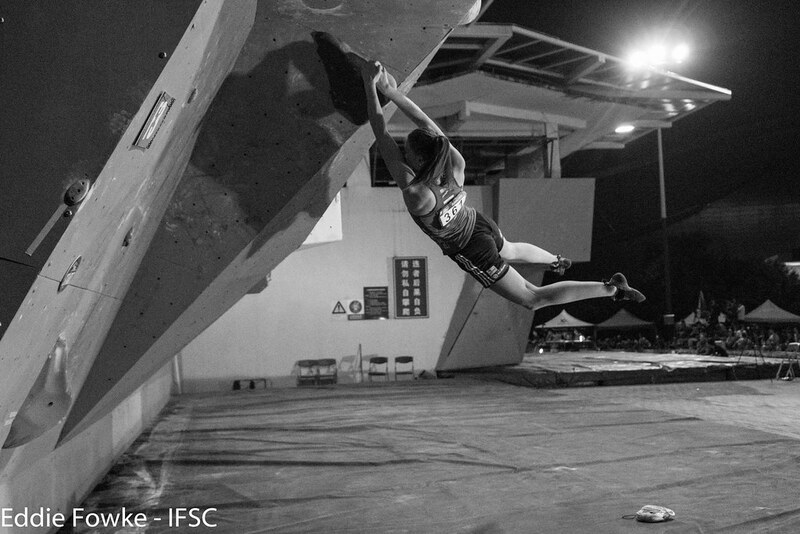 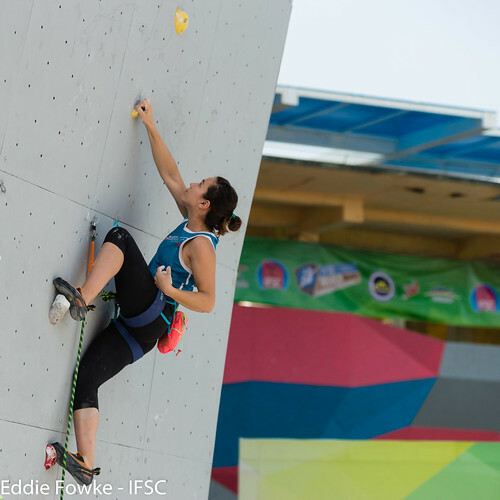 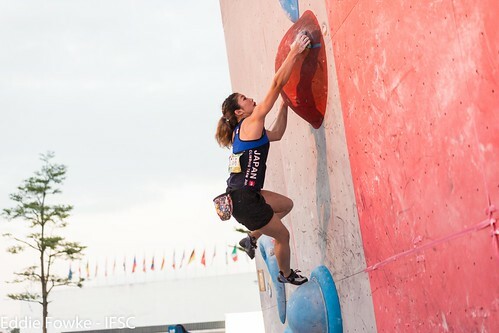 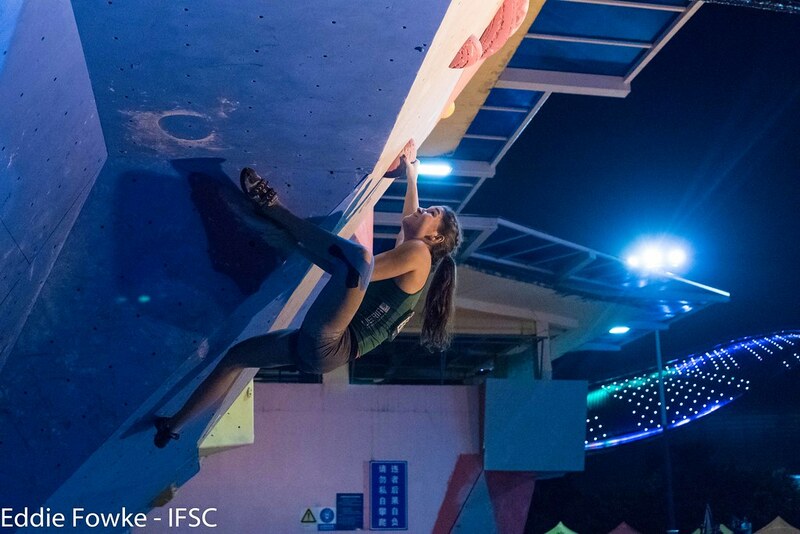 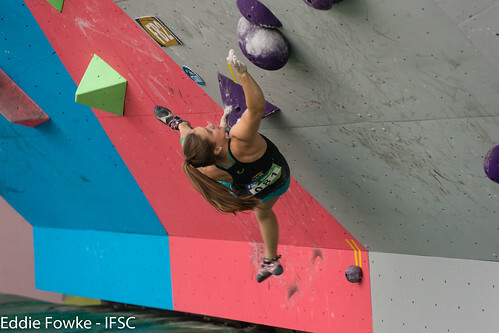 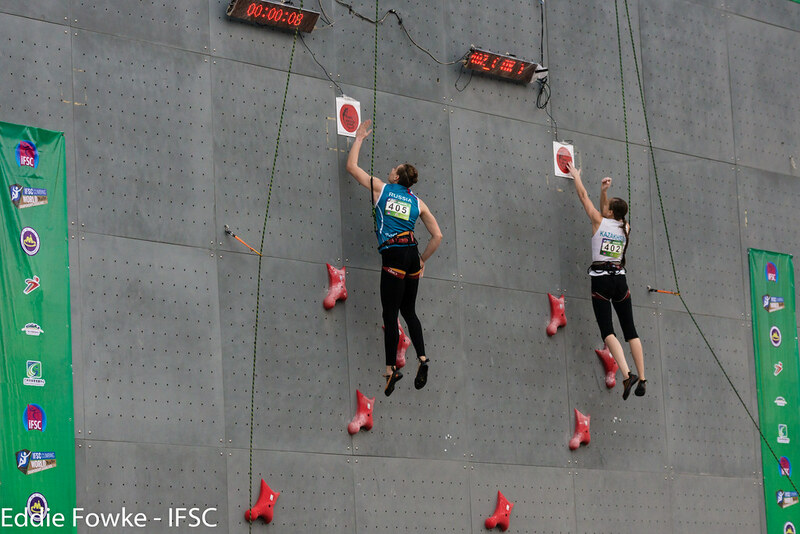 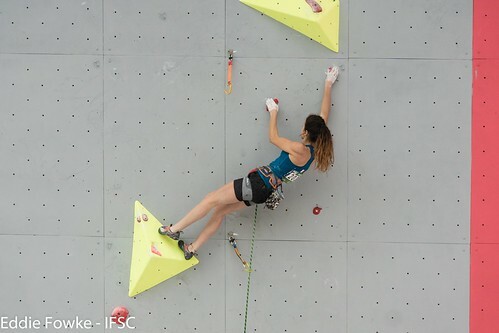 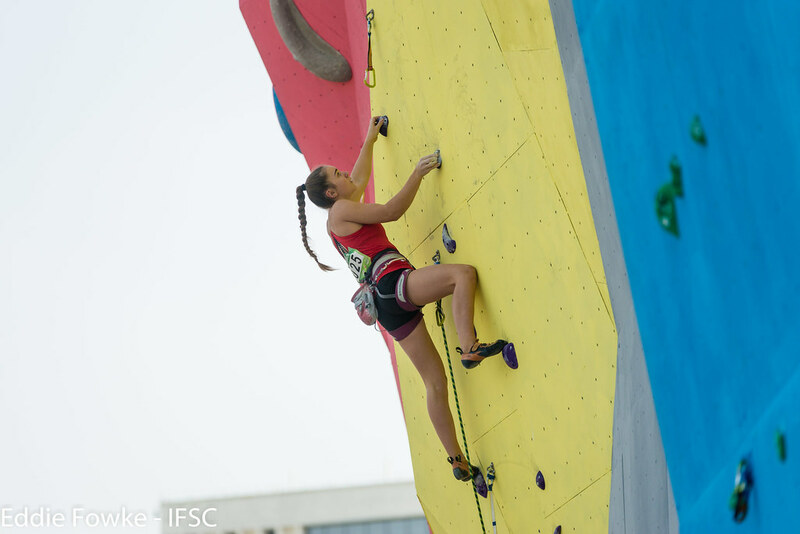 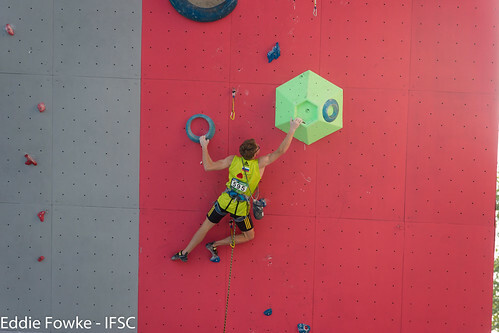 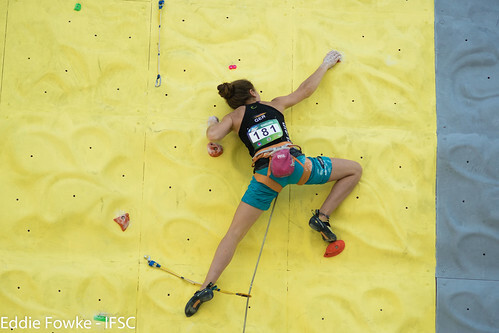 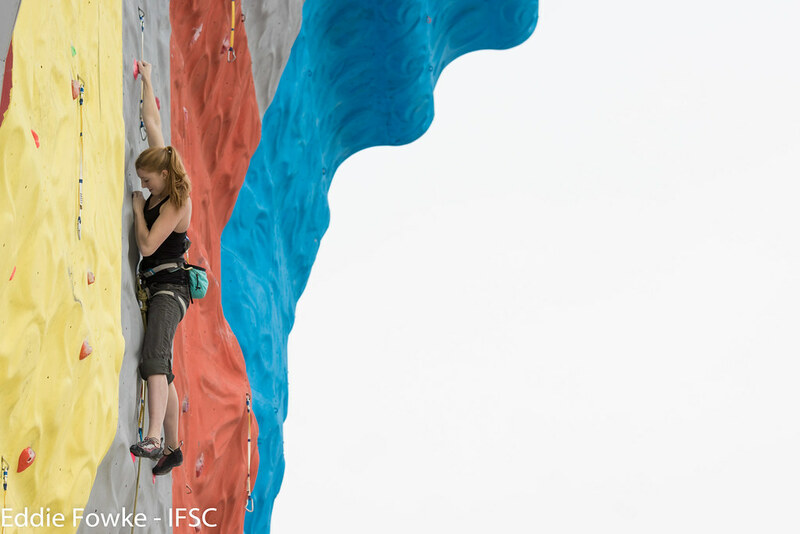 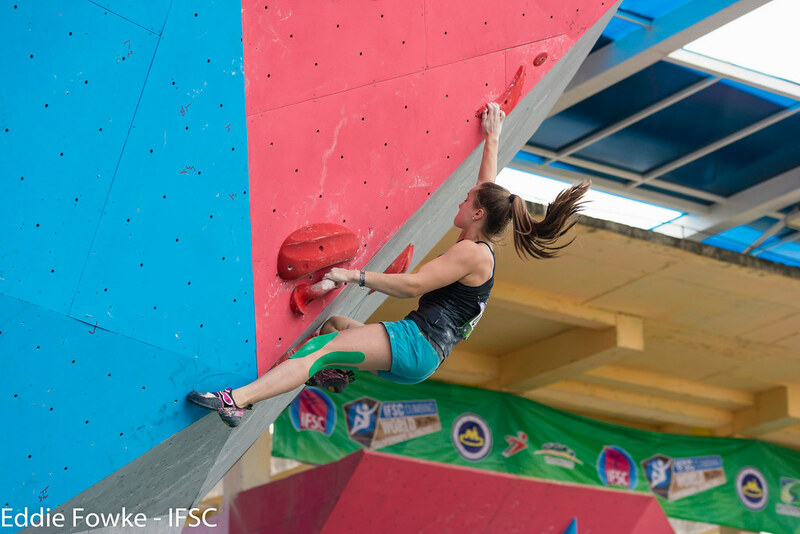 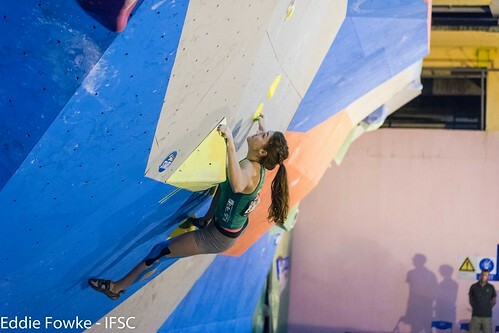 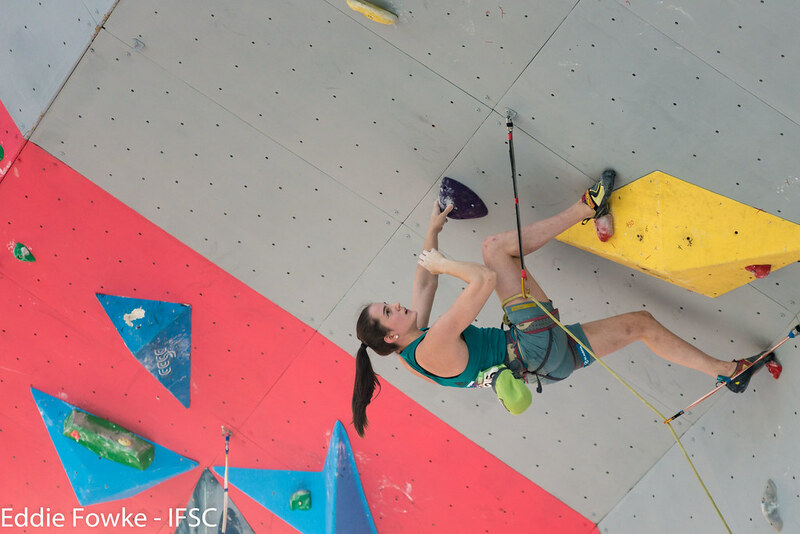 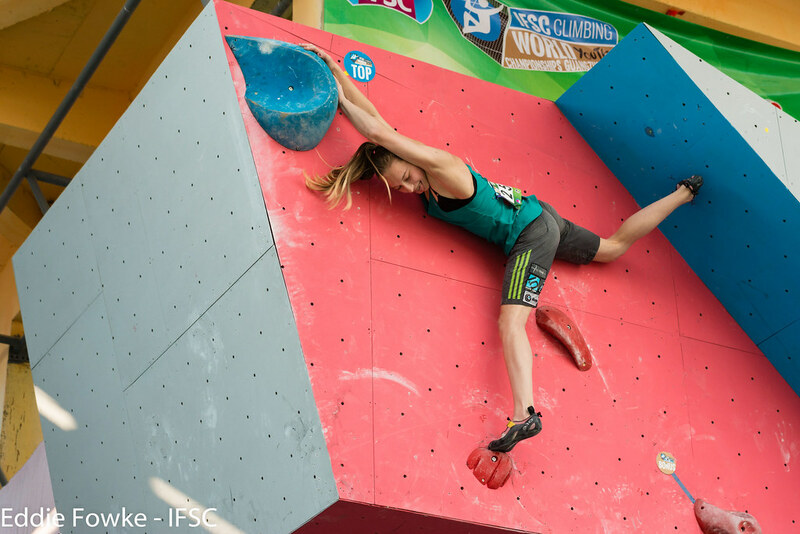 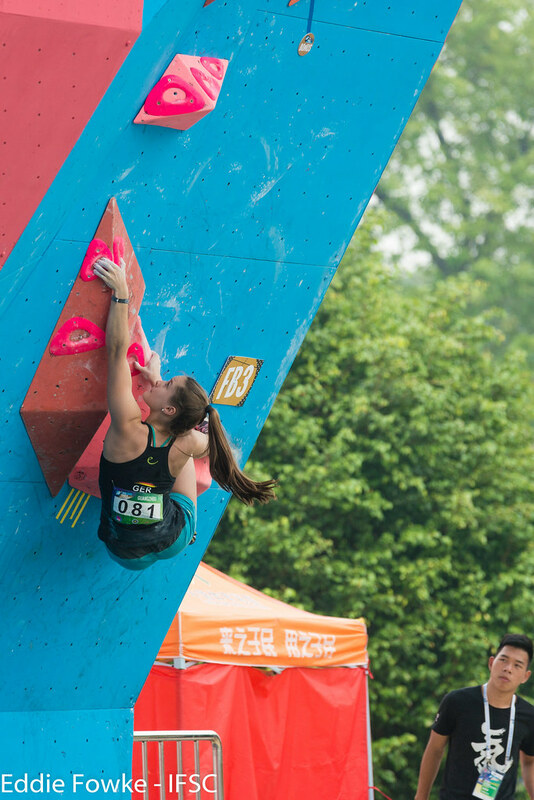 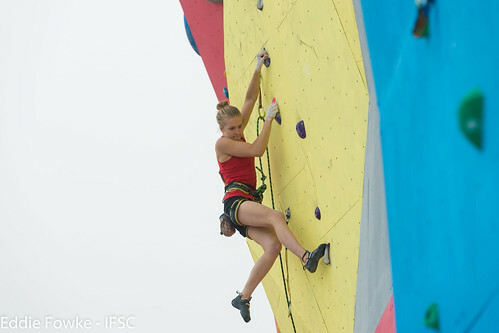 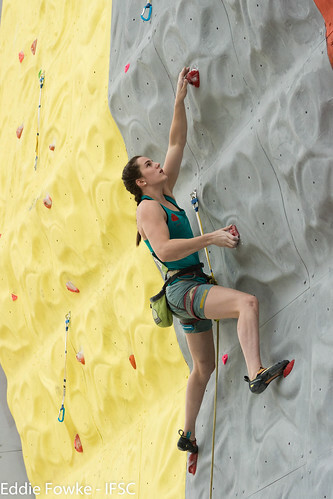 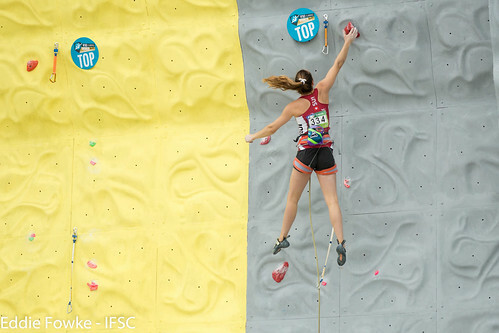 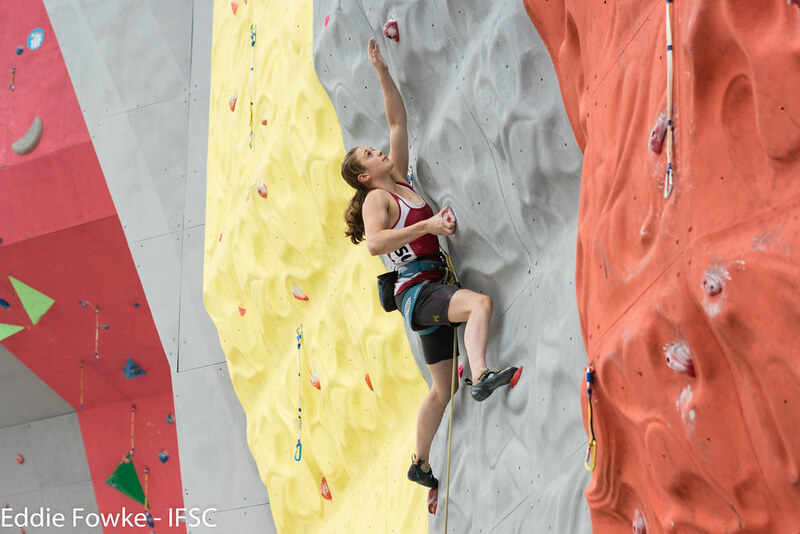 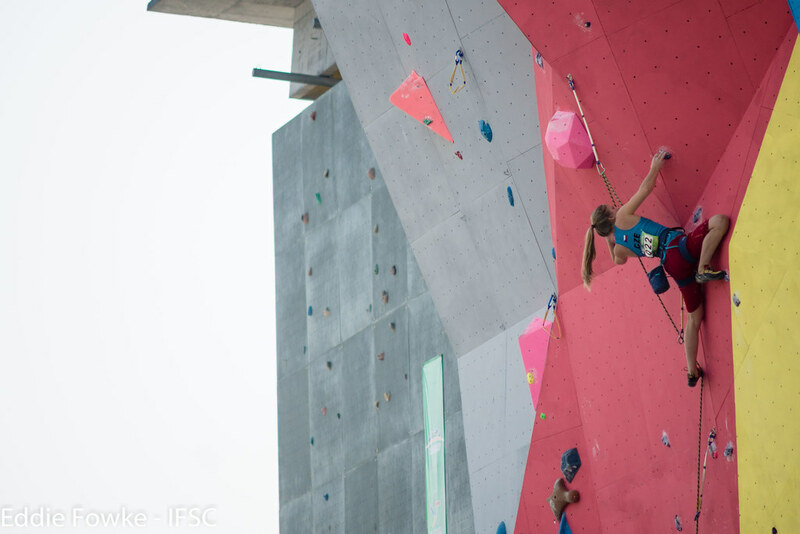 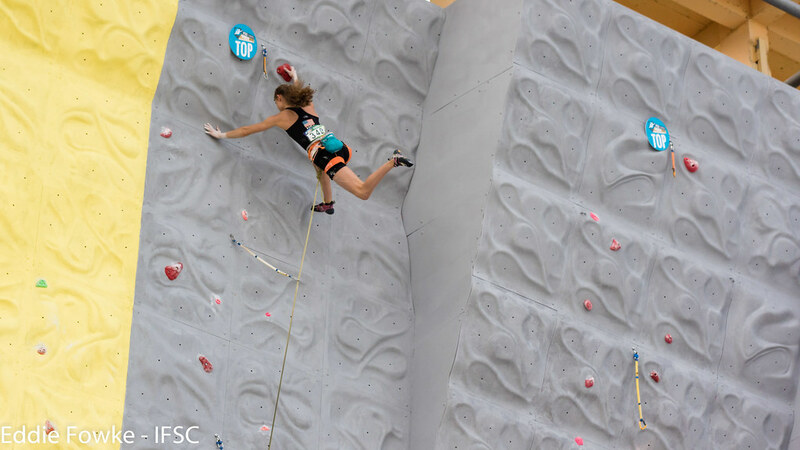 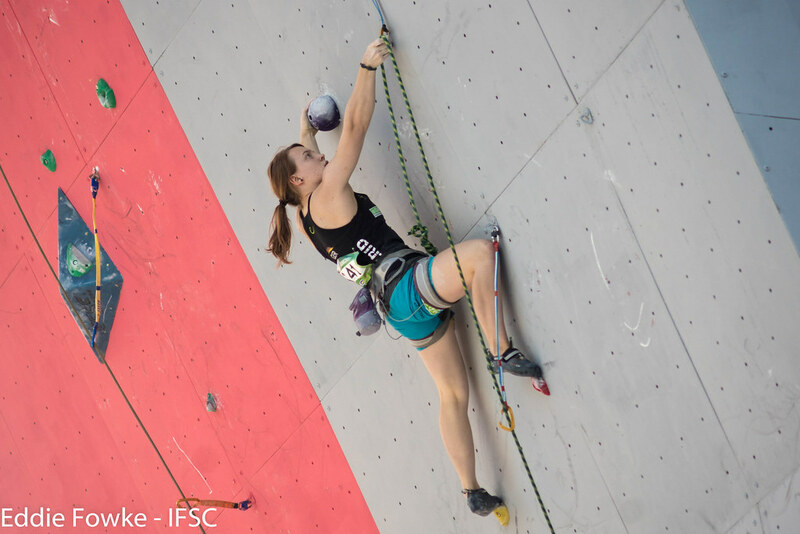 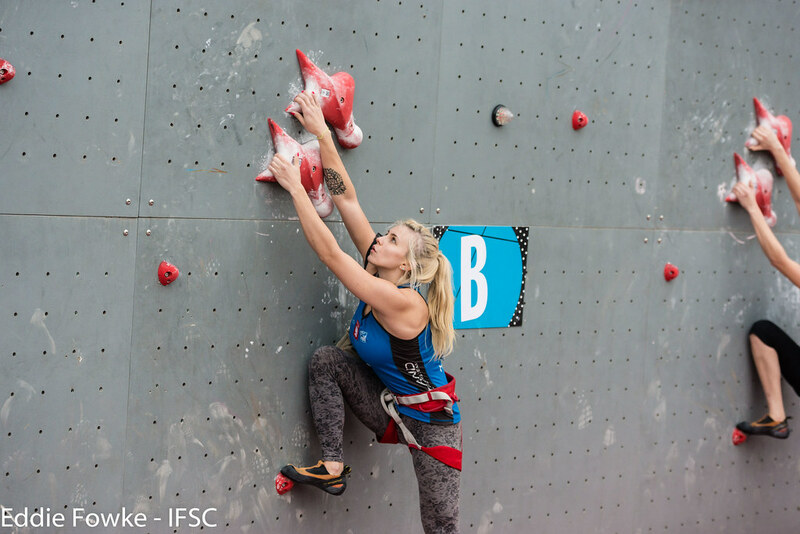 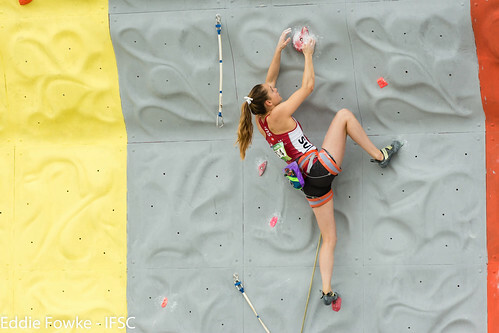 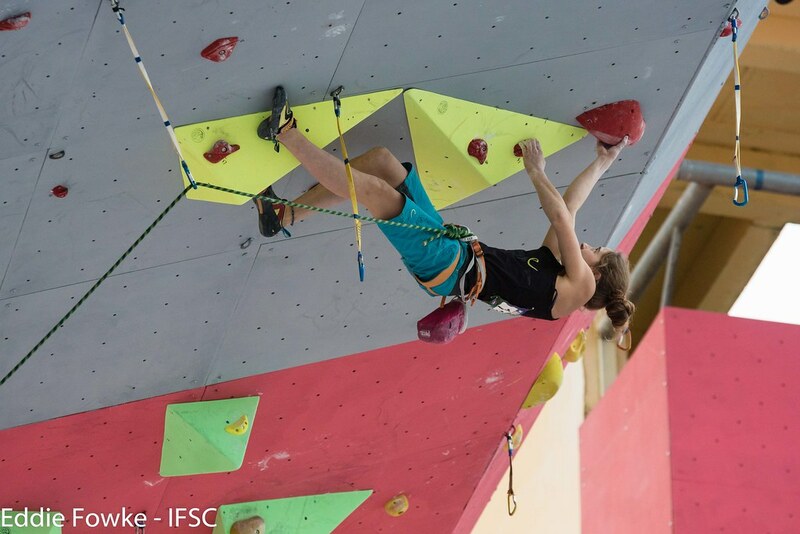 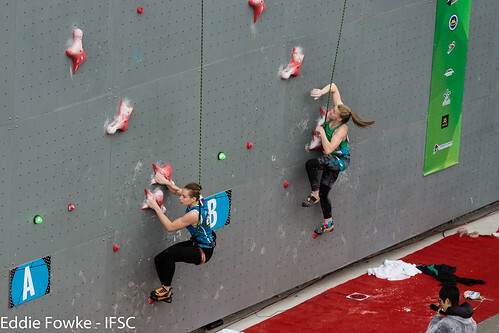 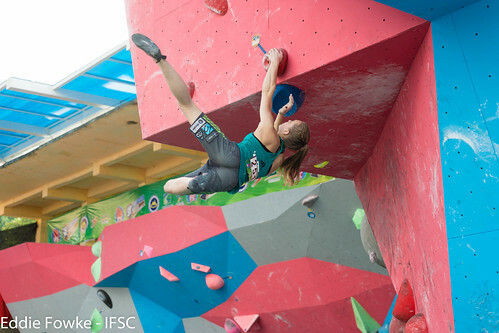 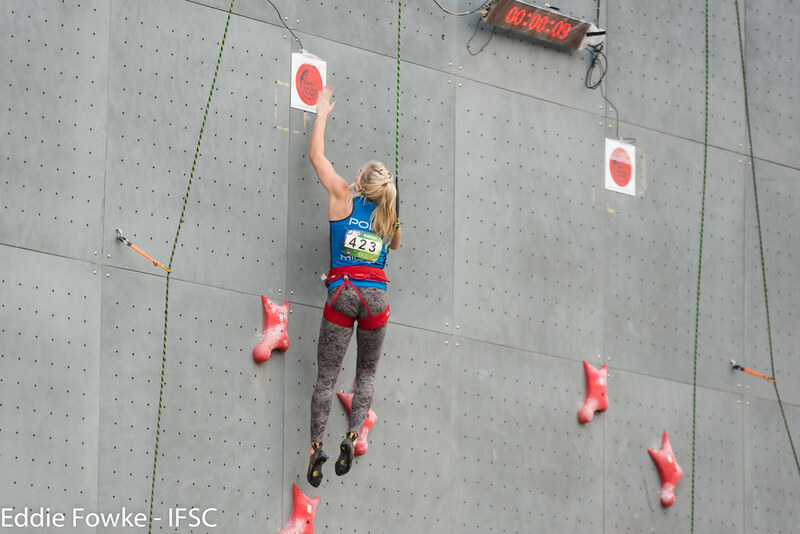 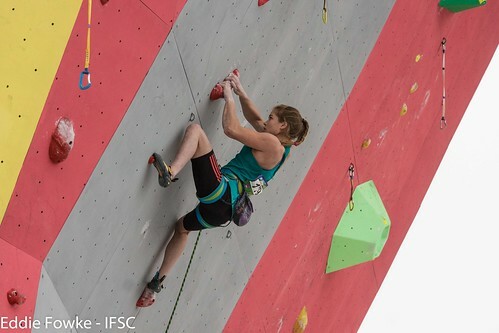 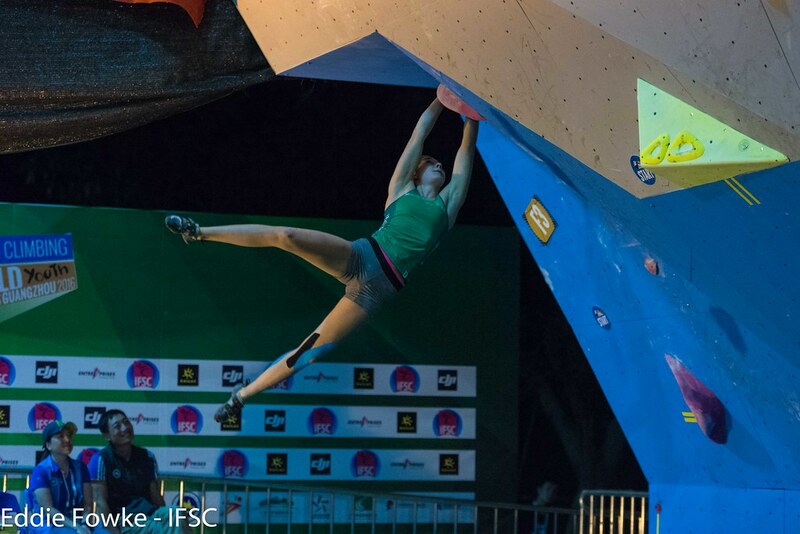 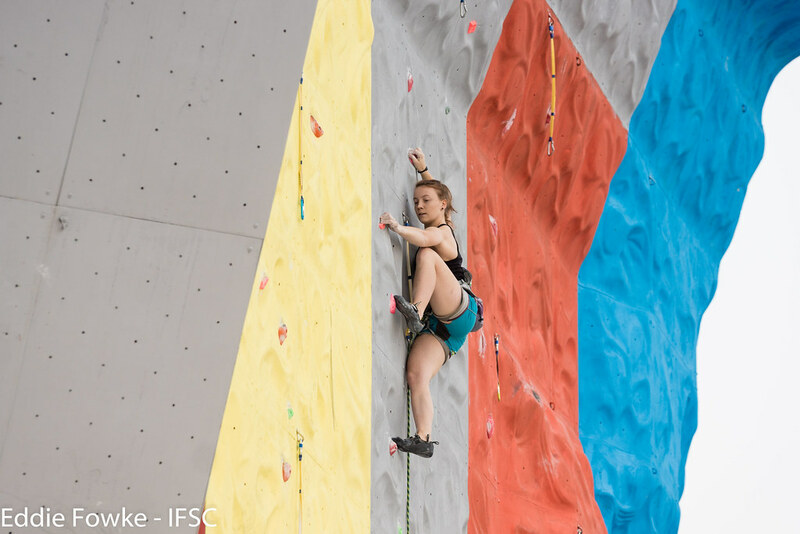 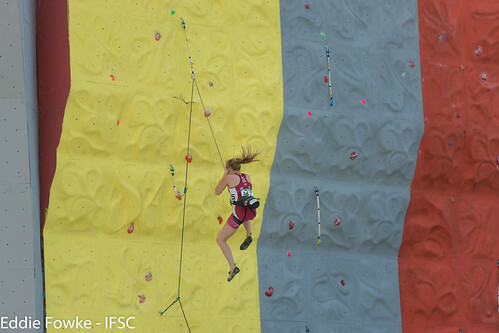 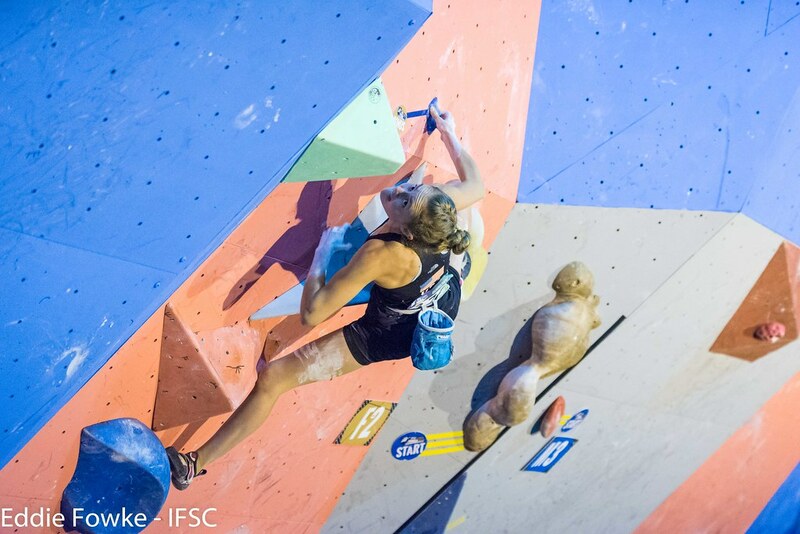 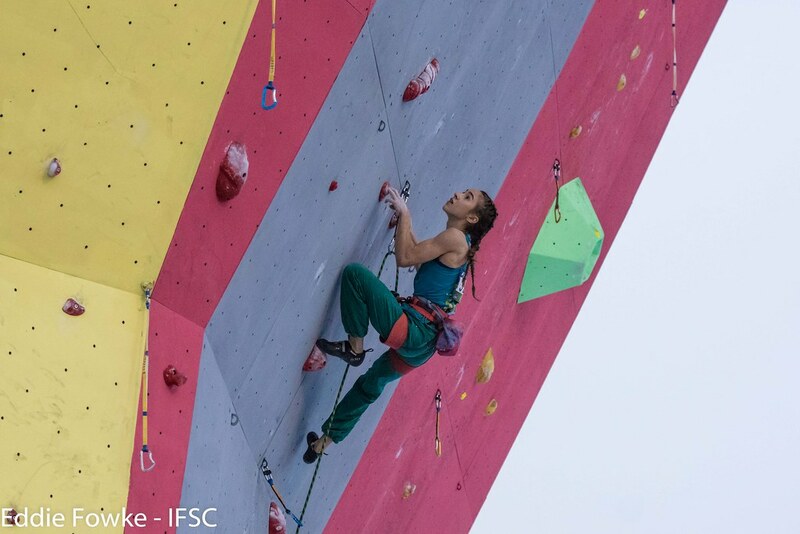 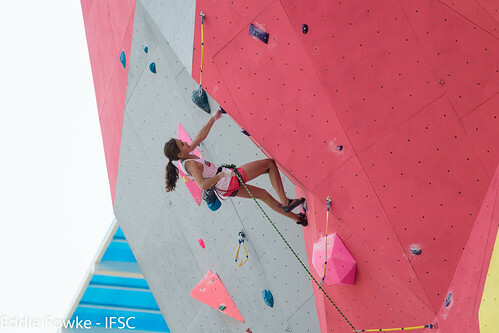 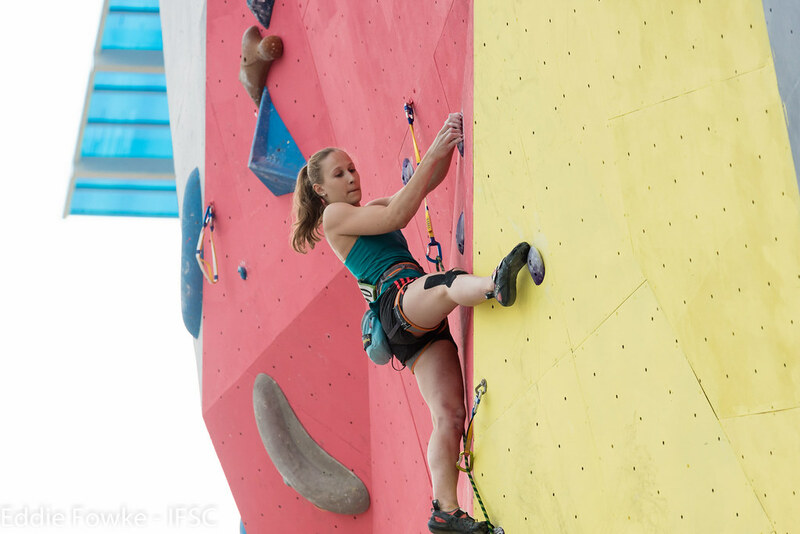 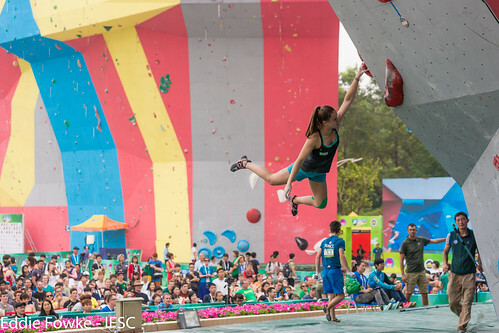 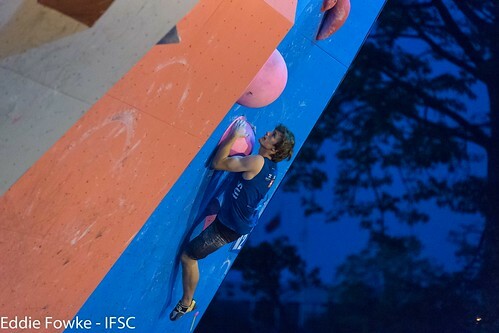 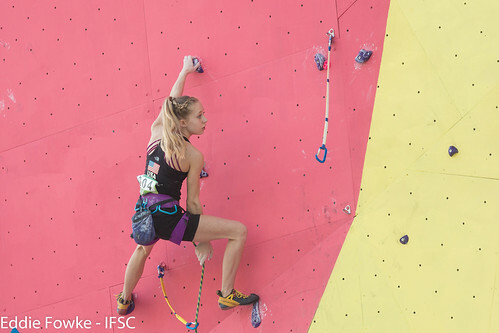 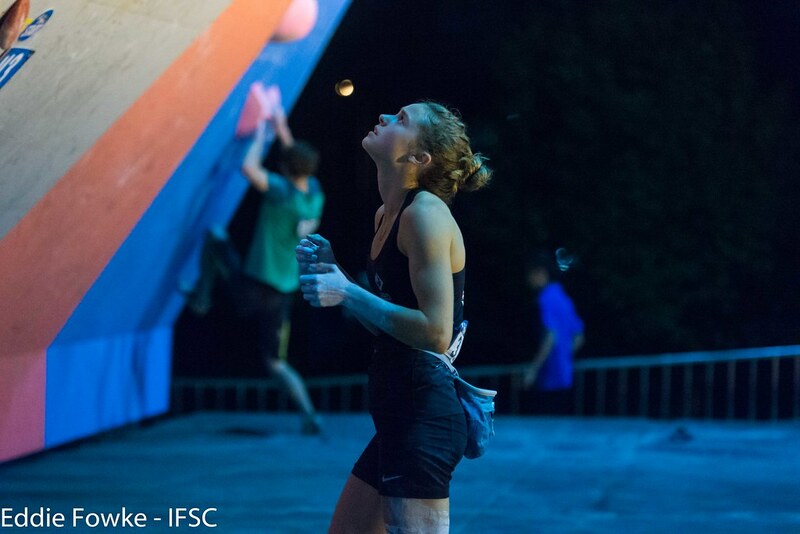 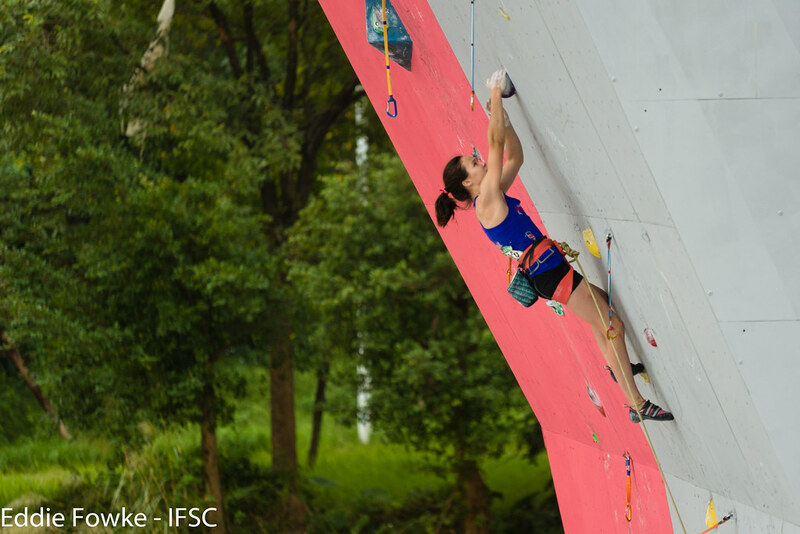 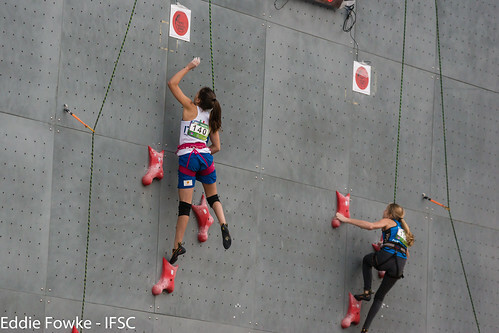 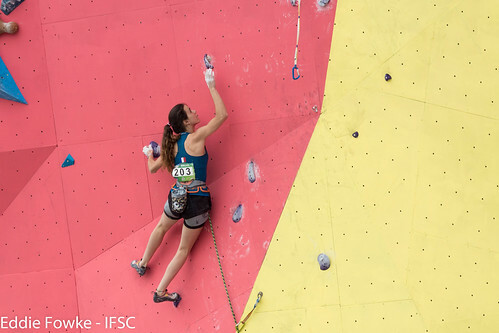 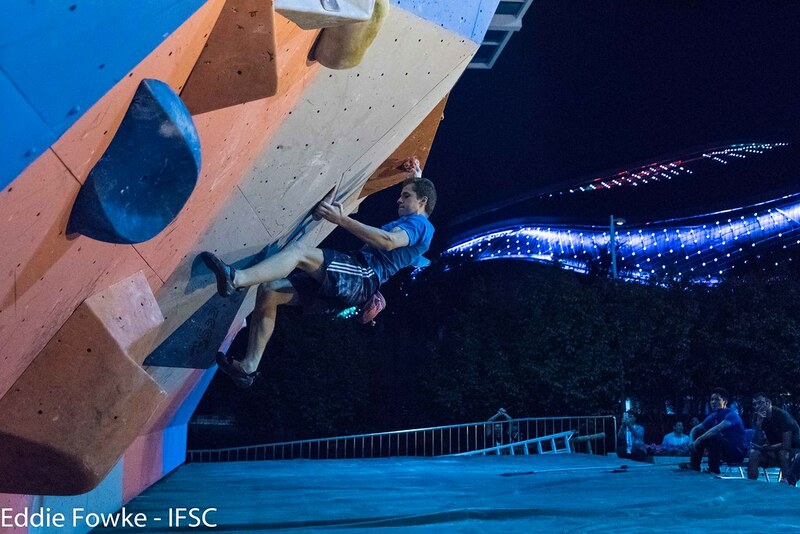 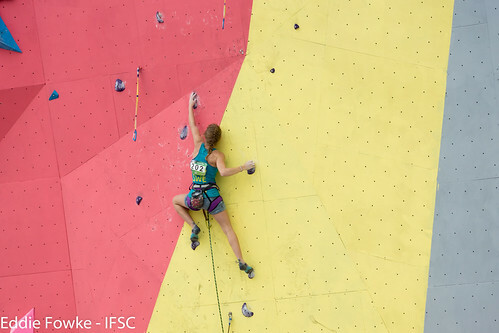 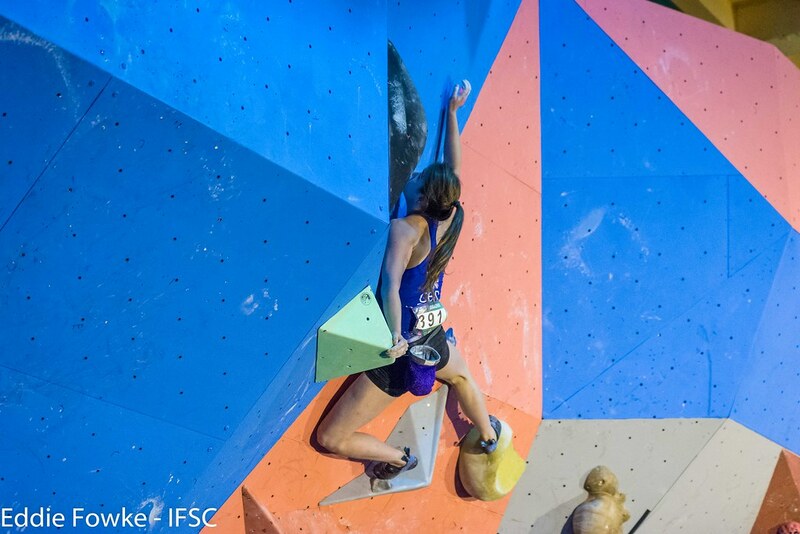 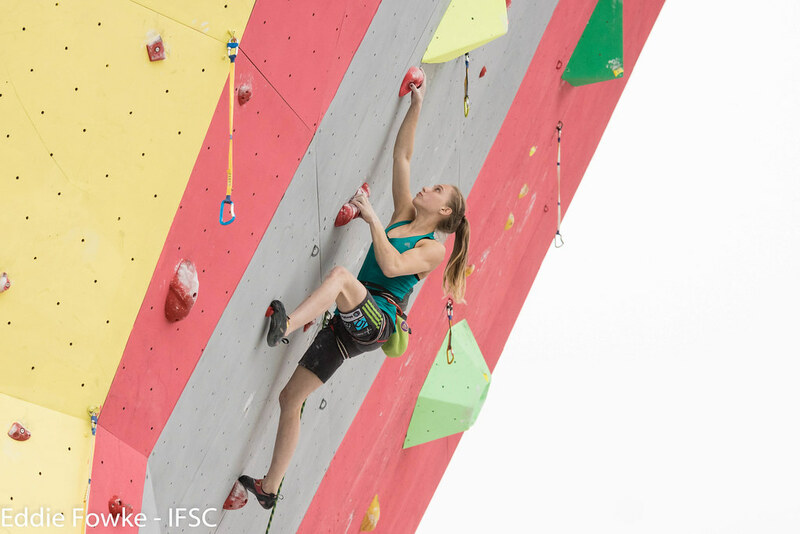 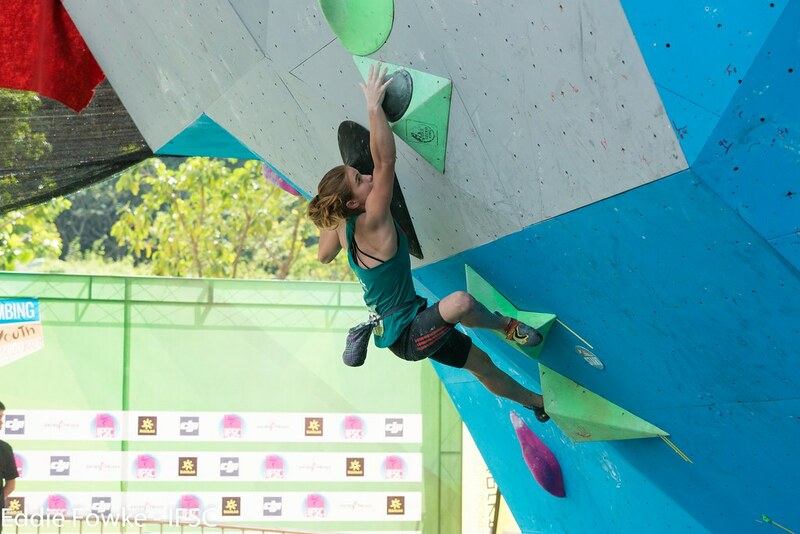 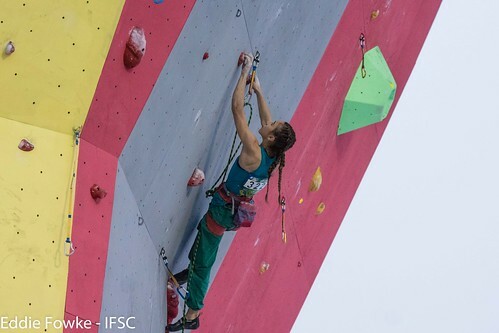 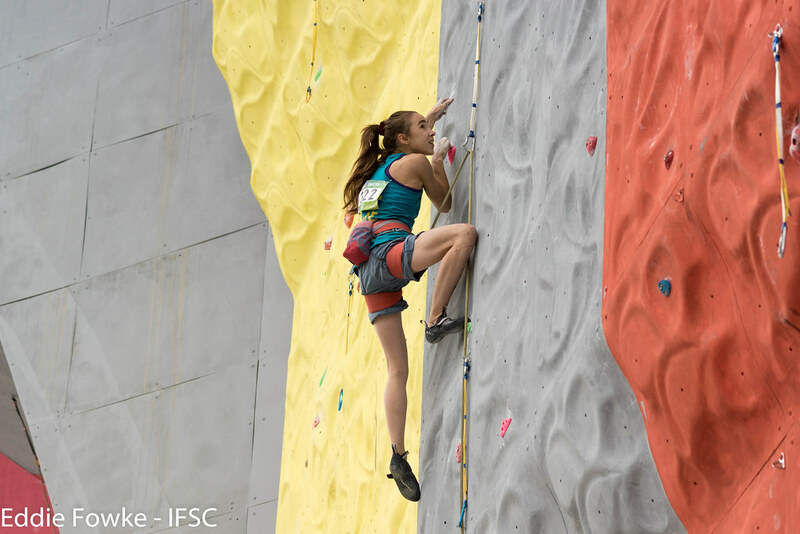 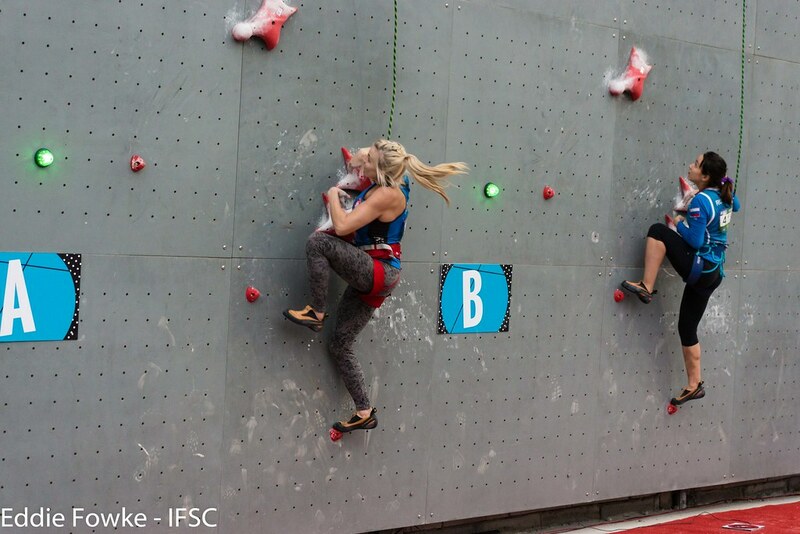 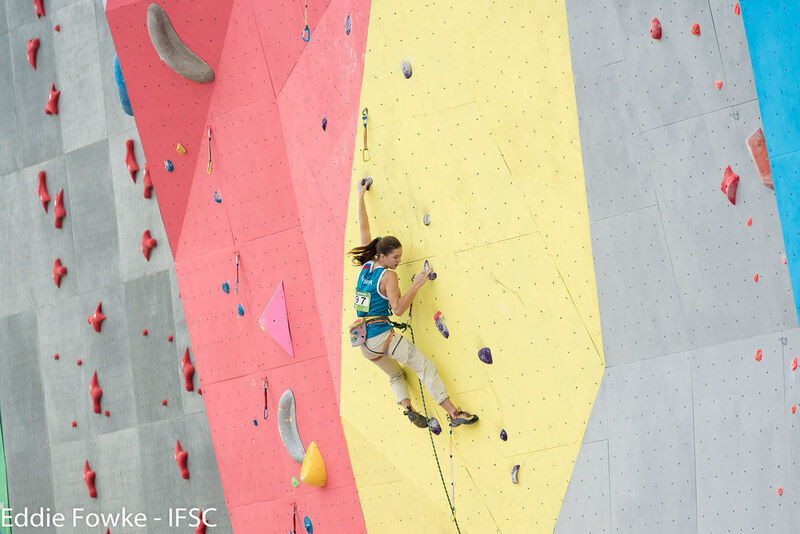 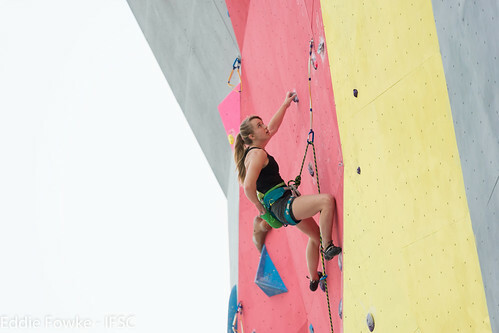 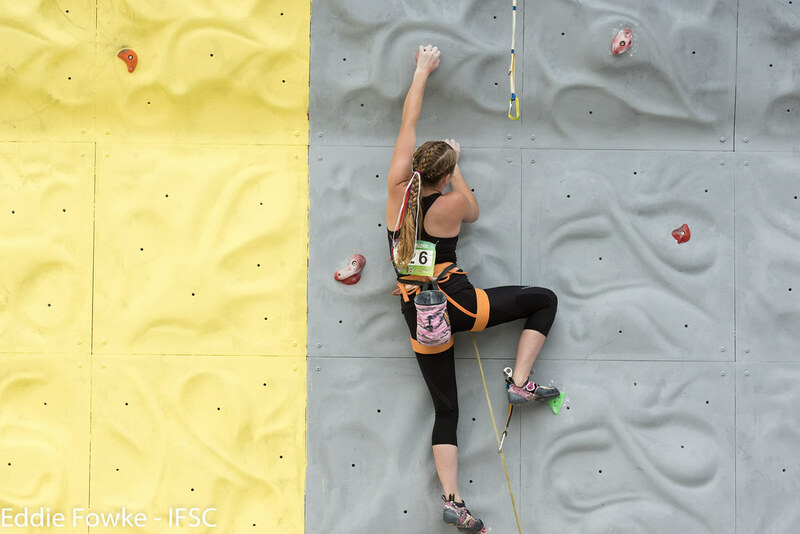 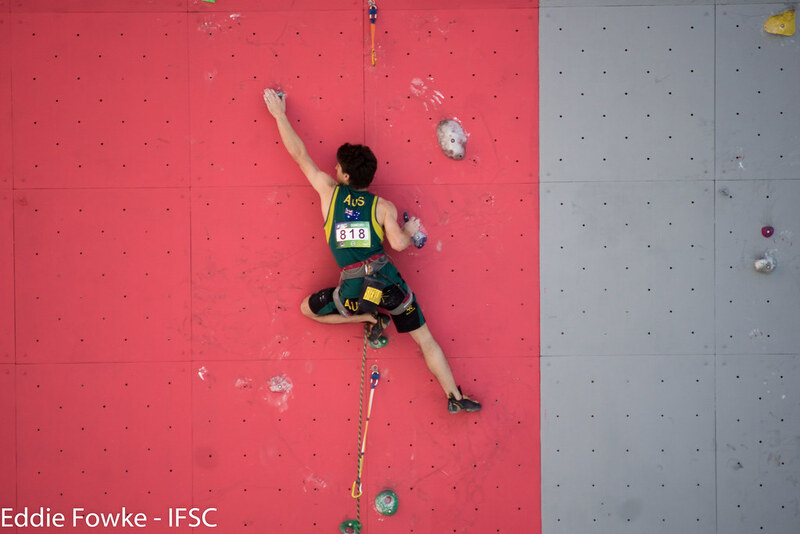 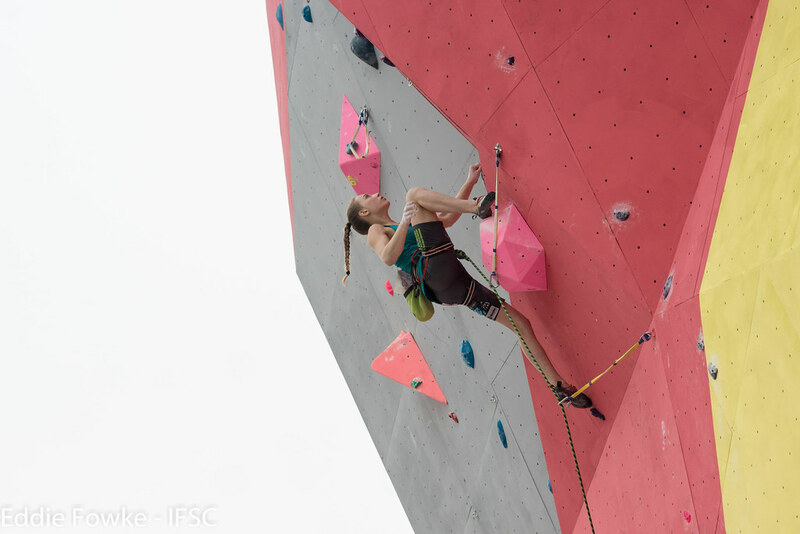 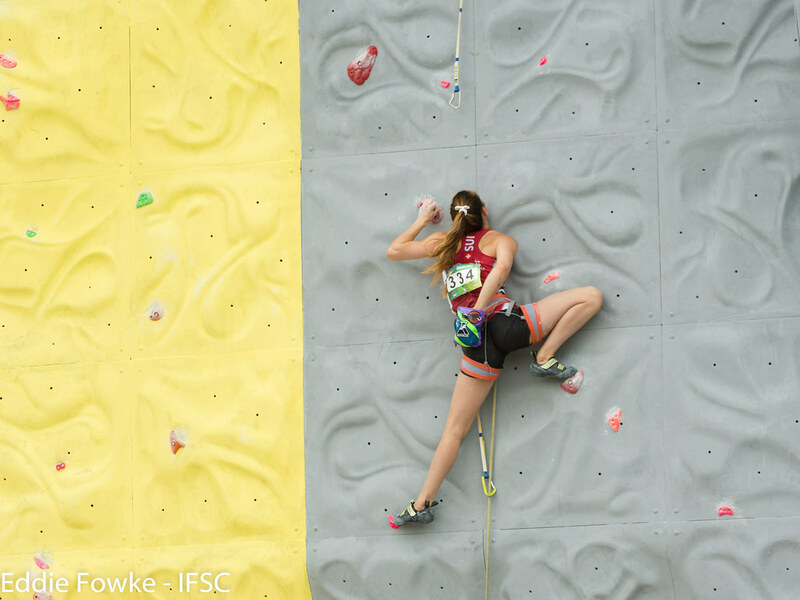 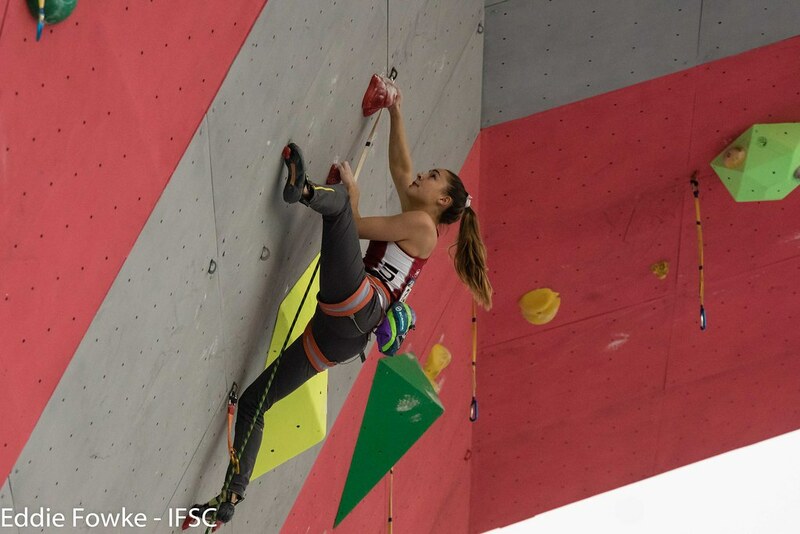 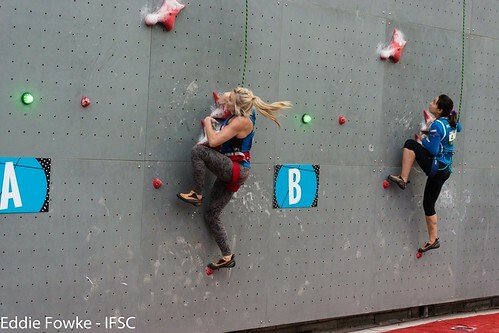 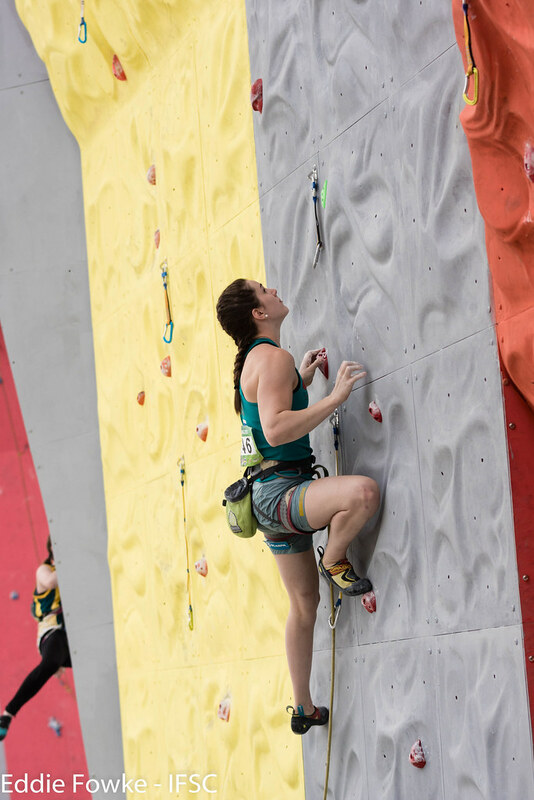 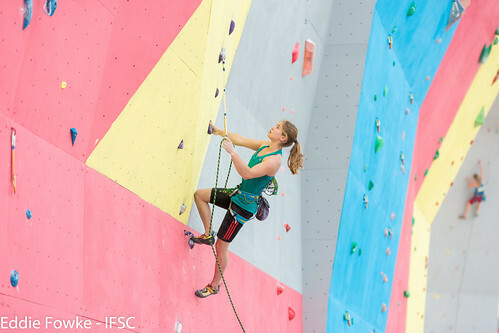 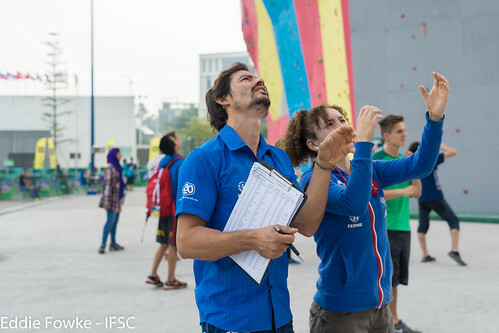 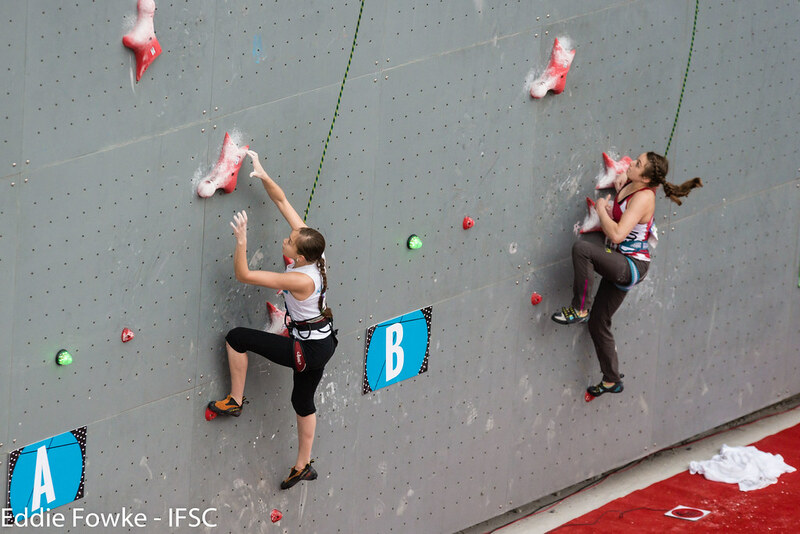 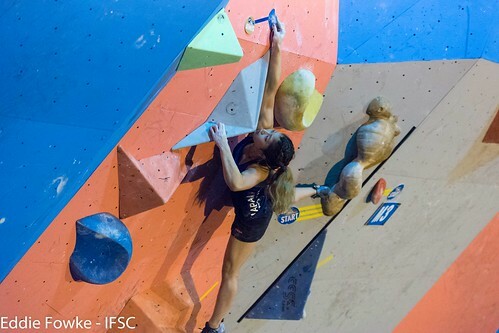 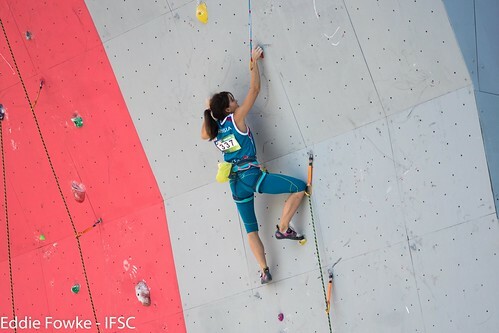 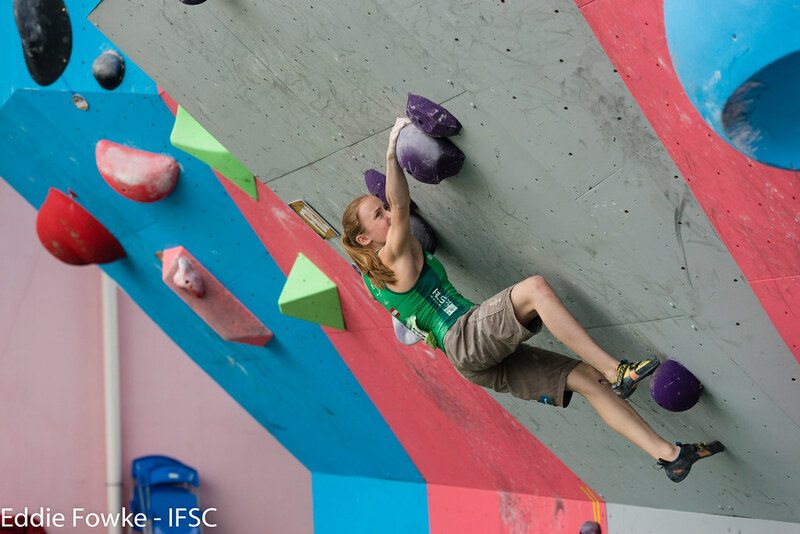 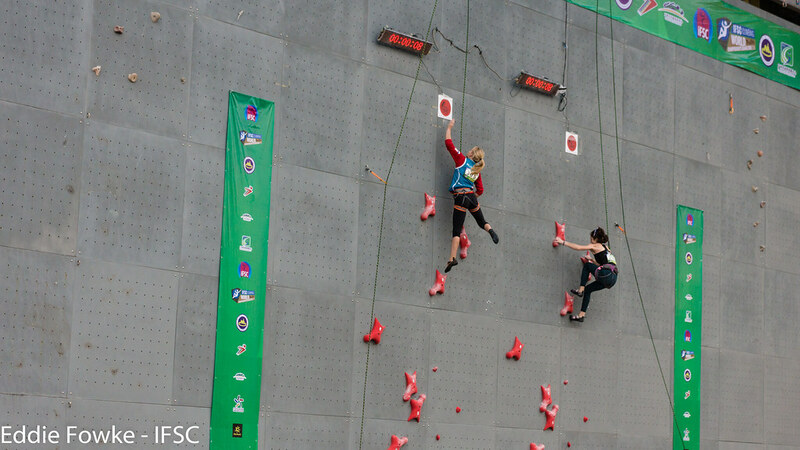 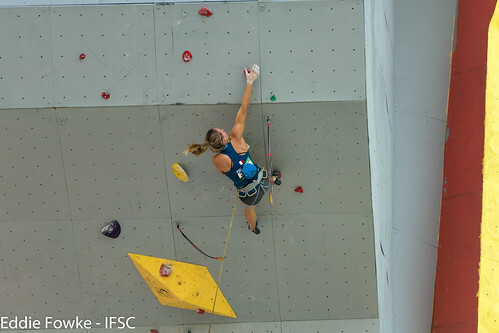 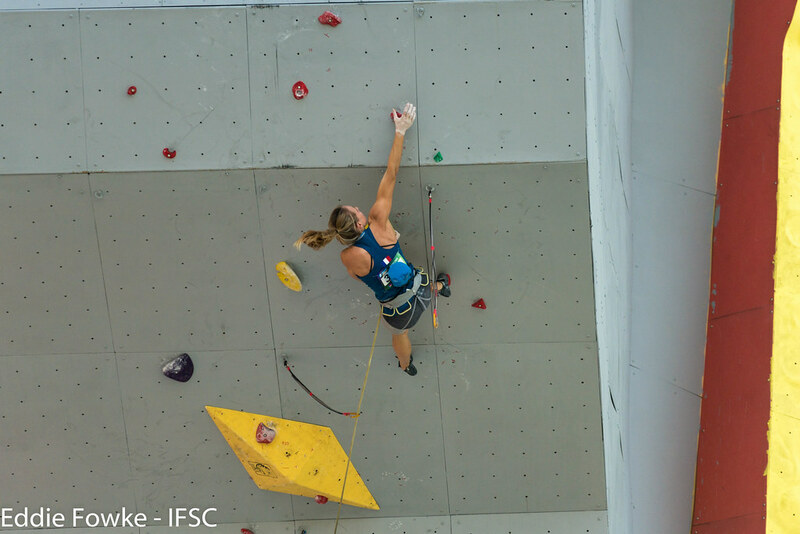 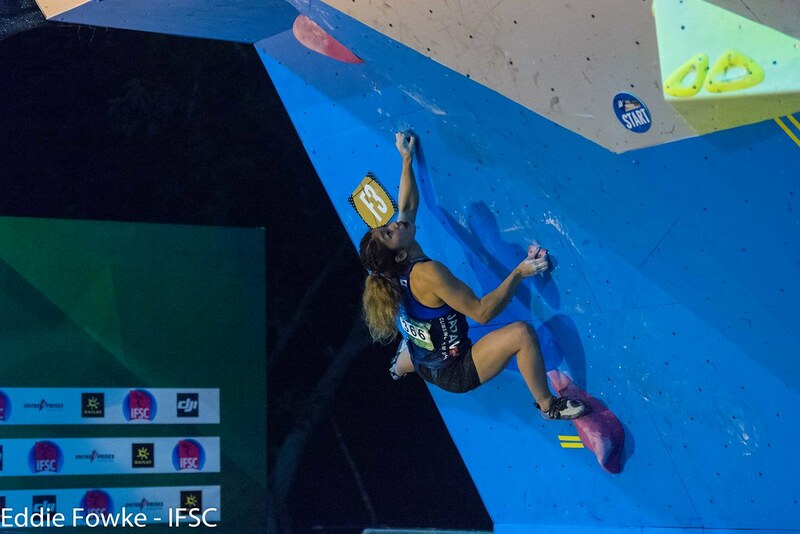 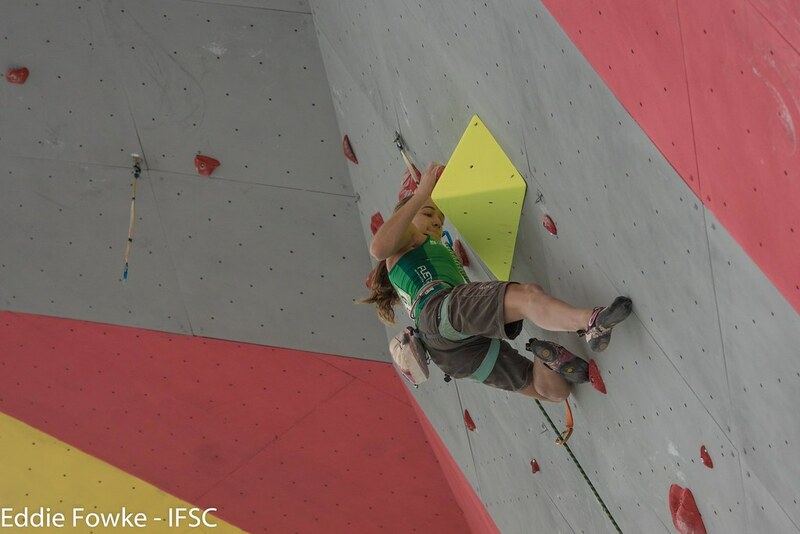 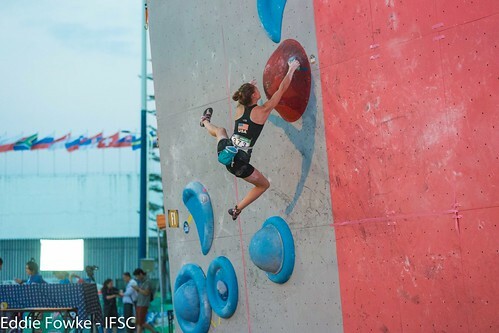 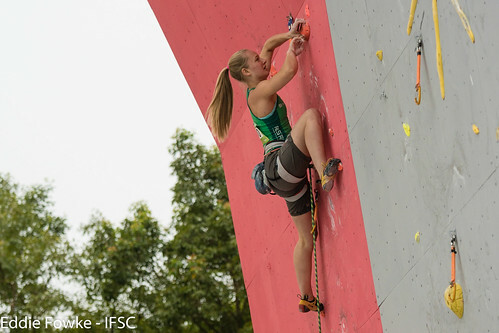 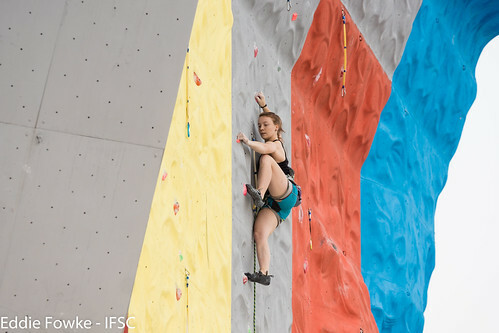 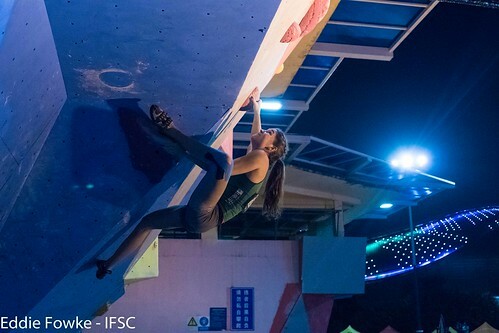 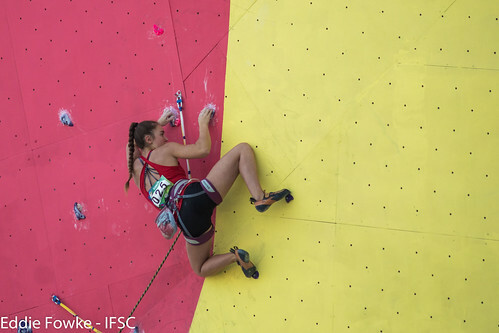 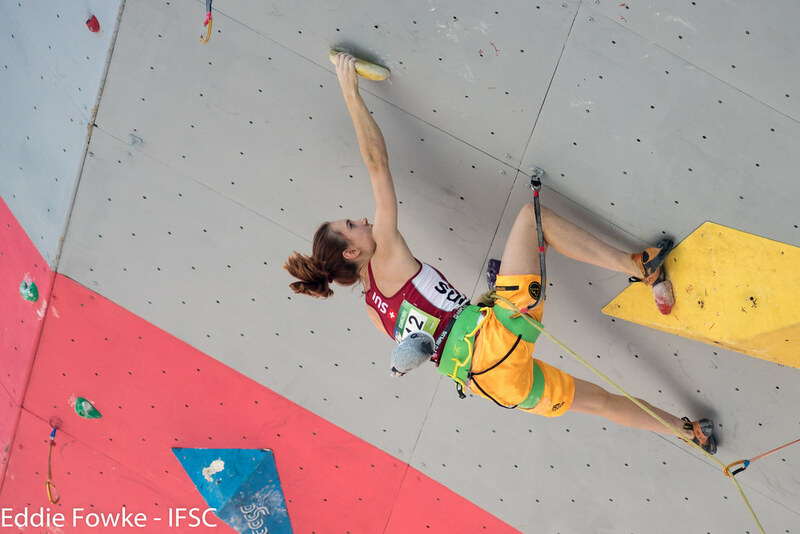 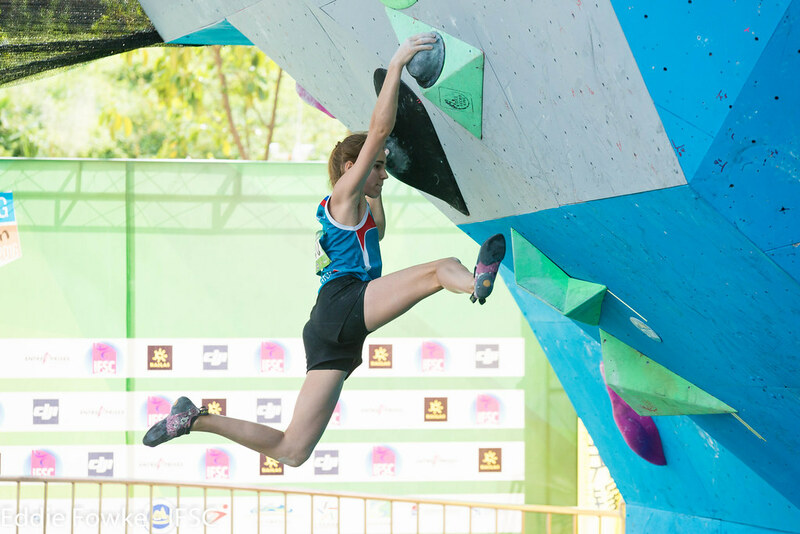 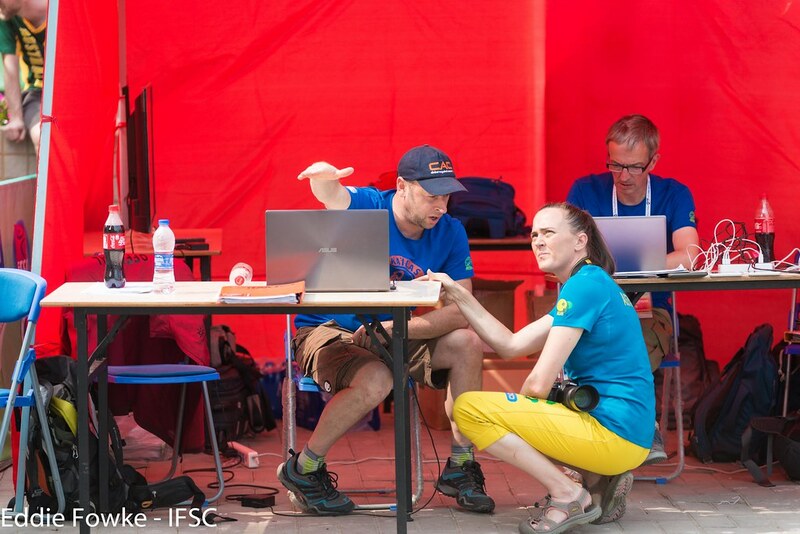 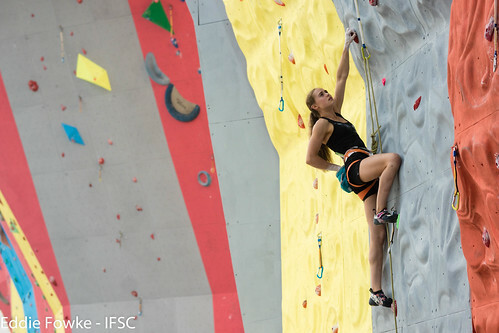 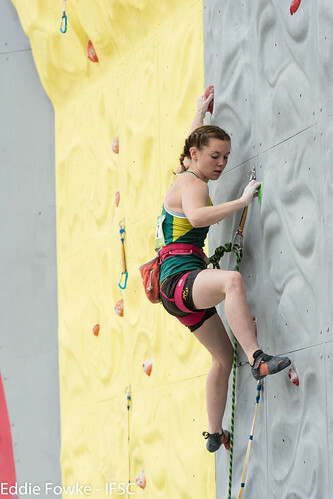 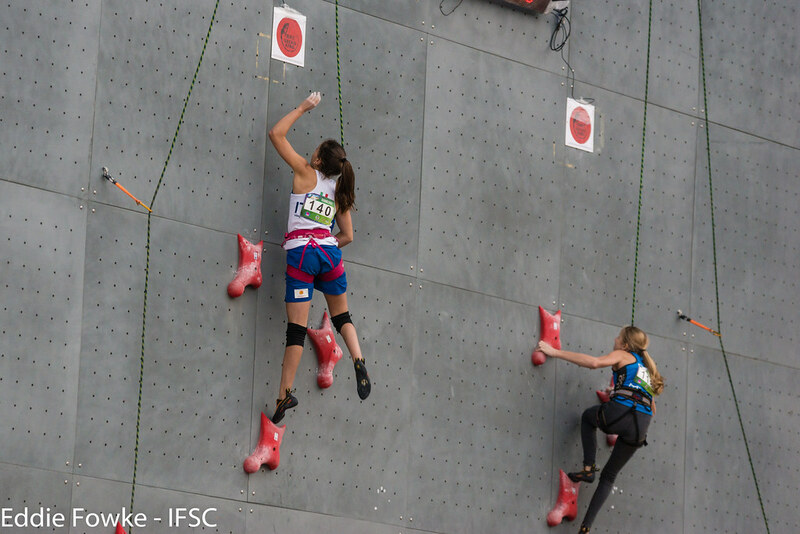 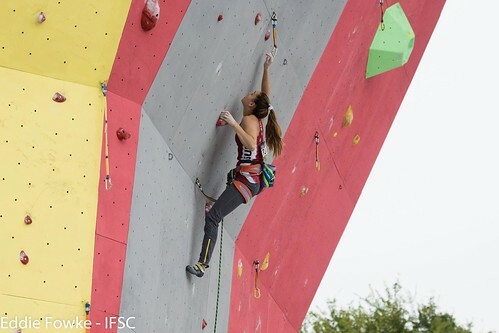 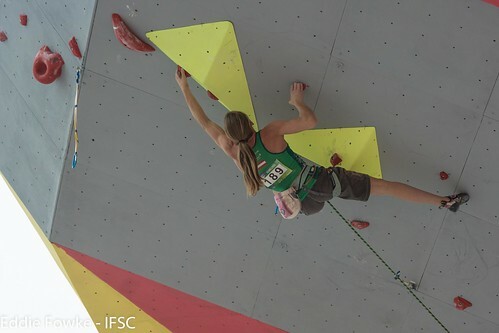 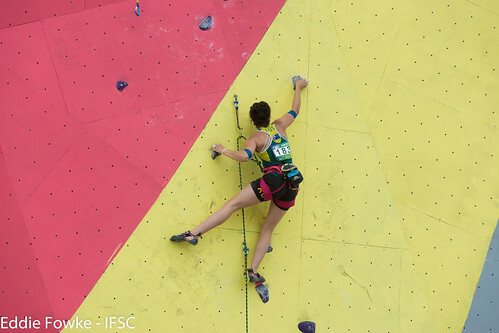 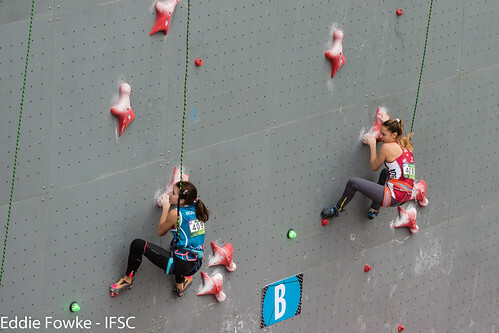 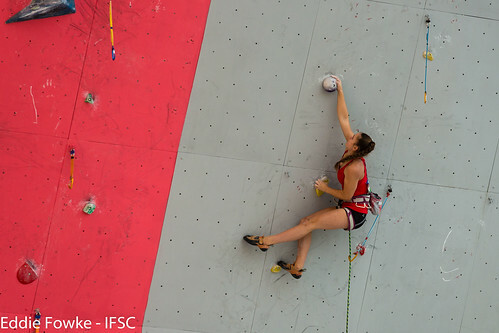 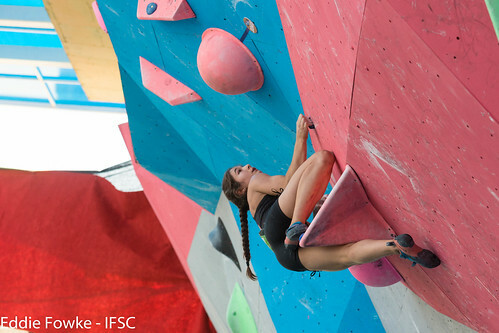 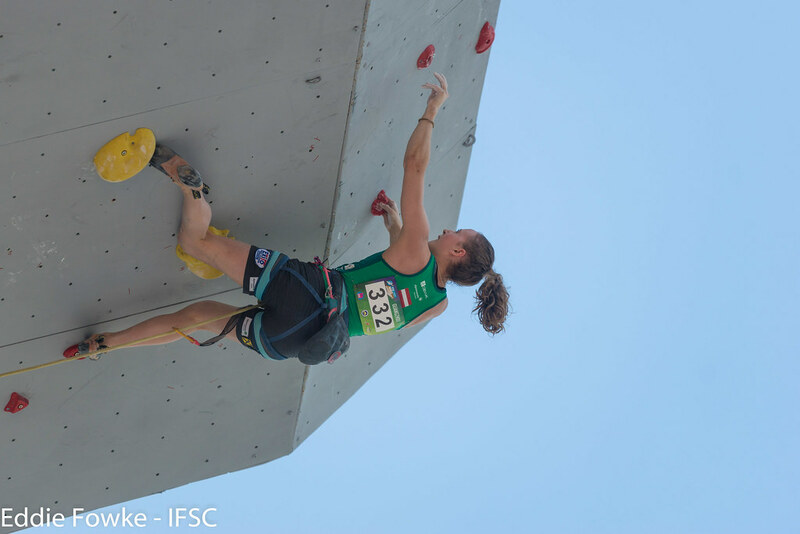 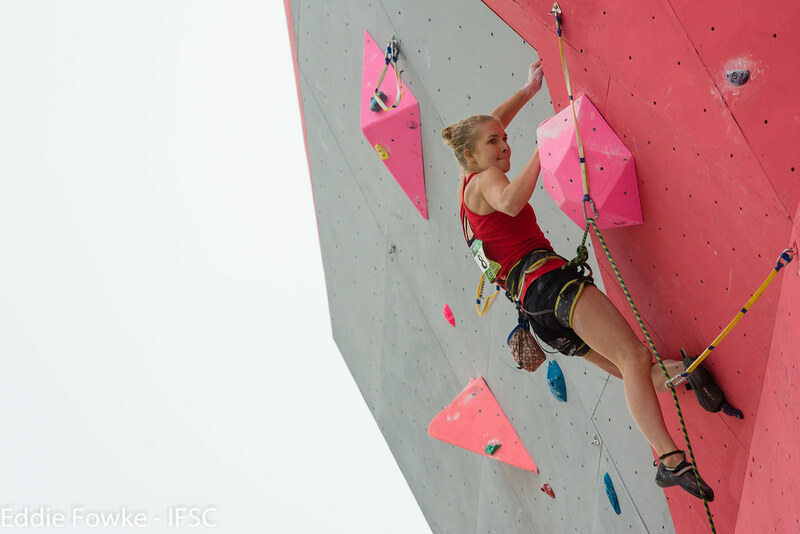 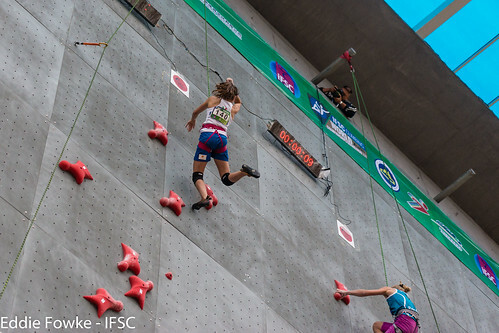 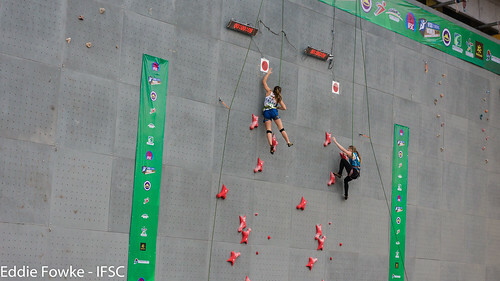 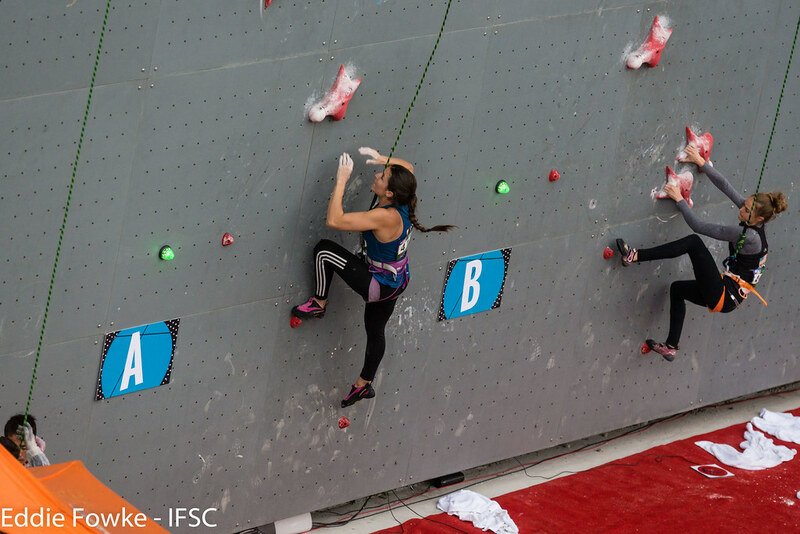 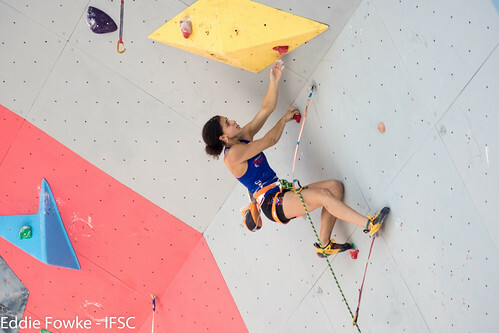 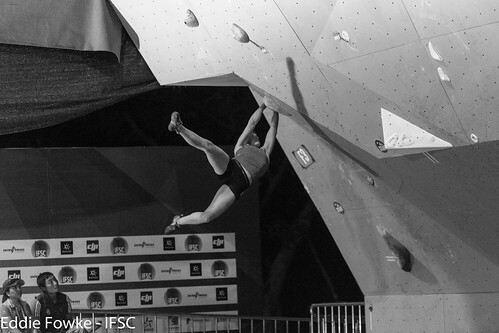 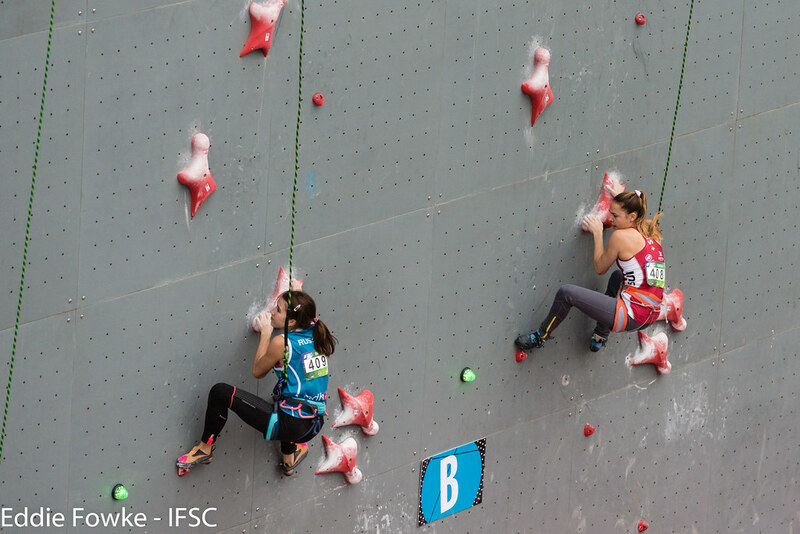 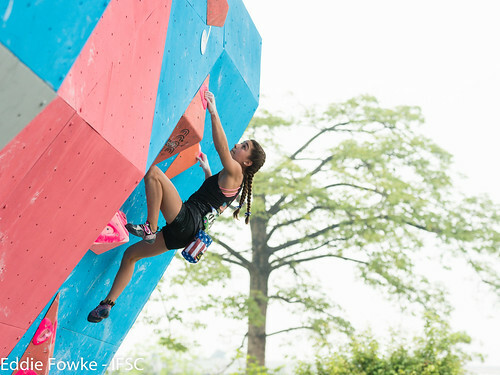 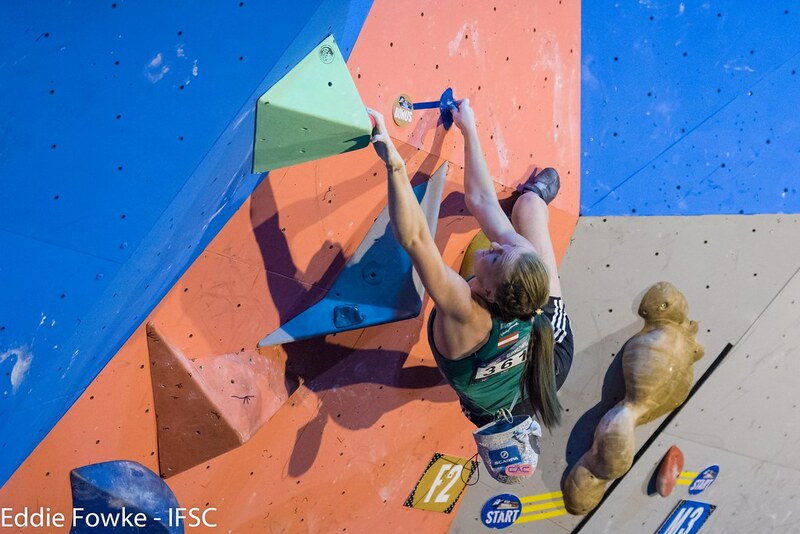 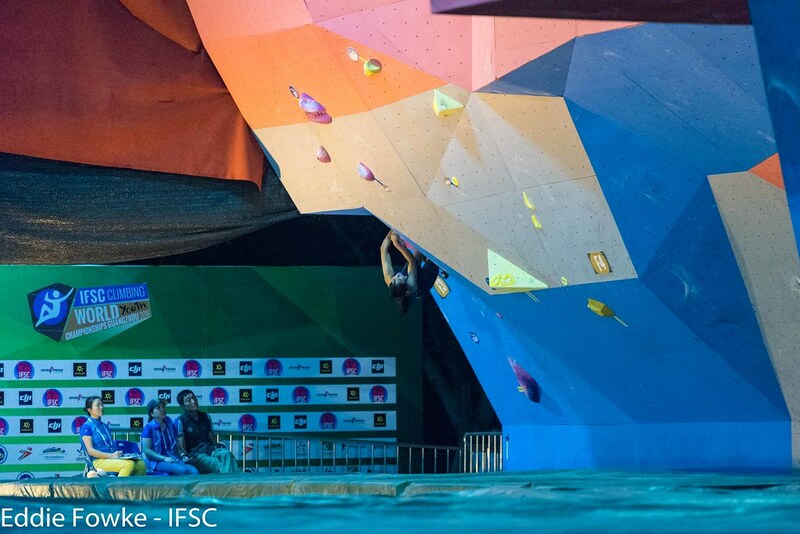 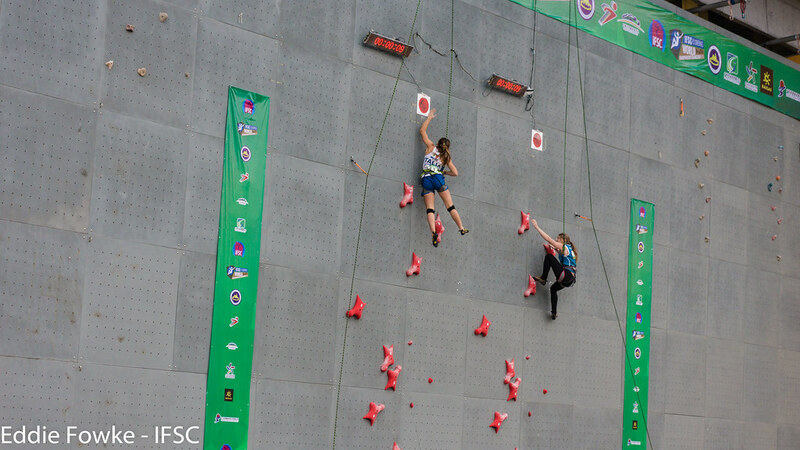 Tara Hayes of Great Britain required the fewest attempts to solve F1, and Austrian Franziska Sterrer won Bronze over IFSC Bouldering World Cup star Miho Nonaka of Japan. Two months after becoming Combined world champion, Elena Krasovskaia of Russia was crowned Combined world youth champion after qualifying for the Finals in all three disciplines. Garnbret also competed in Speed -­ the first time this season -­ and finished ahead of Russian Luiza Emeleva. 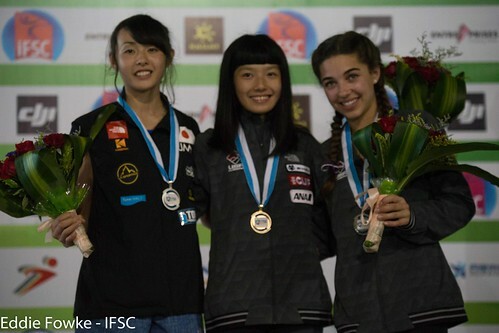 Raboutou claimed the title in Youth B, followed by Austrian Celina Schoibl and Rogora. 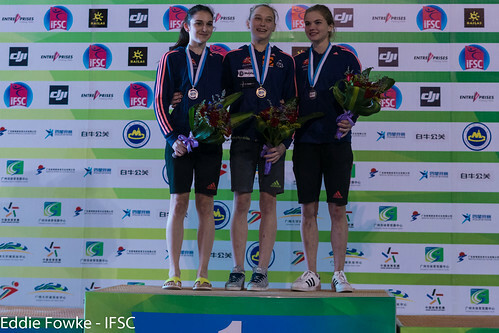 Finally, Hayes placed 15th in Speed to top her third podium! 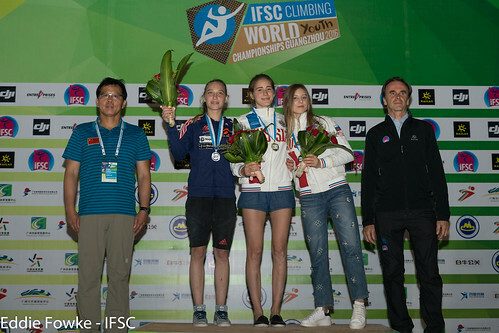 Andrea Kümin of Switzerland and Russian Iuliia Panteleeva joined her on the podium. 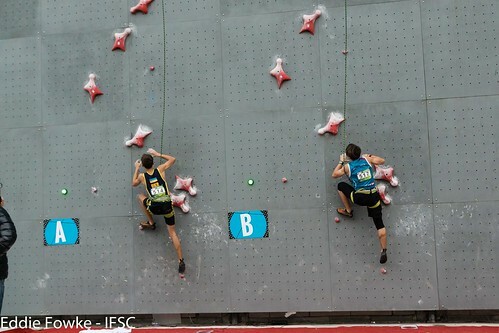 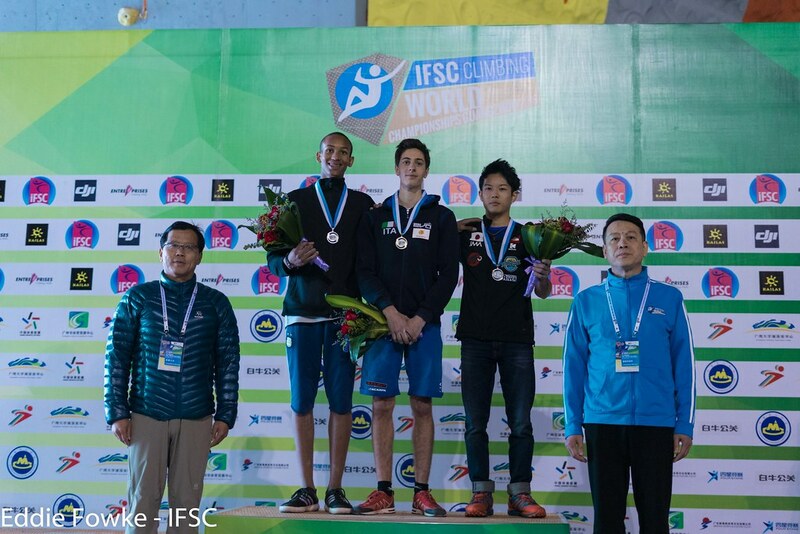 For the Males, Avezou also climbed in all three Finals for the unanimous Combined victory. 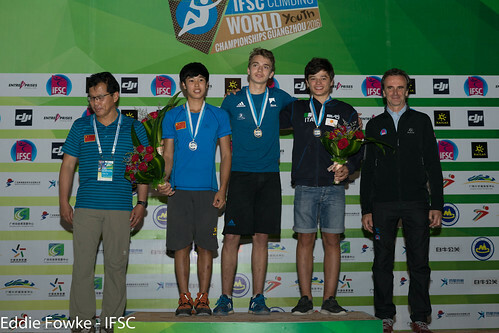 Colombo and Martin rounded out the Youth B podium. 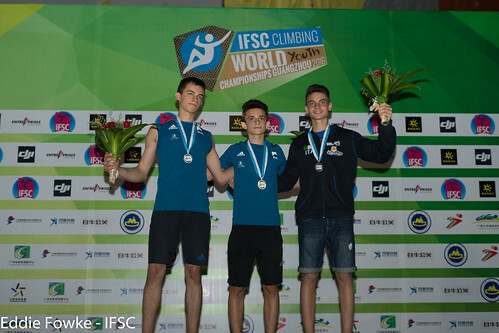 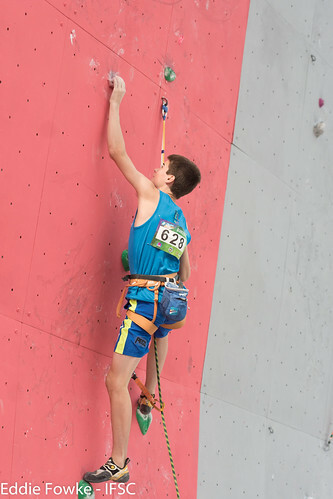 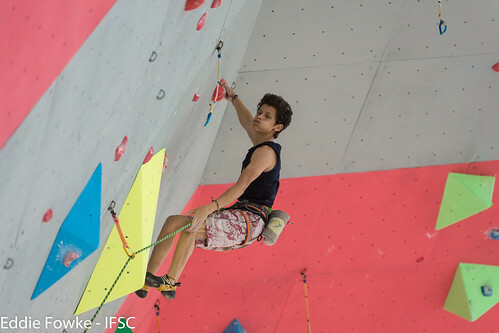 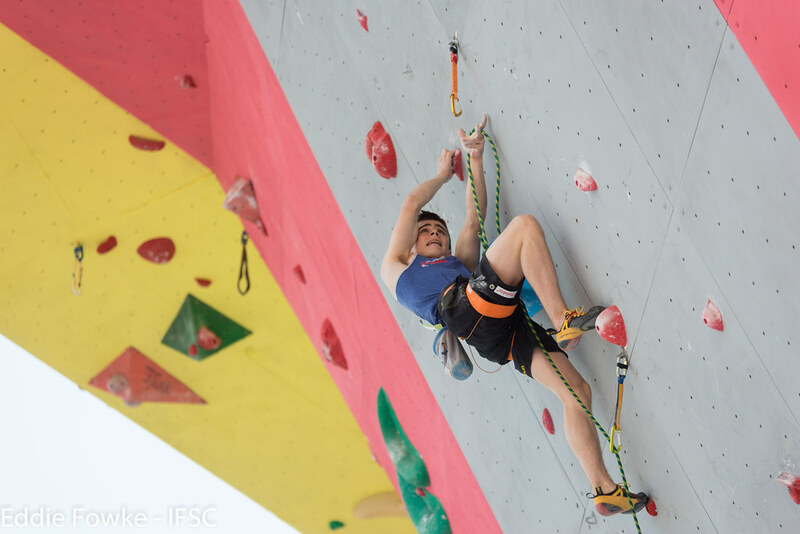 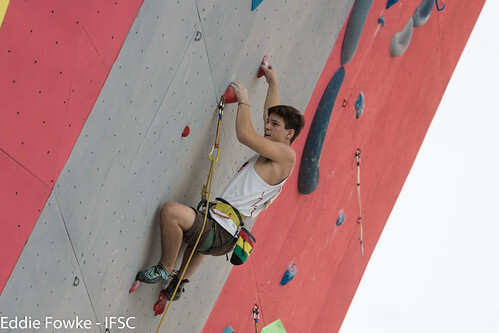 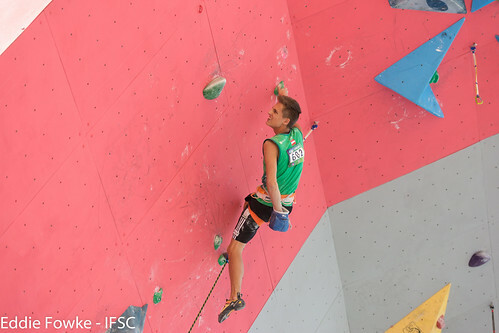 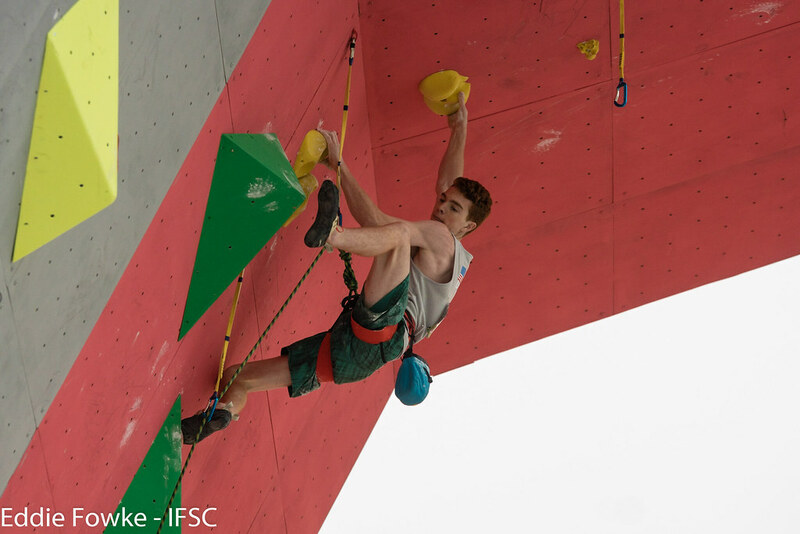 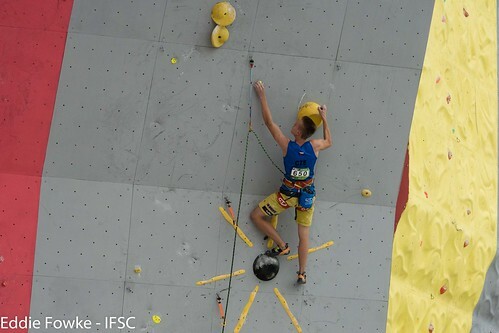 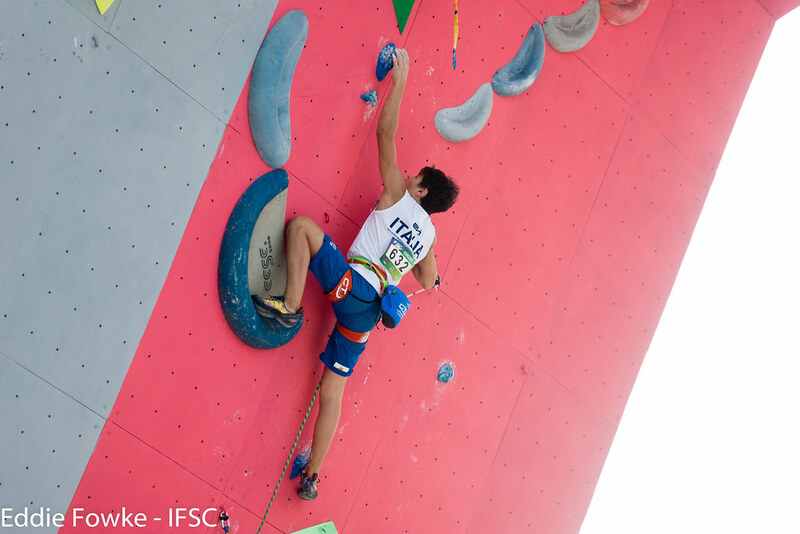 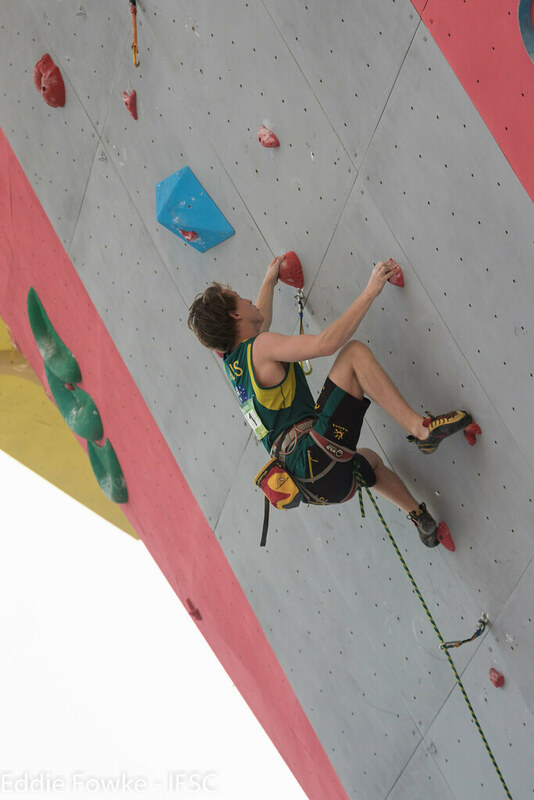 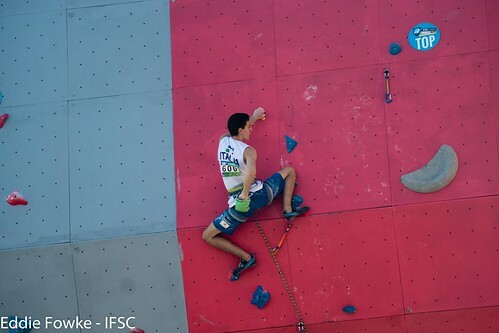 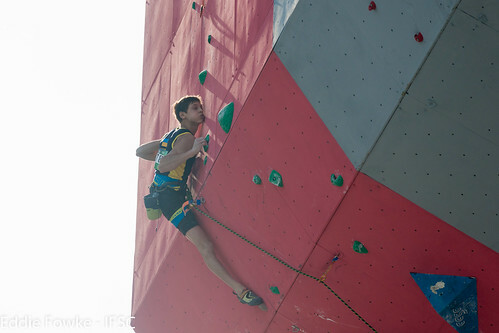 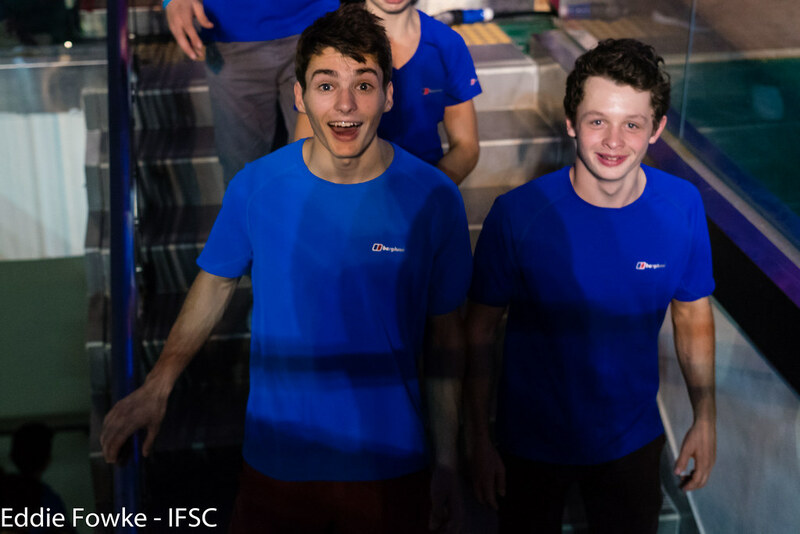 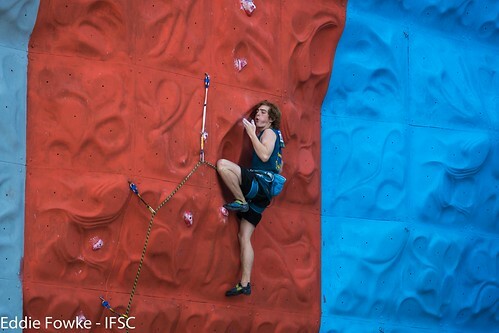 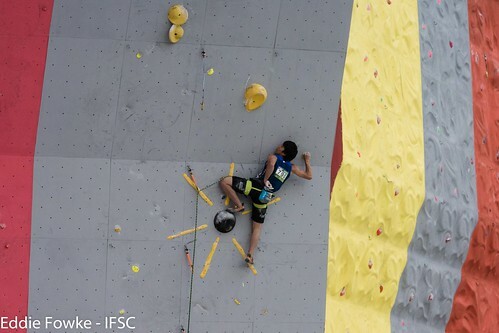 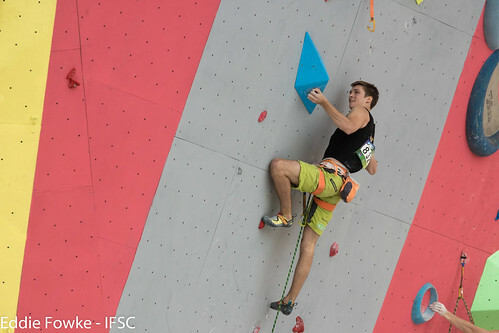 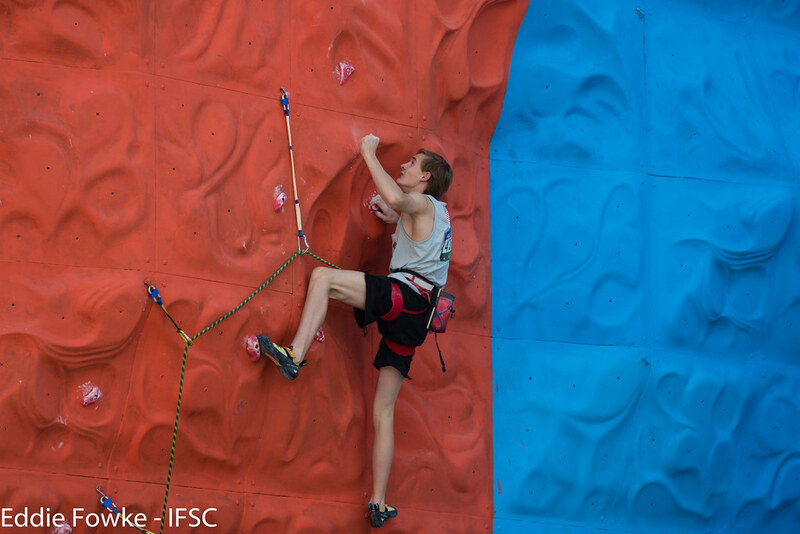 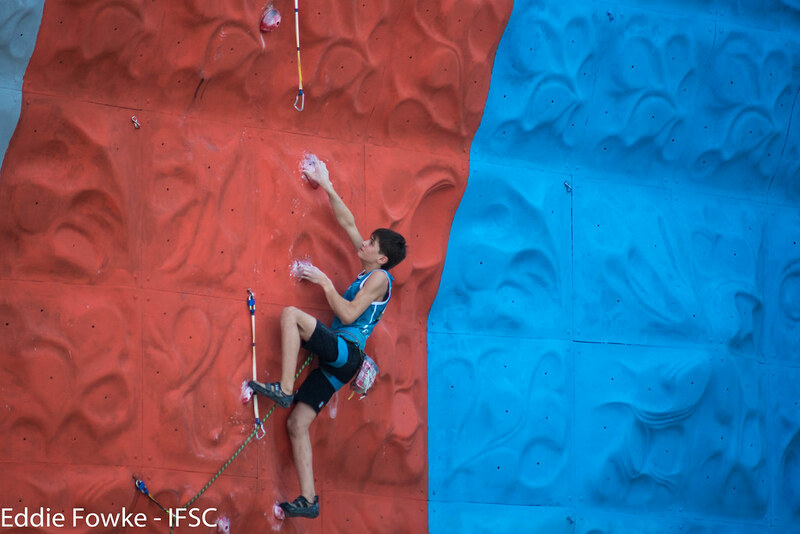 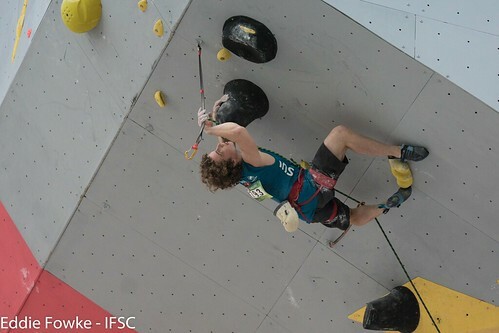 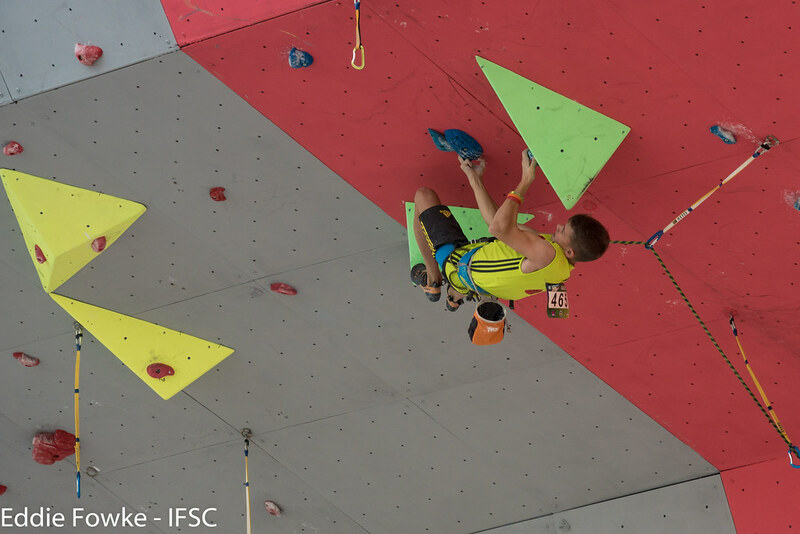 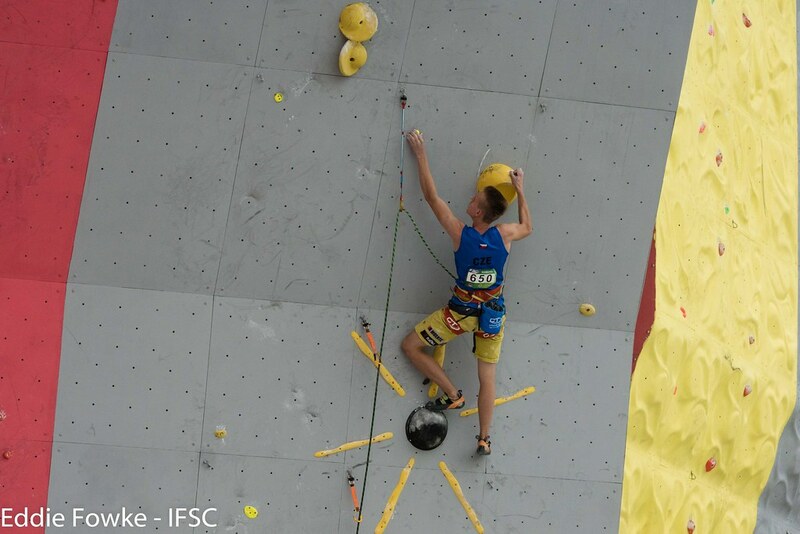 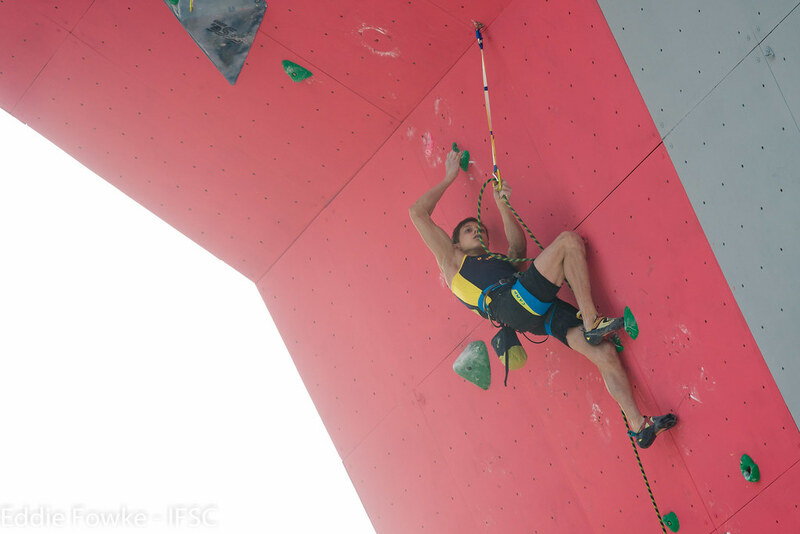 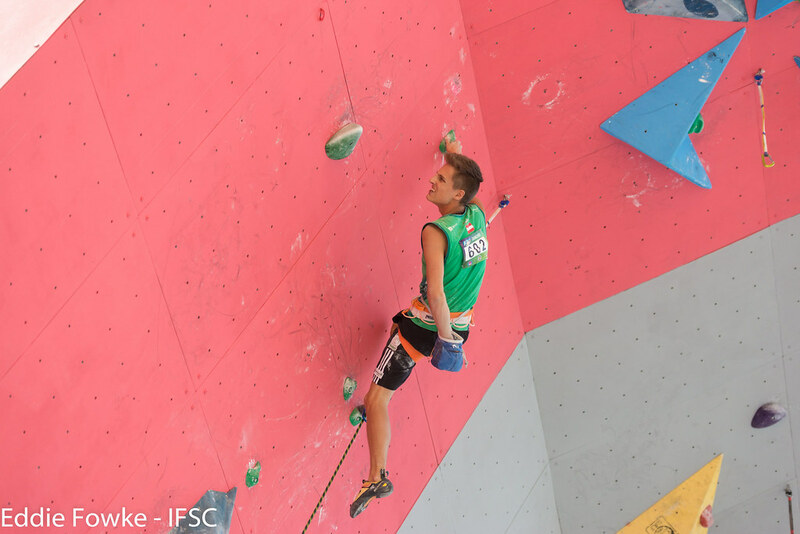 Arsène Duval of France and Italian Pietro Biagini climbed in the Lead Finals of Youth A and placed first and third. 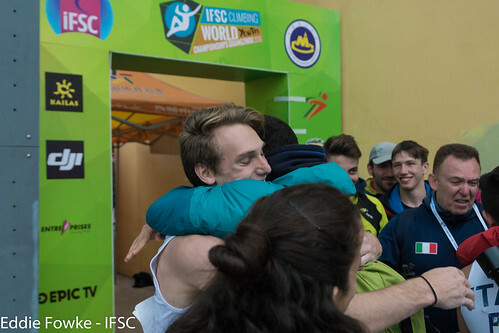 However, after recalculation, the bronze medal was assigned to Pietro’s teammate, Filip Schenk, with the same points but better discipline 2nd result. Finishing second was Pan Yufei of China, who received warm applause from his home crowd. Although Lehmann missed each Finals, his steady performance earned him the Combined win. 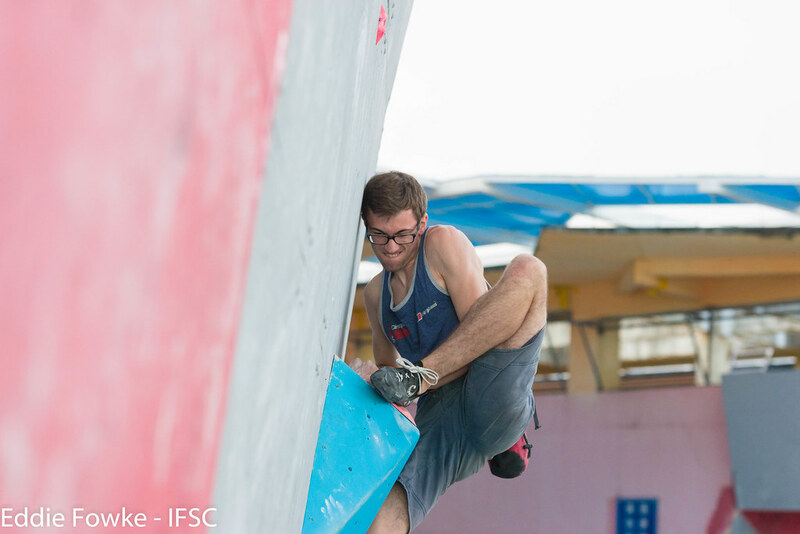 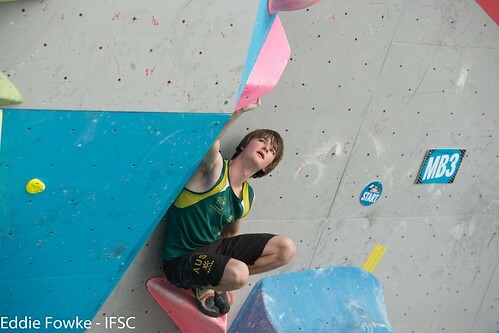 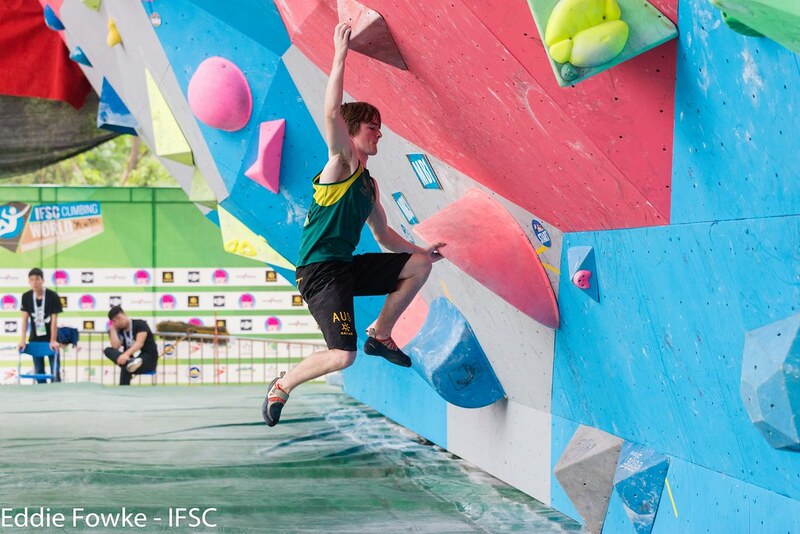 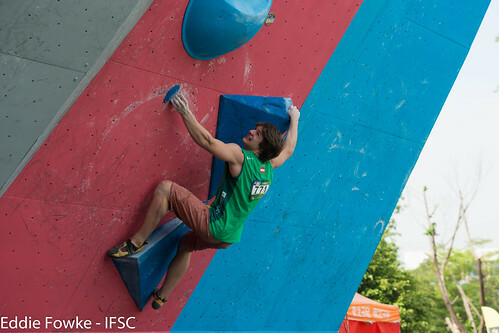 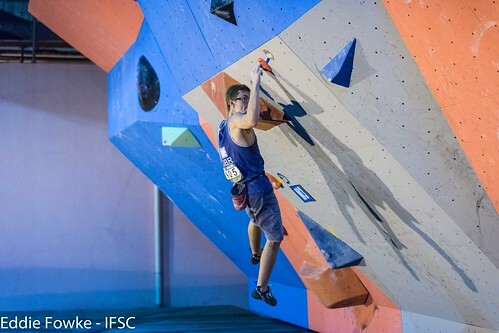 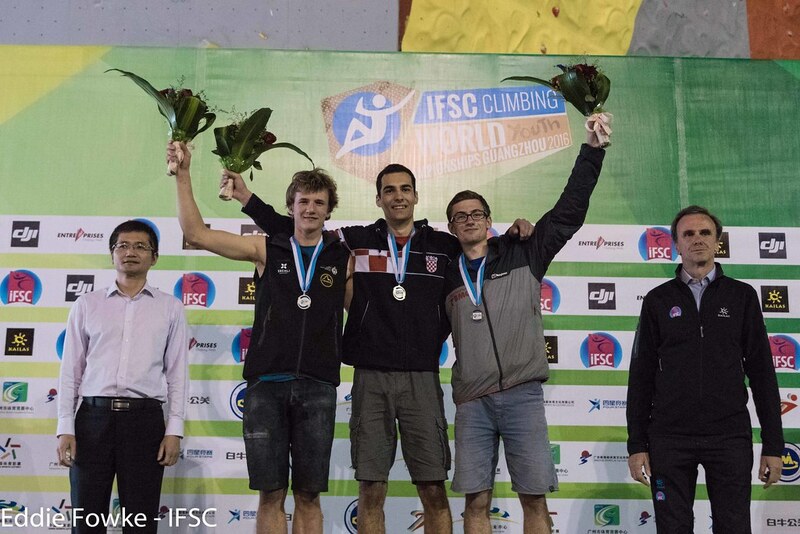 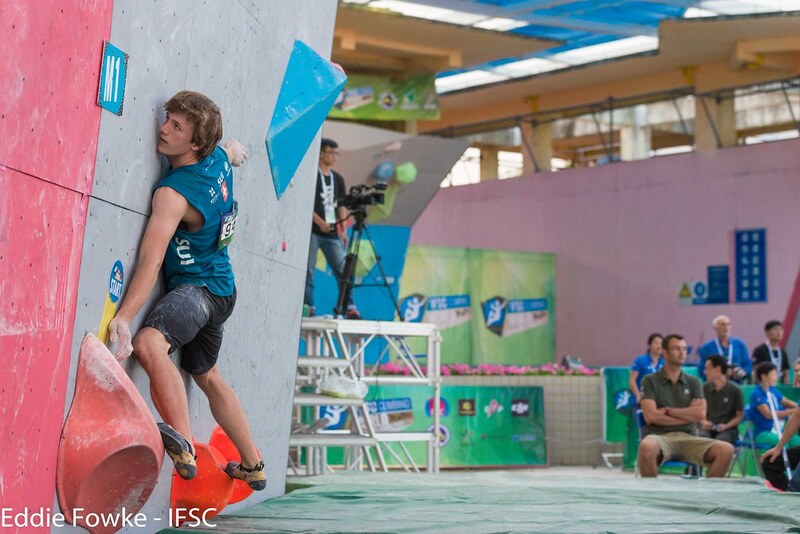 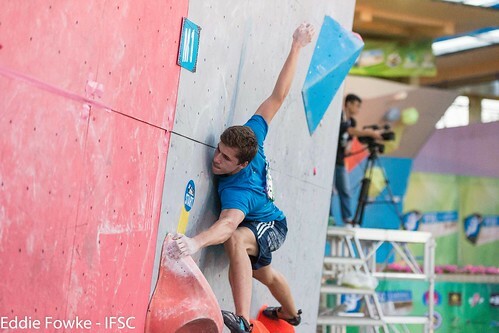 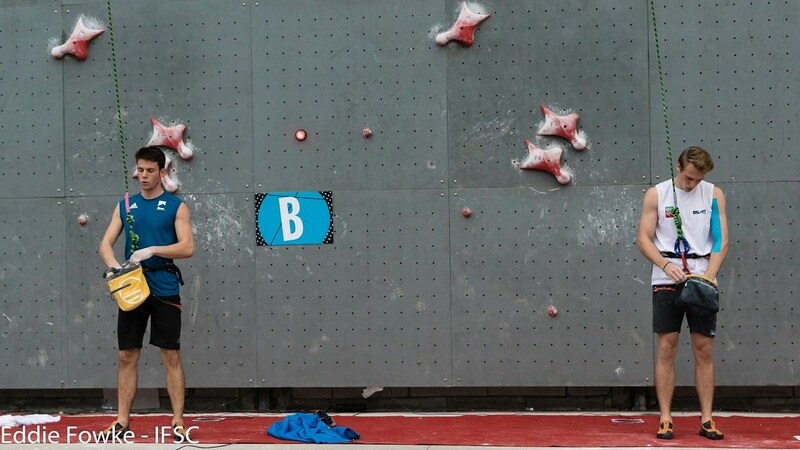 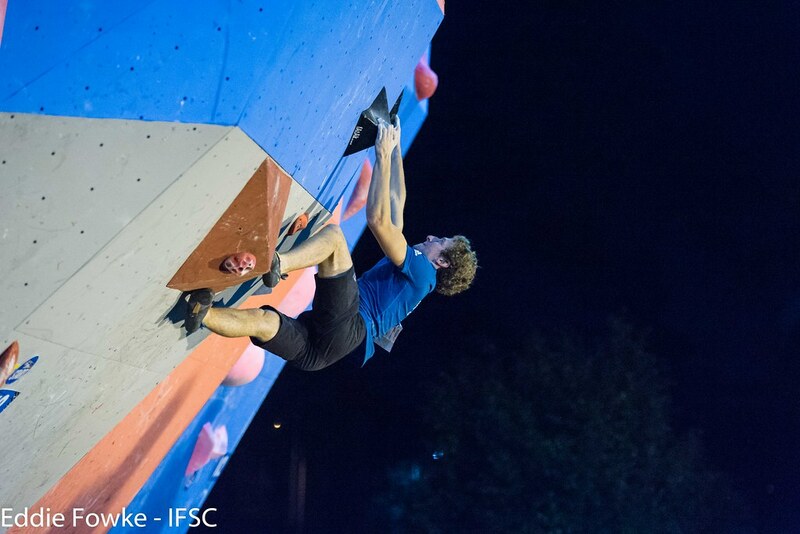 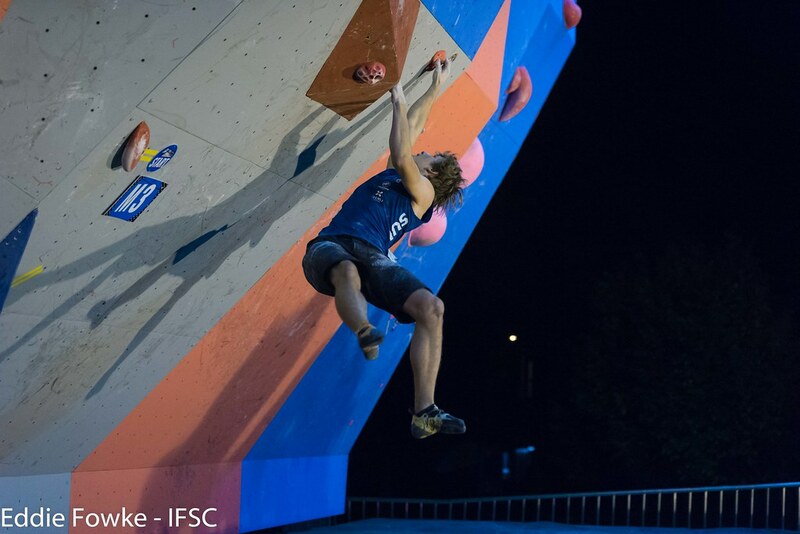 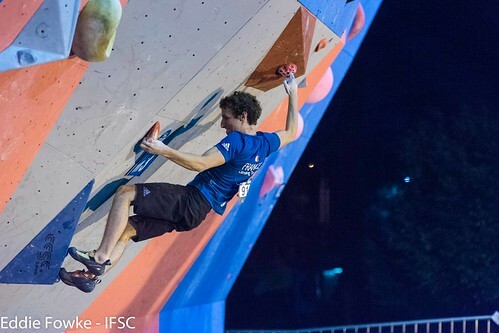 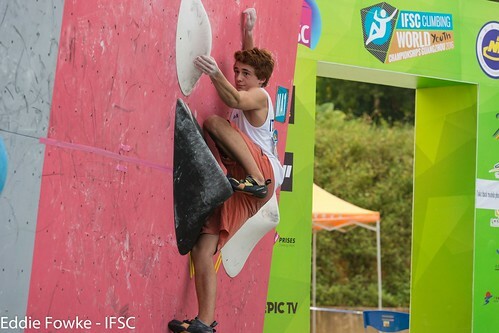 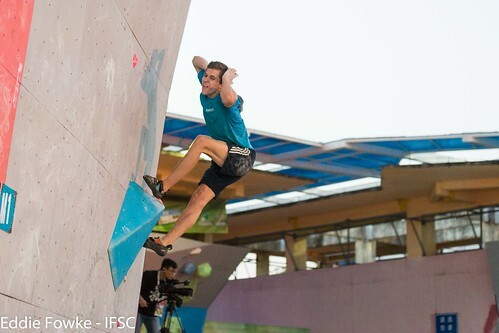 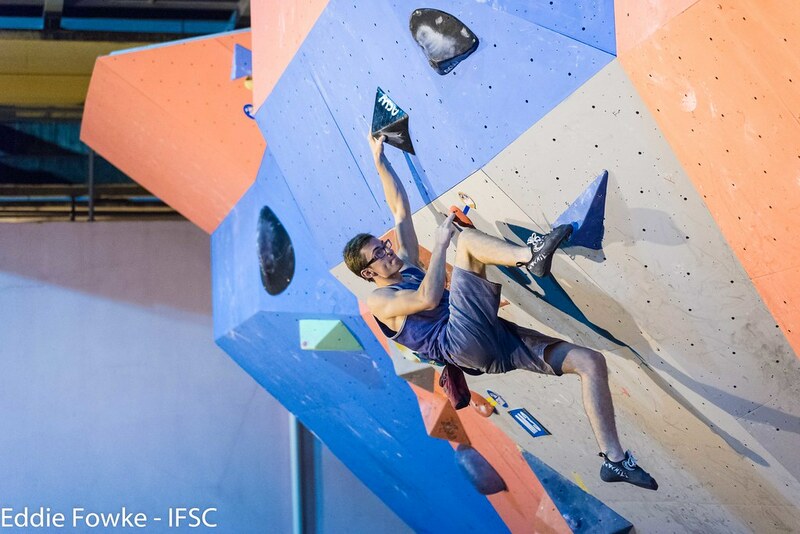 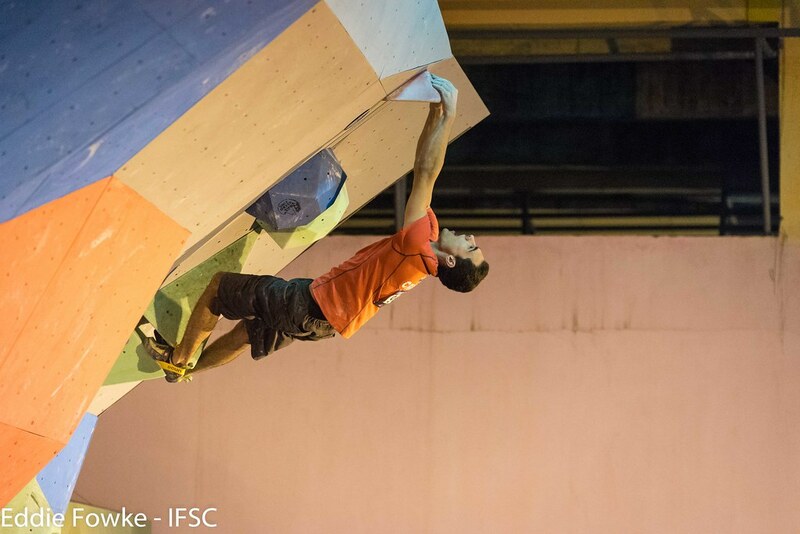 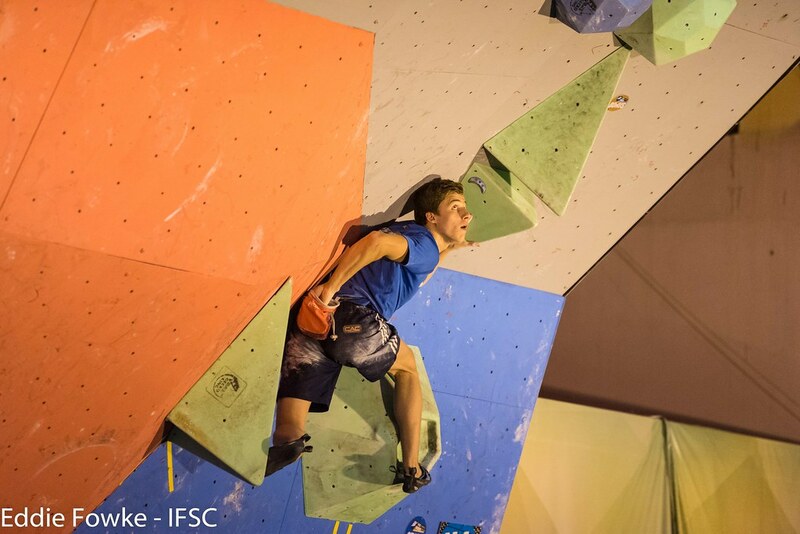 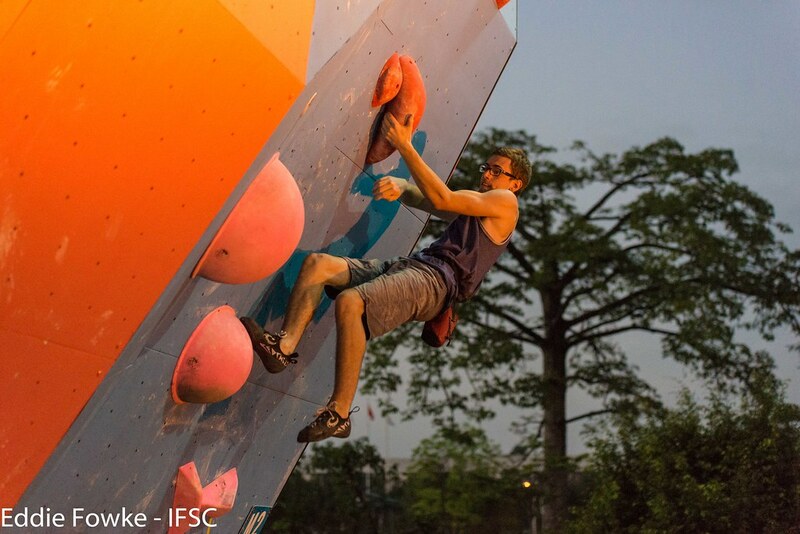 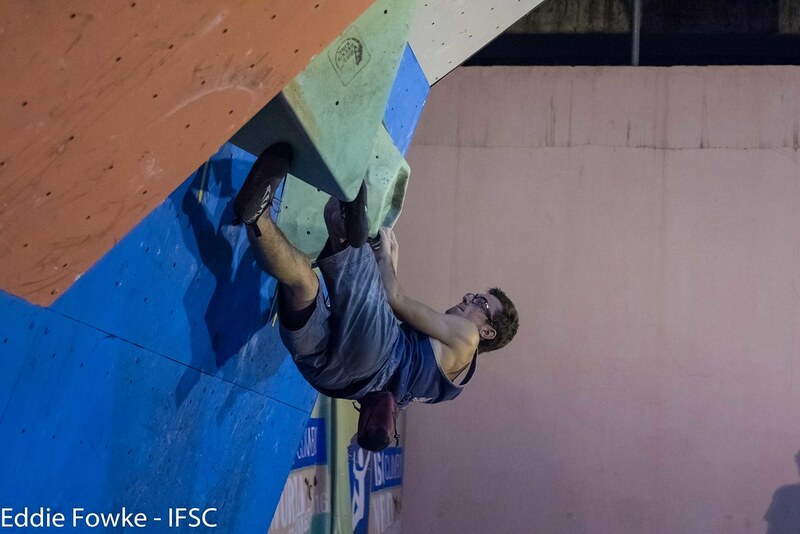 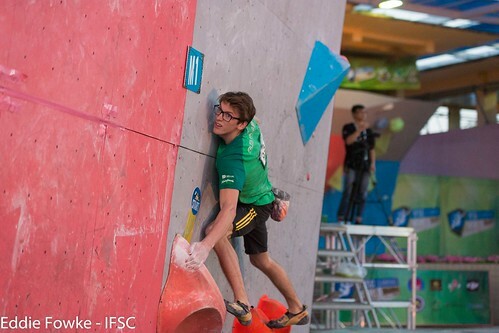 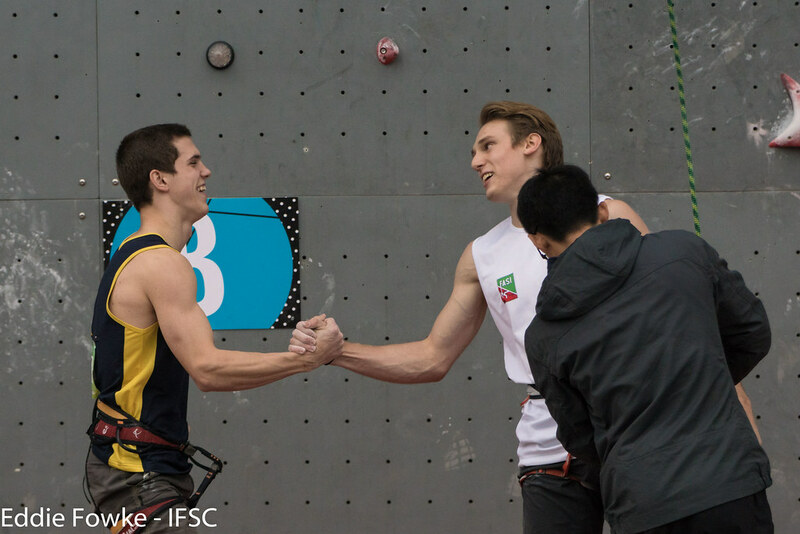 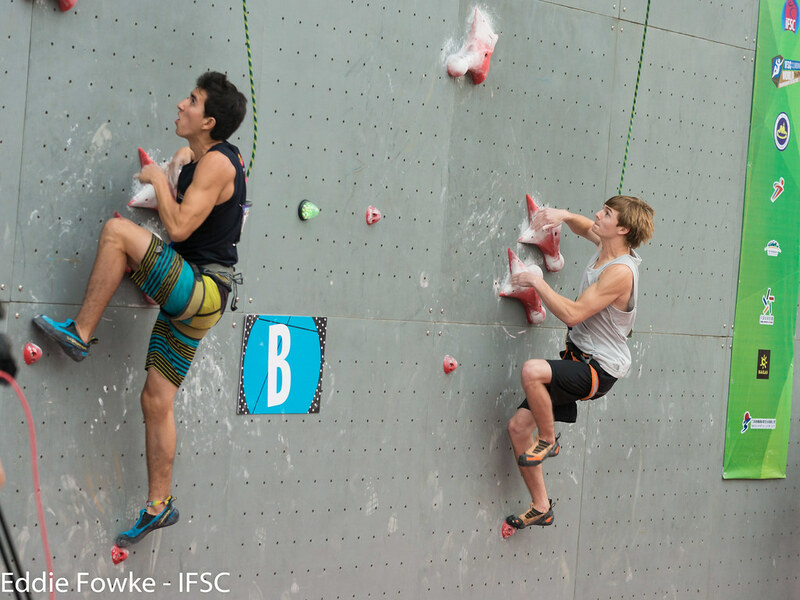 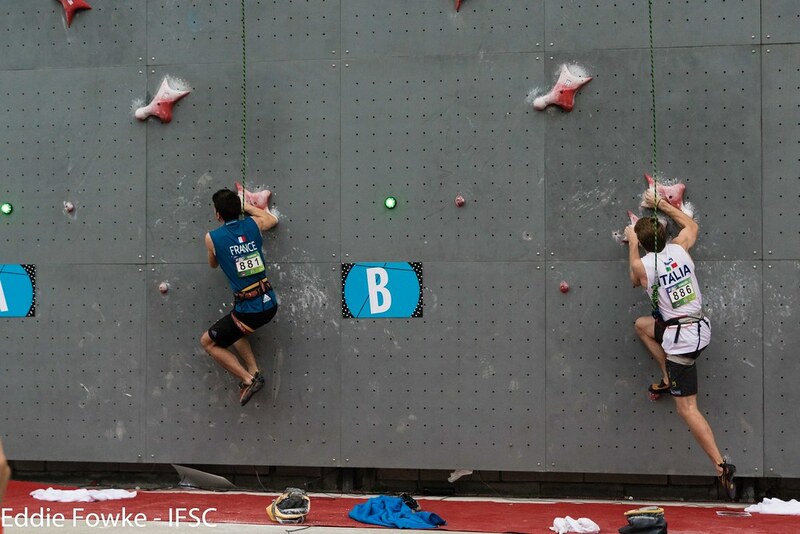 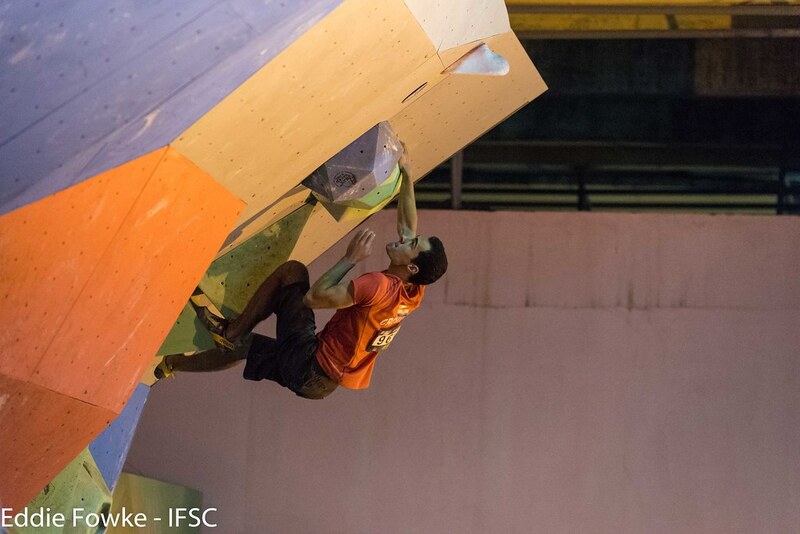 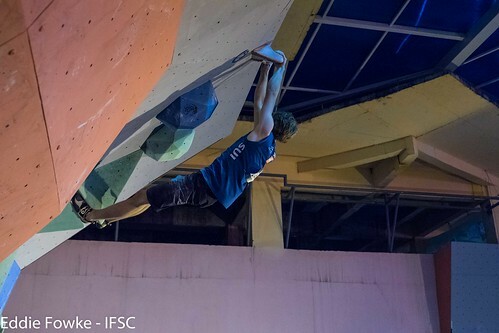 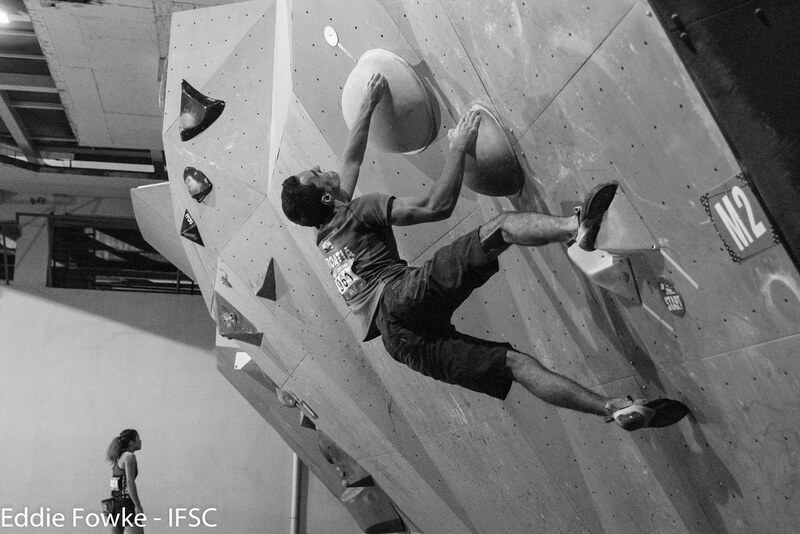 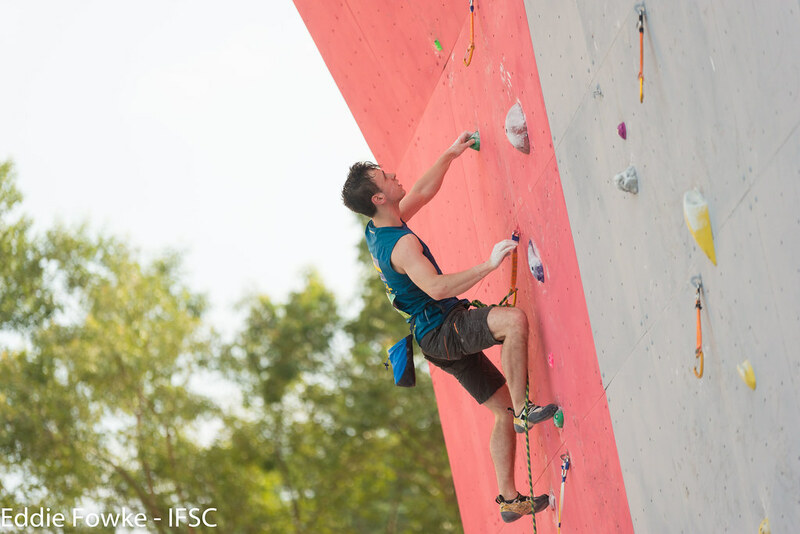 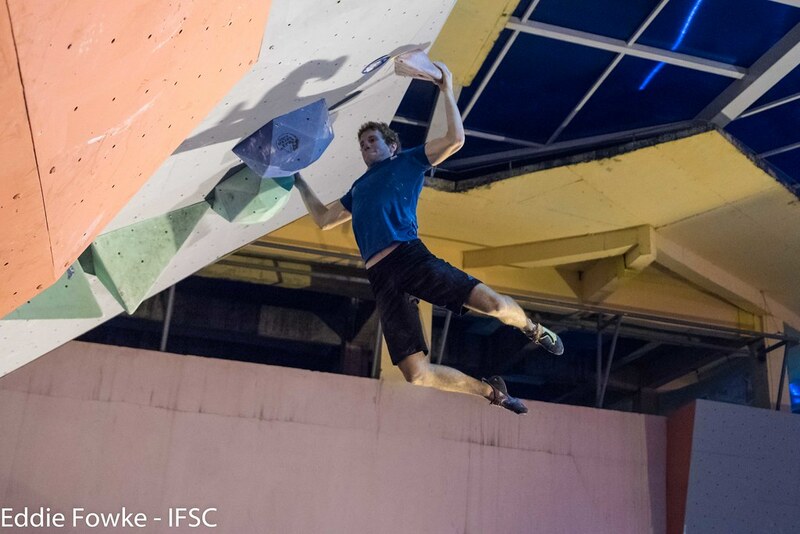 British Bouldering finalist William Bosi finished in second and German Ruben Firnenburg placed third. 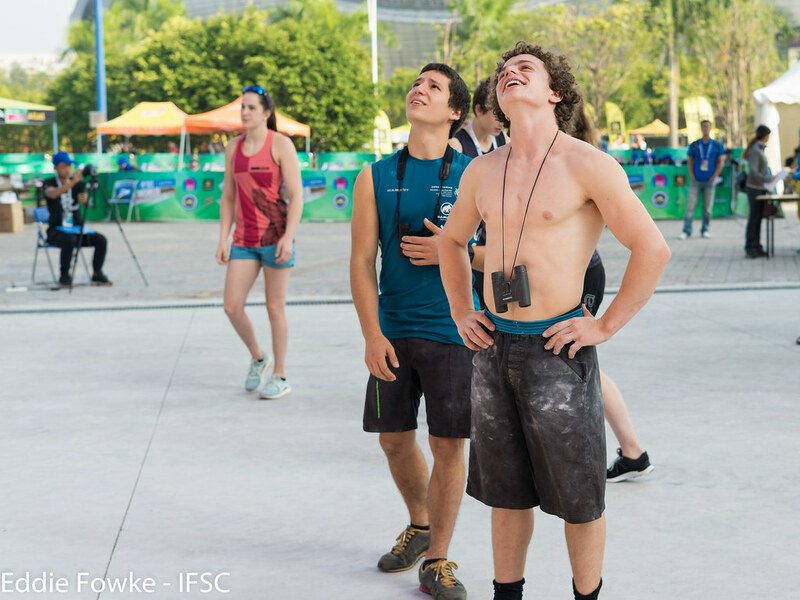 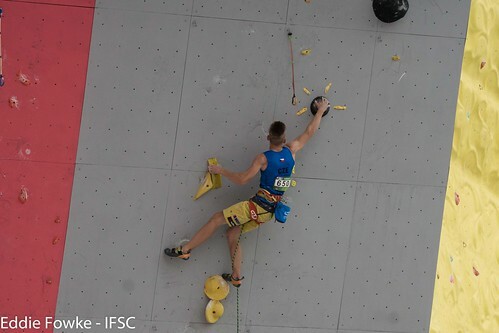 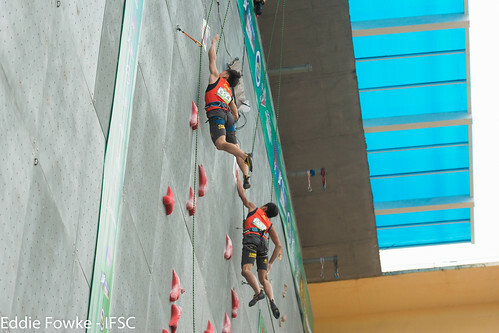 The IFSC apologize for the late delivery of the combined rankings and for the mistakes occurred. Some registered competitors did not actually participated and this generated the inaccurate calculations.